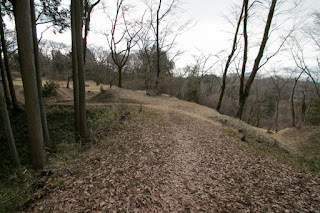 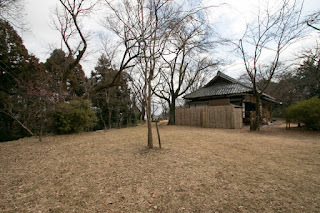 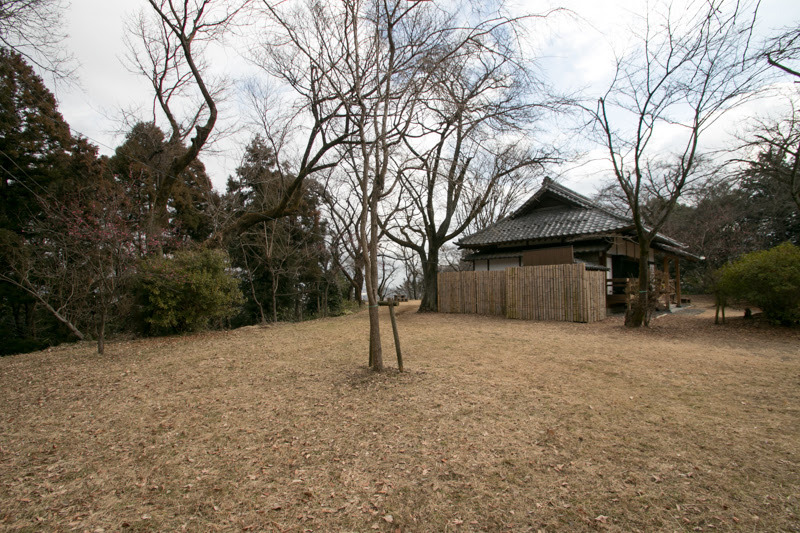 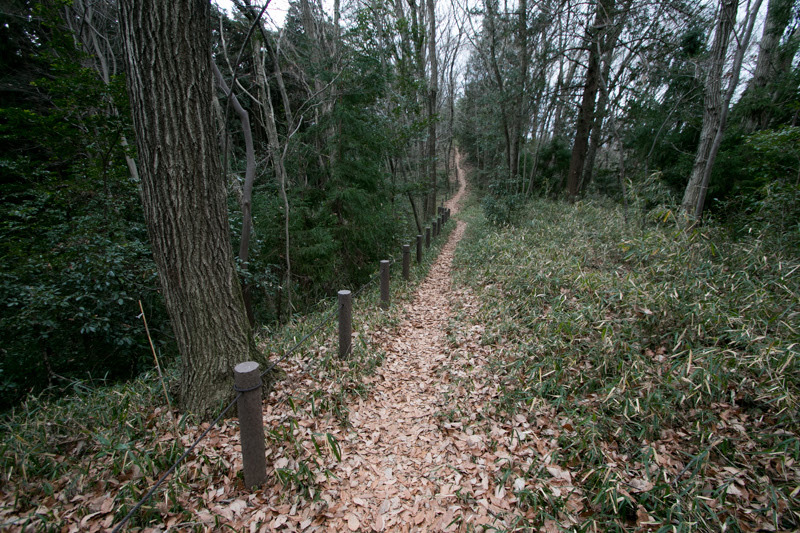 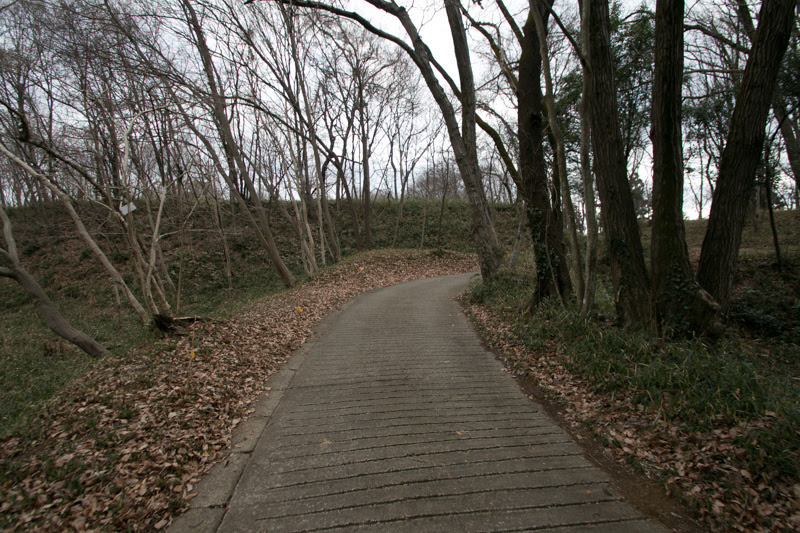 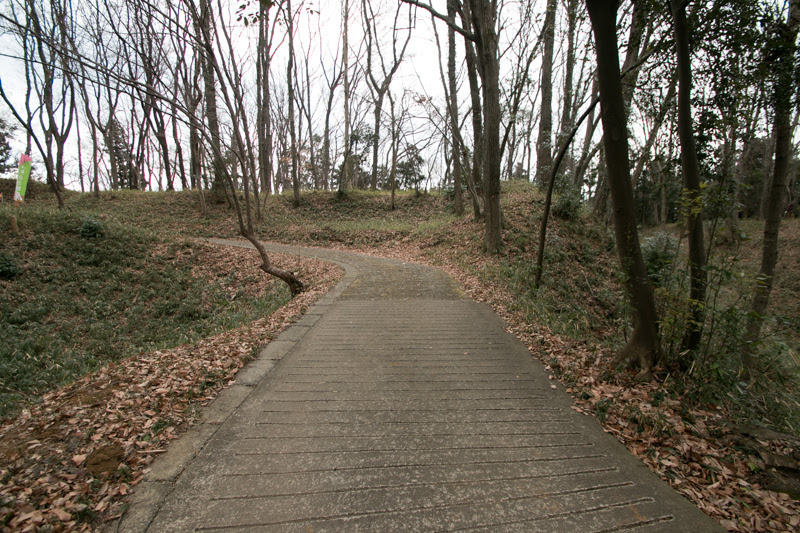 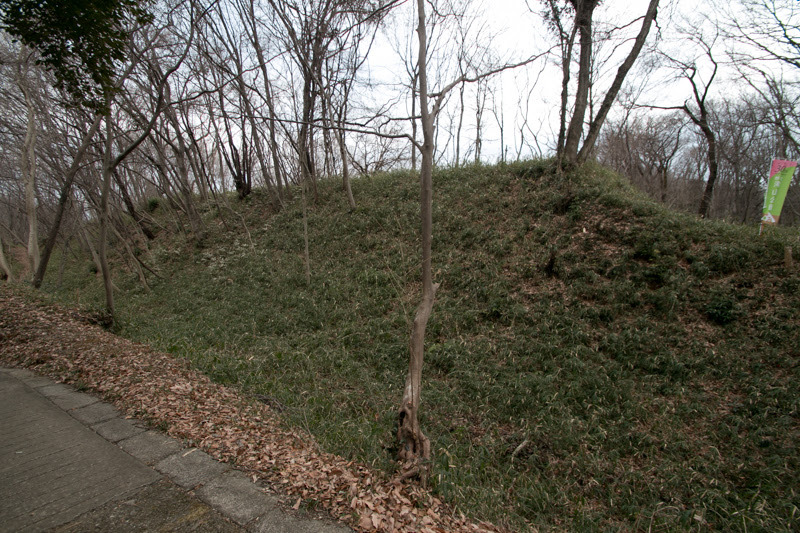 Takiyama castle (滝山城) is located in a long hill at the south of Tamagawa river. 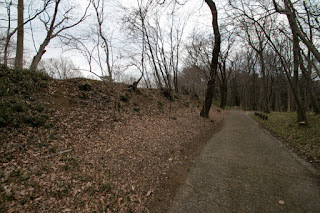 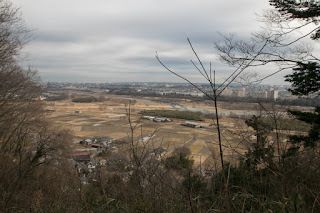 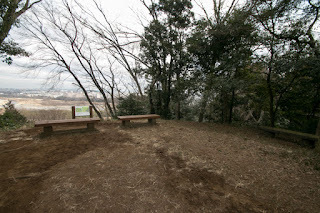 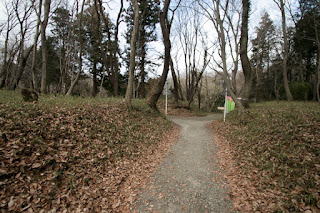 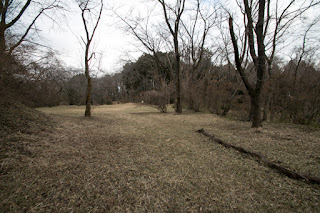 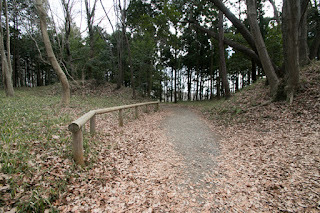 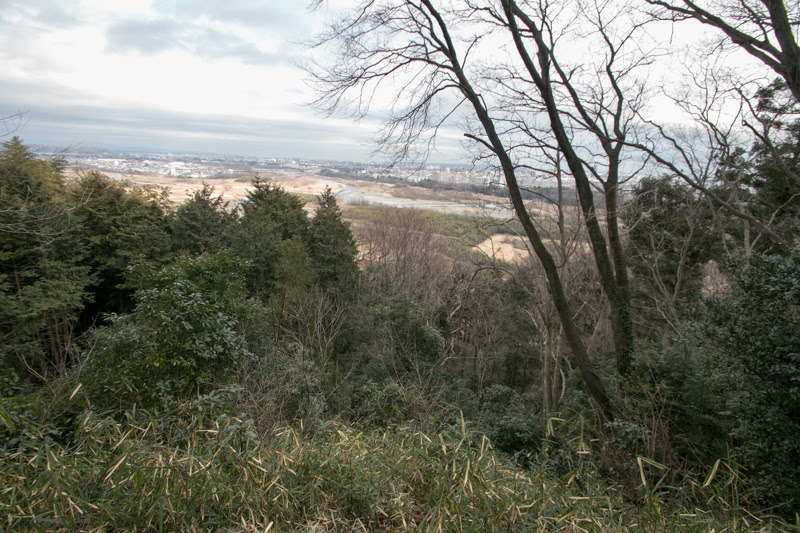 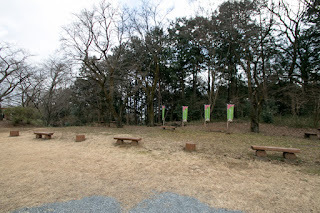 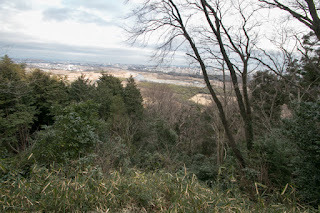 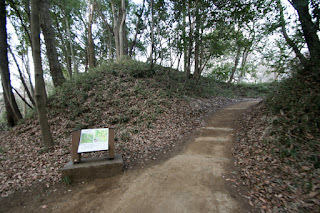 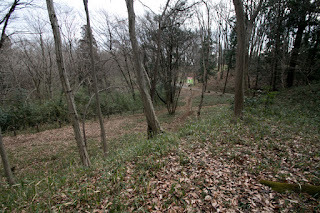 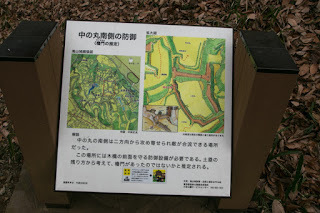 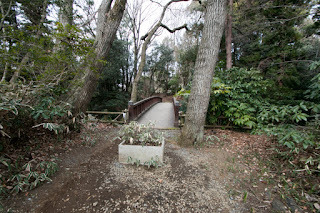 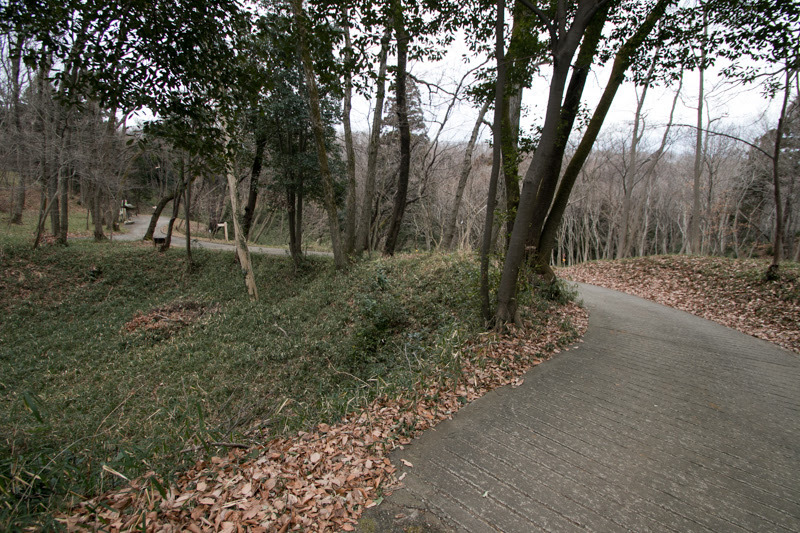 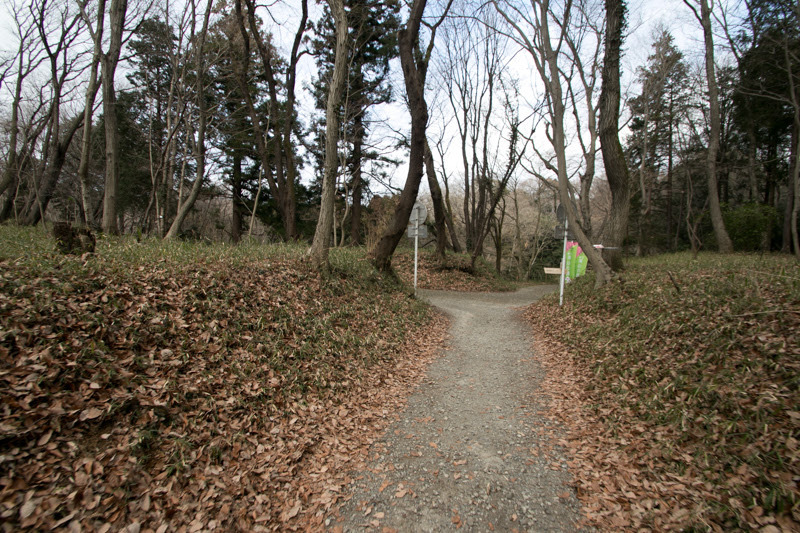 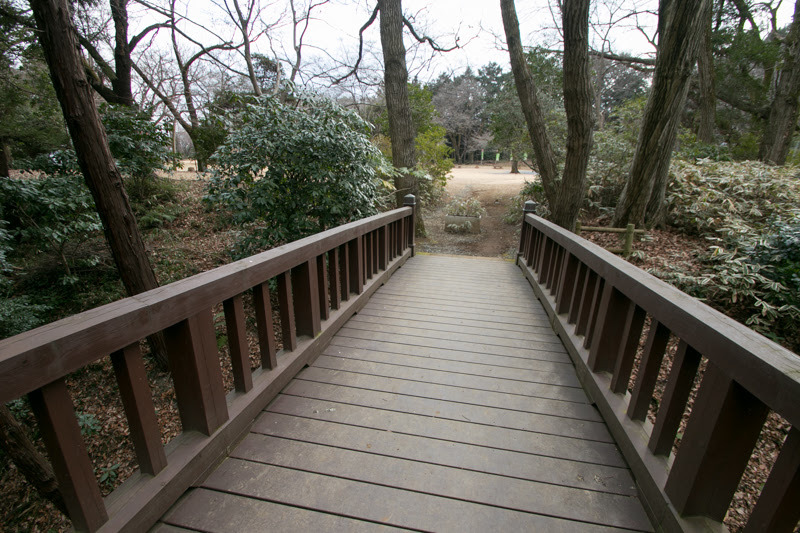 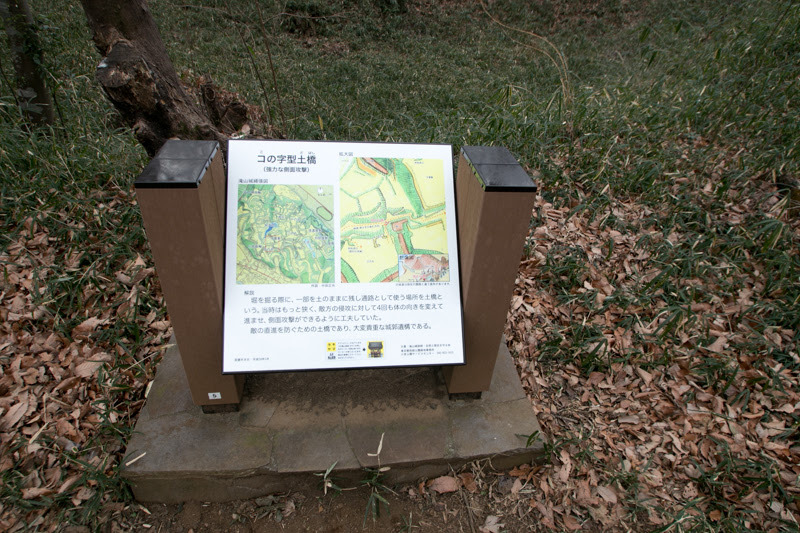 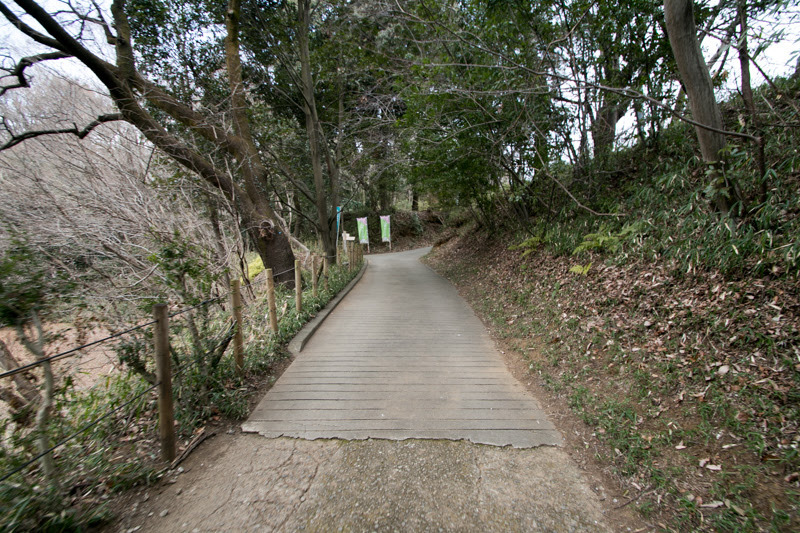 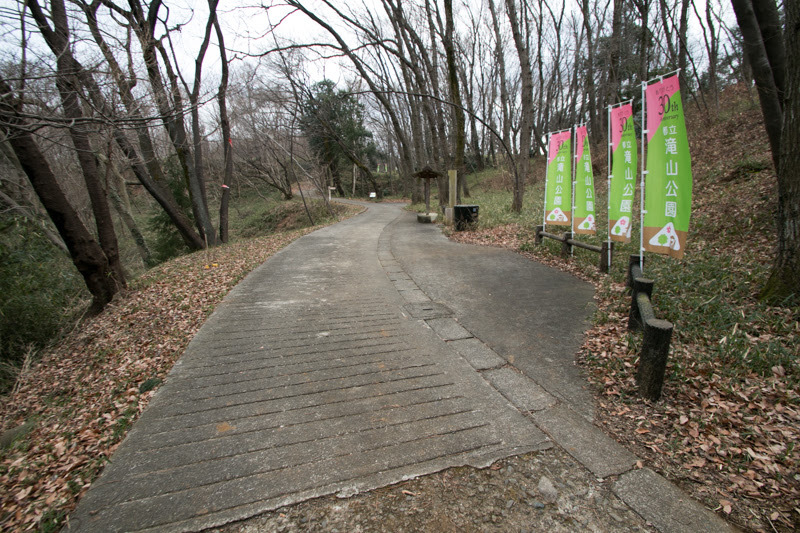 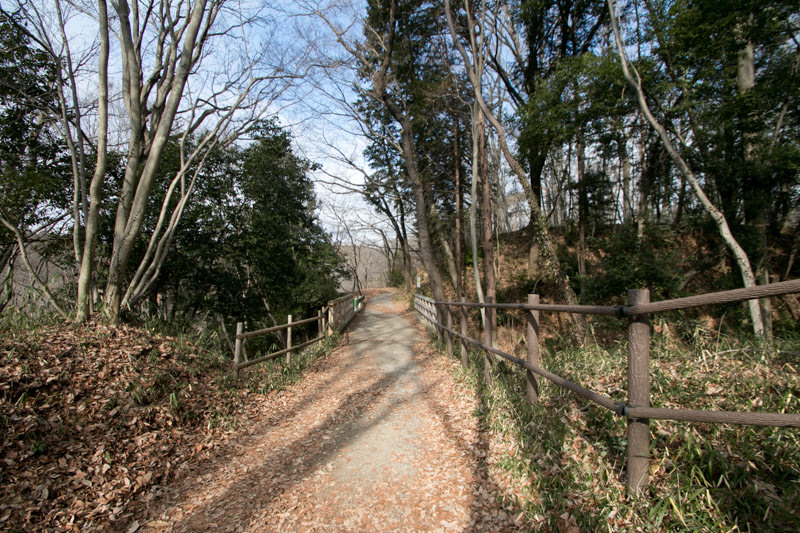 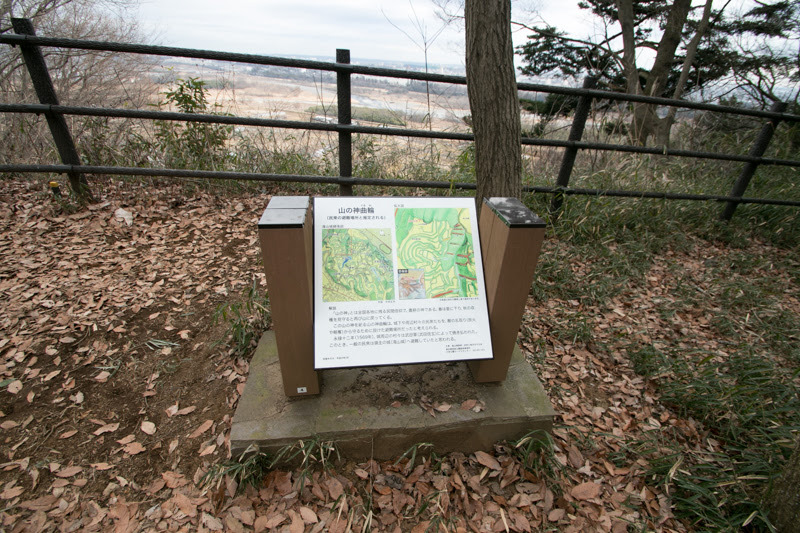 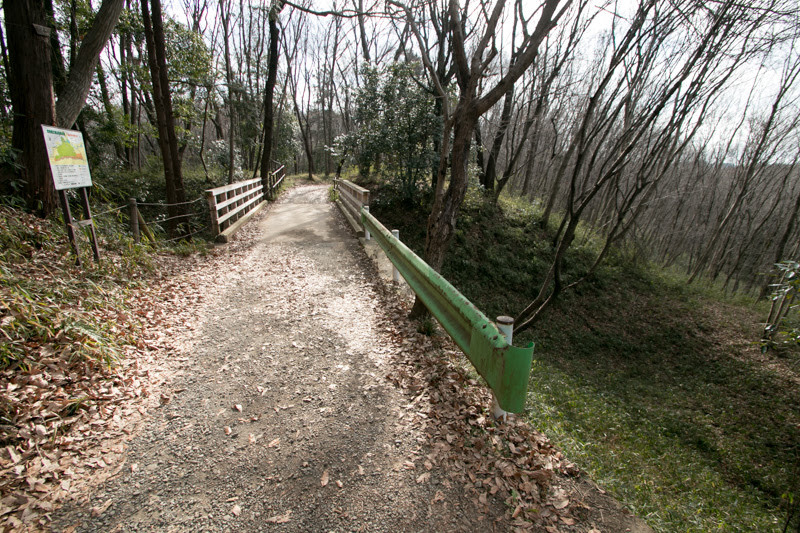 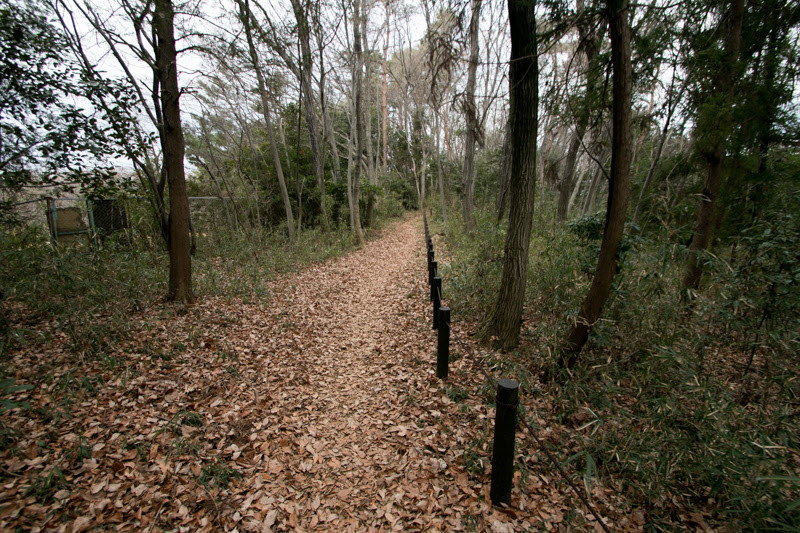 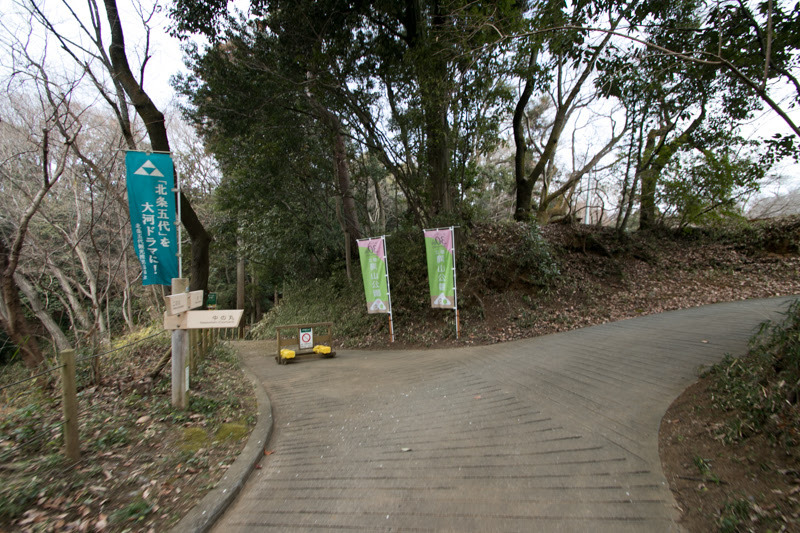 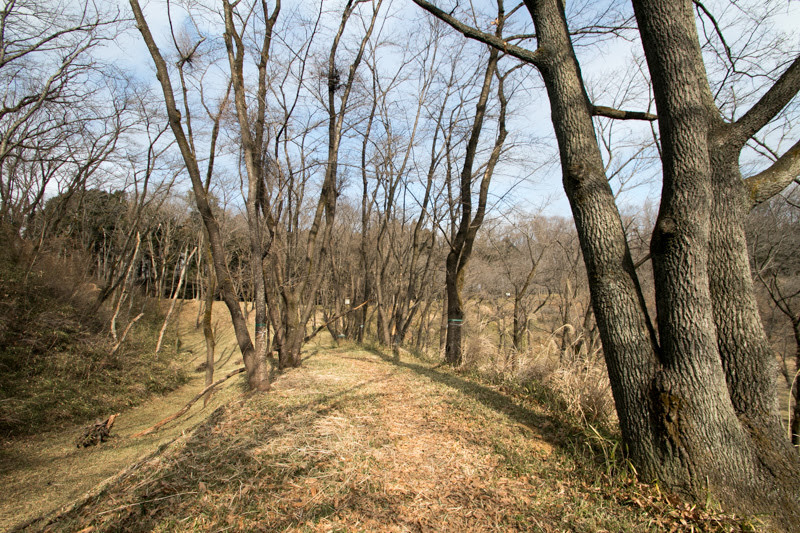 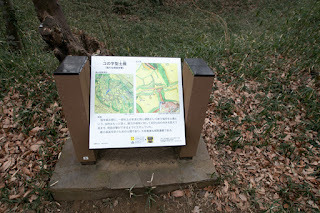 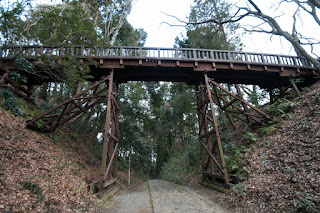 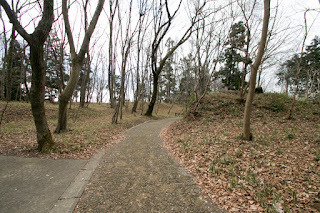 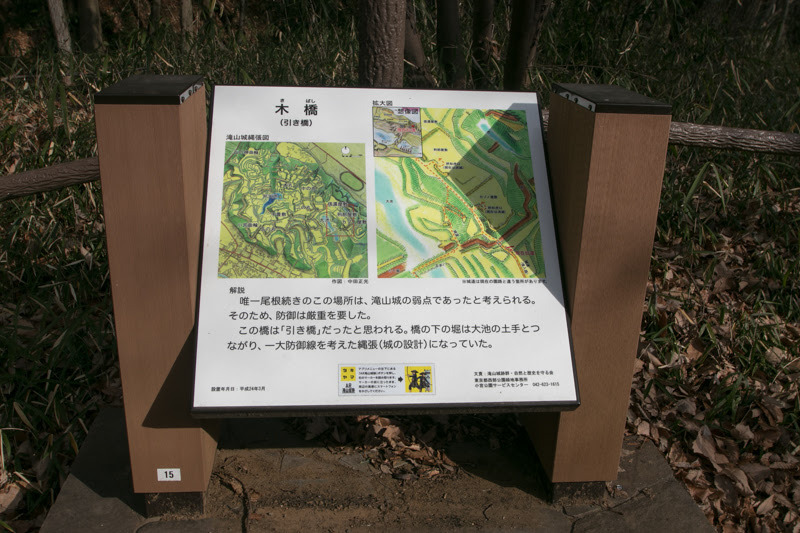 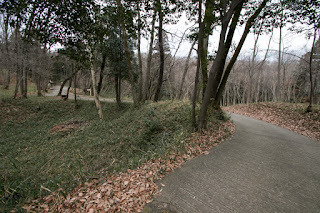 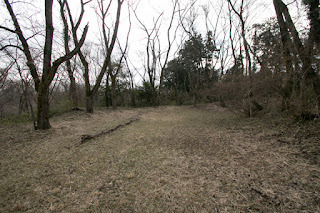 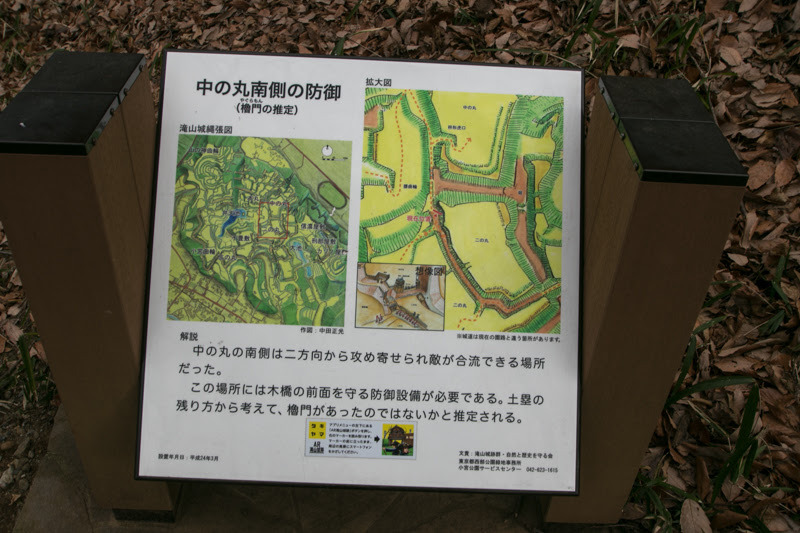 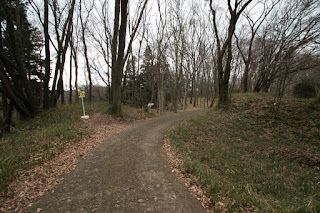 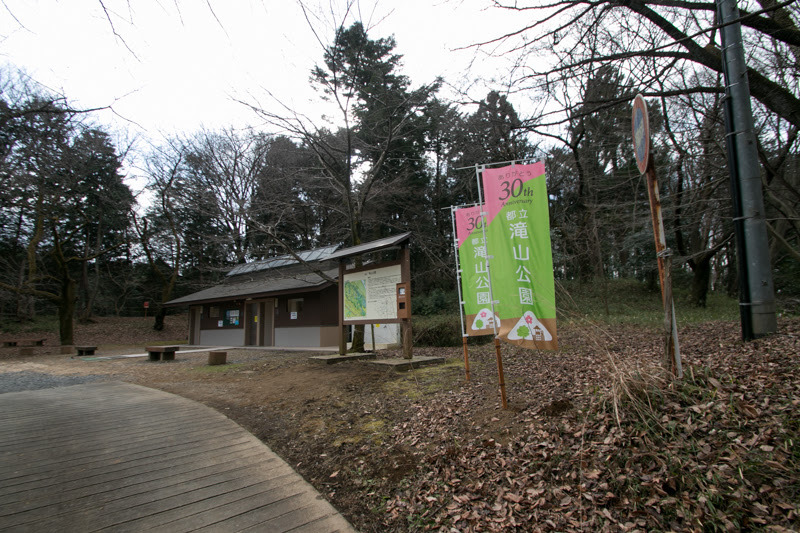 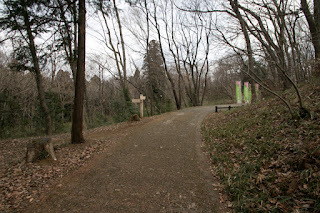 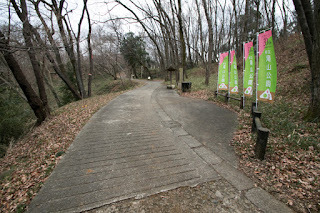 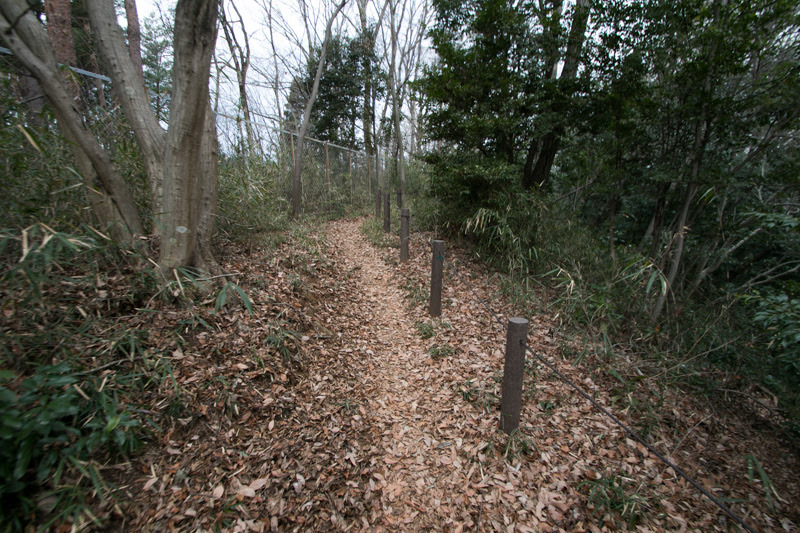 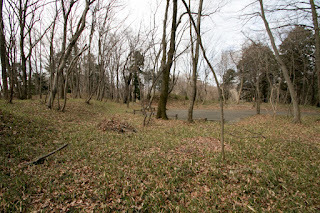 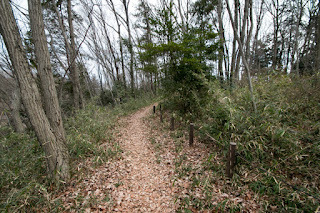 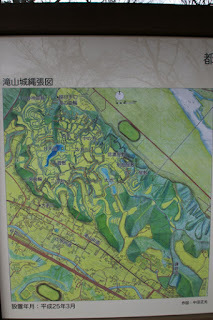 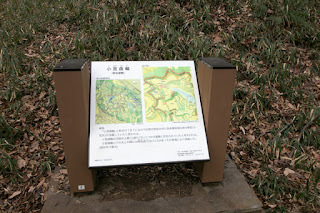 The site of the castle is just the next of meeting point of main stream of Tamagawa river from Ome area and Akikawa river from Okutama area, and it was suitable place to manage western end of current Tokyo metropolis. 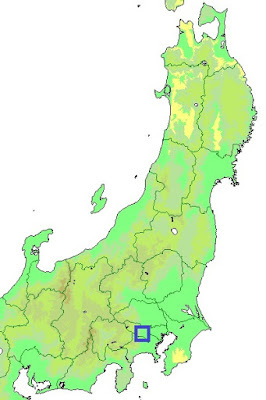 Originally western end of Tokyo metropolis was governed by Oishi clan. 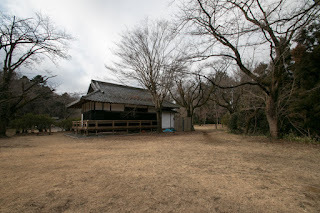 Oishi clan was a powerful local lord and vassal of Ogigayatsu Uesugi clan, one of the major powers of Kanto plain held current Saitama prefecture, Tokyo Metropolis and Kanagawa prefecturearound 1500. 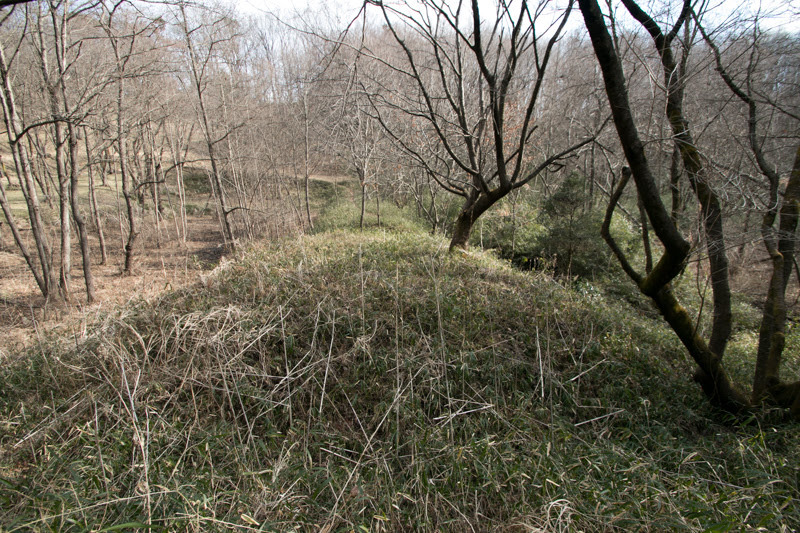 At first Oishi clan resided at Takatsuki castle at one kilometer from Takiyama castle, but built this castle and moved in 1521. But ancient regime of Kanto plain formed by Yamanouchi Uesugi clan, Ogigayatsu Uesugi clan and Koga Kubo highness was broken by the rise of Hojo clan which rose to the warlord in Izu peninsula by Soun Hojo (1432-1519). 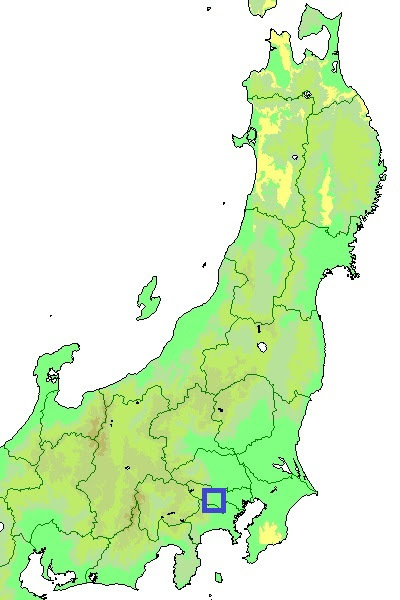 Hojo clan gradually intruded into Kanto plain from westward, then captured whole part of Sagami province (Kanagawa prefecture) around 1530. 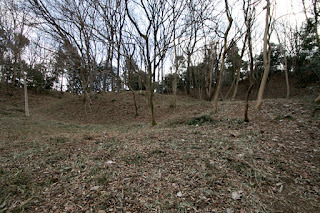 Facing the intrusion of Hojo clan, old powers of Kanto region allied and siege Hojo army with large army at Kawagoe castle in 1546, but because of the night attack of Hojo clan, allied army suffered severe defeat then Ogigayatsu Uesugi clan substantially ruined. 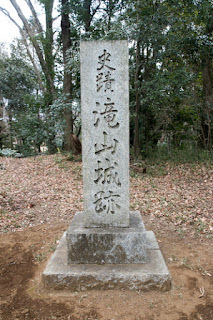 Since then Oishi clan which lost their master subordinated to Hojo clan and accepted Ujiteru Hojo (1540-1590), third son of Ujiyasu Hojyo (1515-1571) who was the third leader of Hojo clan, as a son in law. 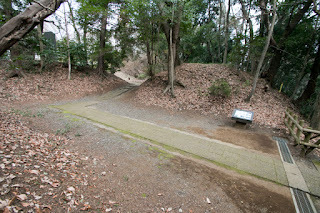 Ujiteru was a bold commander having both bravery and intelligence, and worked hard as a military leader of Hojo clan at the period of Ujimasa Hojo (1538-1590), son of Ujiyasu and fourth leader. 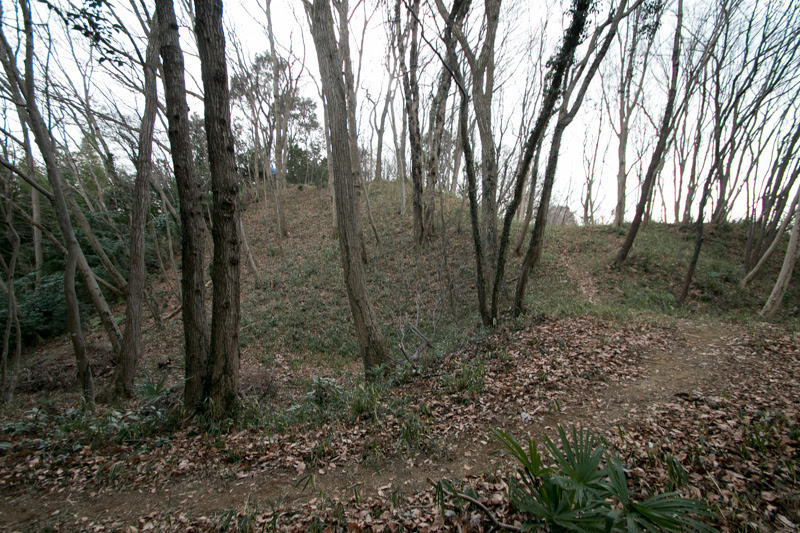 As a regional commander of Musashi province (Tokyo metropolis), Ujiteru significantly expanded Takiyama castle. 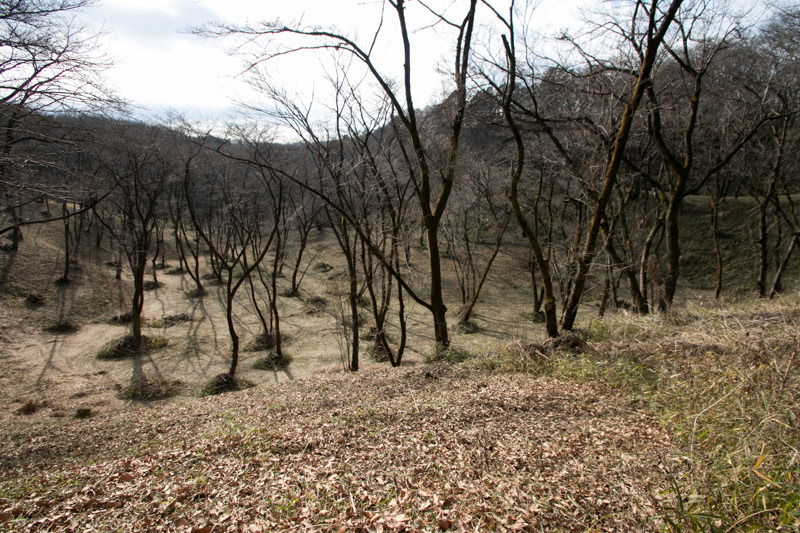 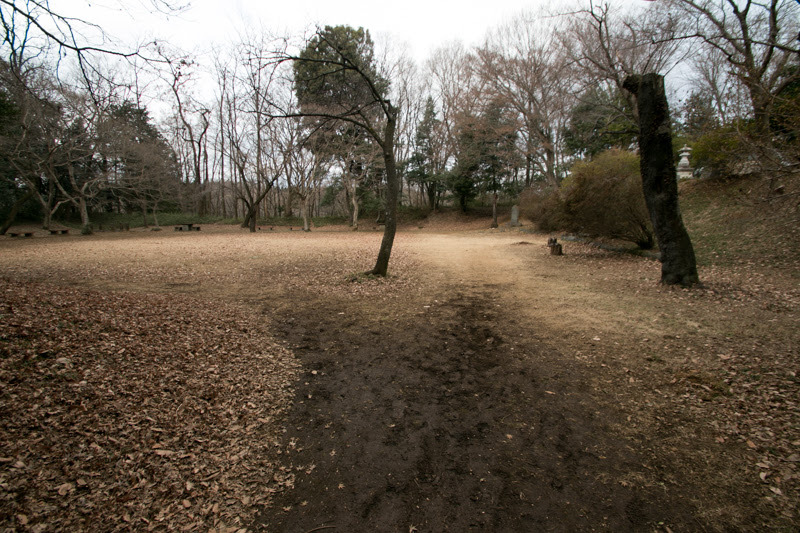 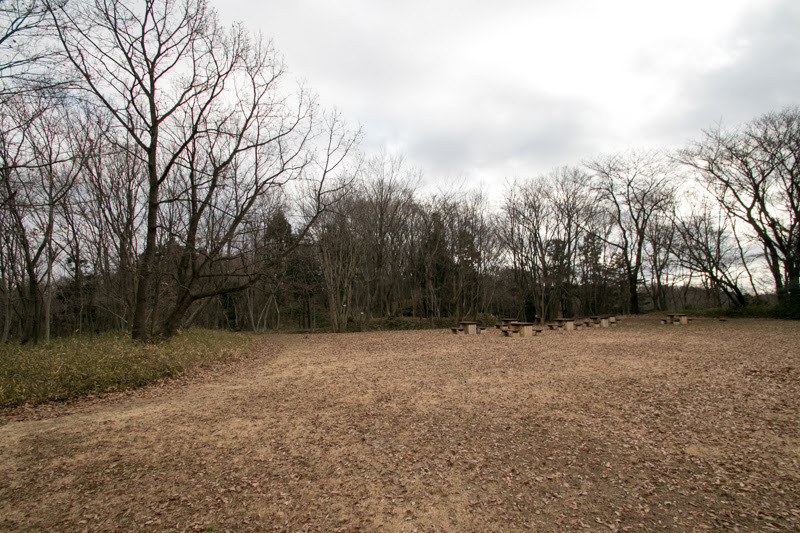 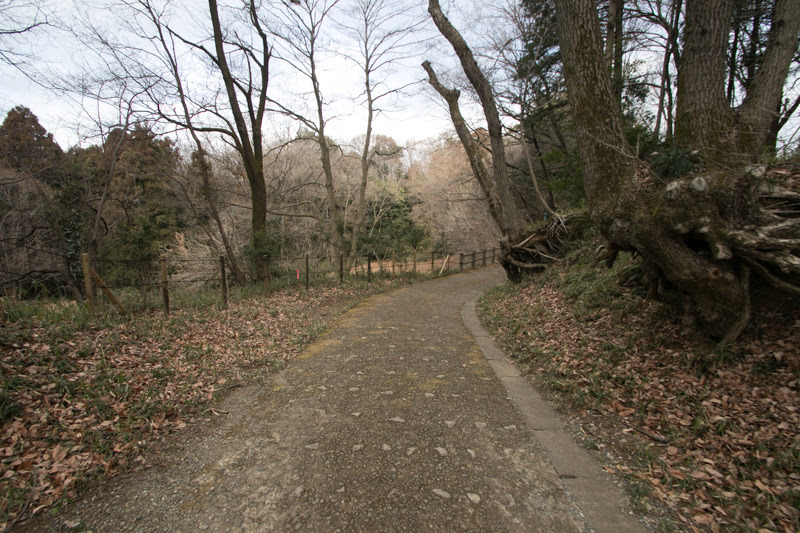 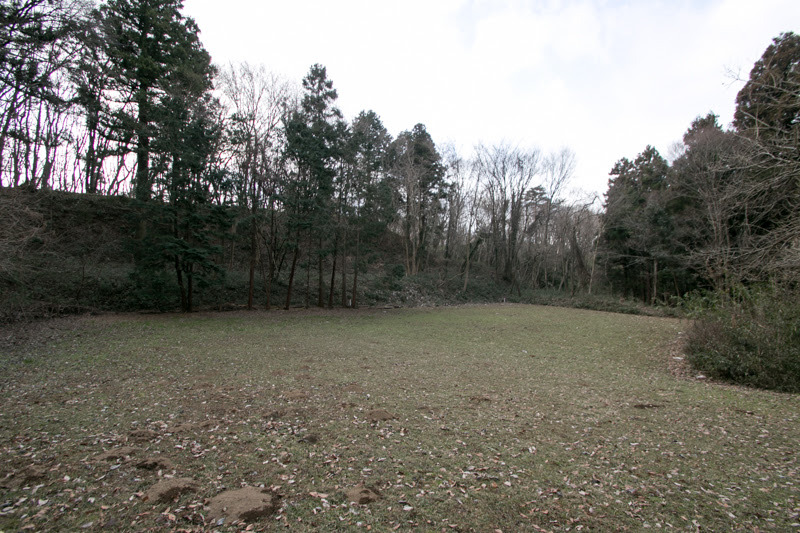 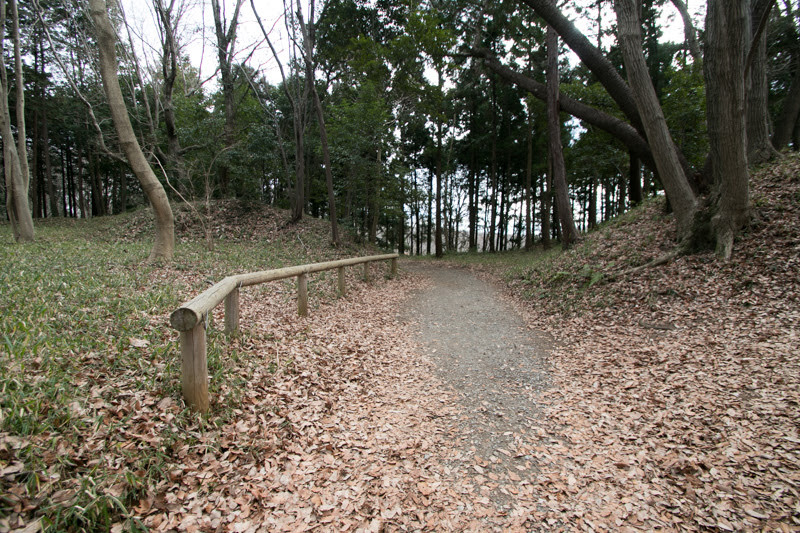 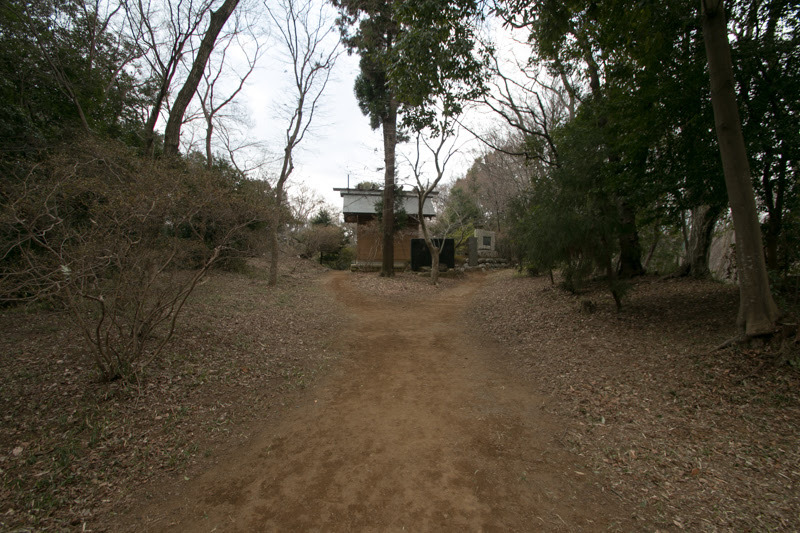 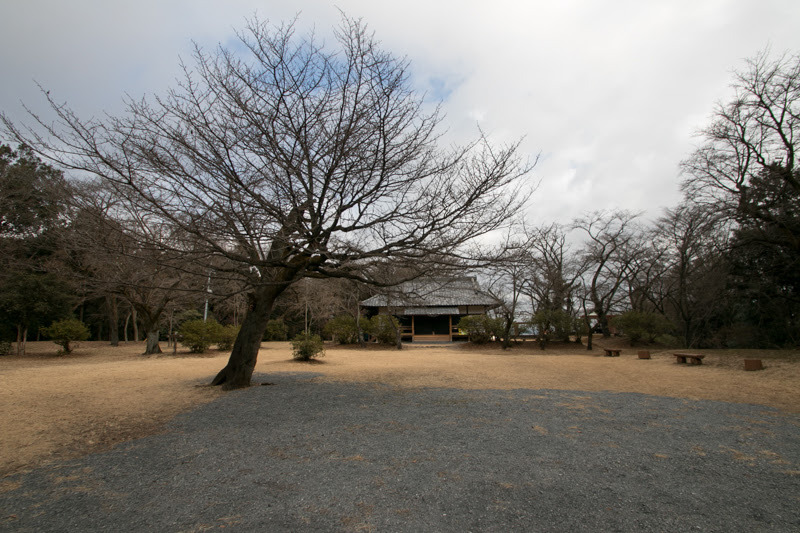 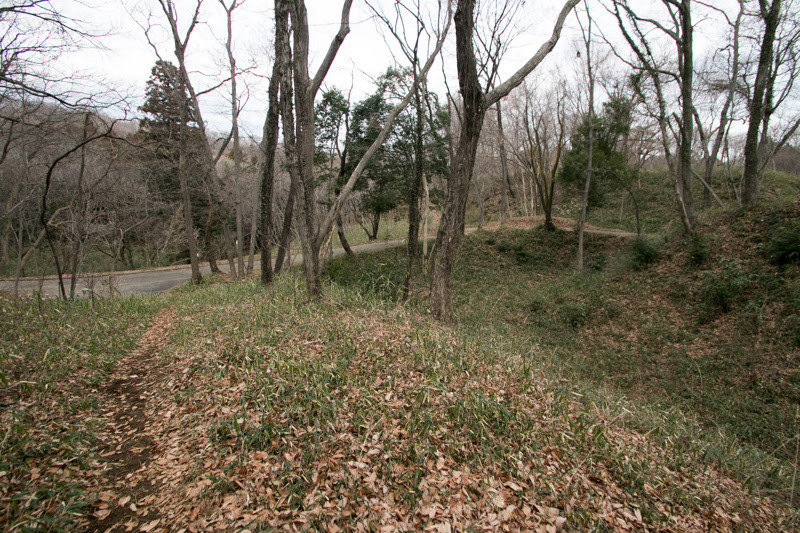 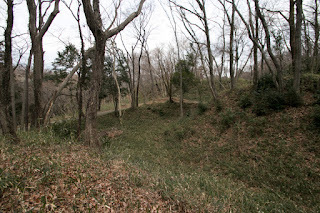 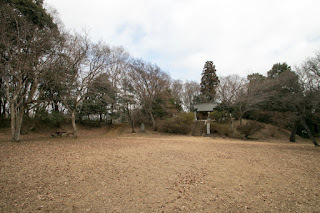 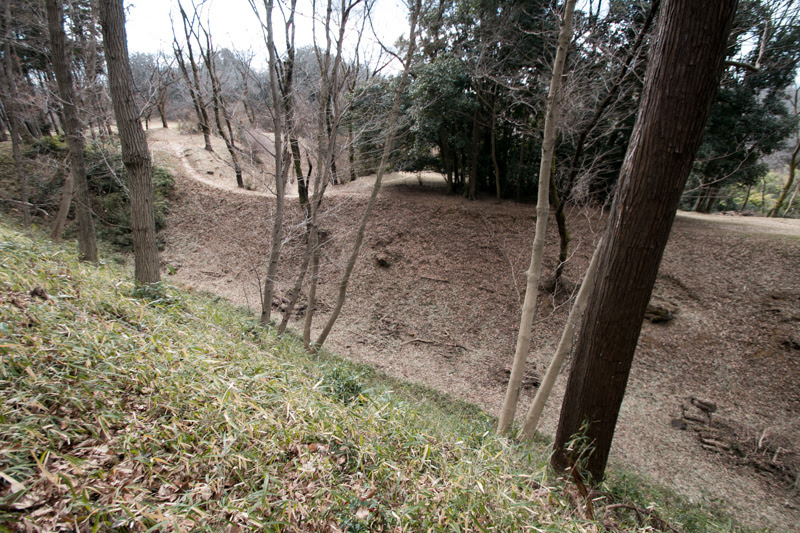 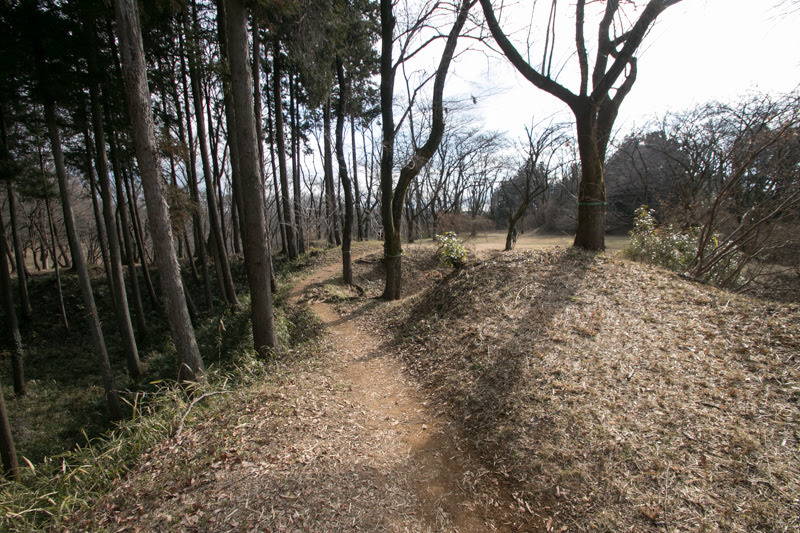 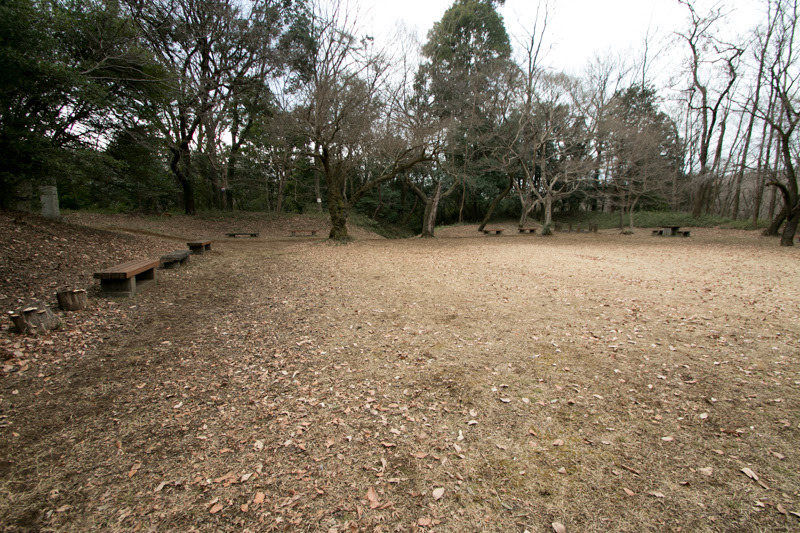 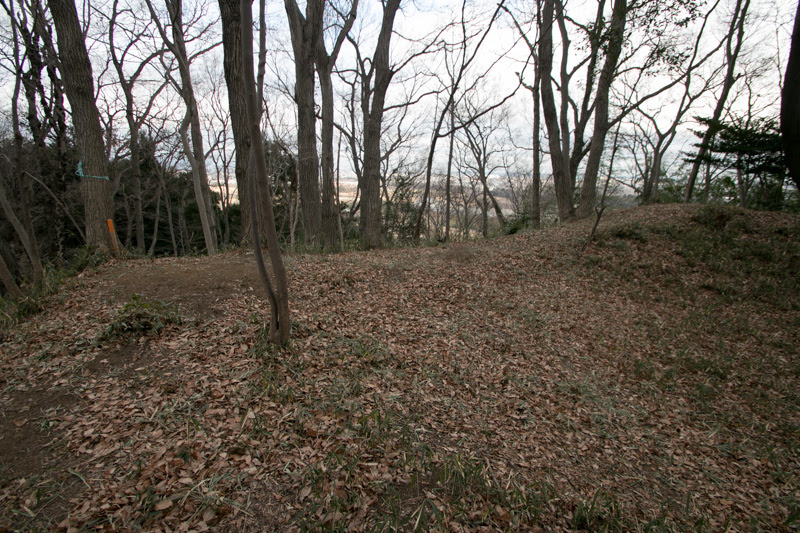 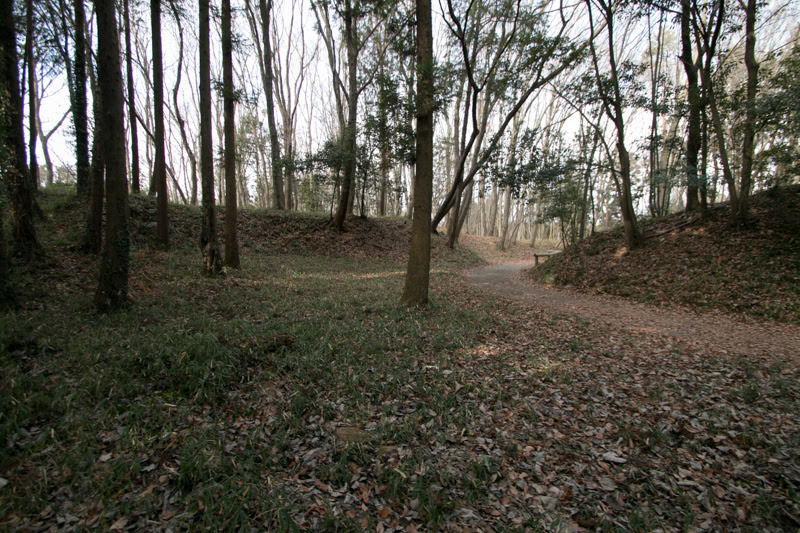 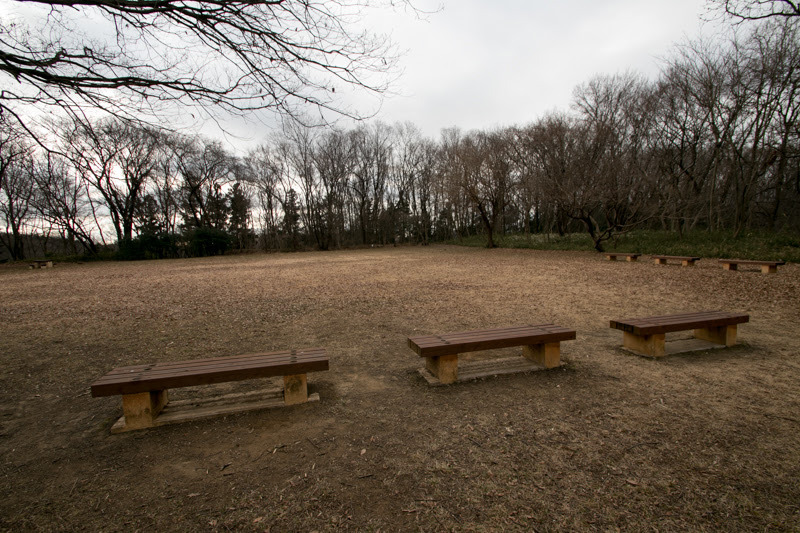 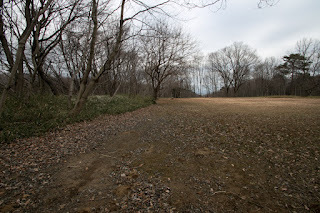 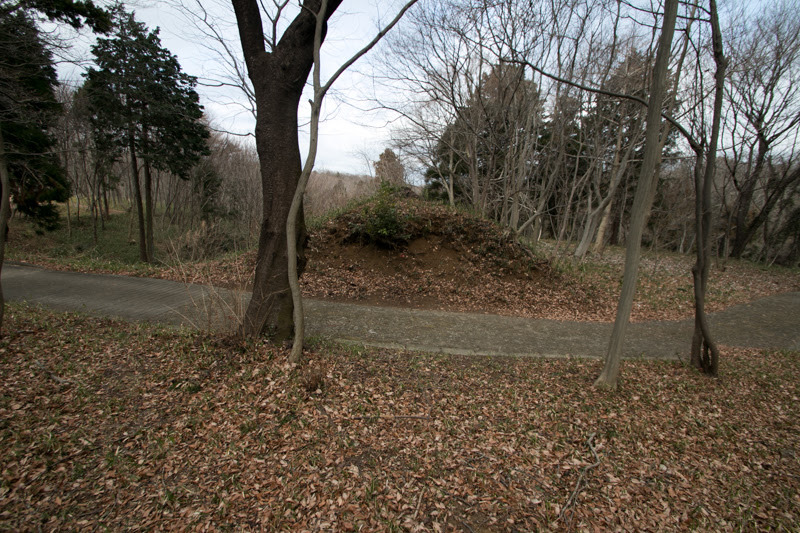 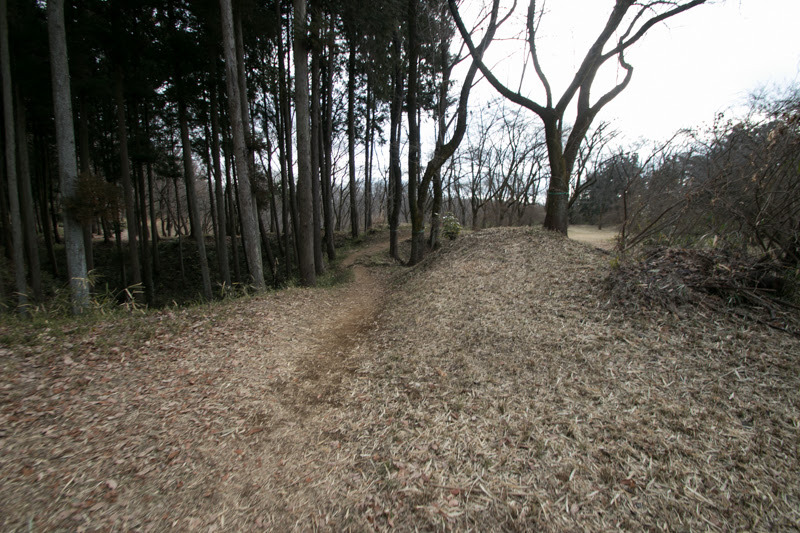 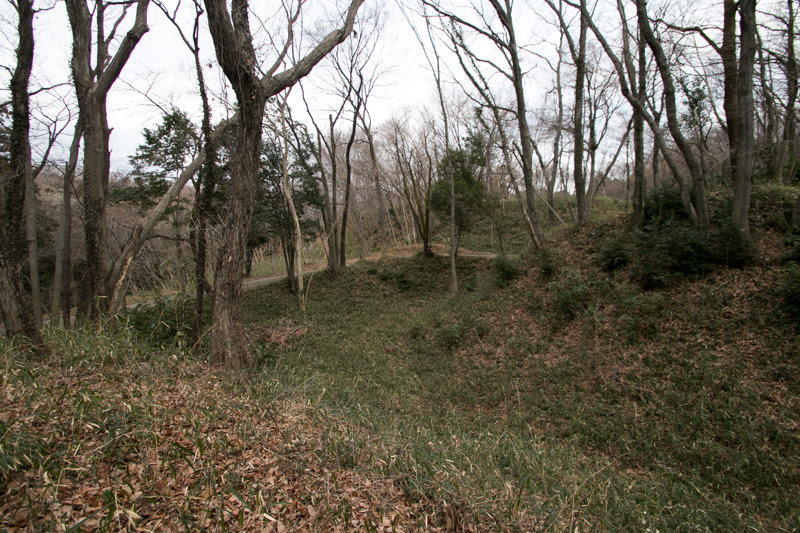 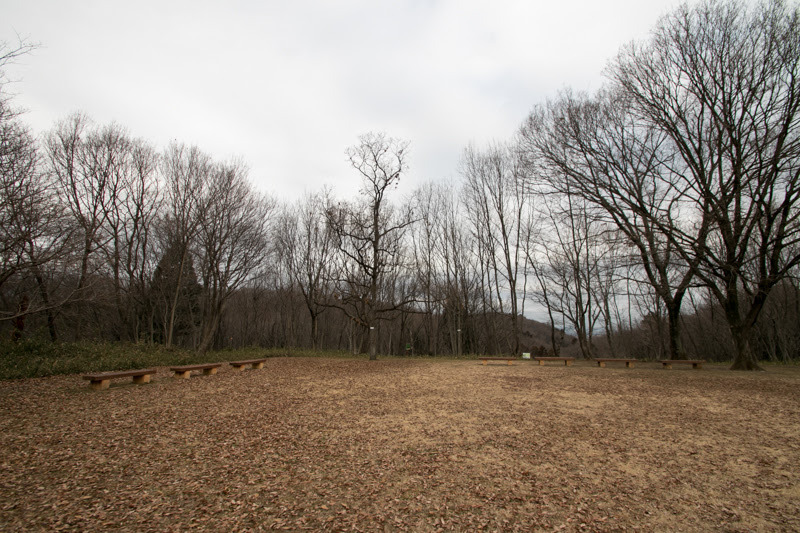 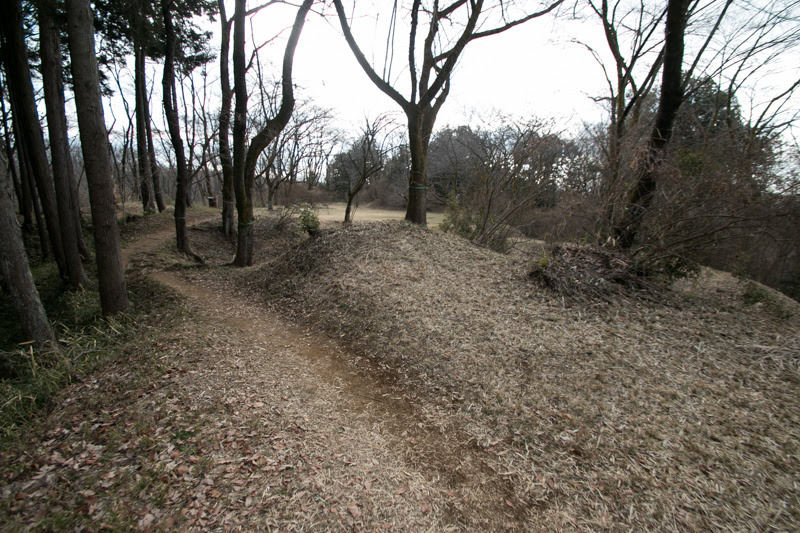 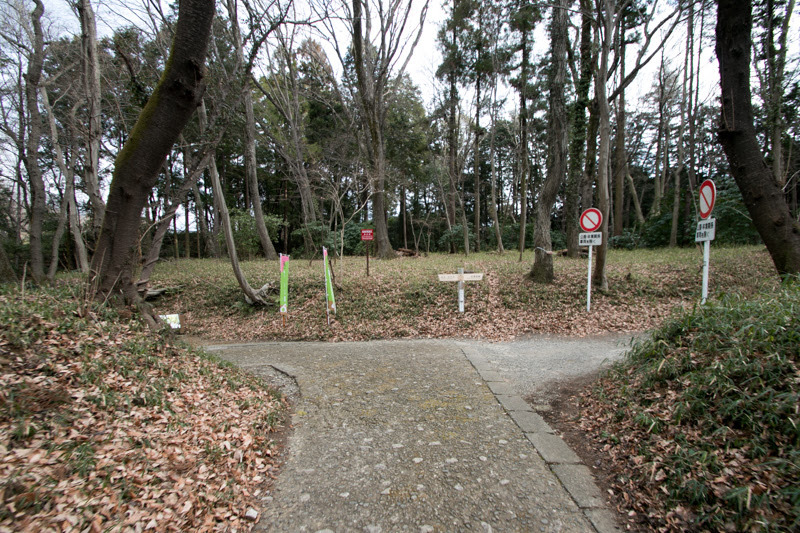 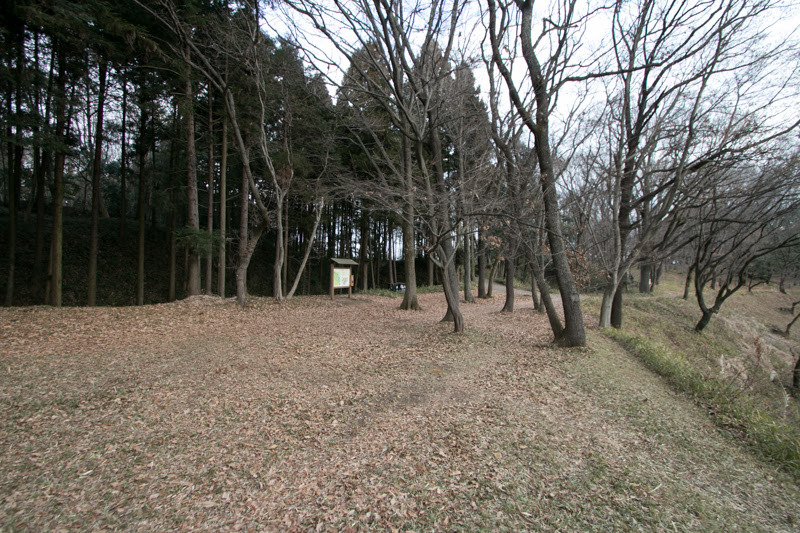 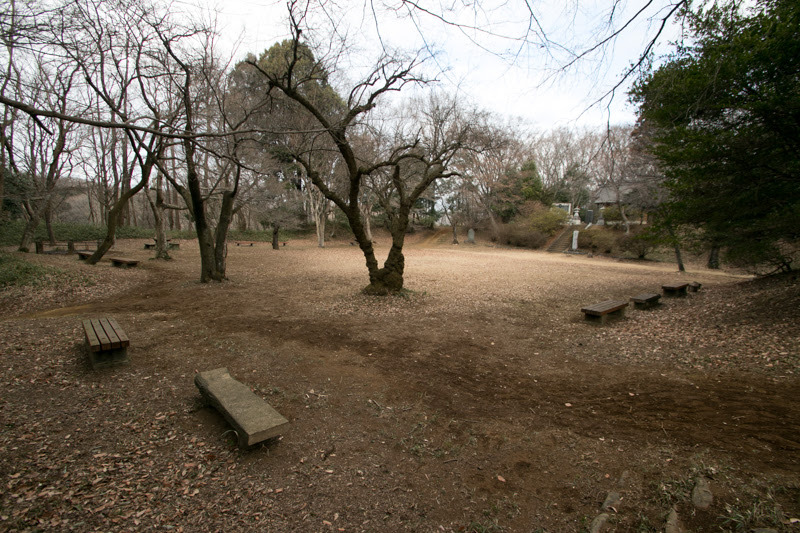 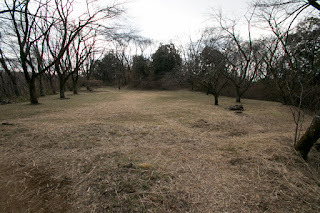 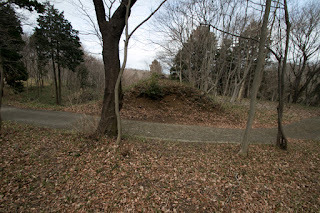 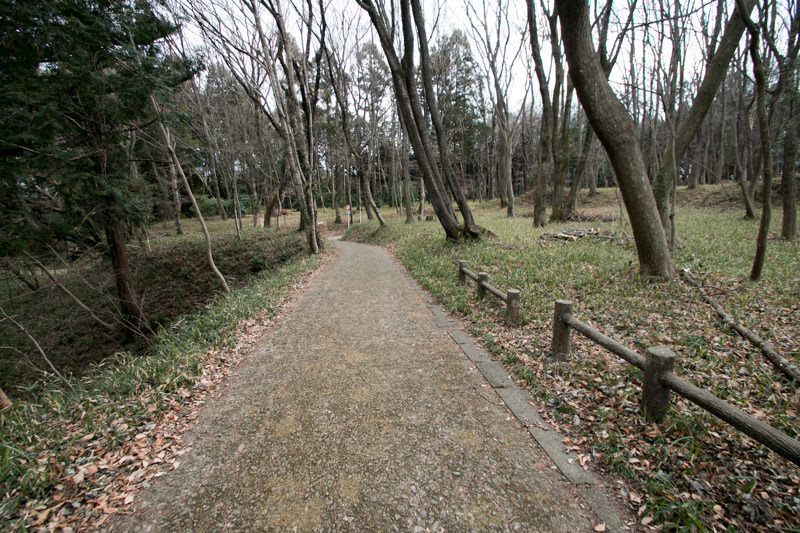 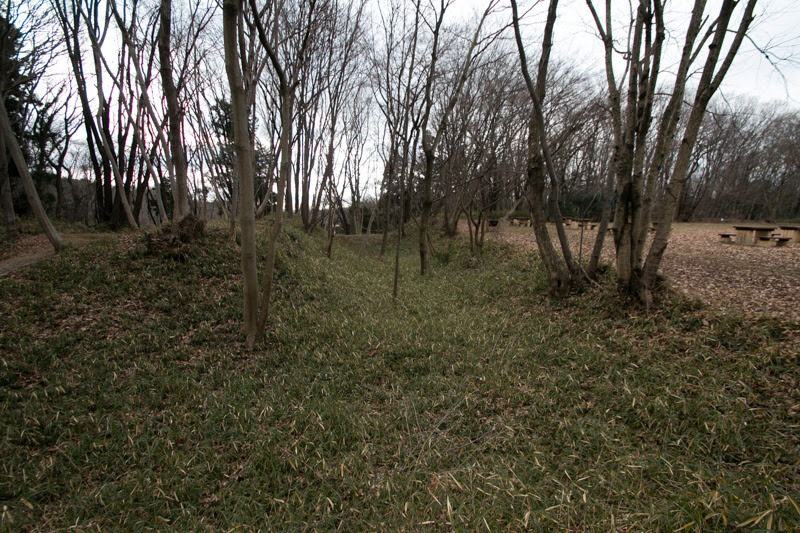 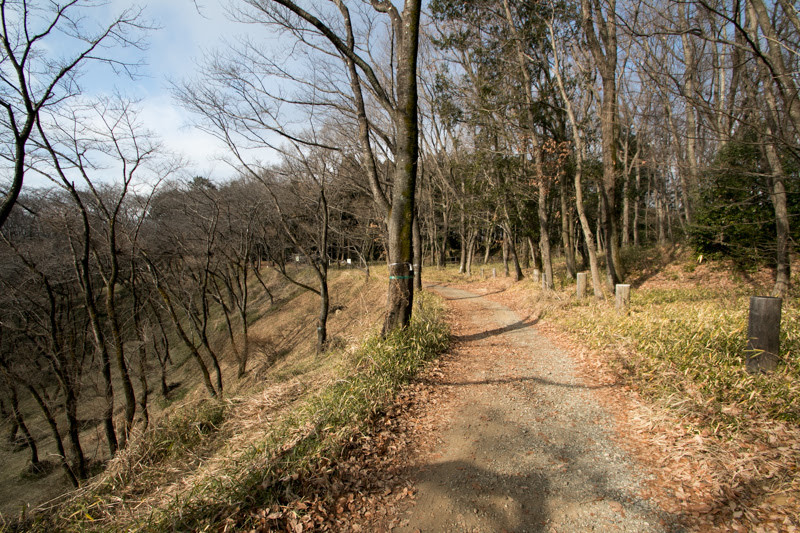 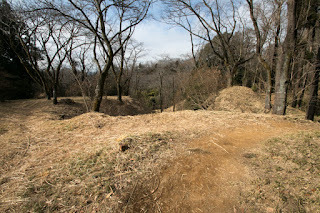 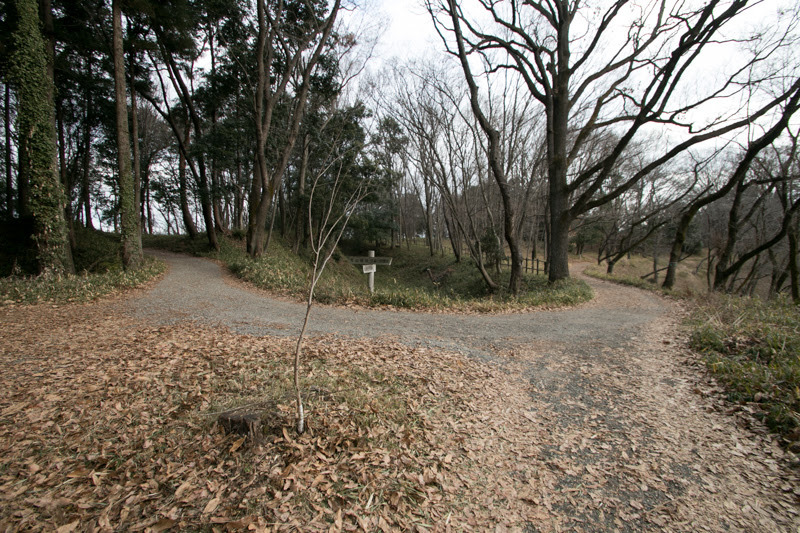 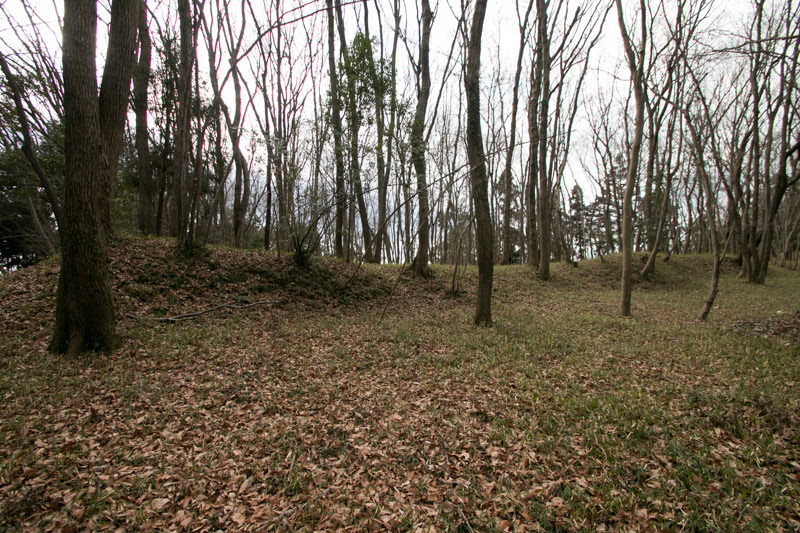 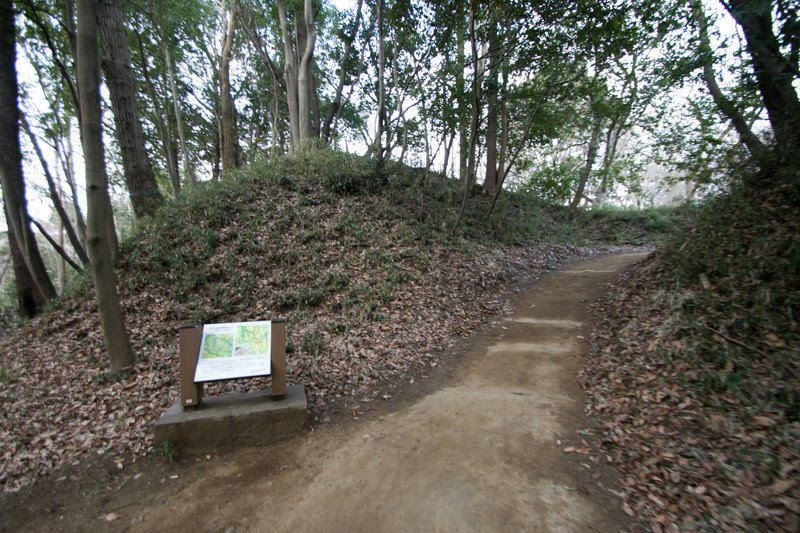 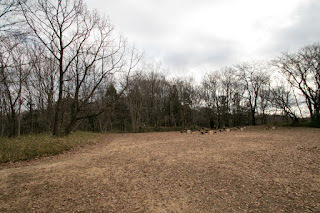 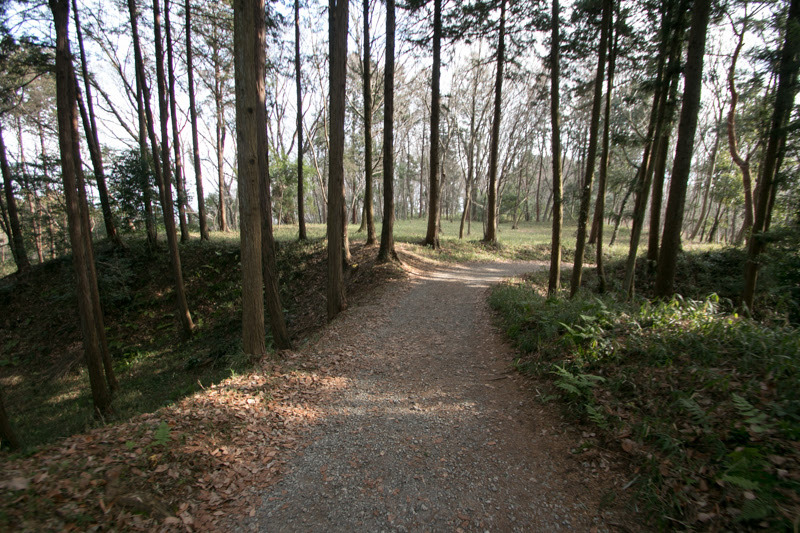 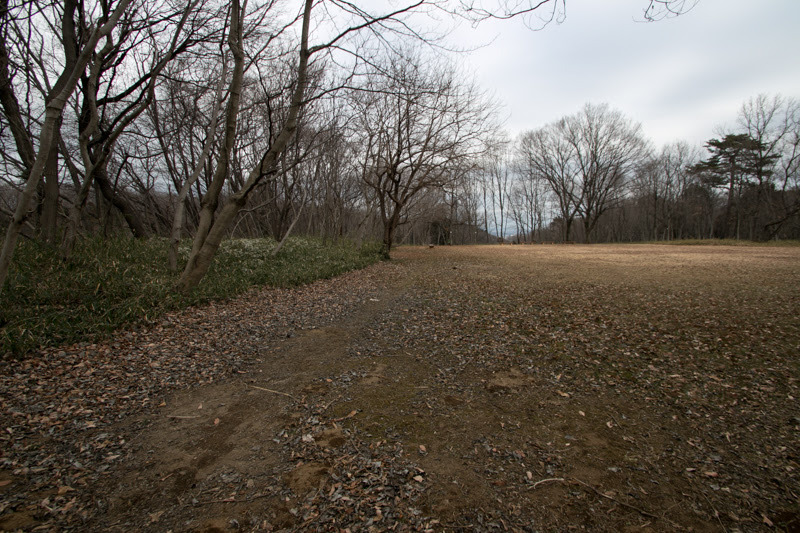 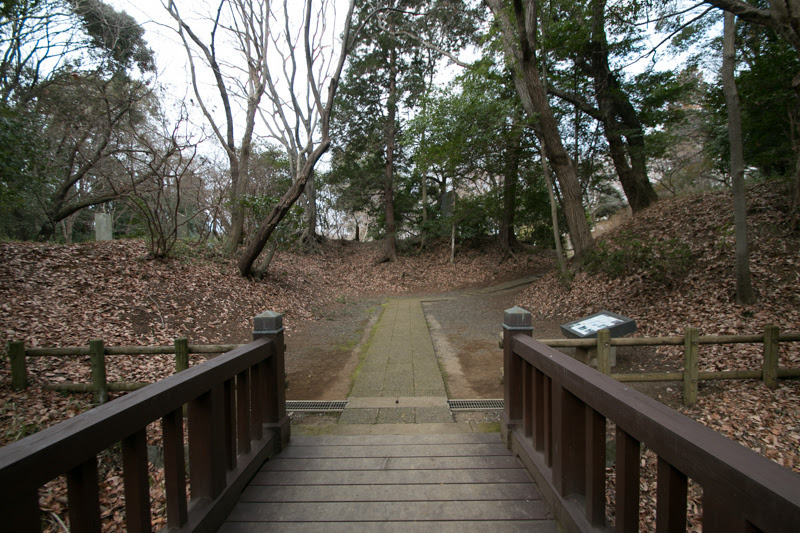 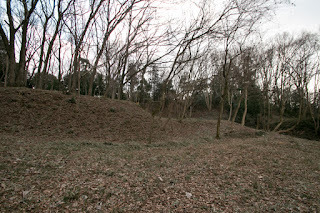 The original castle area was limited area including Honmaru (central area) or Nakanomaru (intermediate area), which were just shaped space without defense facility. 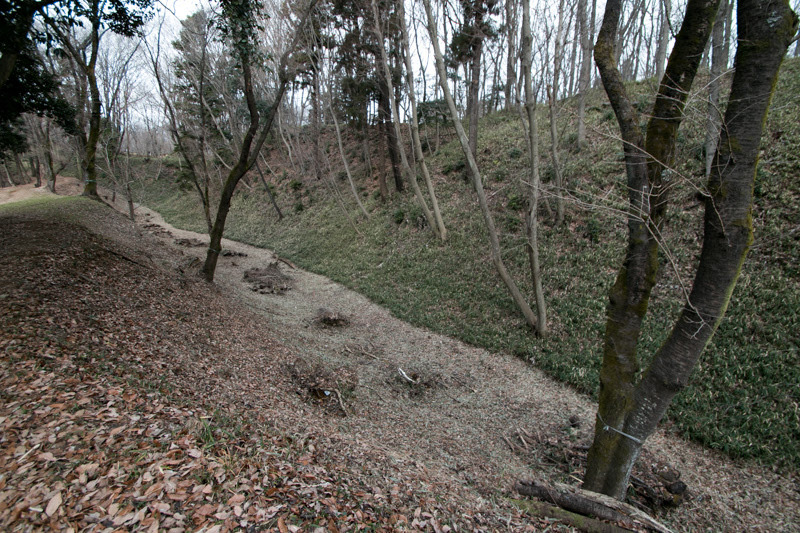 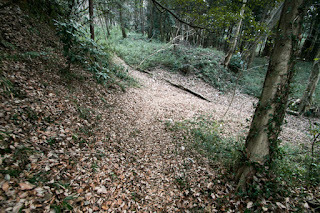 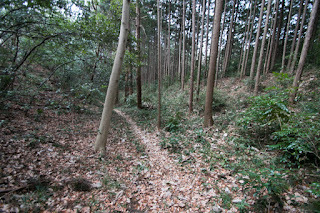 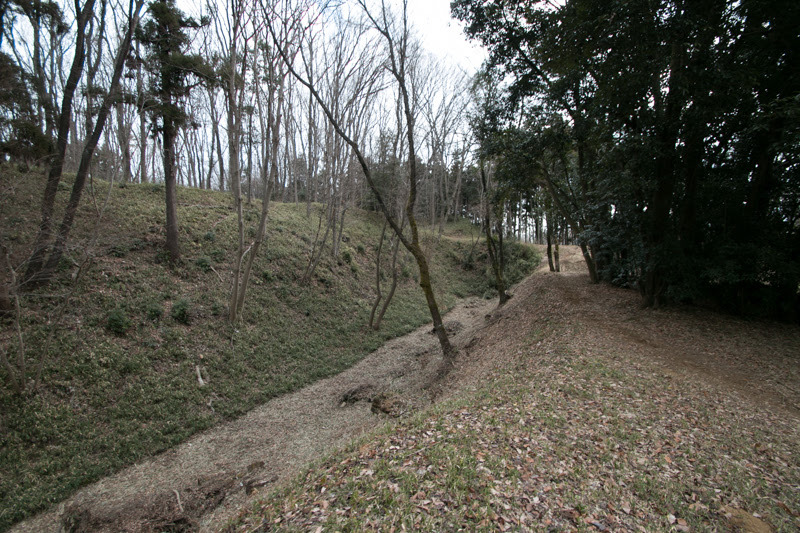 Ujiteru newly constructed outer areas consist of Ninomaru (secondary area), Sannomaru (third area) and Komiya Kuruwa (Komiya area), each has large territory with clay and deep dry moats. 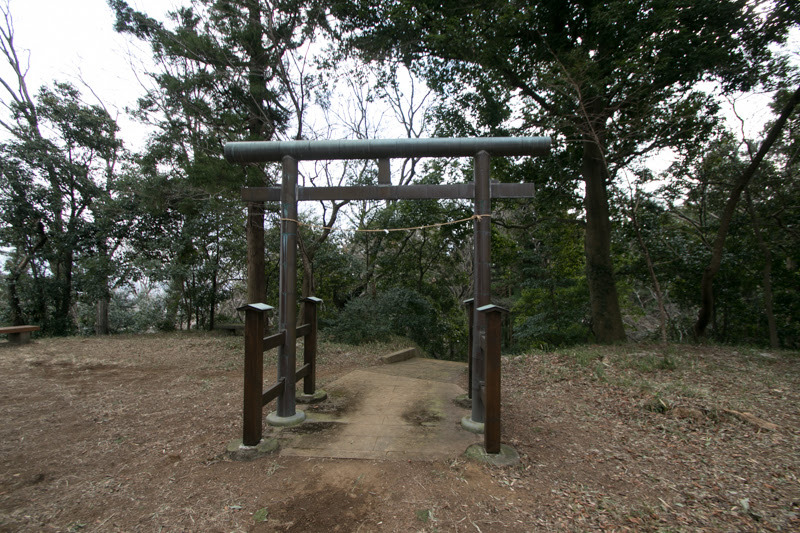 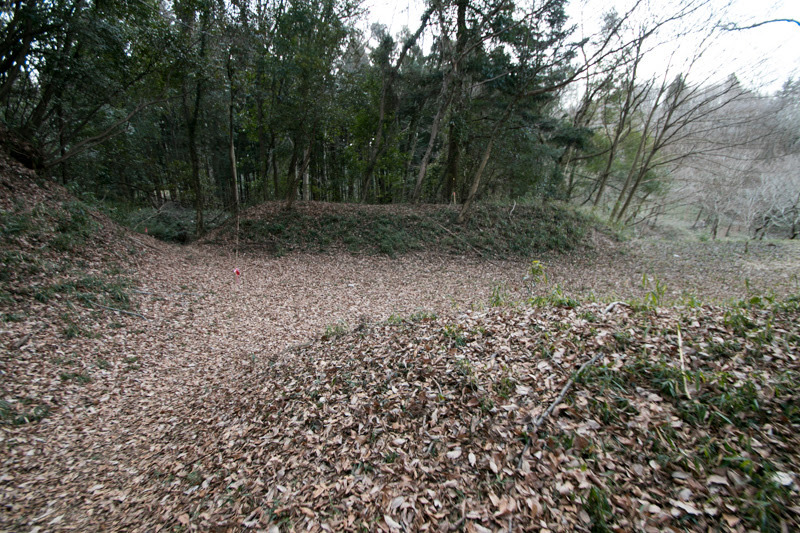 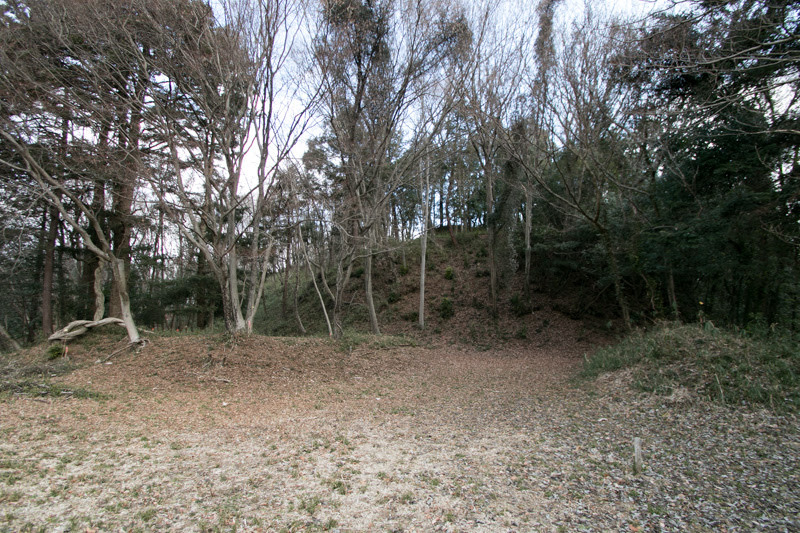 Ninomaru was the center of this outer areas, equipped Umadashi (buffer compartments in front of the gate) for each gate and turret gate to control the defence line. 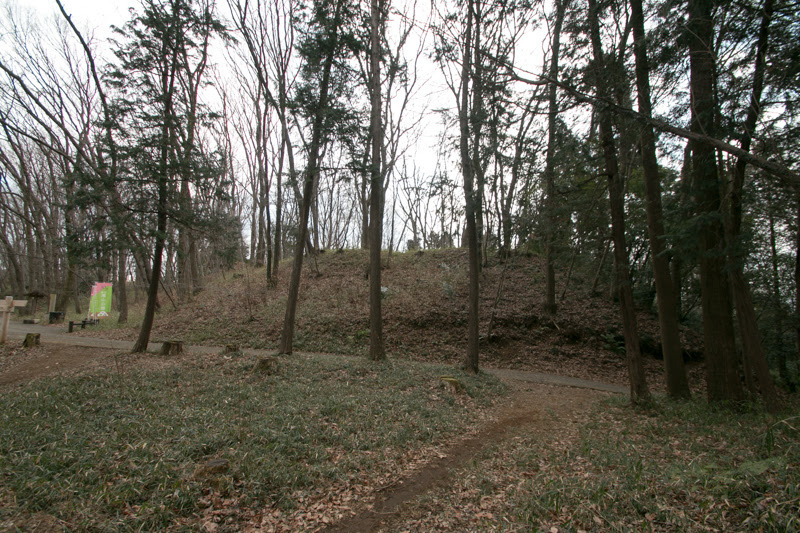 In 1569, Takiyama castle was attacked by Shingen Takeda (1521-1573), a warlord of Kai country (Yamanashi prefecture). 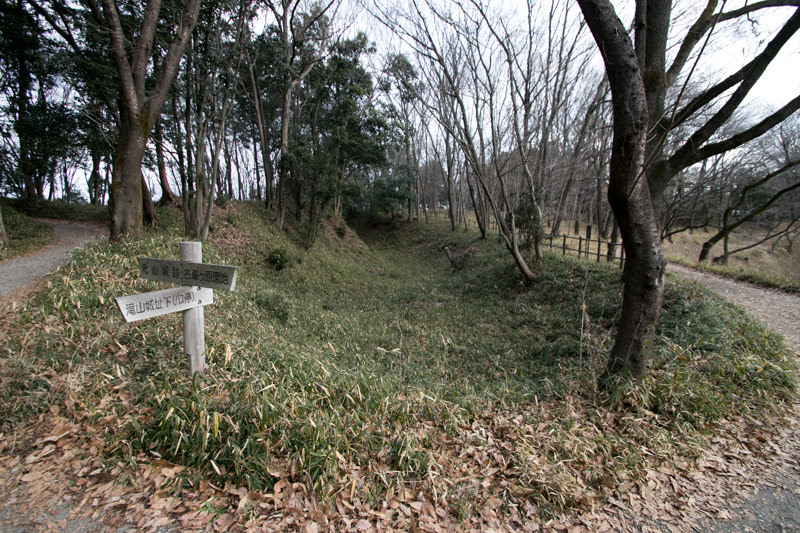 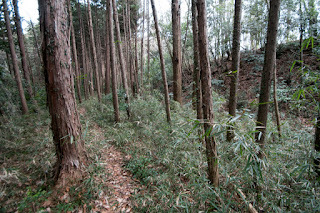 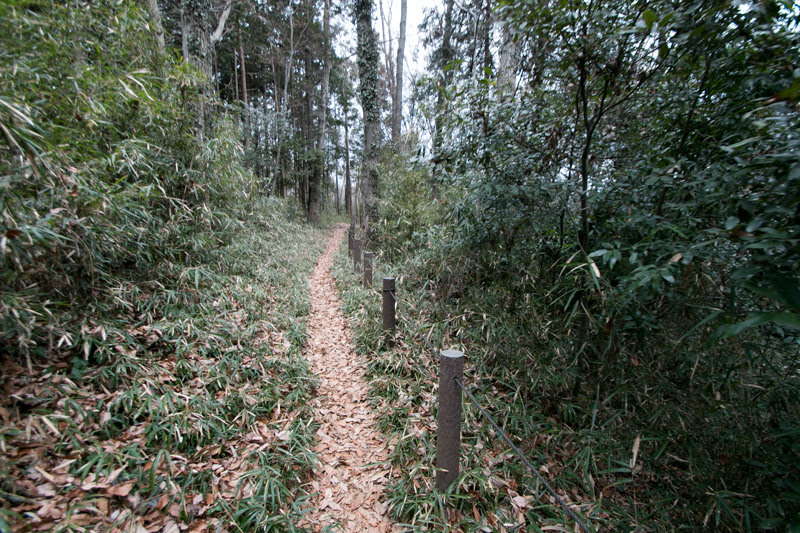 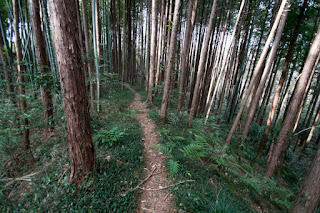 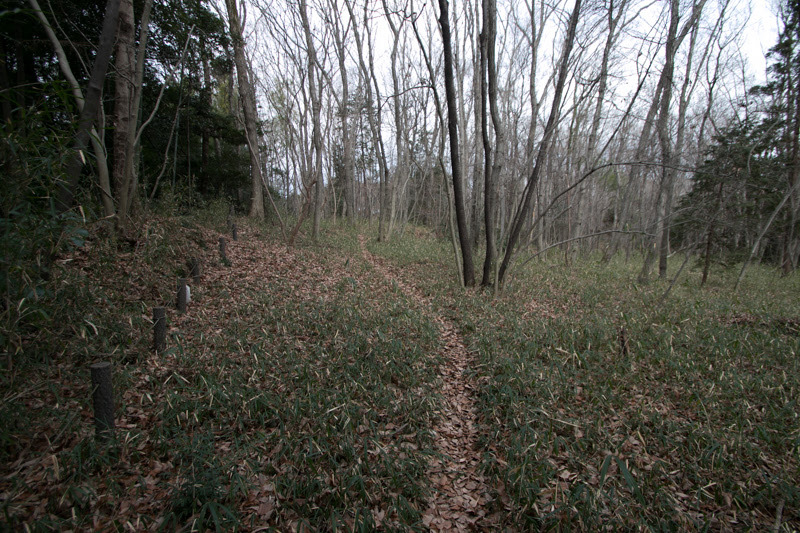 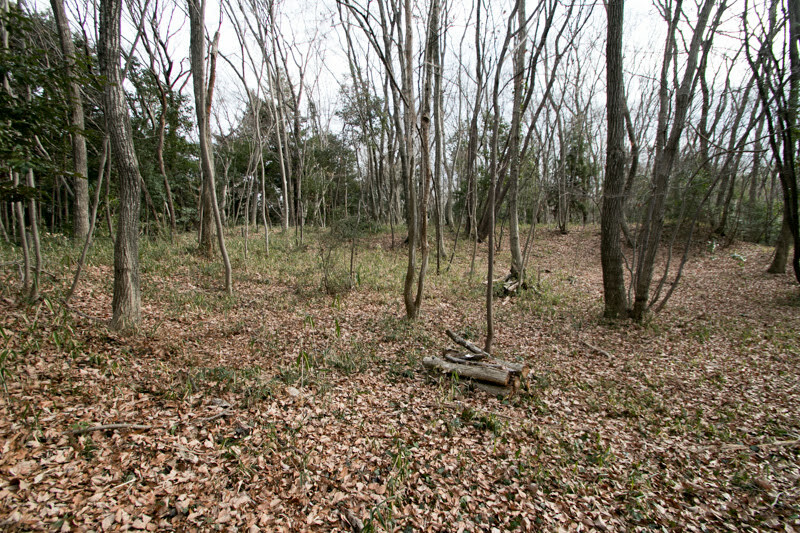 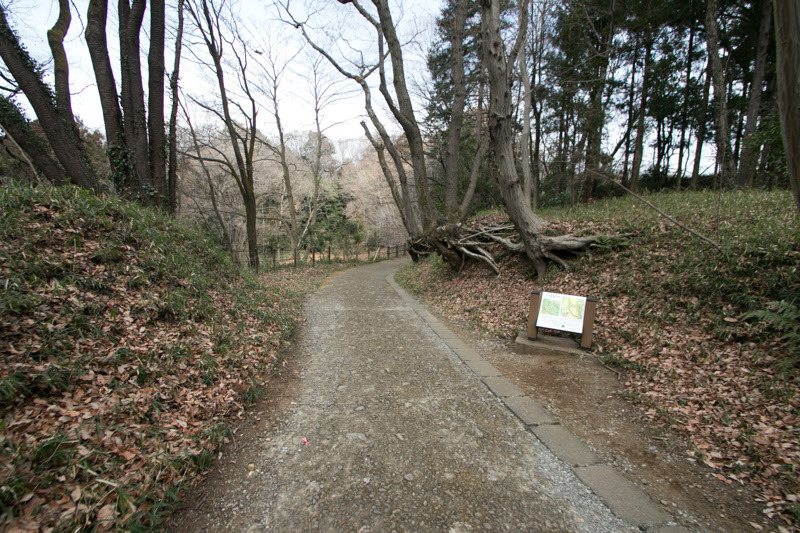 Formerly Hojyo clan and Takeda clan made alliance including Imagawa clan, a warlord of Suruga country (middle part of Shizuoka prefecture), but due to the weakning of Imagawa clan, Takeda clan which attempted to conquer Imagawa clan and Hojo clan which continuously supported Imagawa clan became hostile. 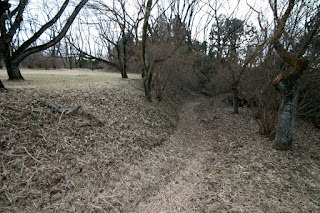 In this situation Hojo clan broke up with Takeda clan and allied with Uesugi clan, a warlord of Echigo province (Niigata prefecture) and a long-standing enemy of Shingen. 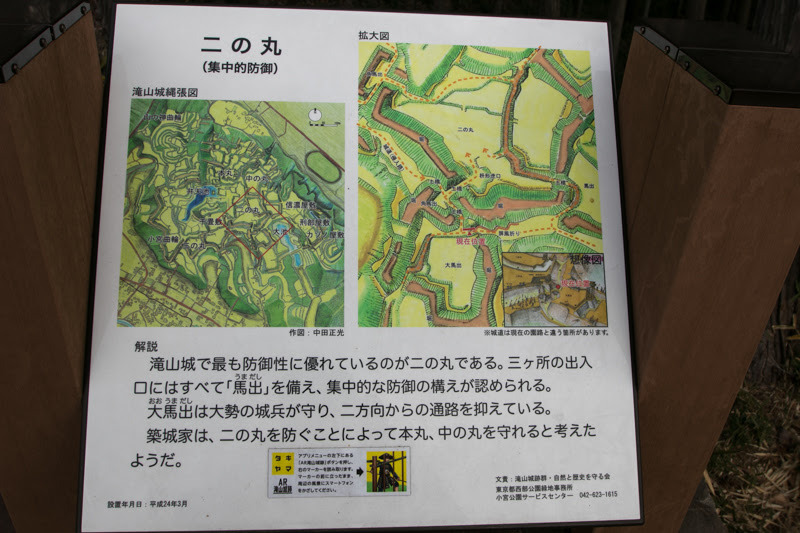 In response to this, Takeda clan became furious and invaded Hojyo clan. At that time Shingen intruded Musashi country with 20,000 soldiers, and placed his headquarters at Haijima, at the opposite of Tamagawa river. Shingen let Katsuyori Takeda (1546-1582), his son and successor, to lead army to attack. 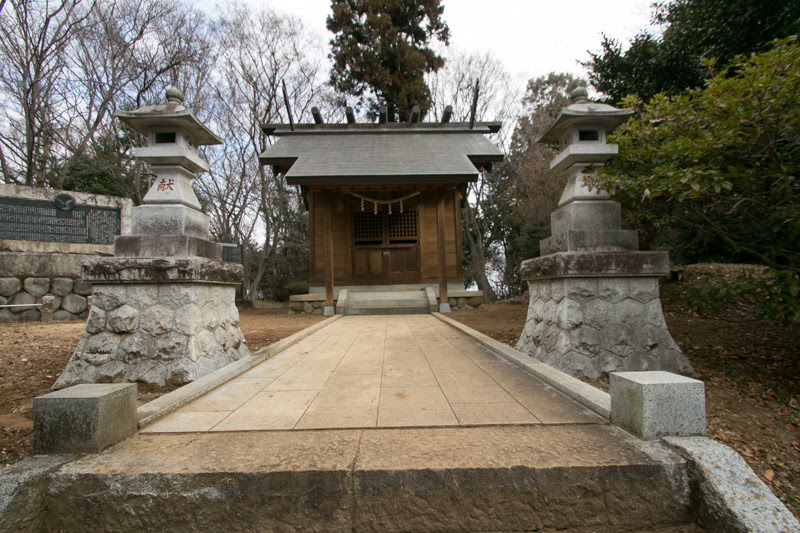 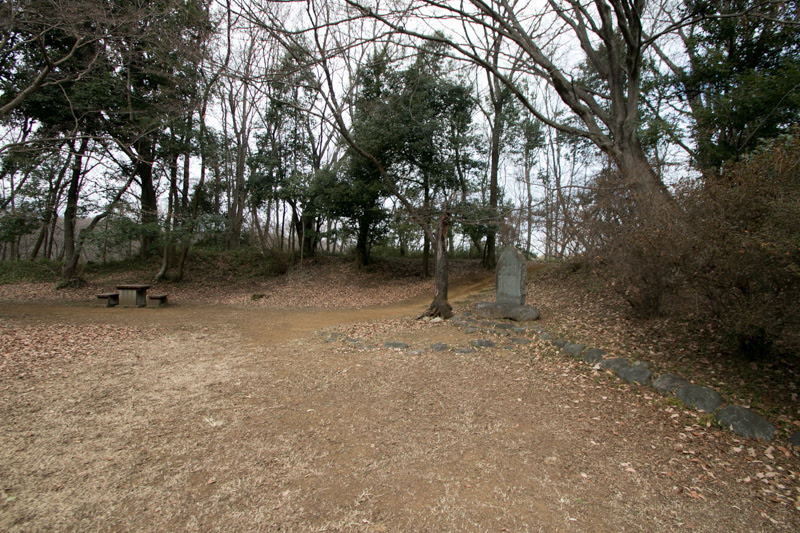 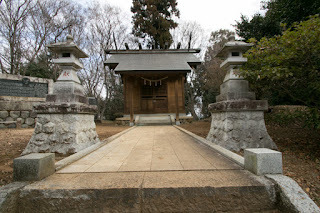 Katsuyori fought at the front of army with spear, and Ujiteru directly commanded defense action at the turret gate of Ninomaru. 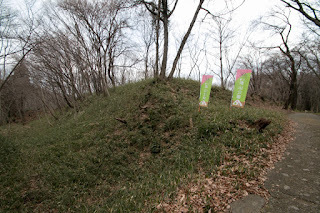 But Shingen’s main target was Odawara castle (further, it was rather a threat behavior to get Hojo clan back to their side), finally Shingen retreated his army without long battle. 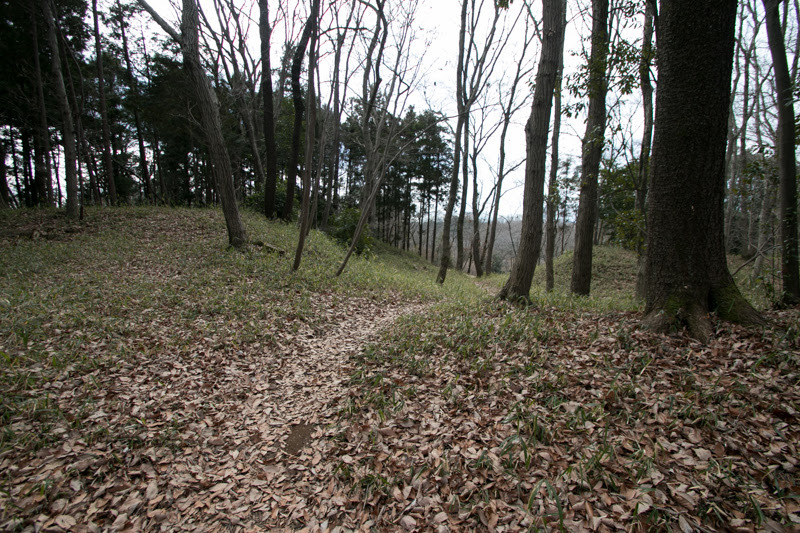 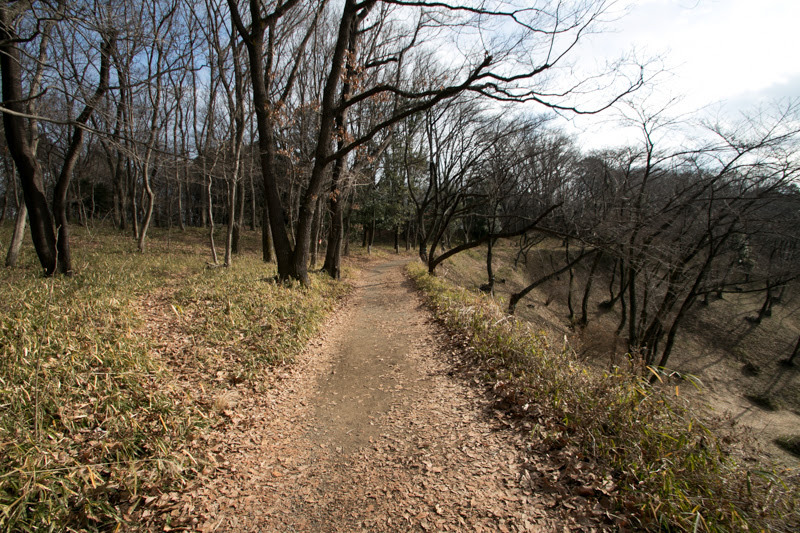 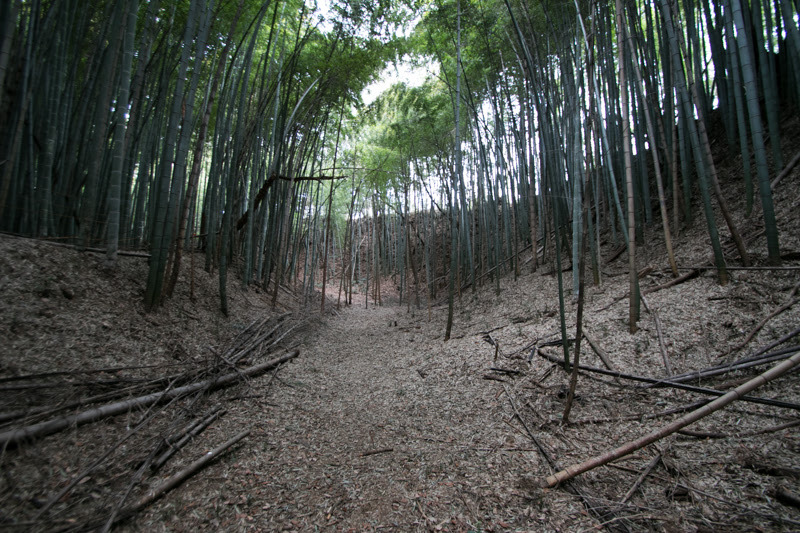 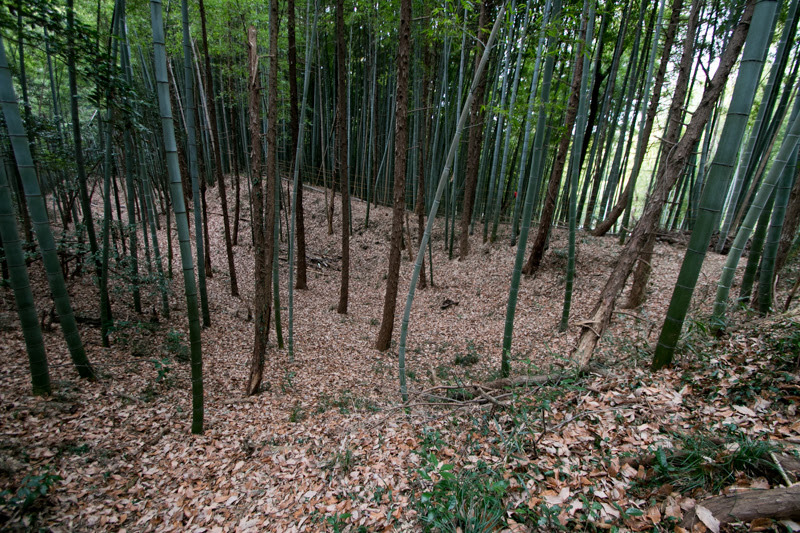 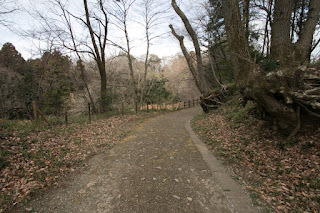 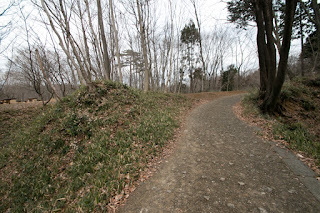 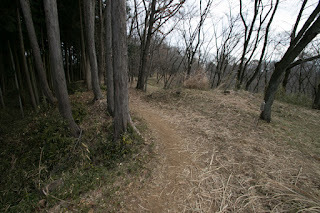 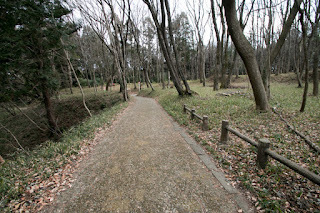 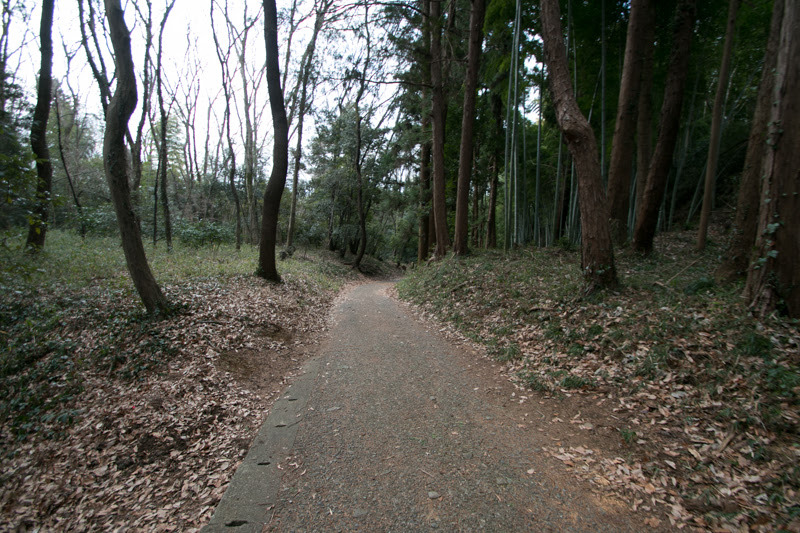 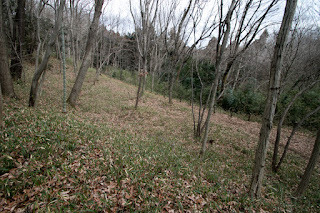 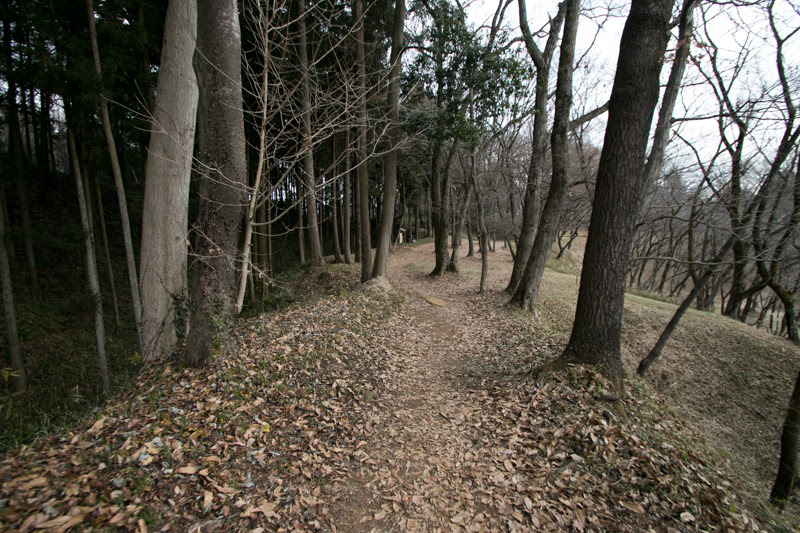 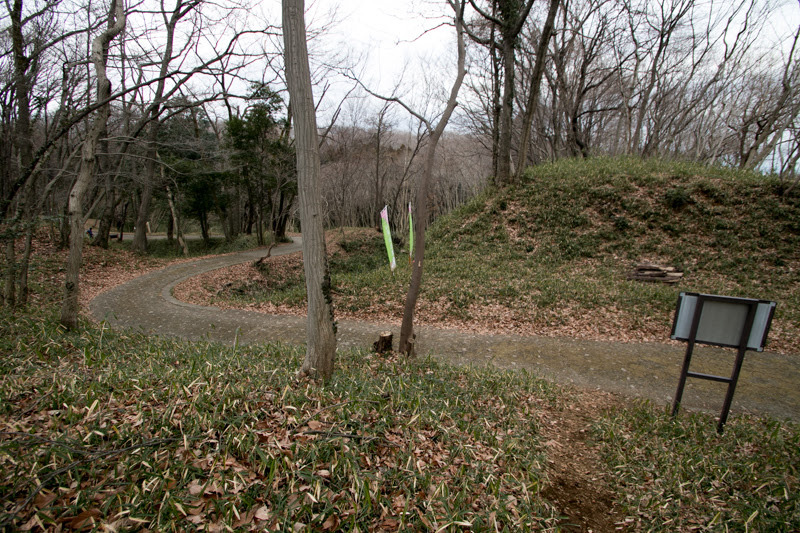 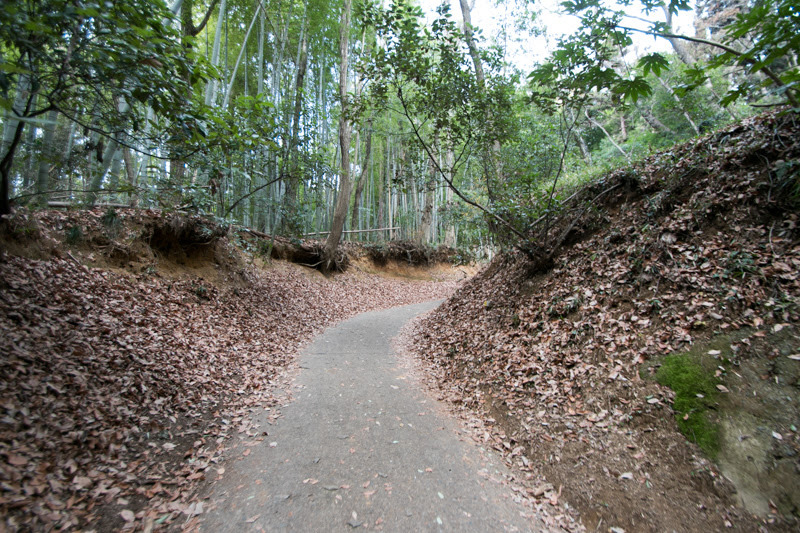 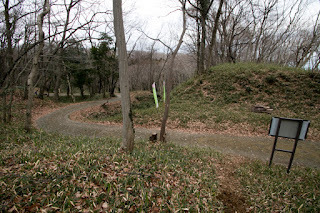 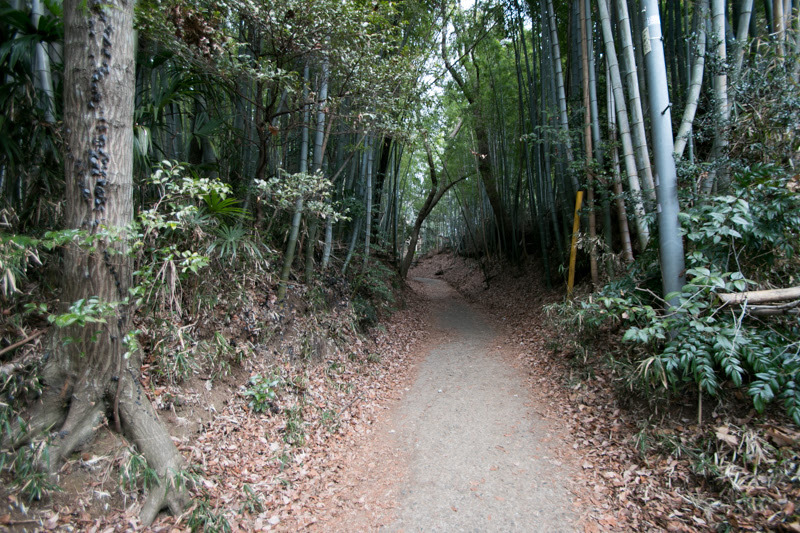 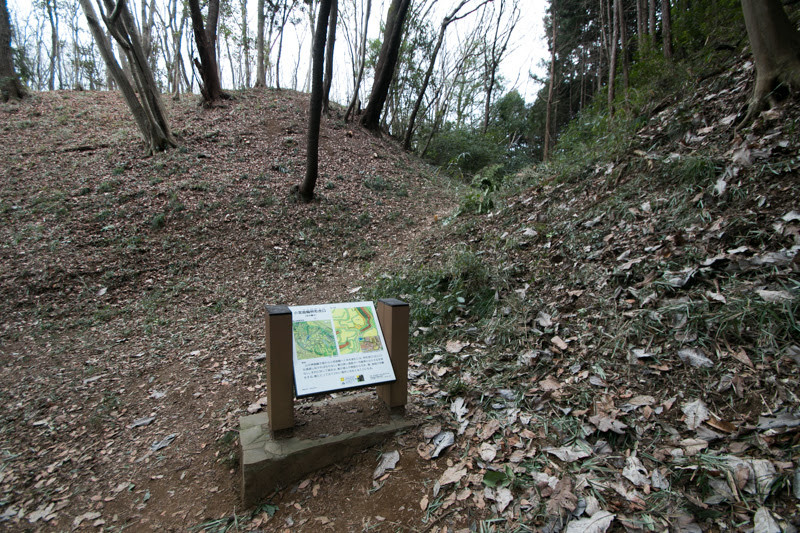 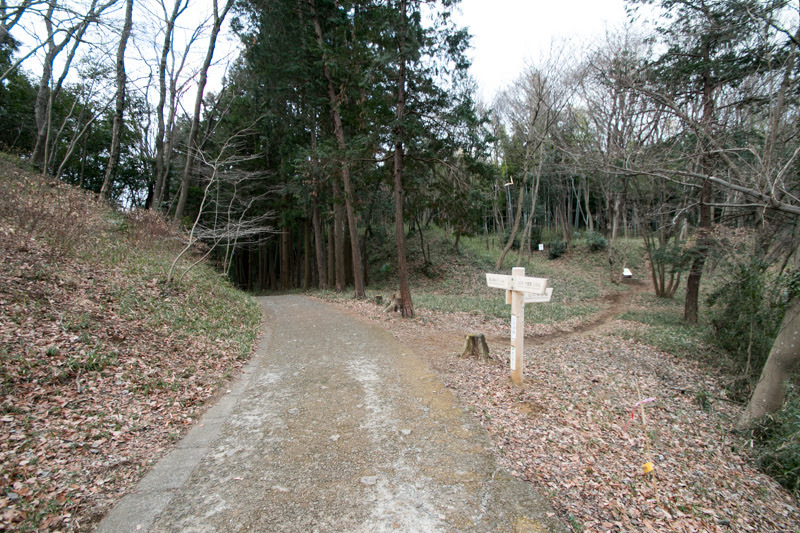 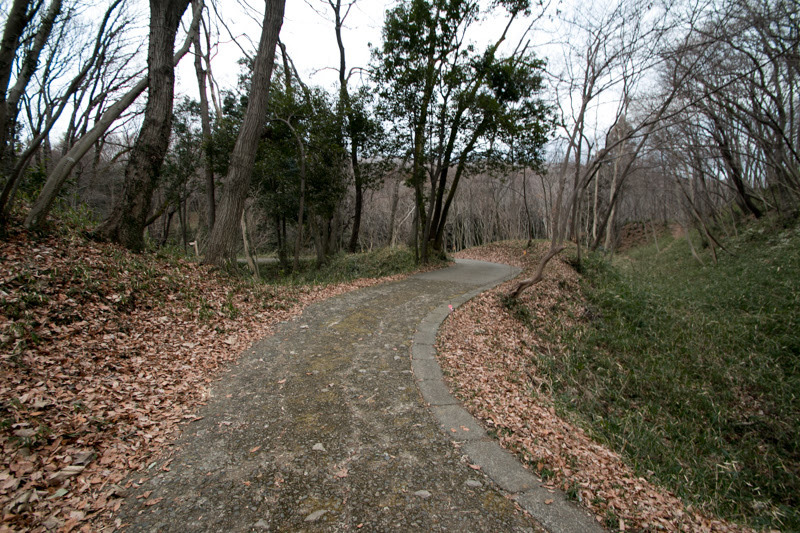 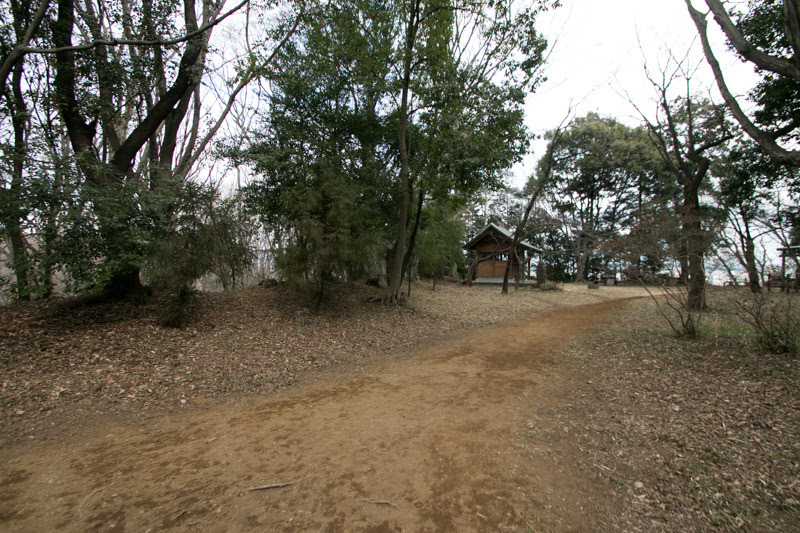 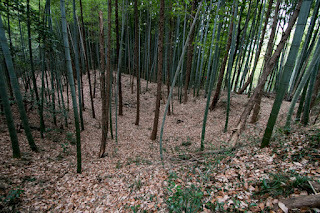 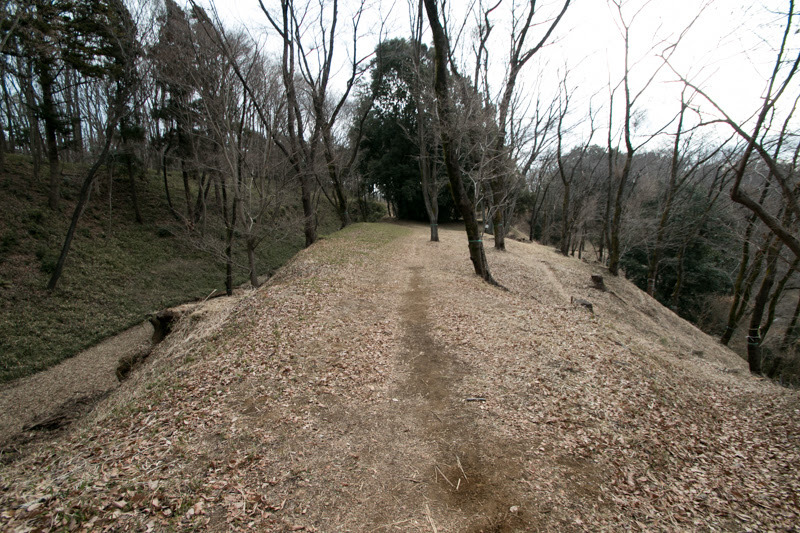 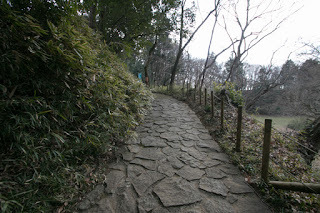 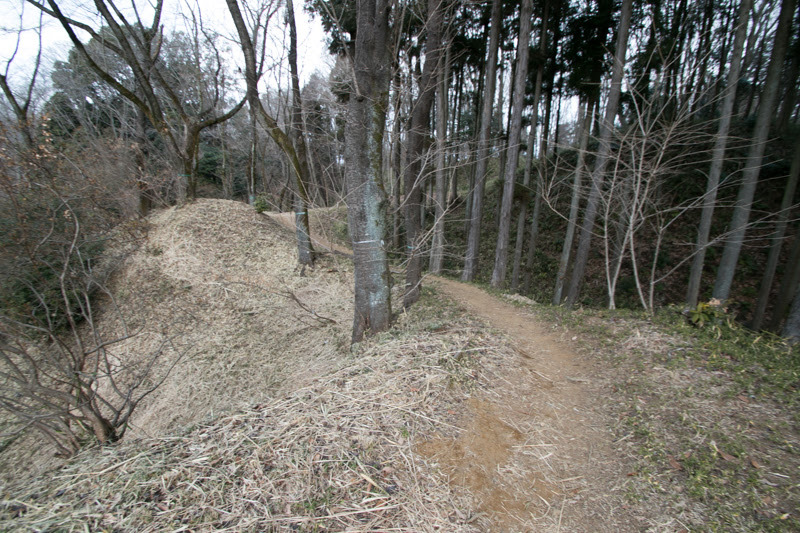 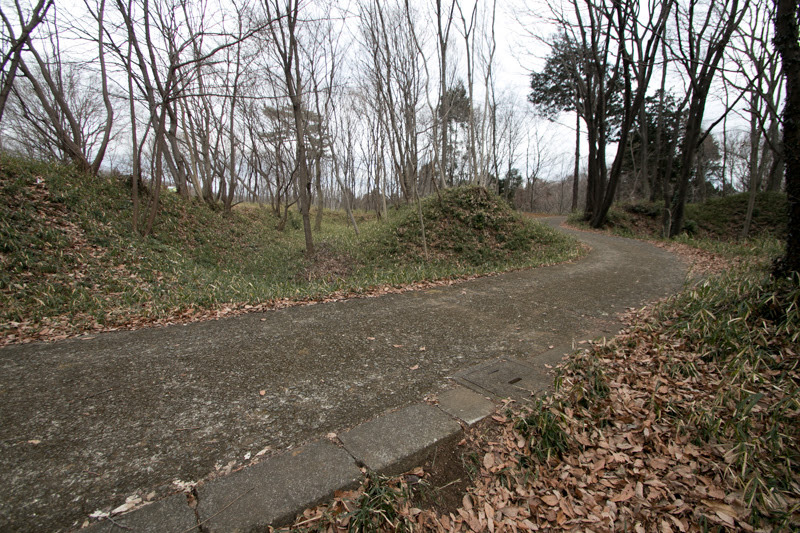 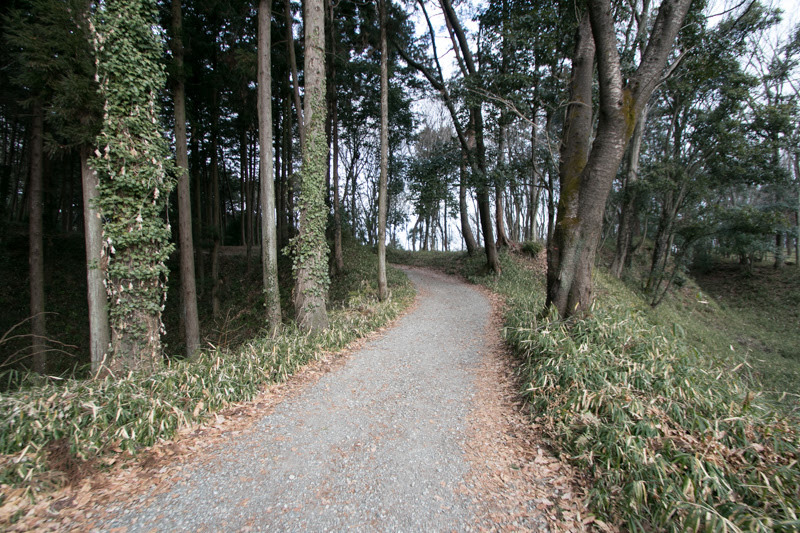 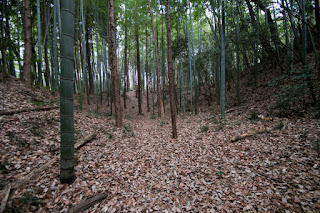 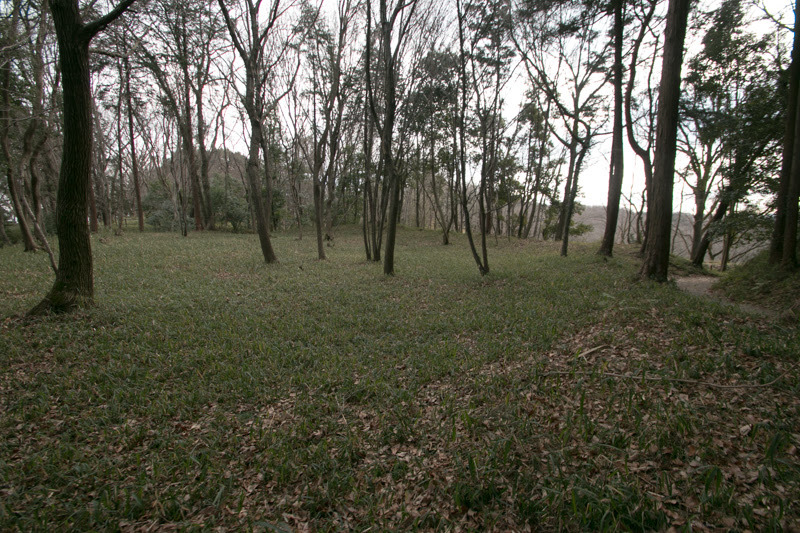 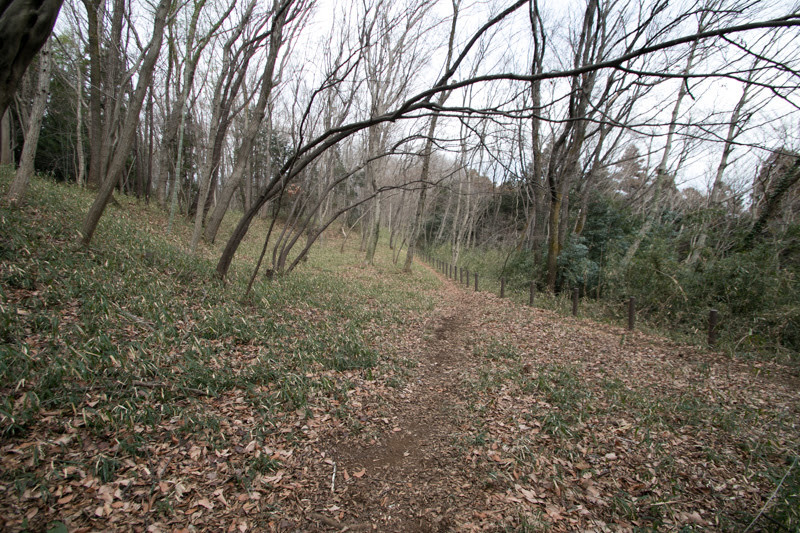 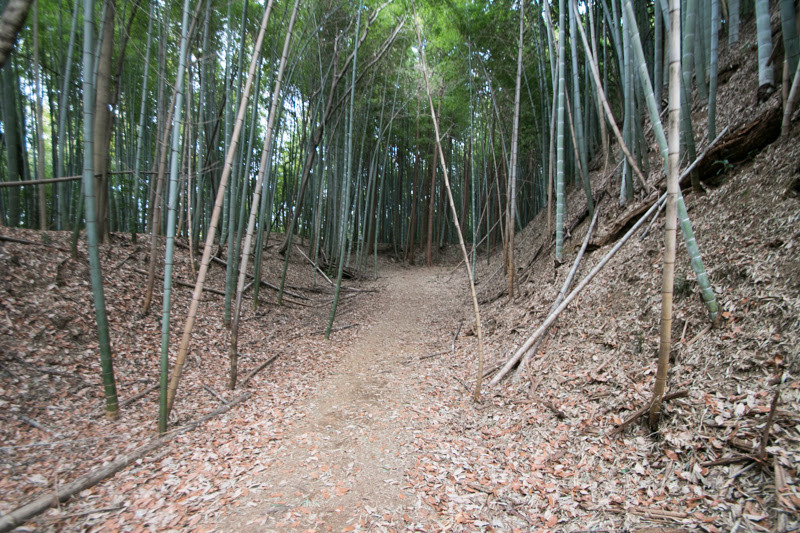 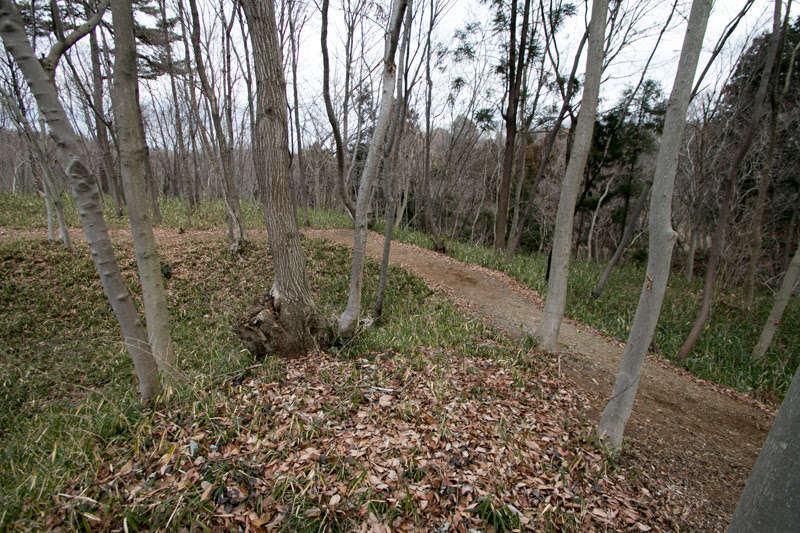 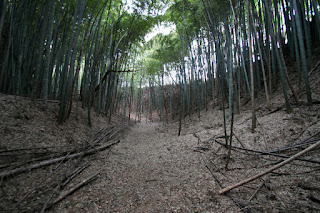 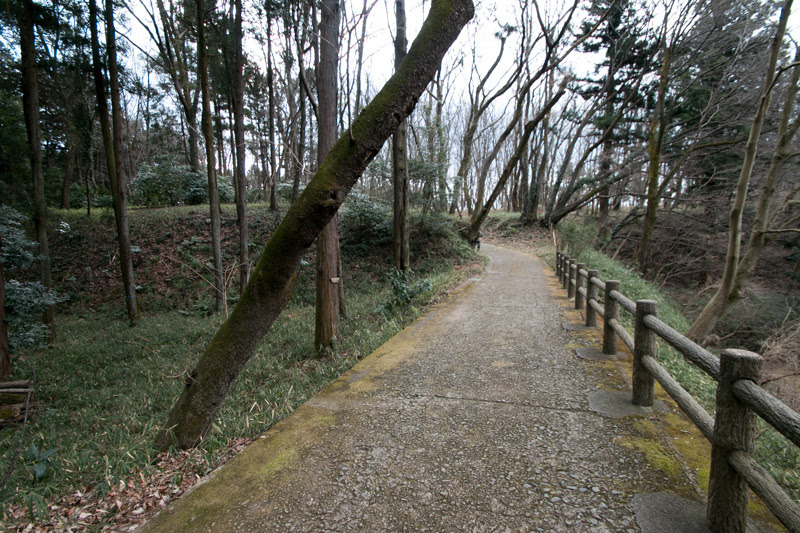 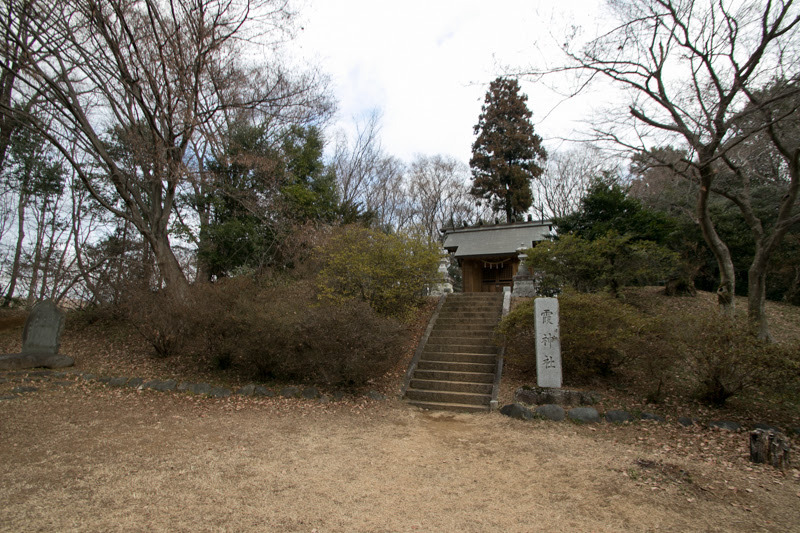 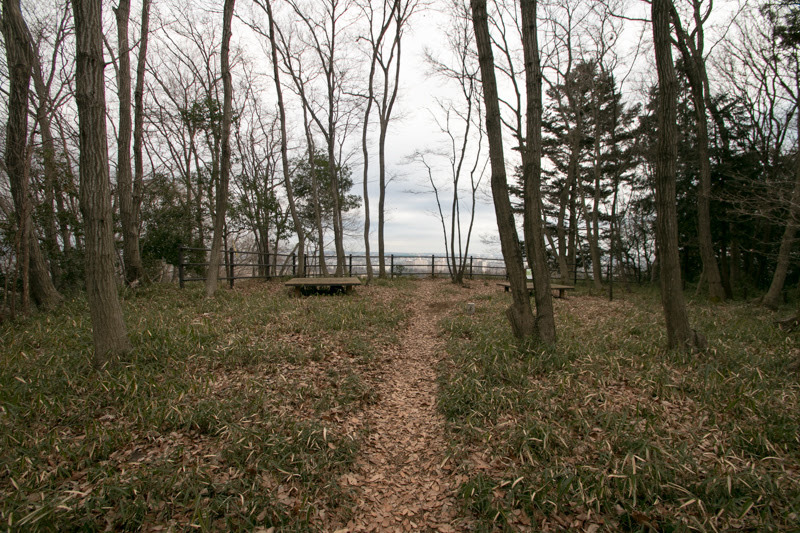 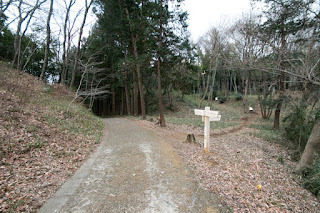 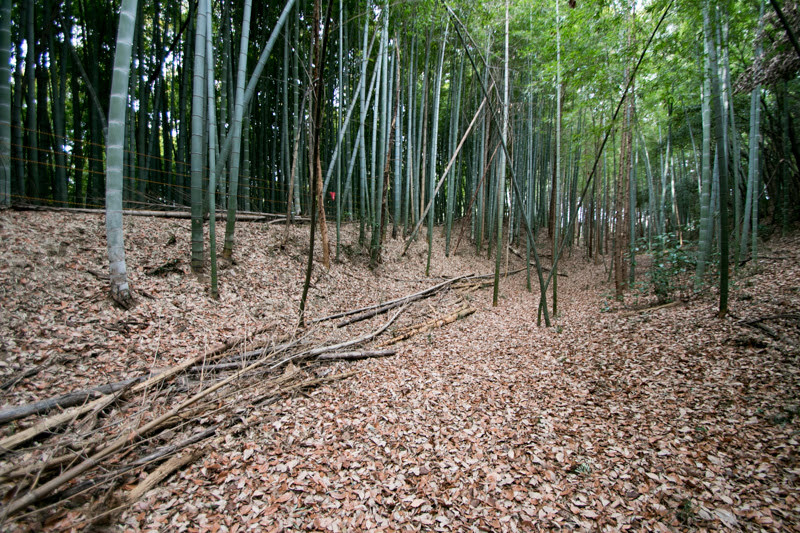 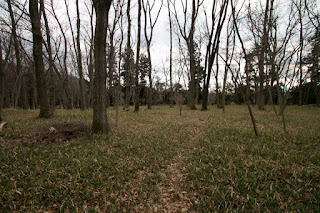 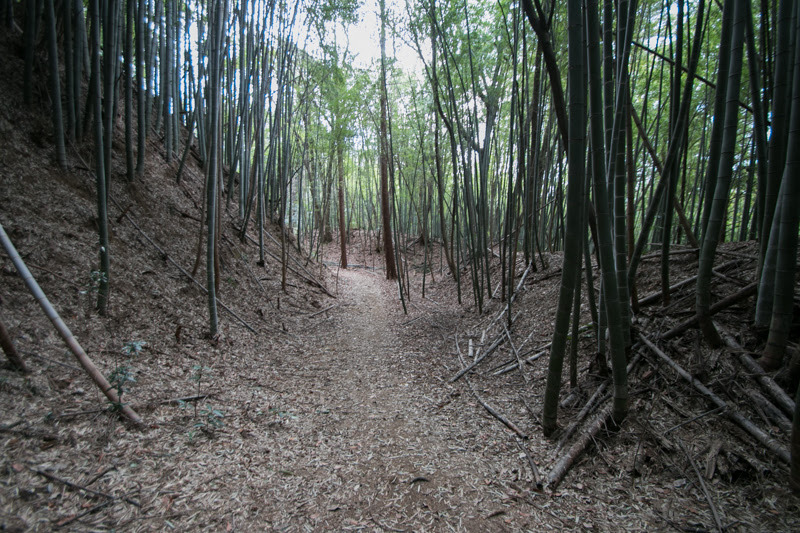 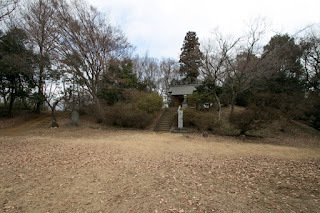 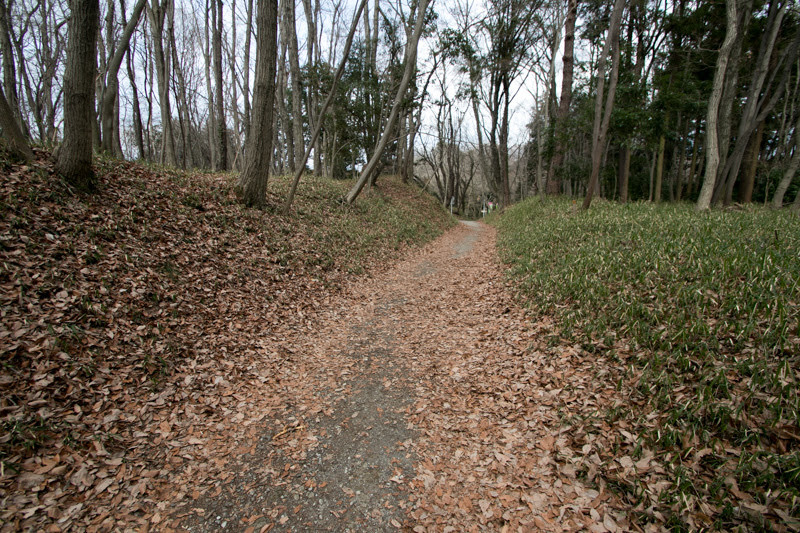 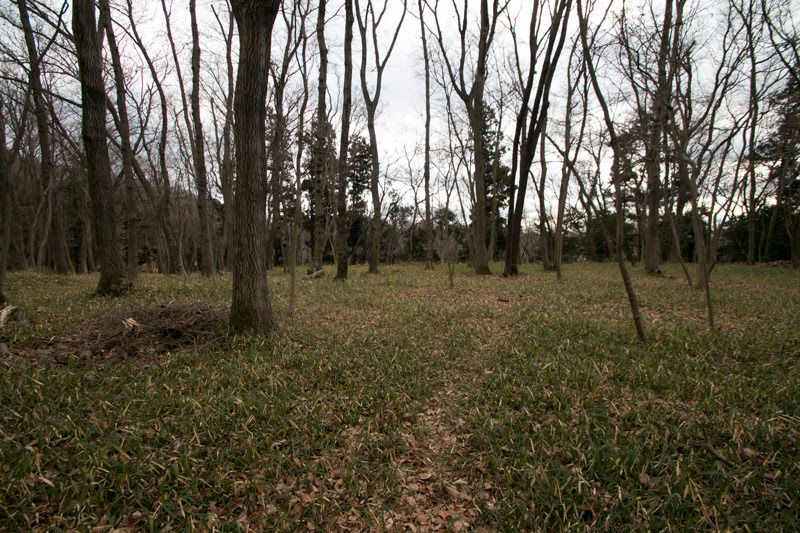 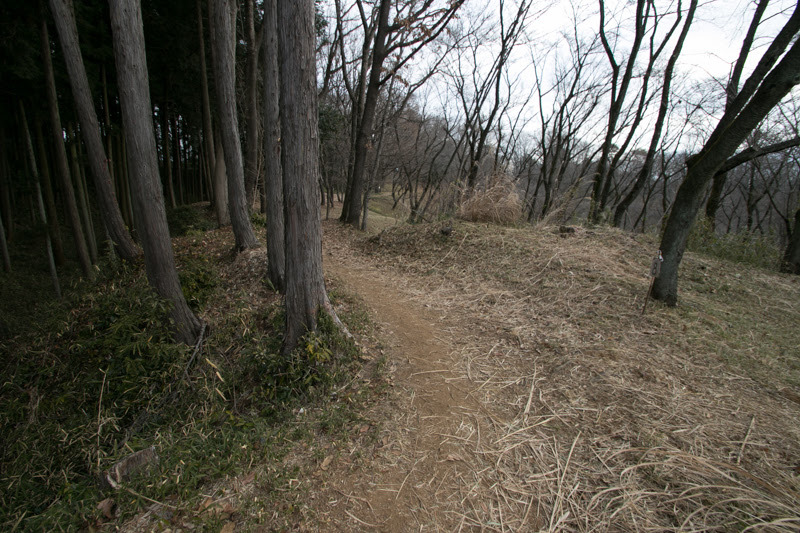 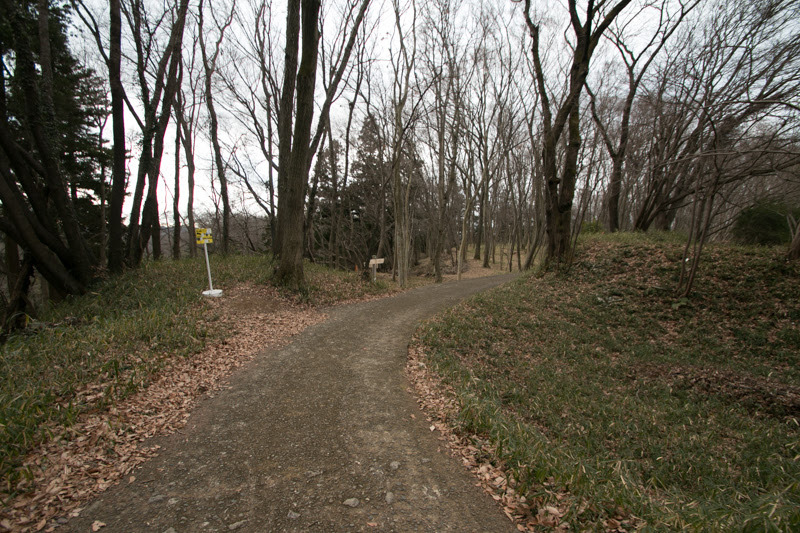 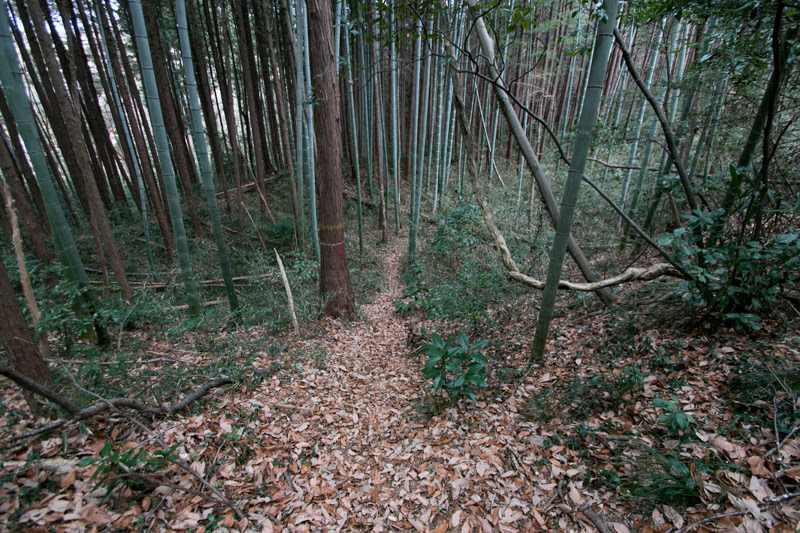 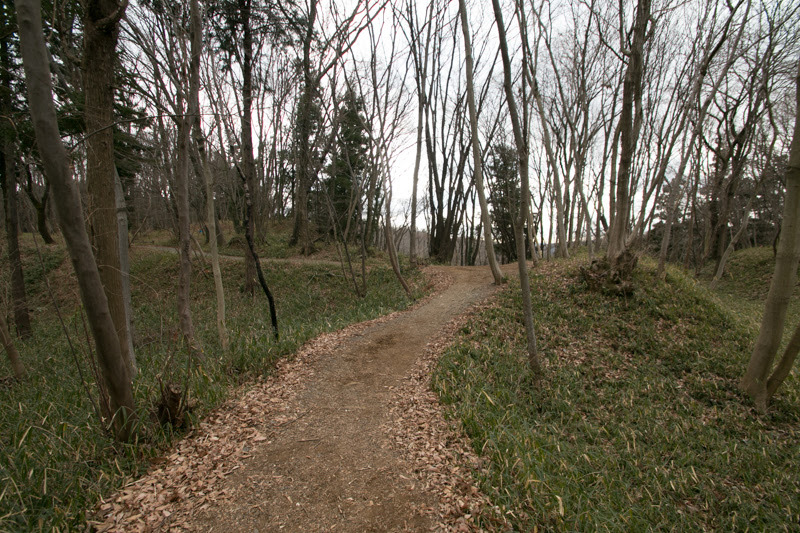 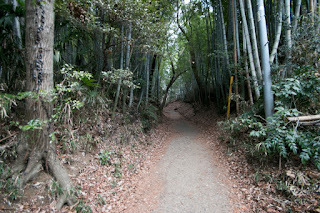 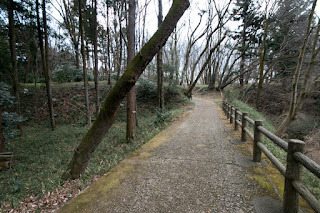 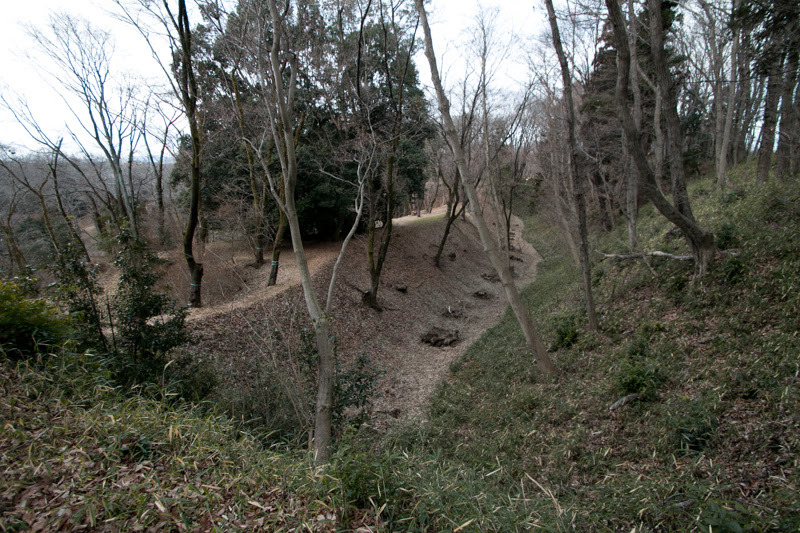 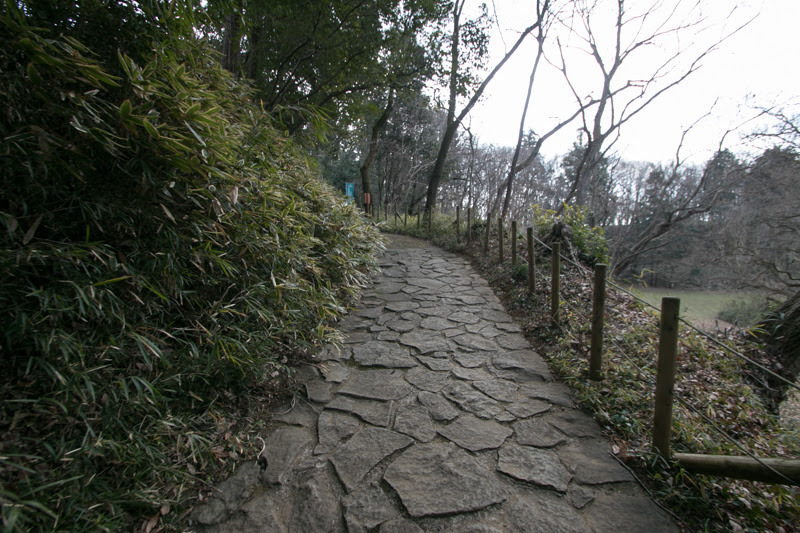 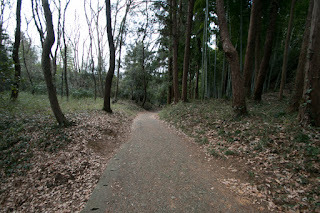 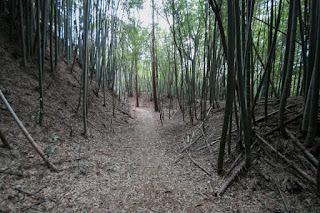 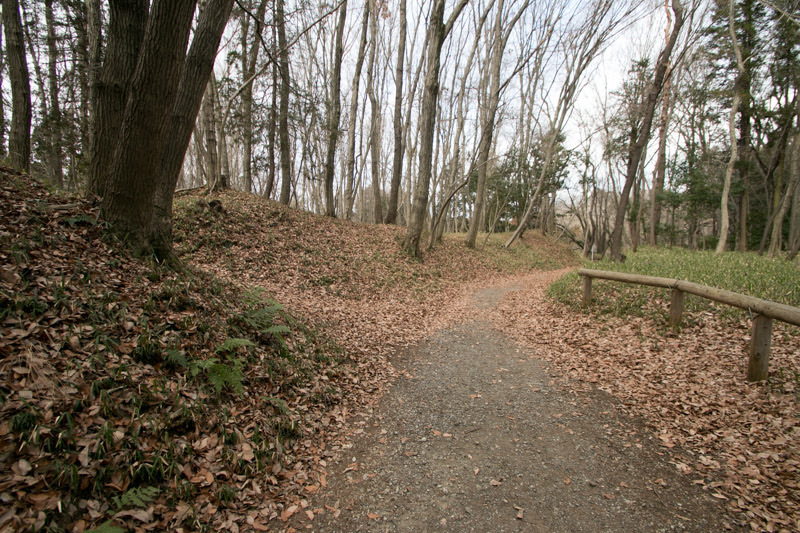 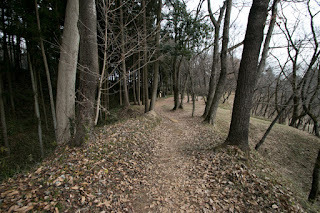 After Takiyama castle, Shingen also encircled Odawara castle about a week menacingly but returned to Kai country. 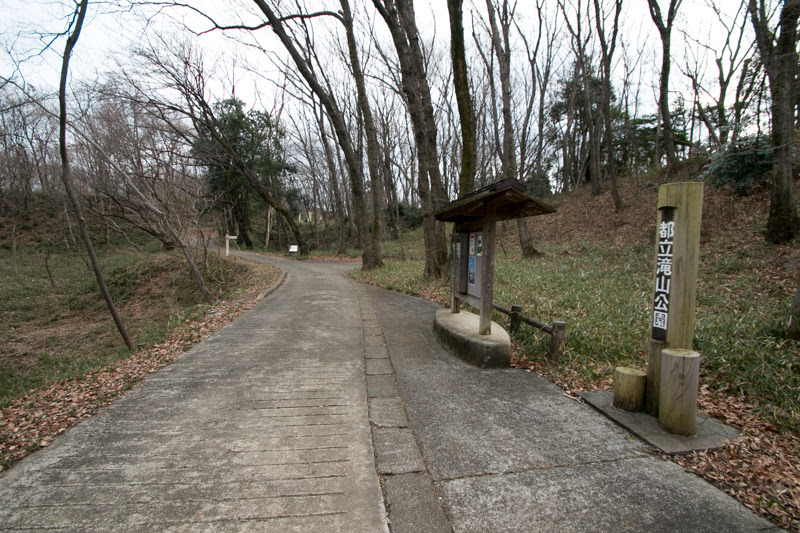 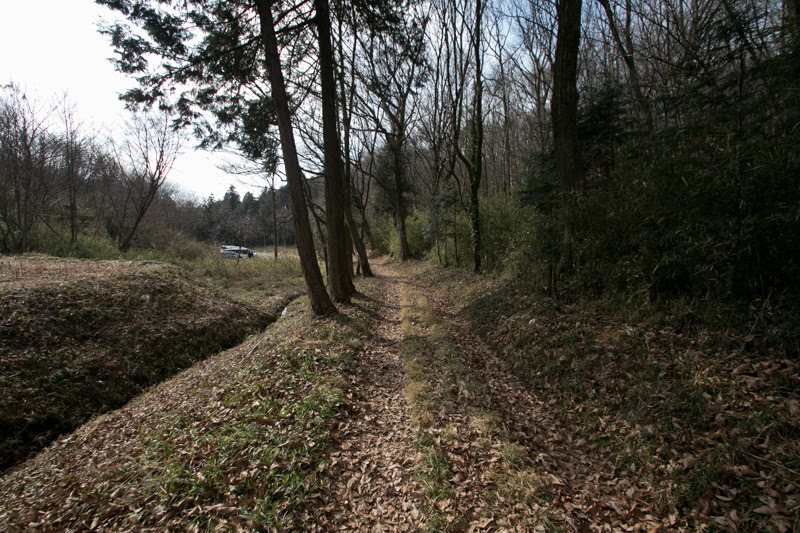 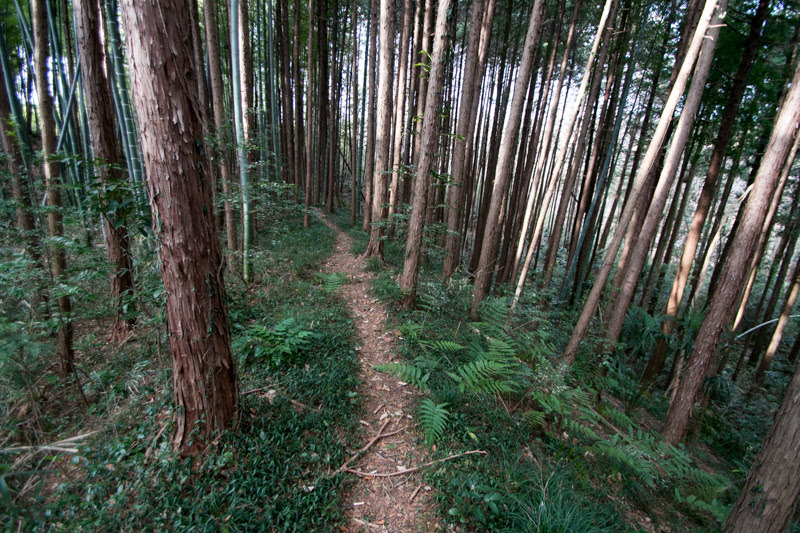 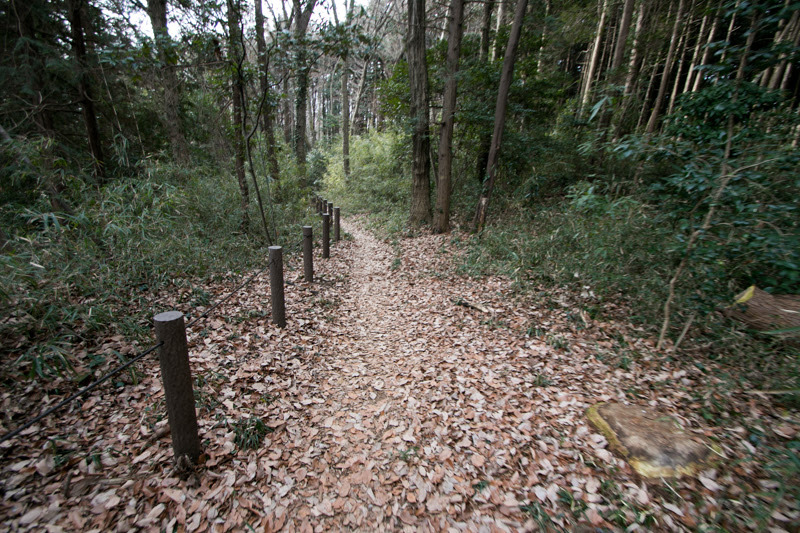 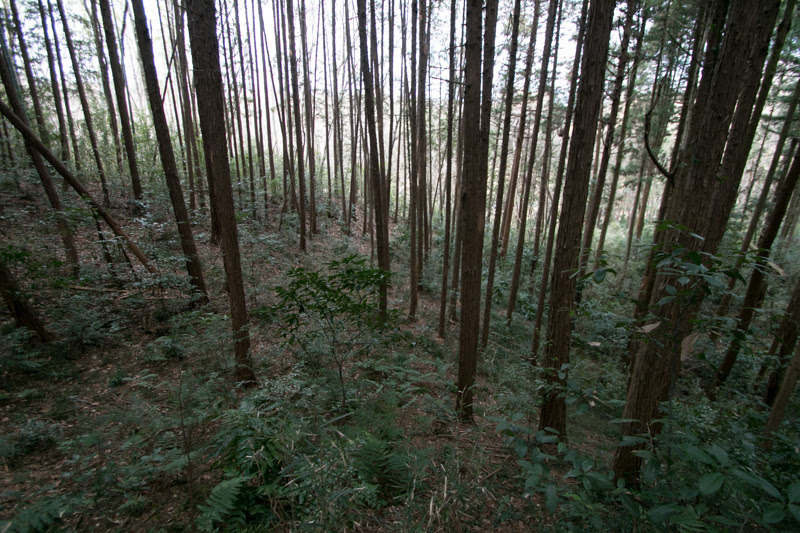 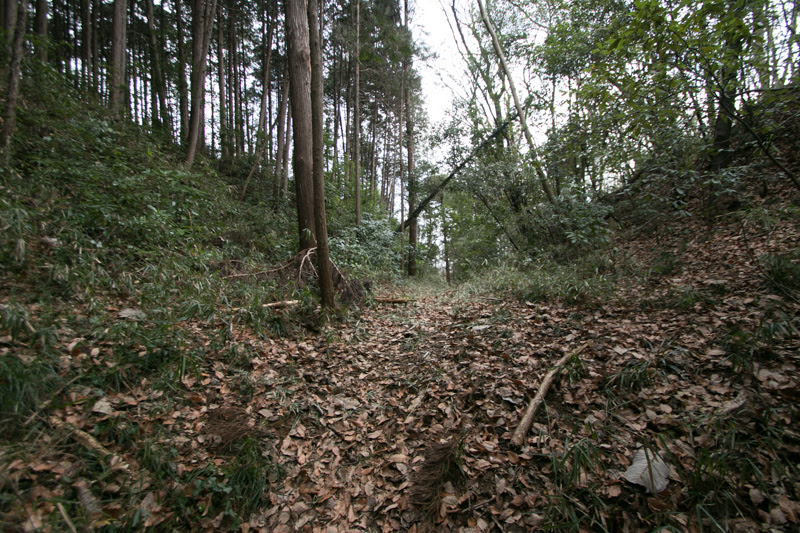 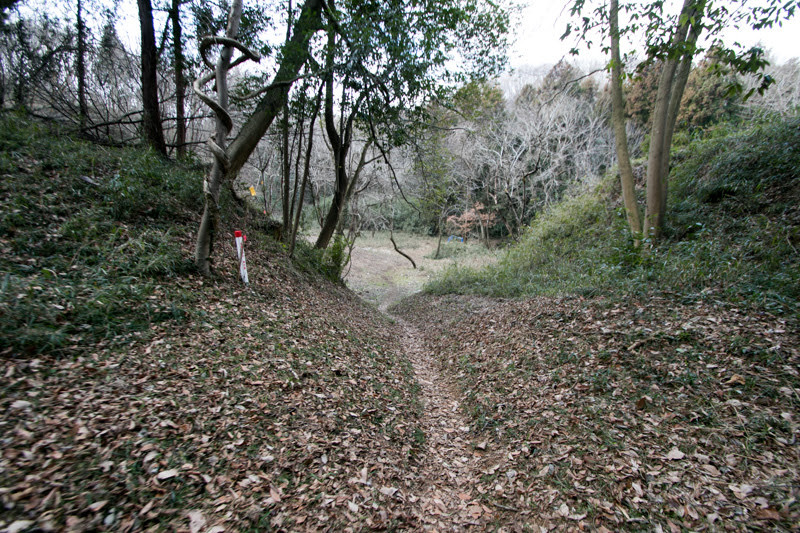 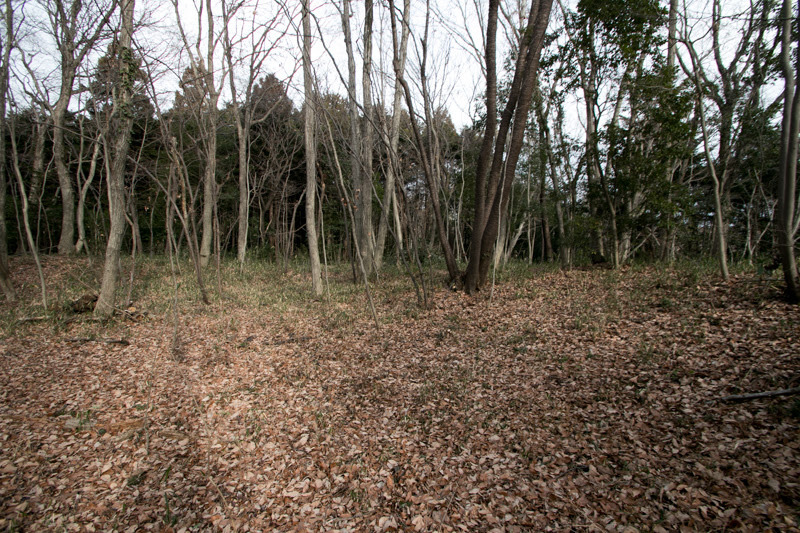 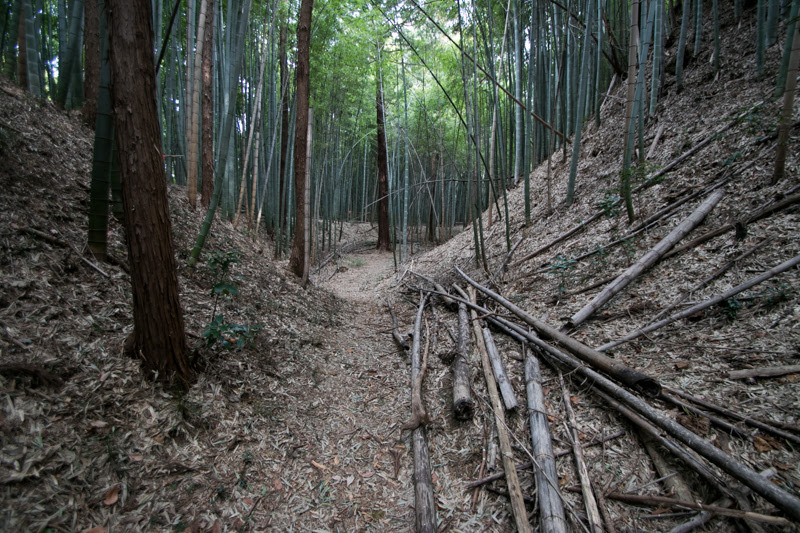 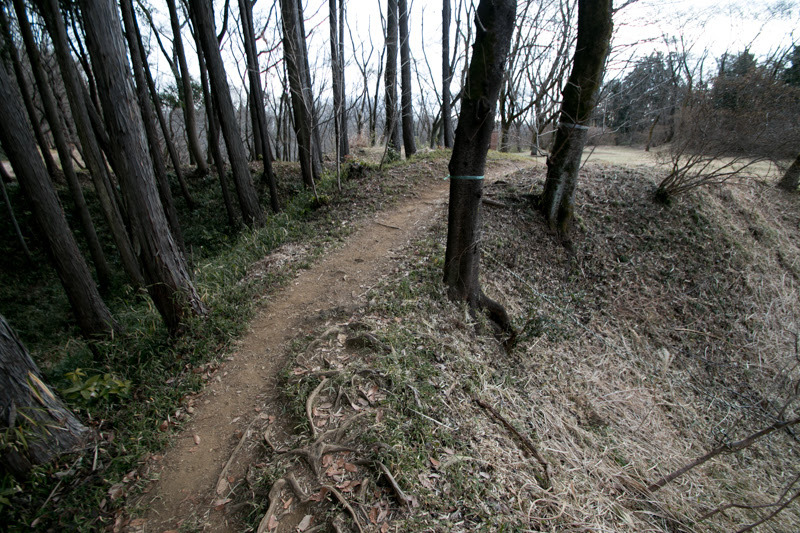 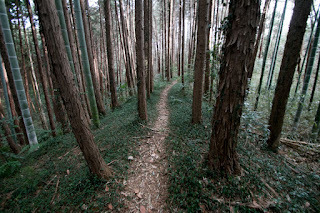 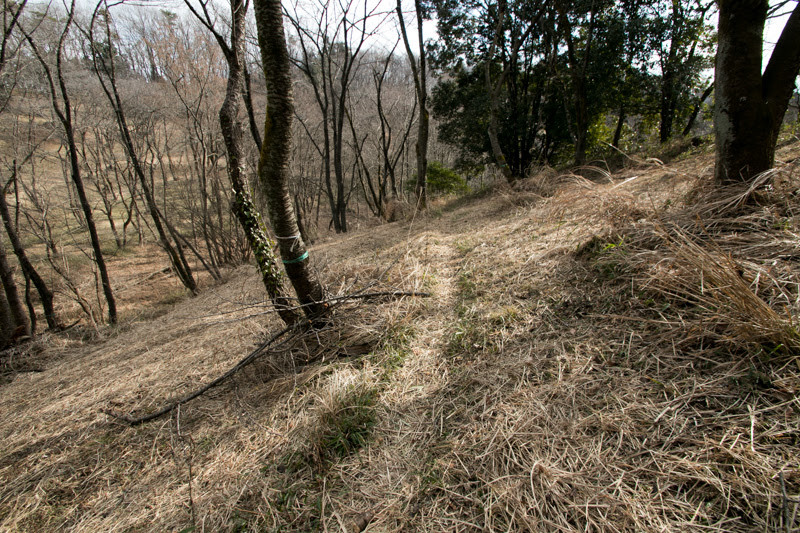 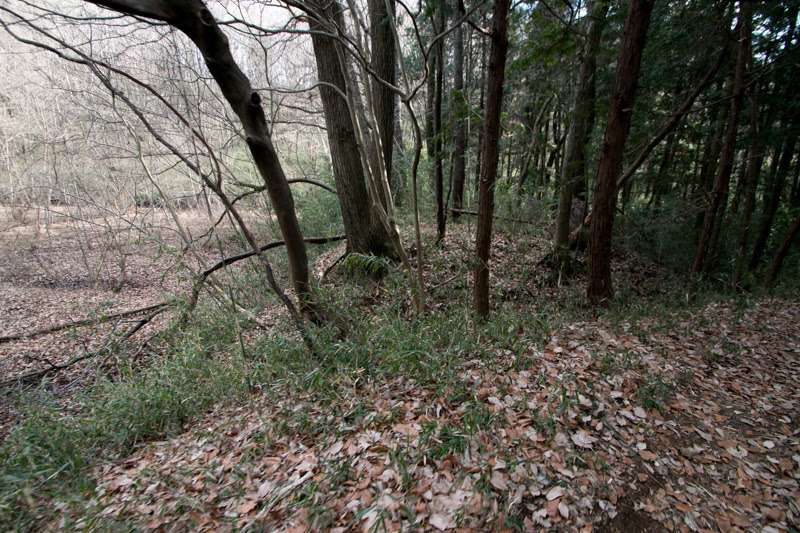 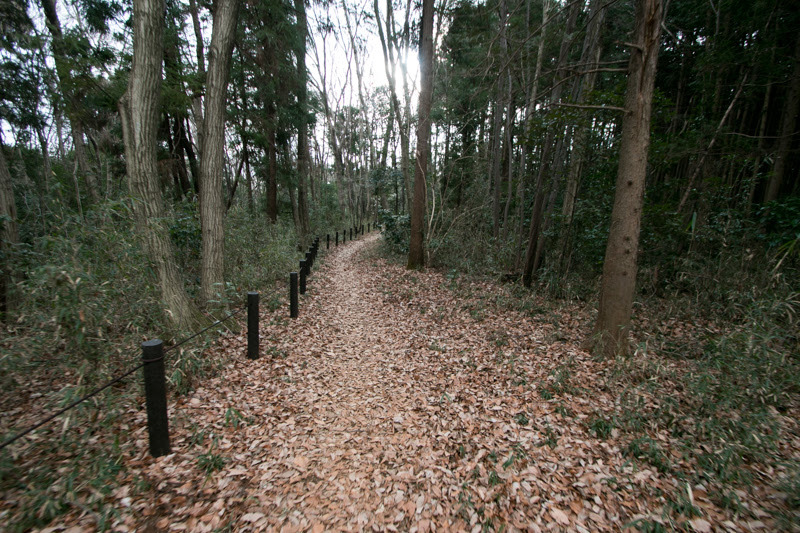 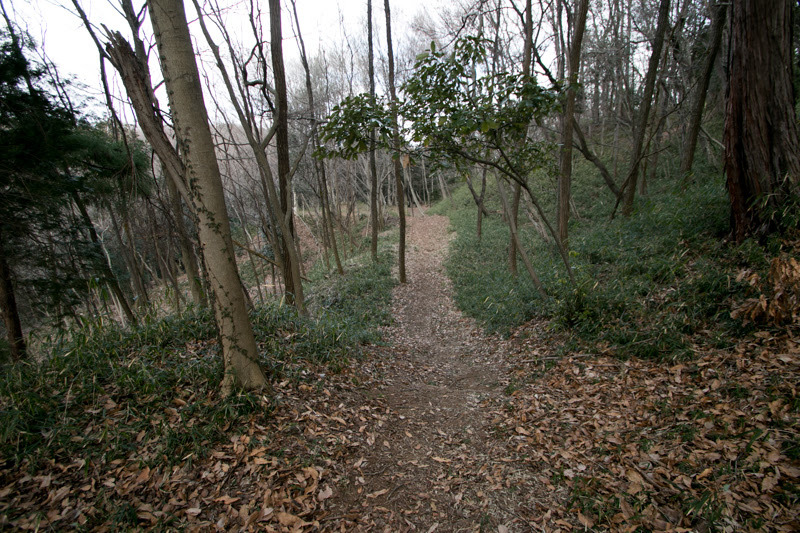 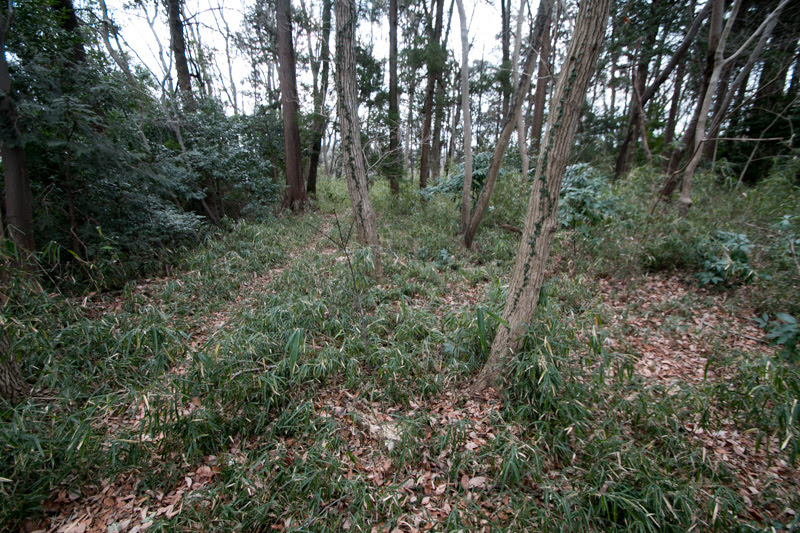 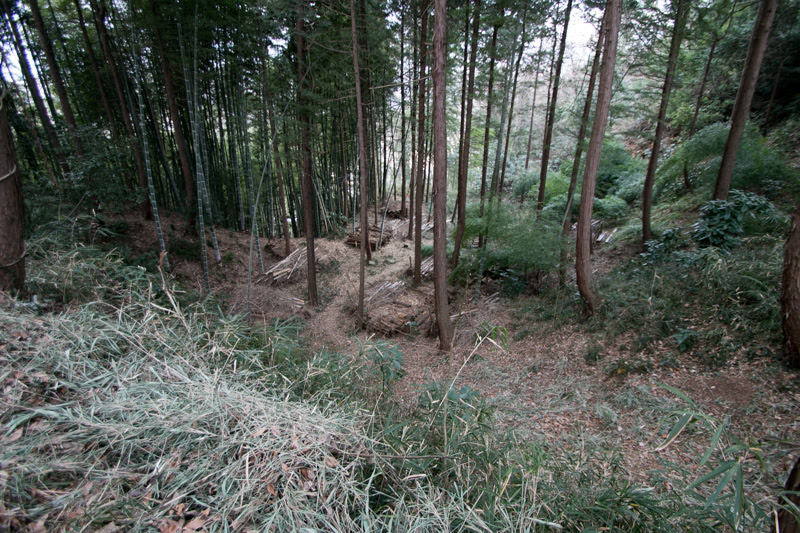 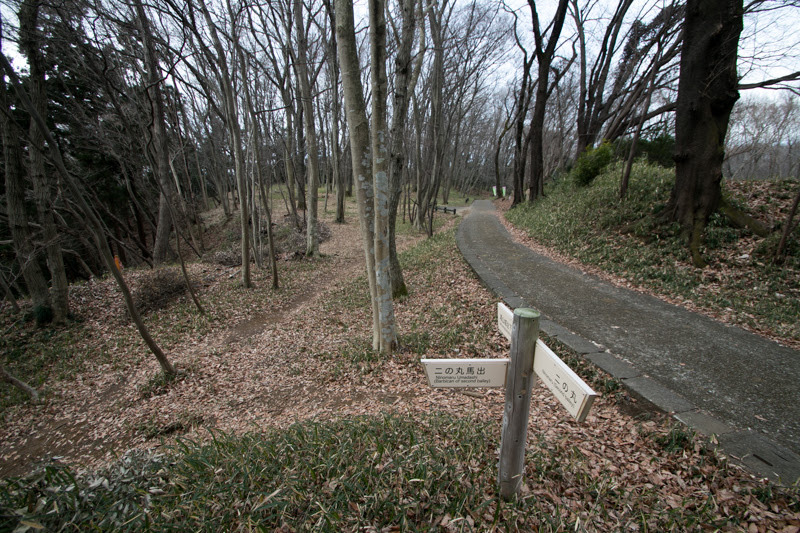 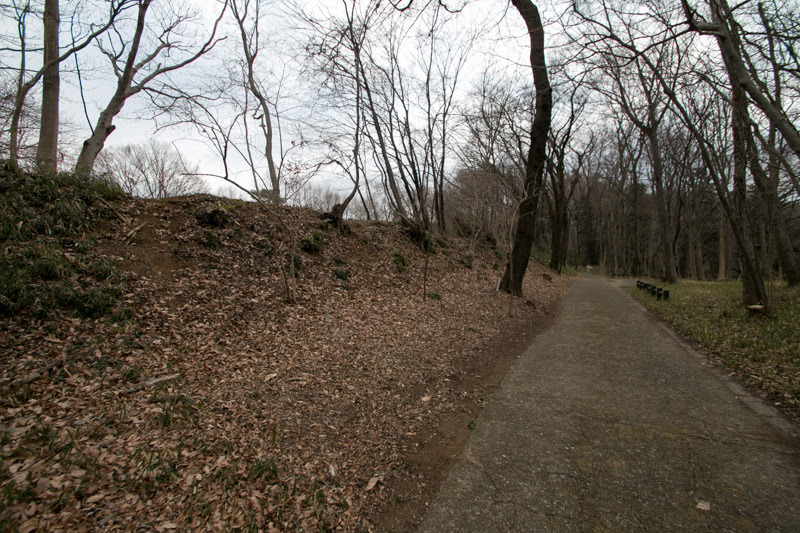 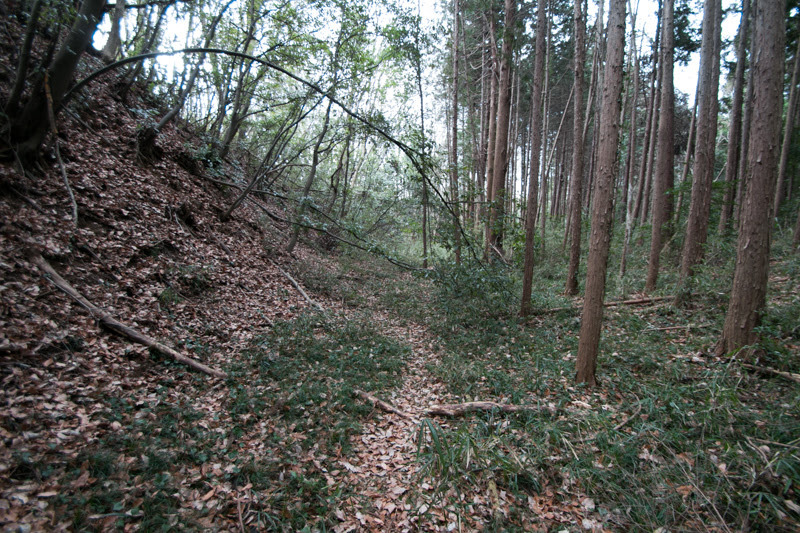 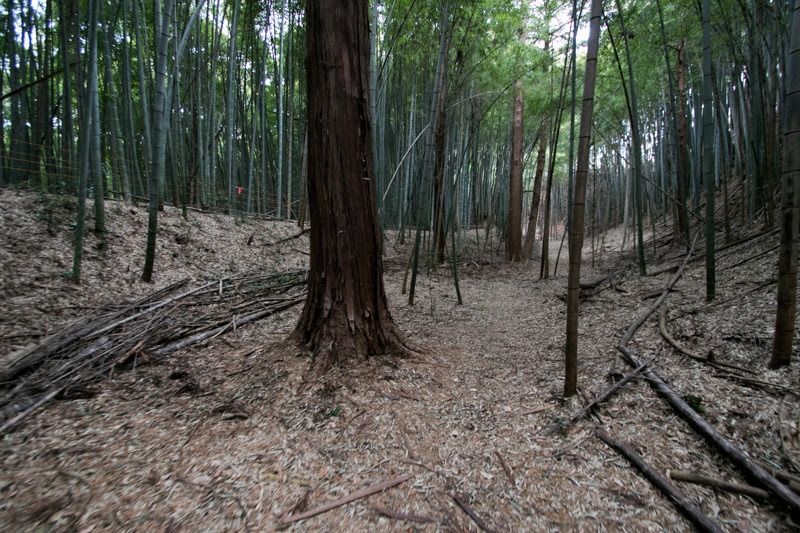 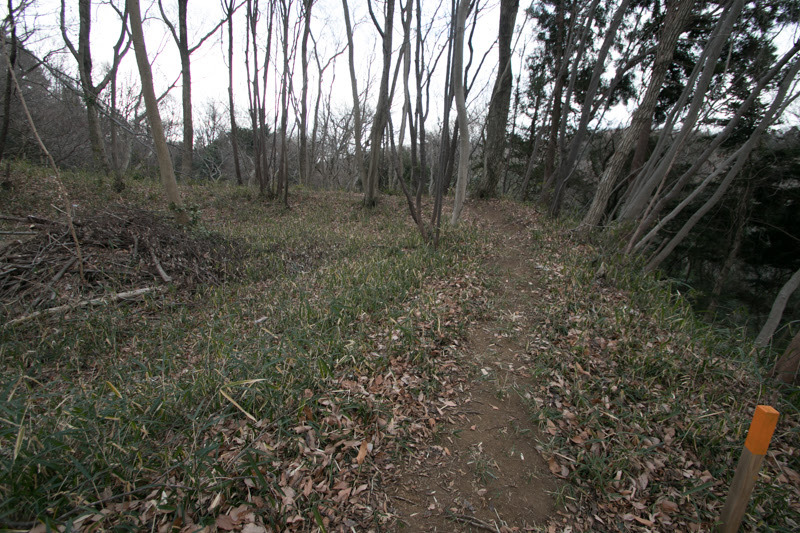 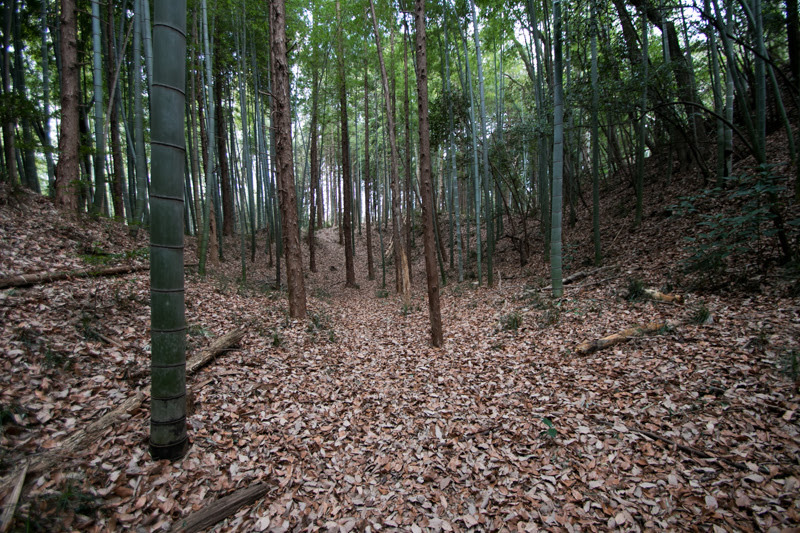 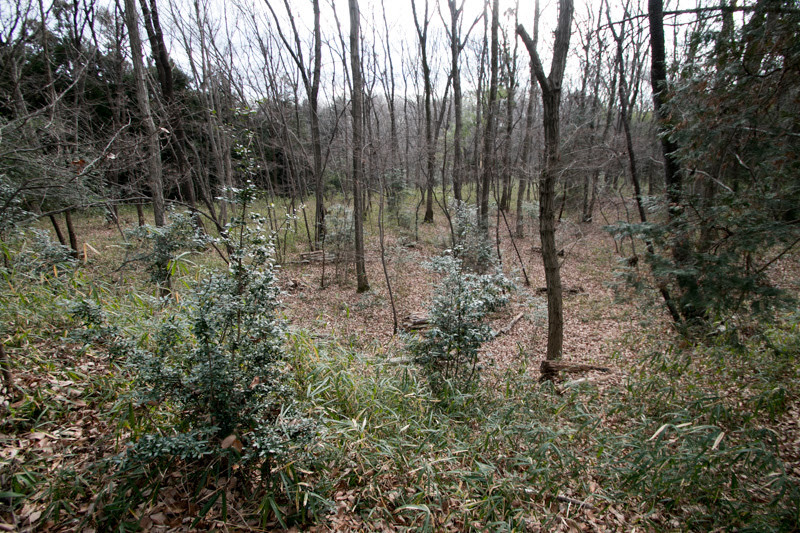 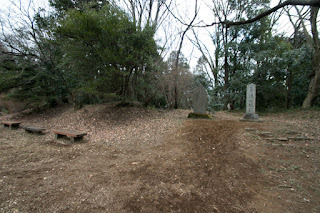 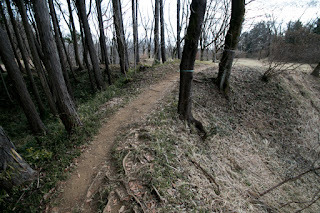 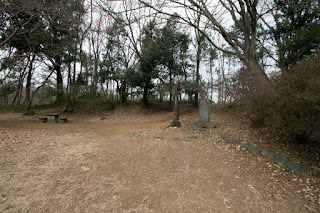 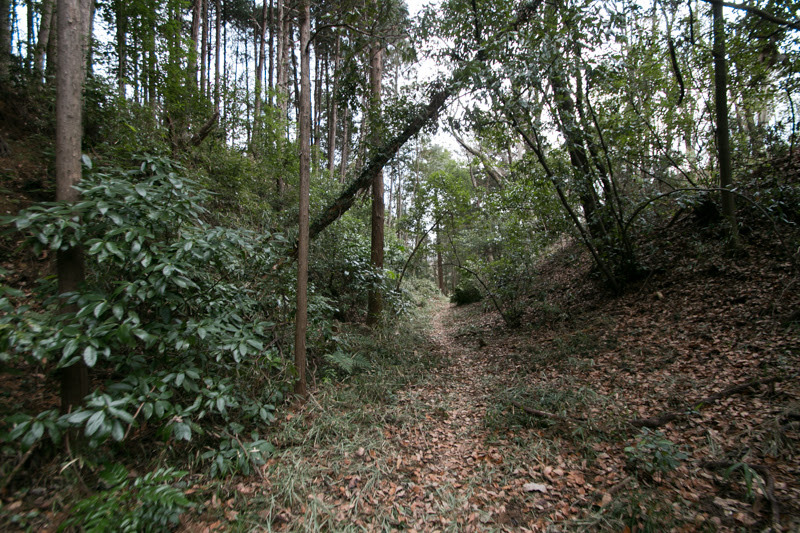 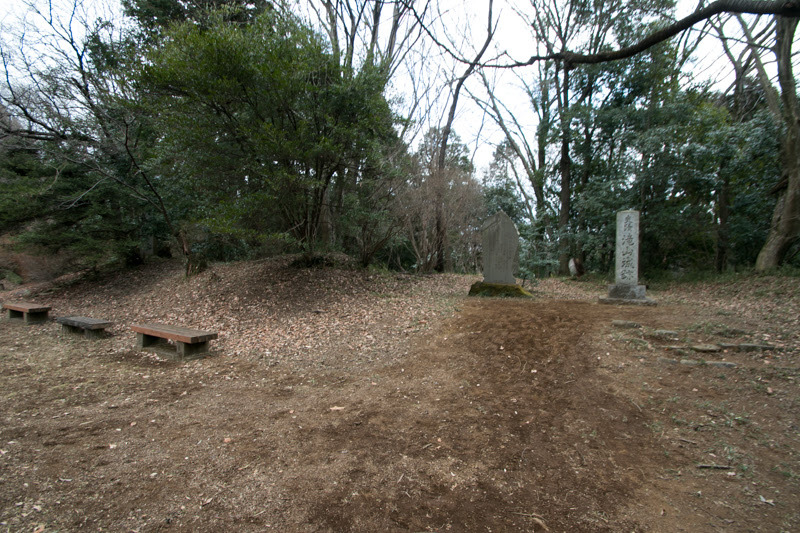 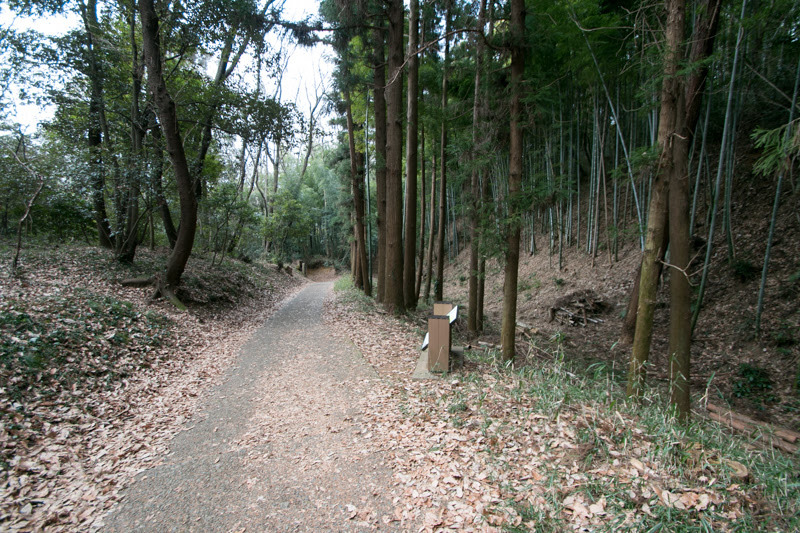 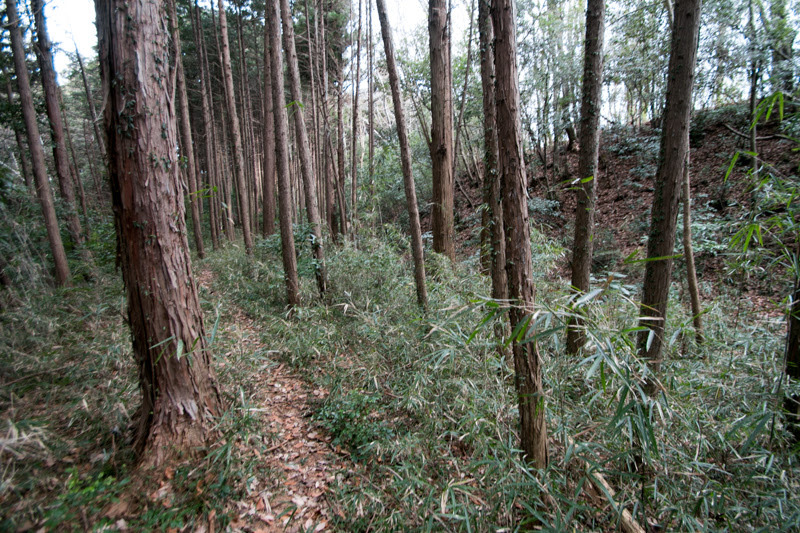 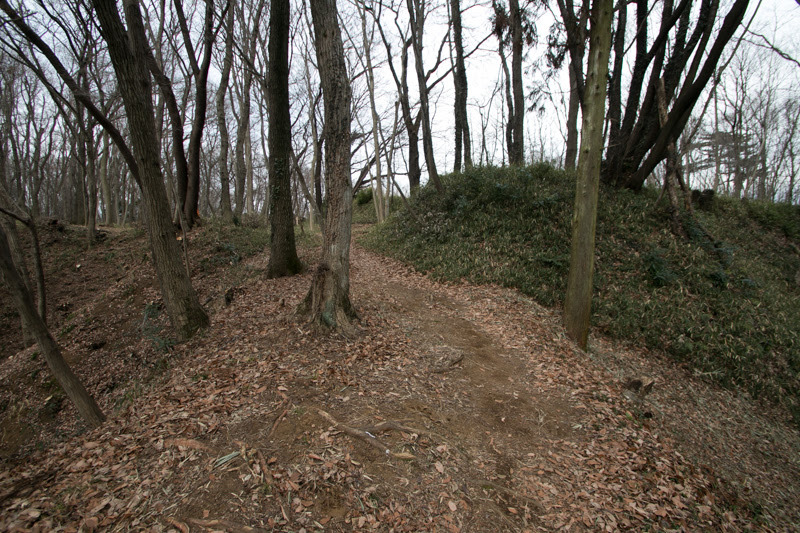 Ujiteru and other Hojo commanders chased retreating Takeda army at Mimasutoge path at the north of Kanagawa prefecture, but due to the counterattack of Takeda clan they caught severe damage and let them escape. 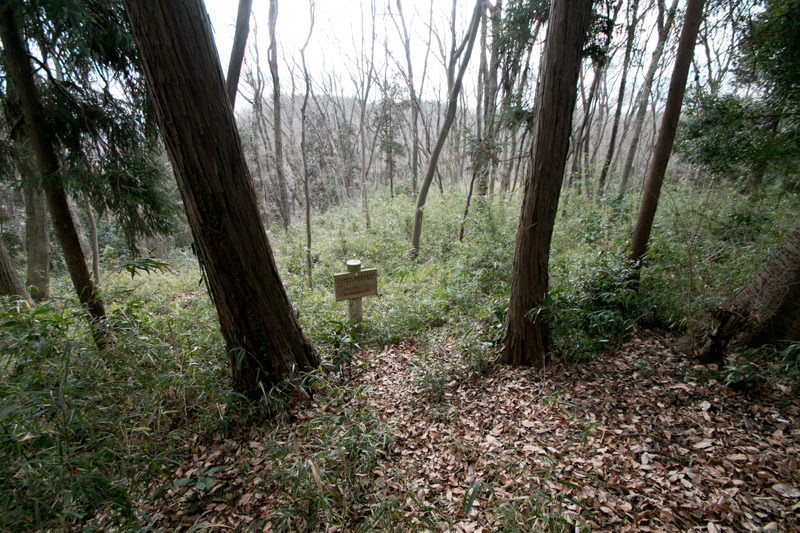 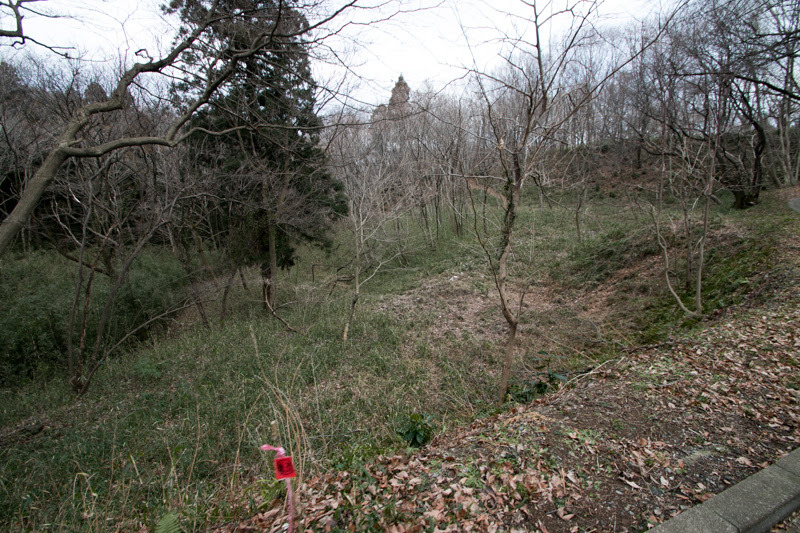 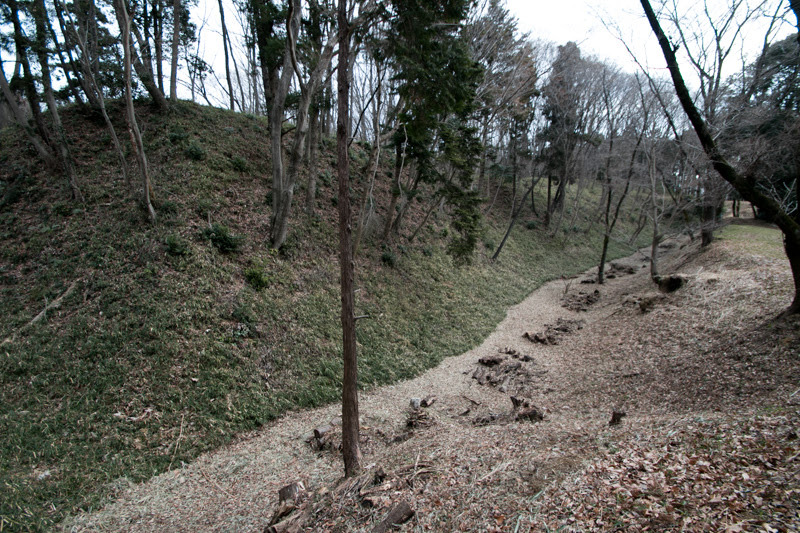 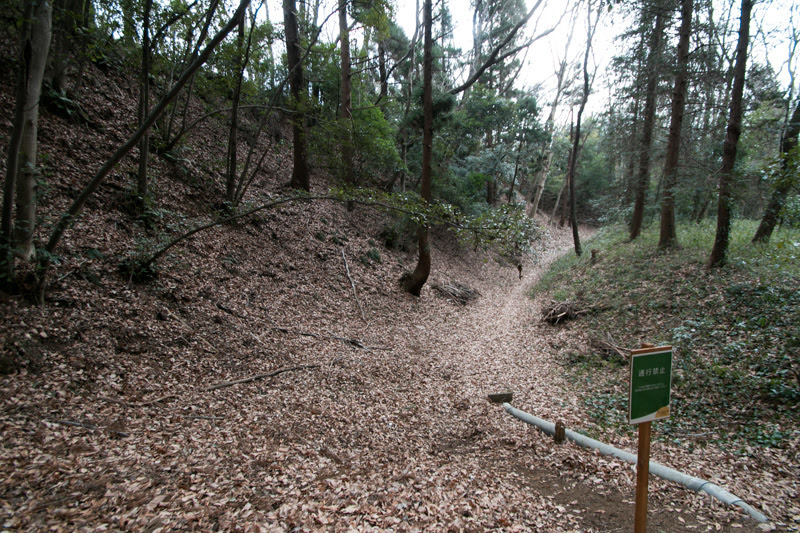 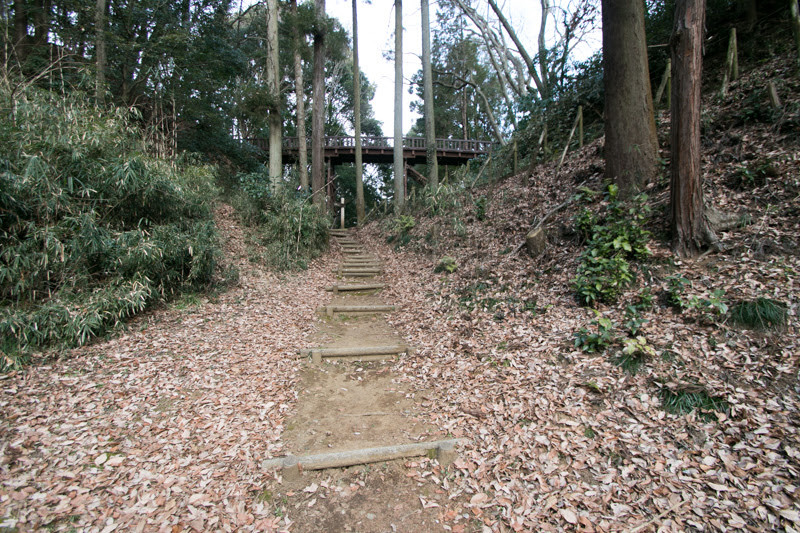 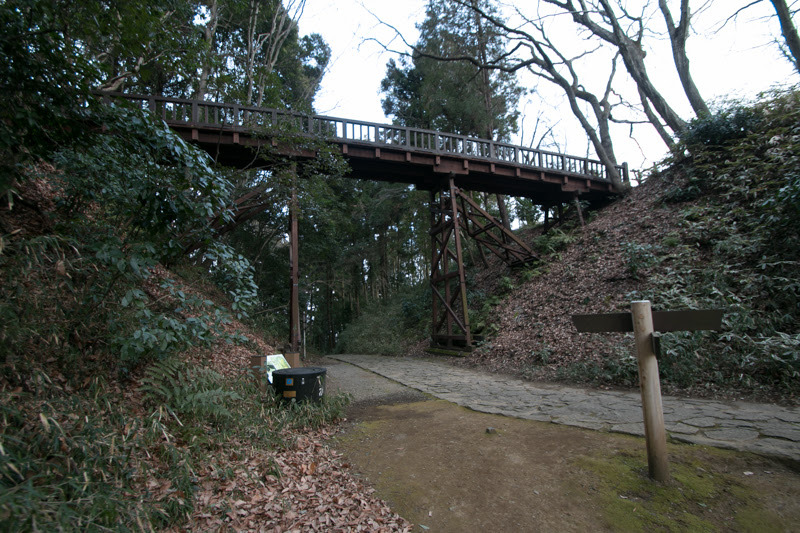 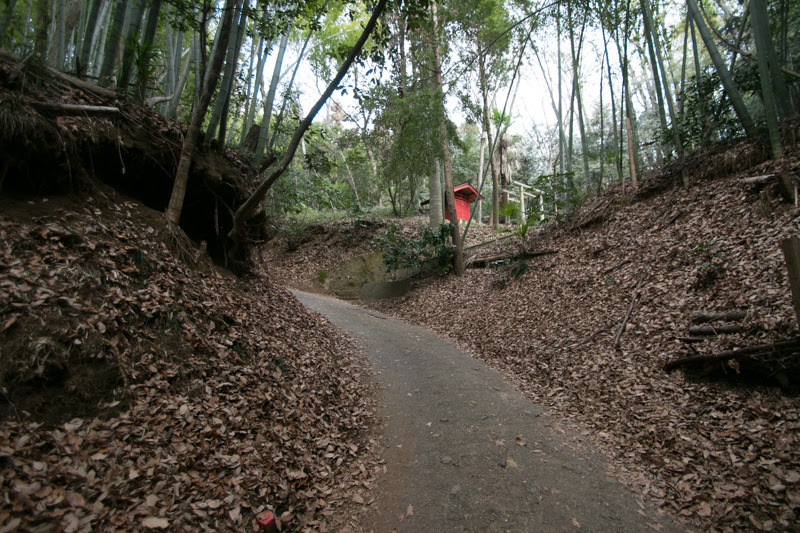 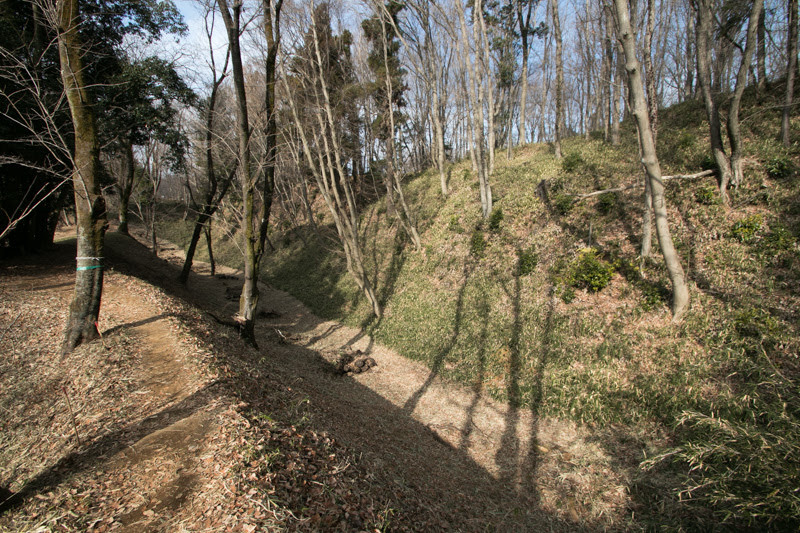 During this battle Takiyama castle showed the effectiveness of its facilities but also clarified its defect. 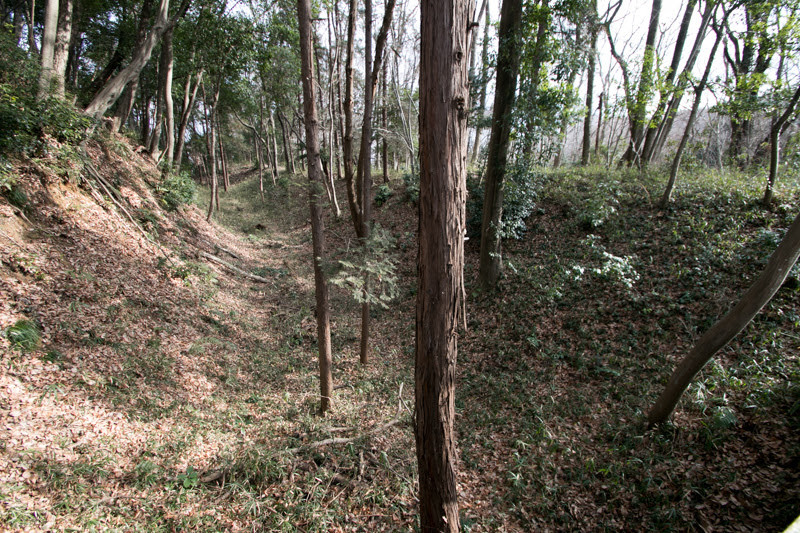 As central areas were old fashioned, substantial defence line was only one layer of external areas, and there was no space to make one more defence line. 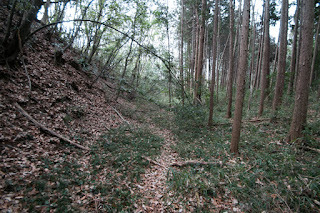 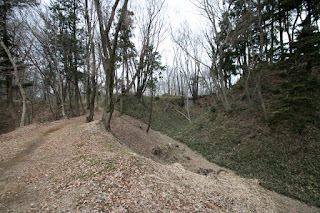 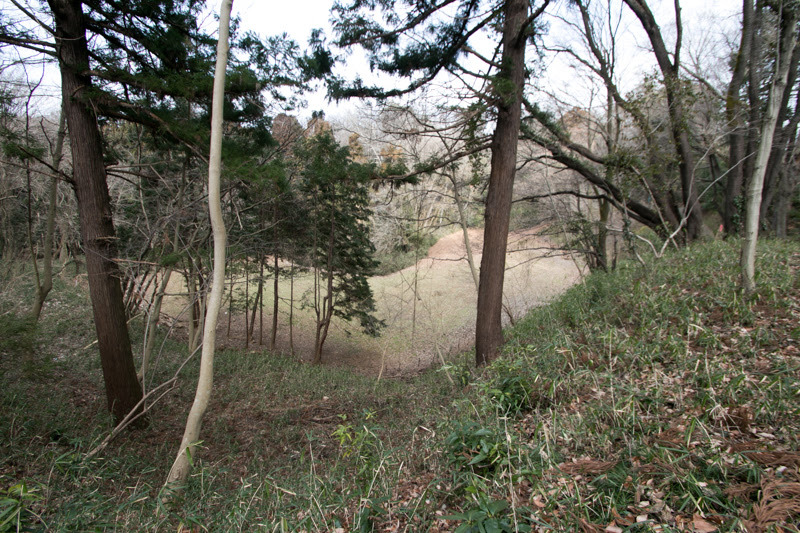 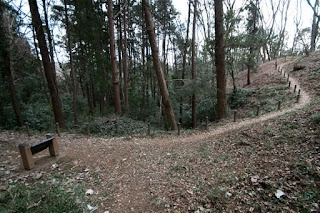 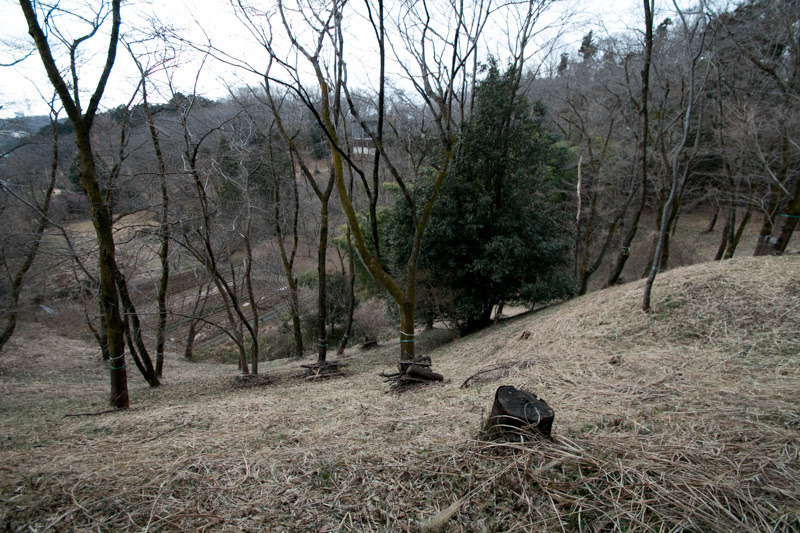 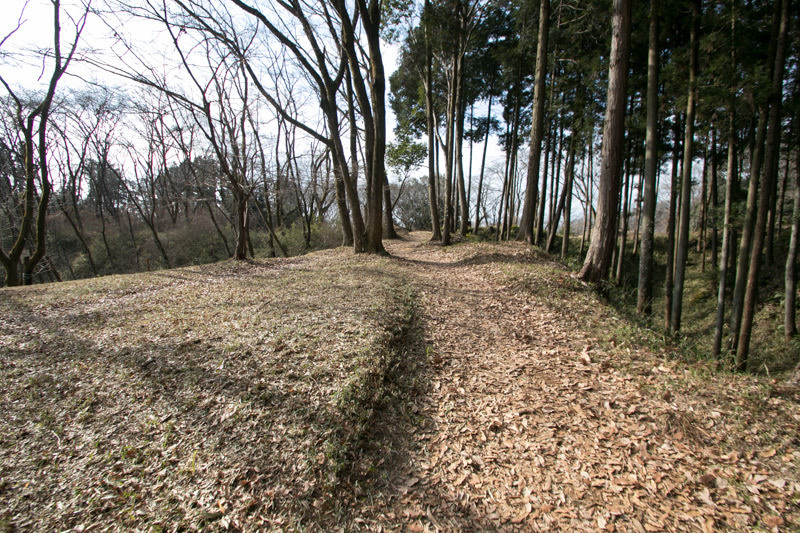 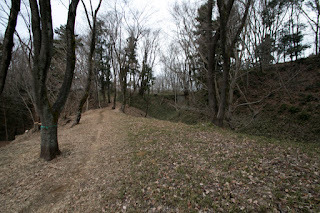 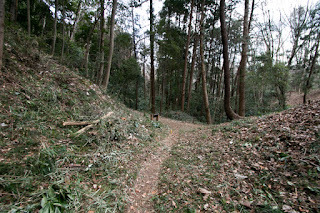 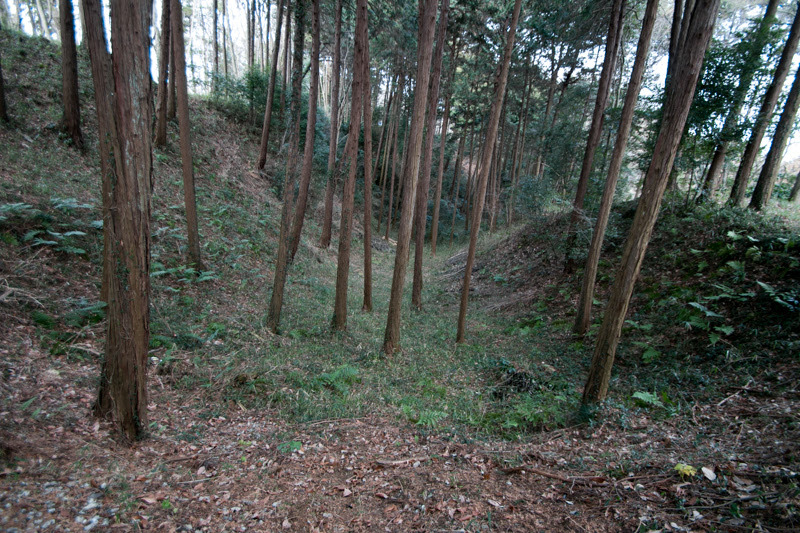 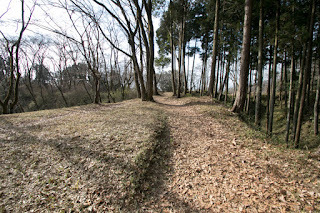 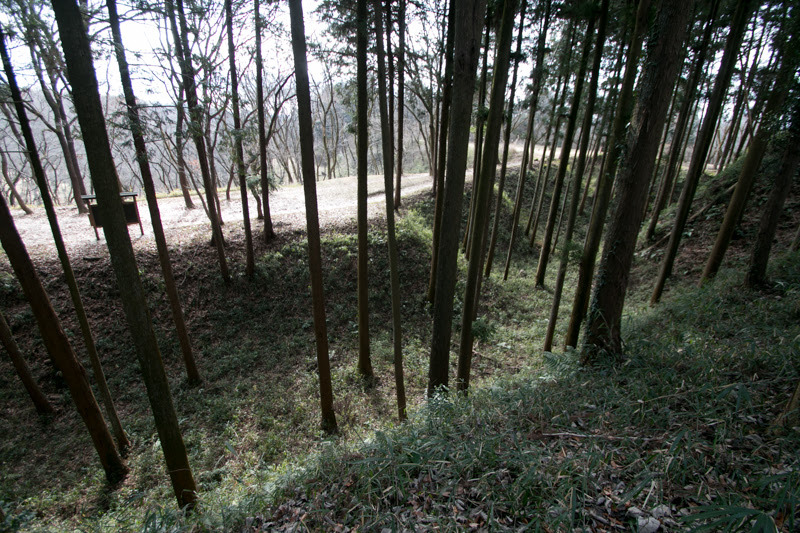 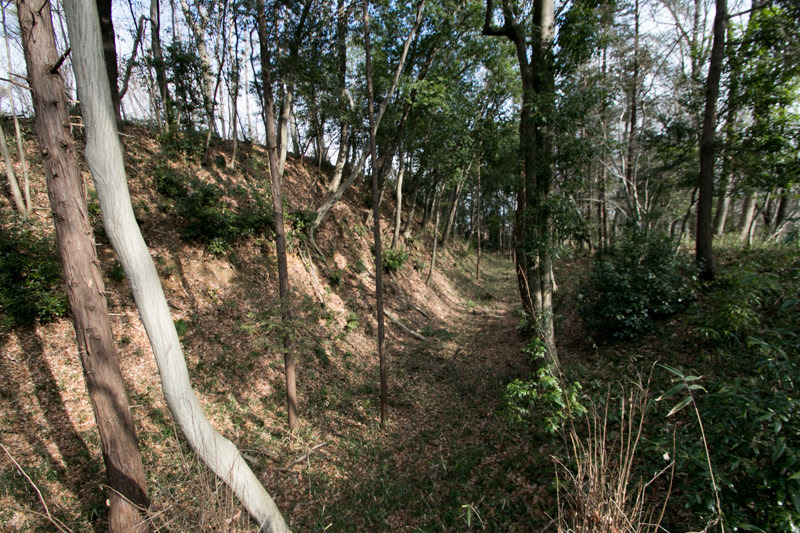 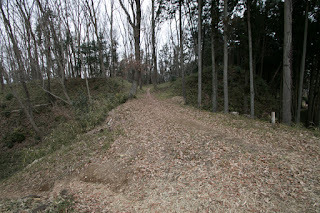 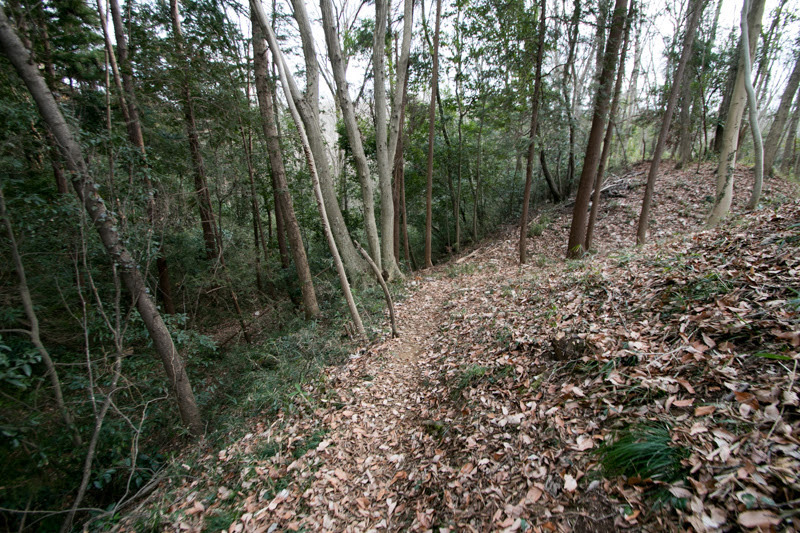 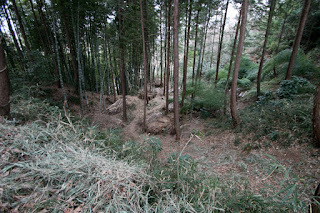 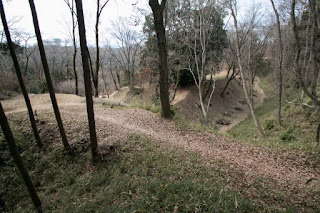 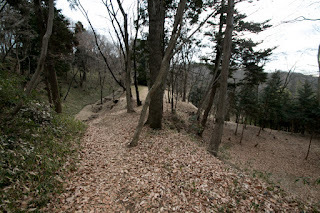 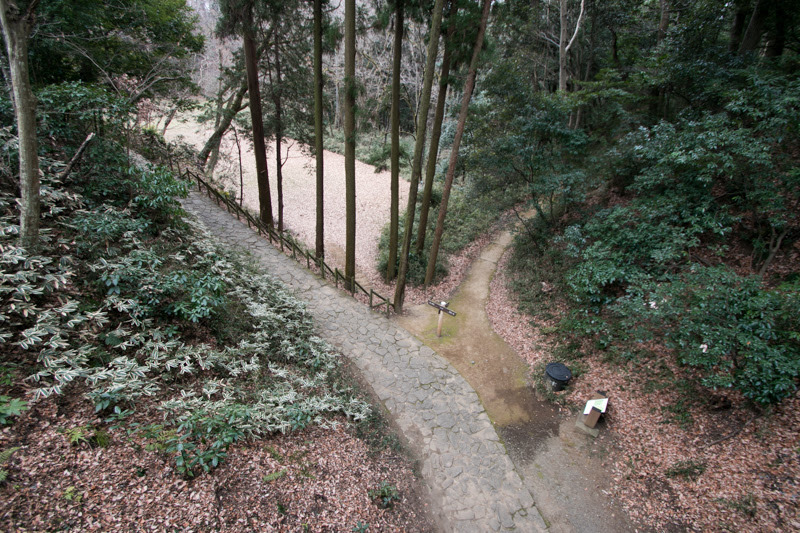 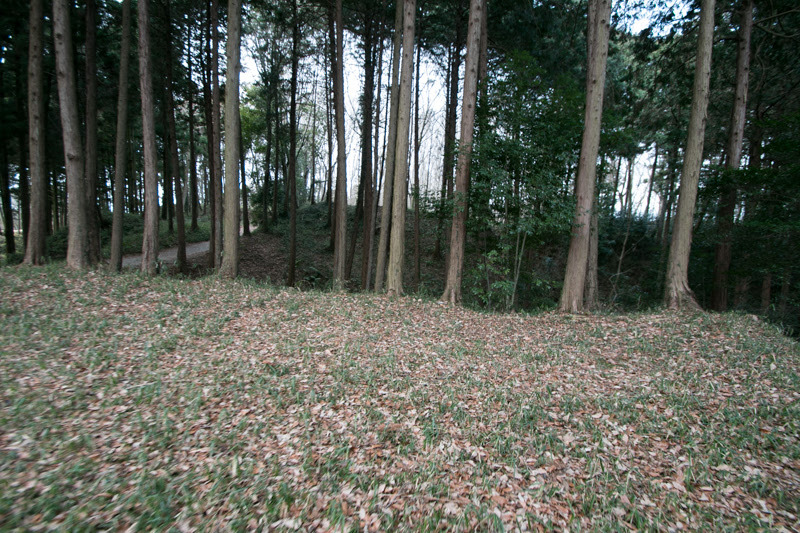 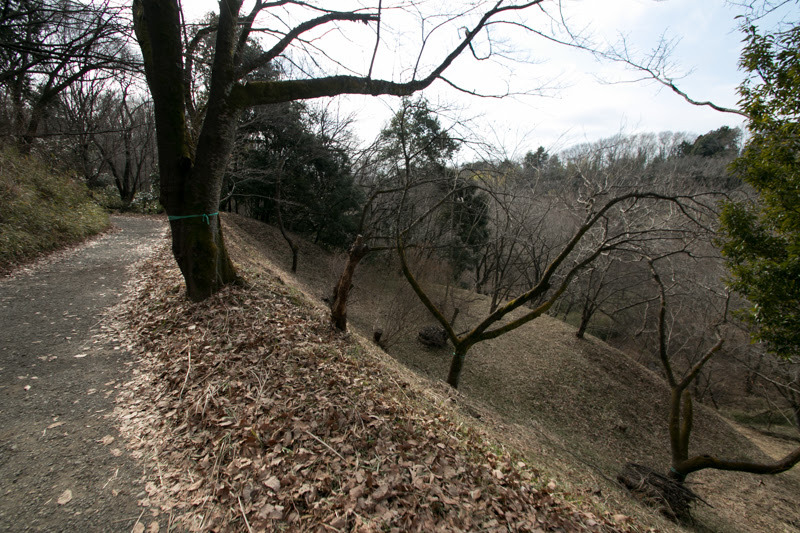 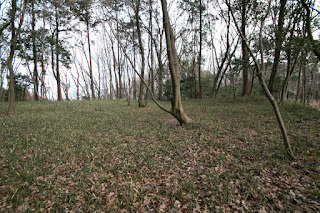 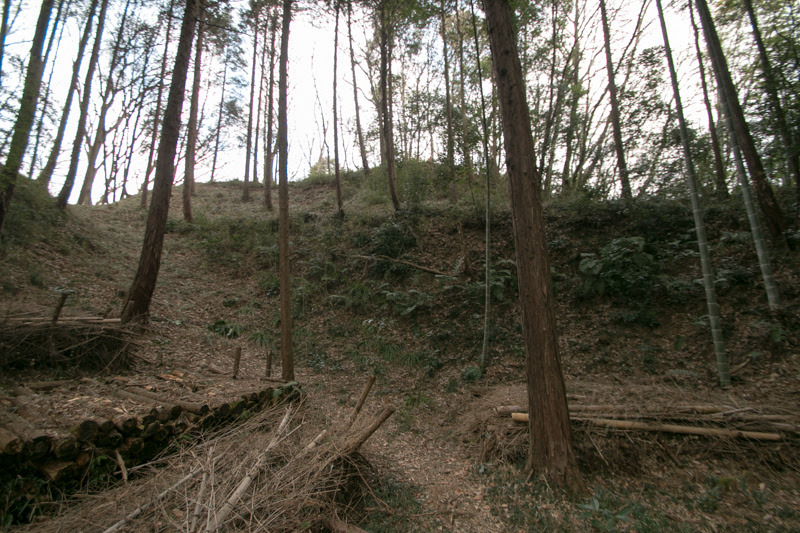 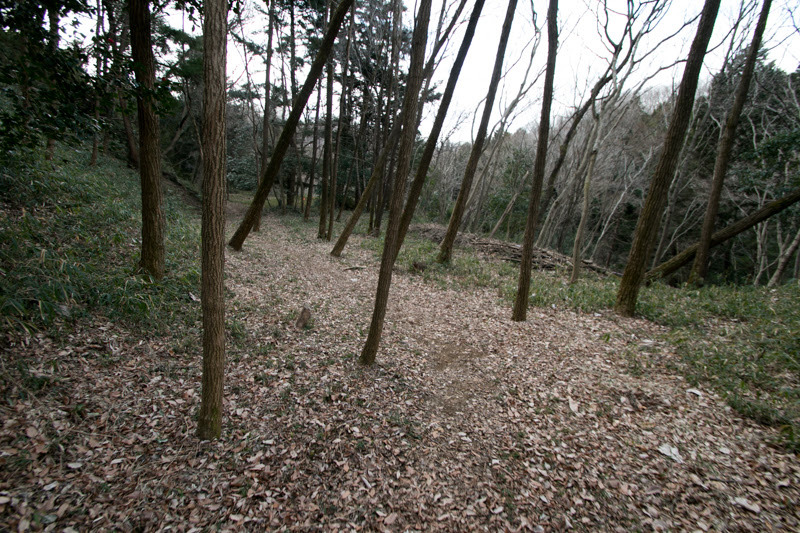 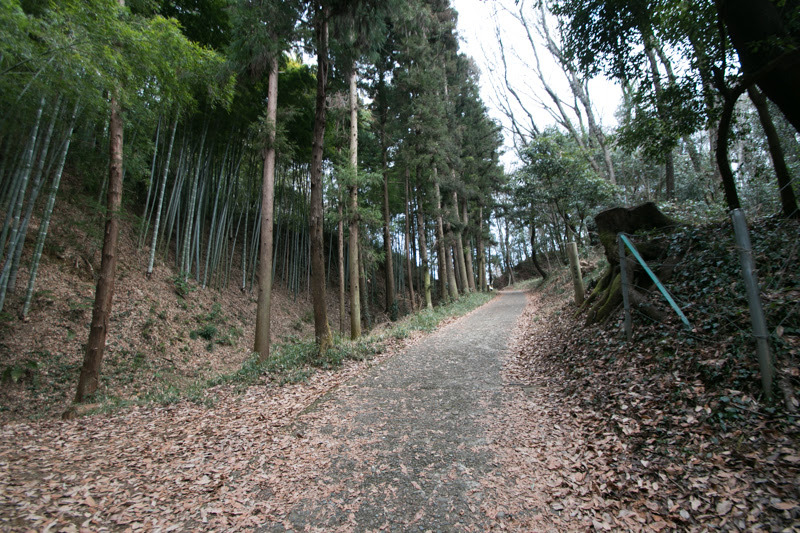 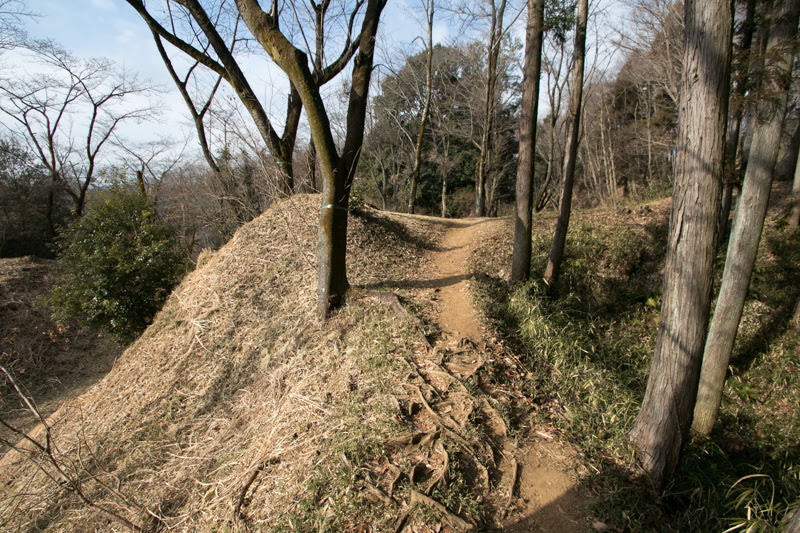 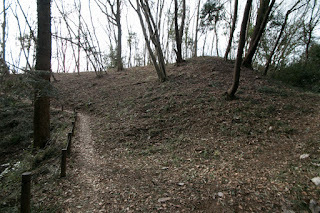 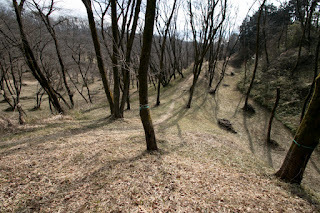 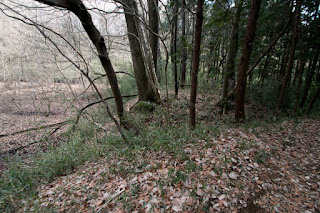 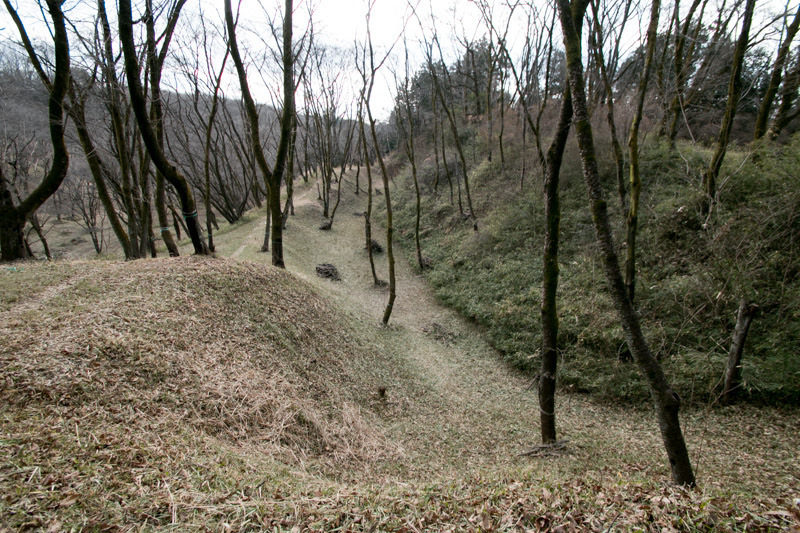 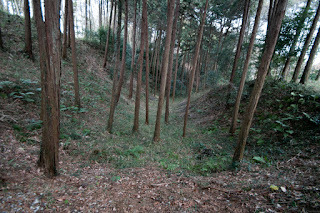 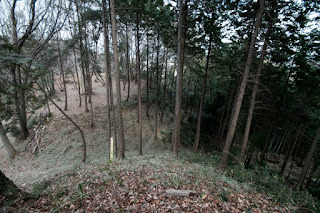 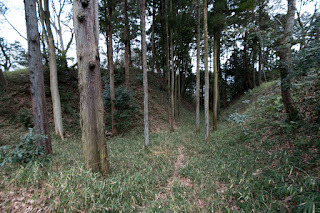 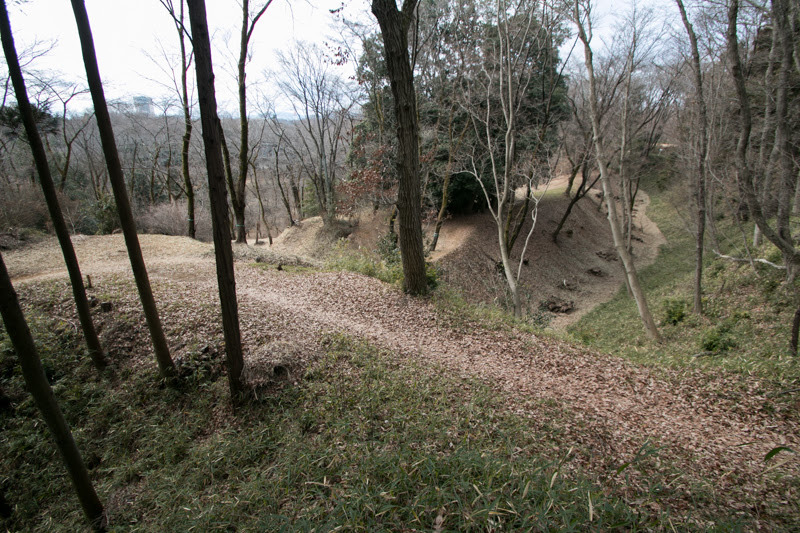 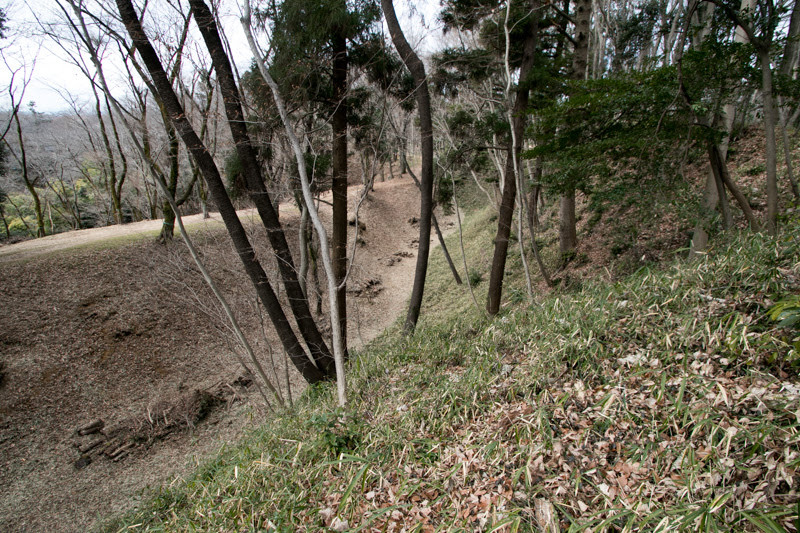 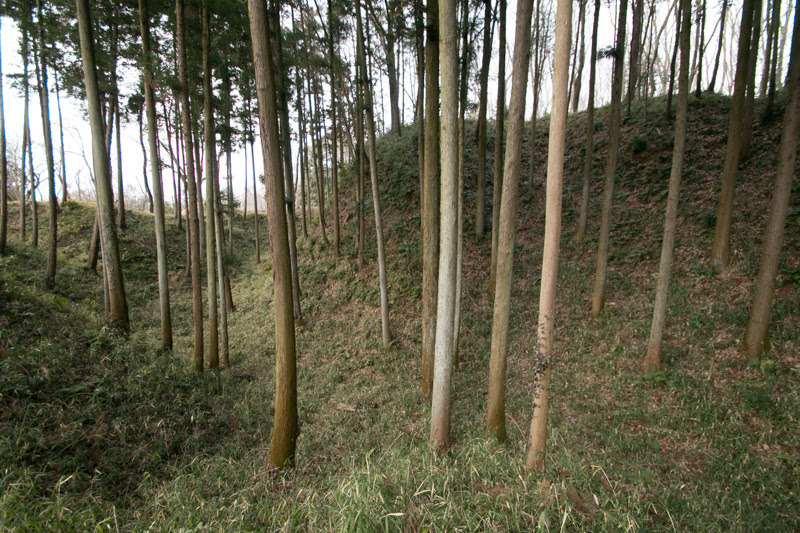 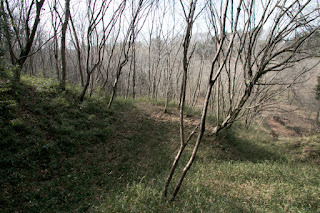 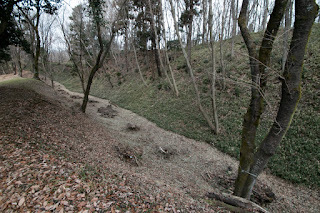 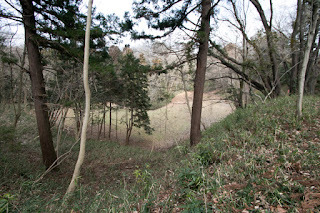 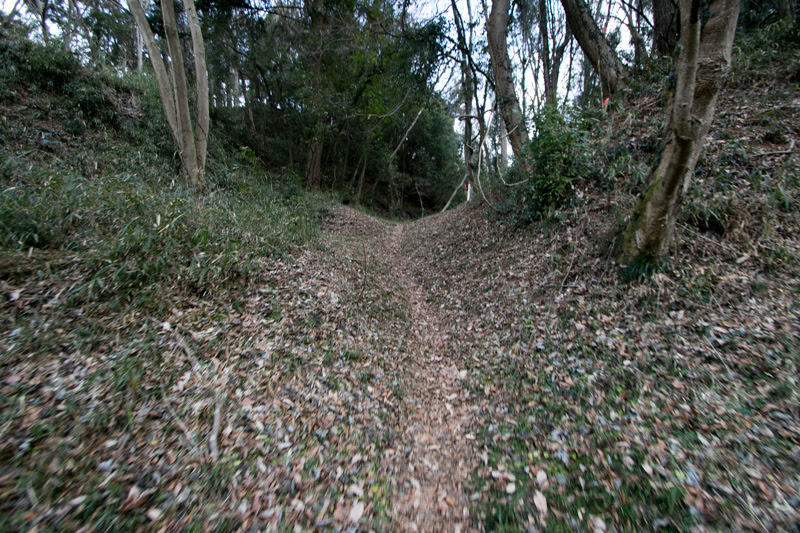 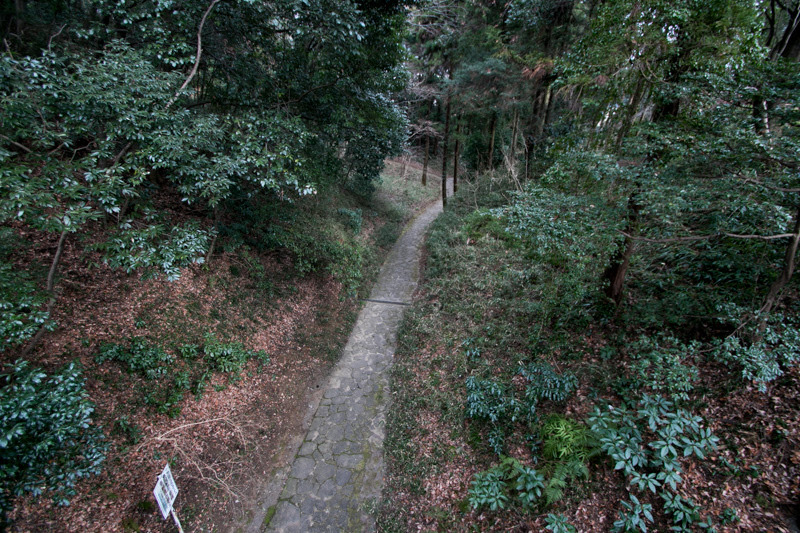 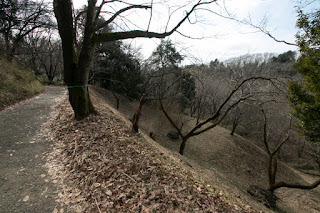 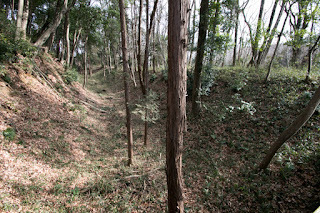 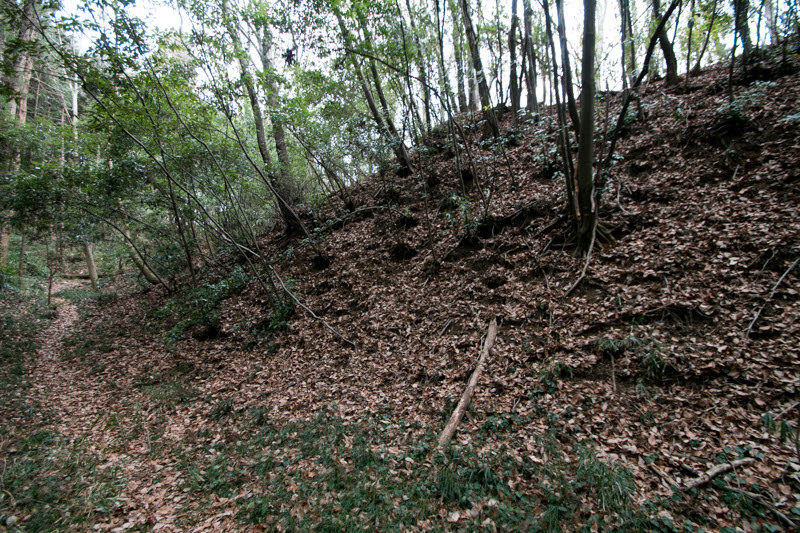 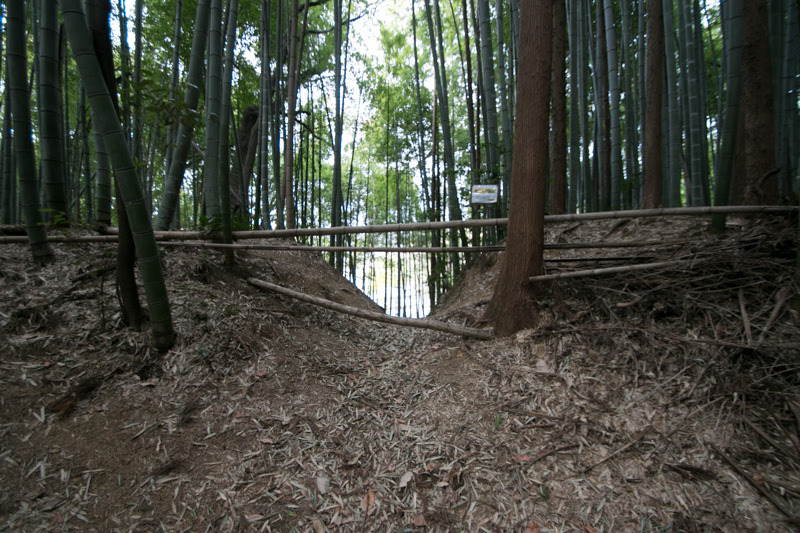 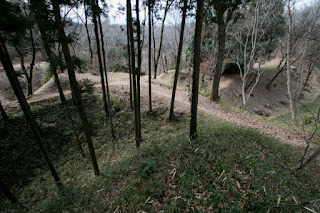 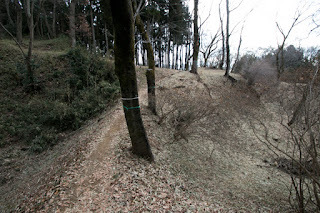 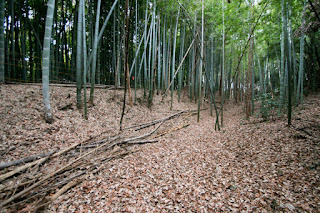 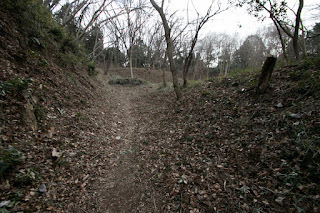 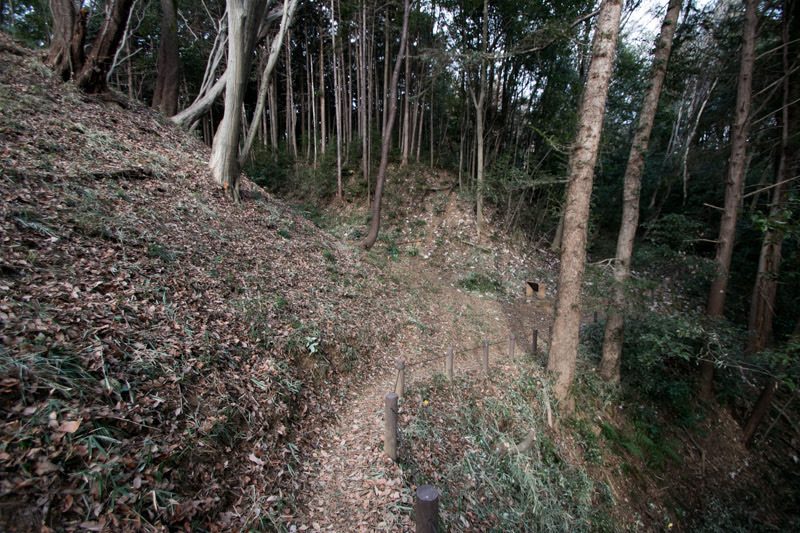 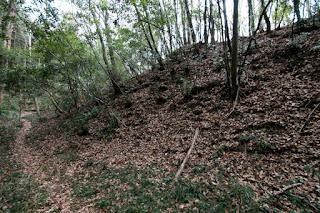 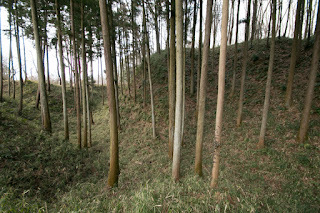 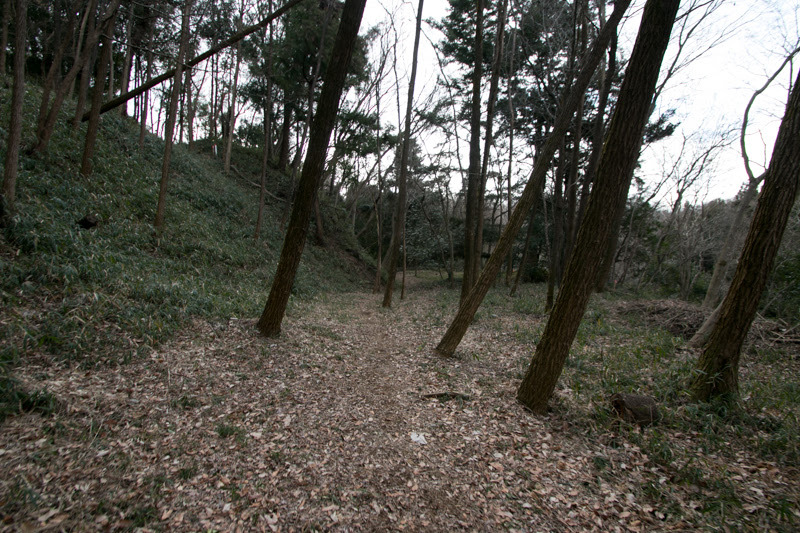 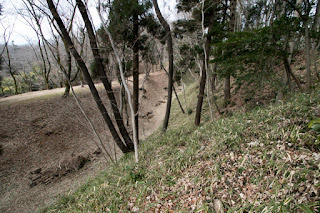 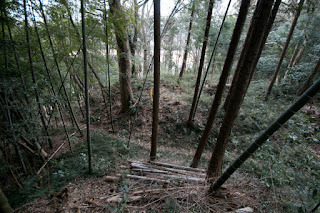 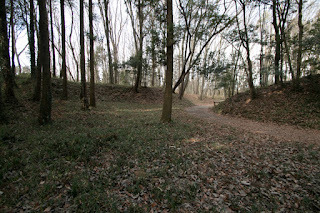 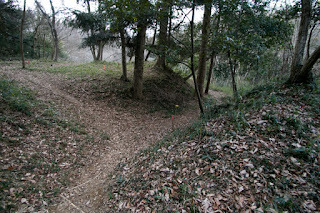 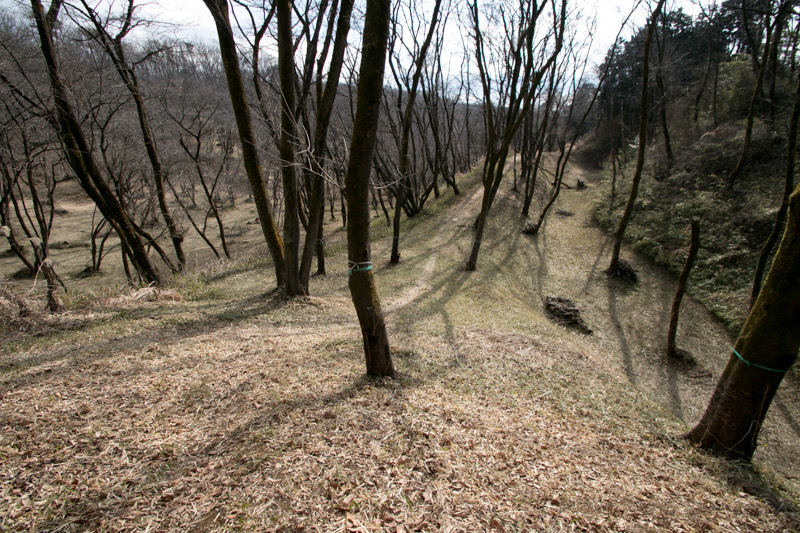 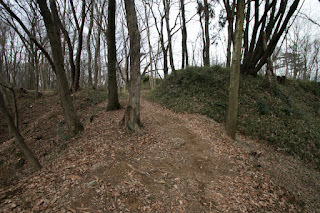 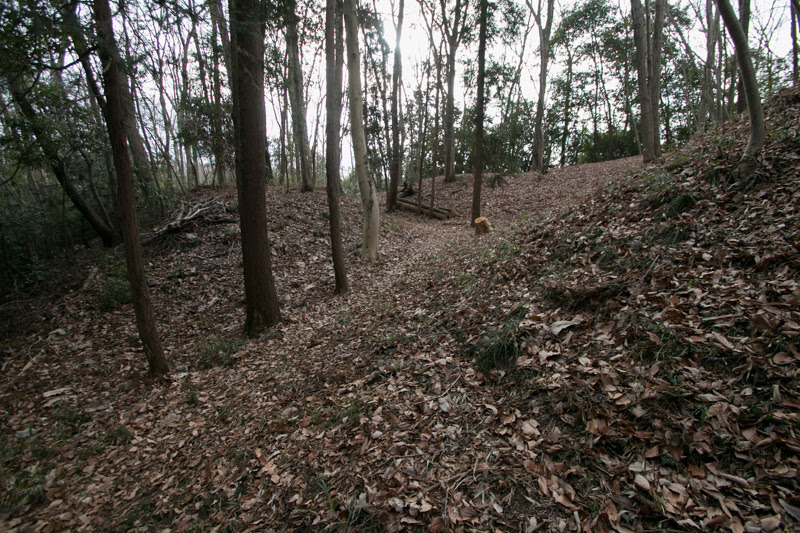 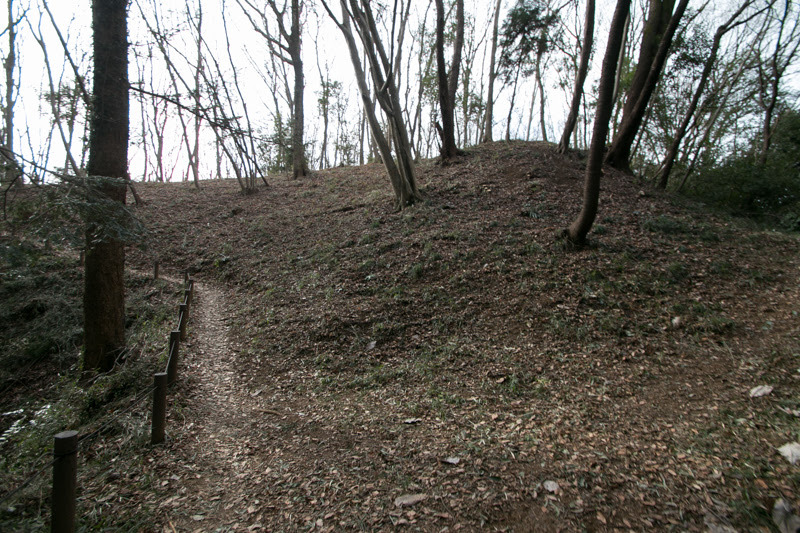 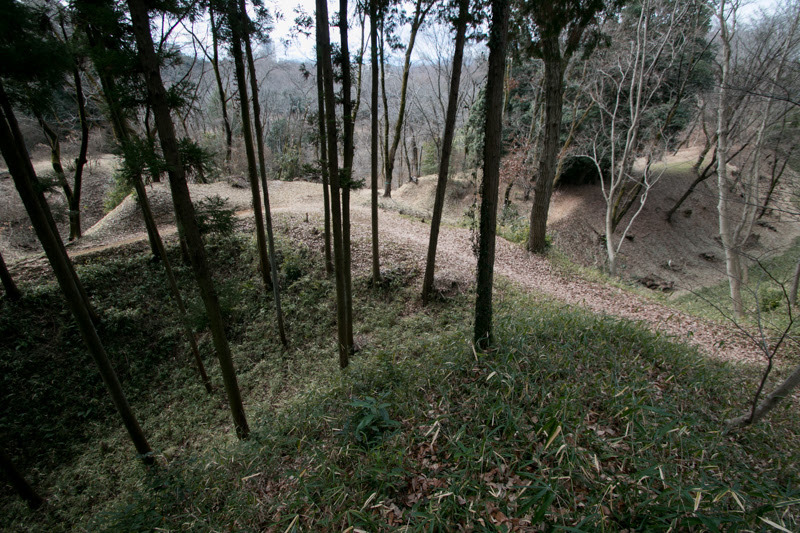 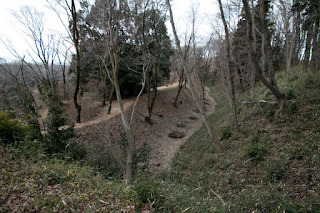 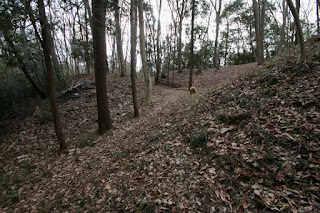 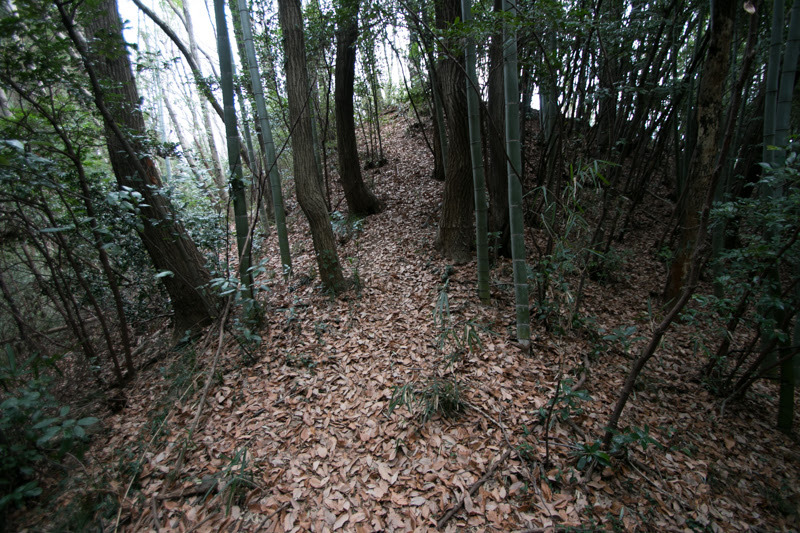 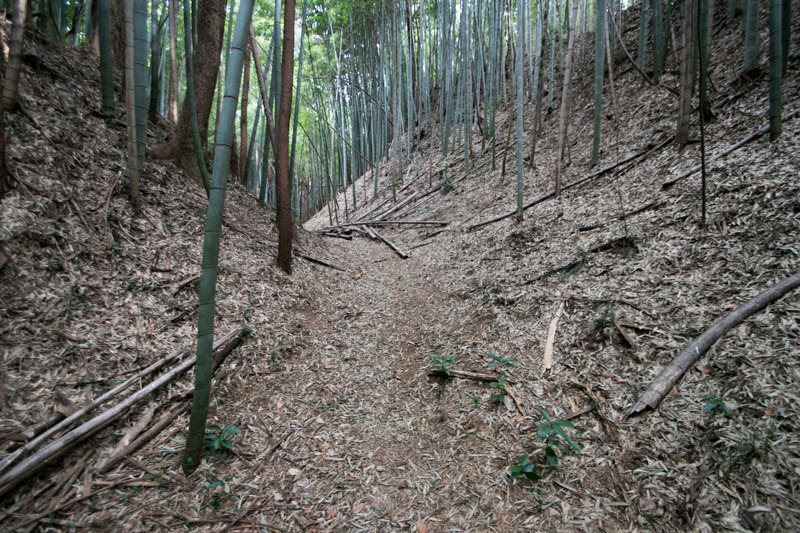 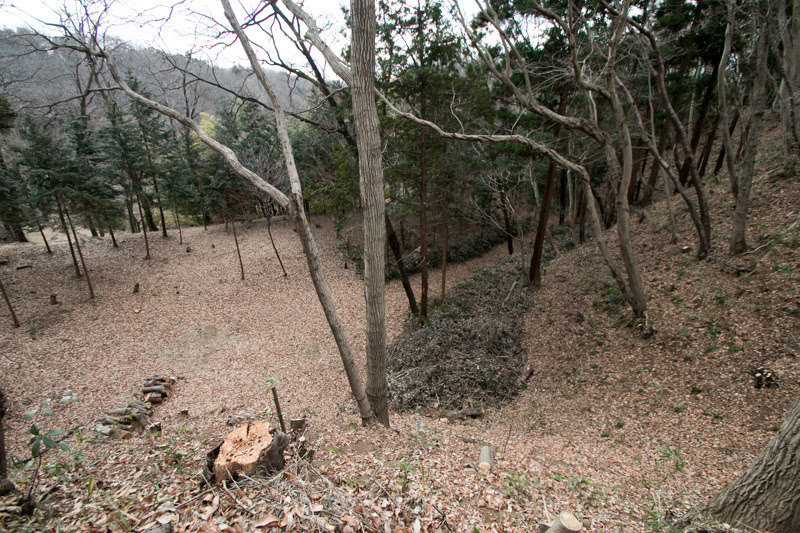 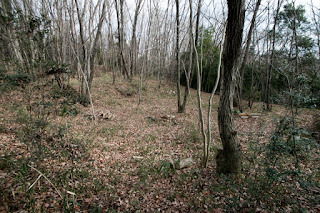 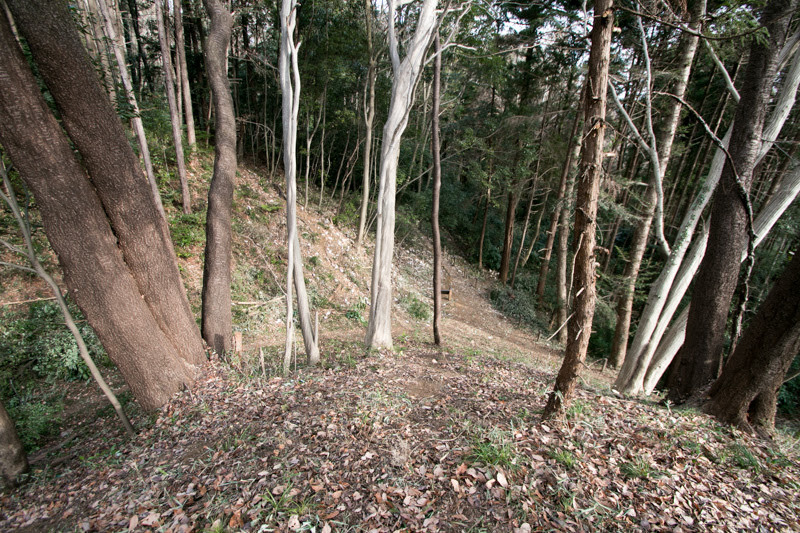 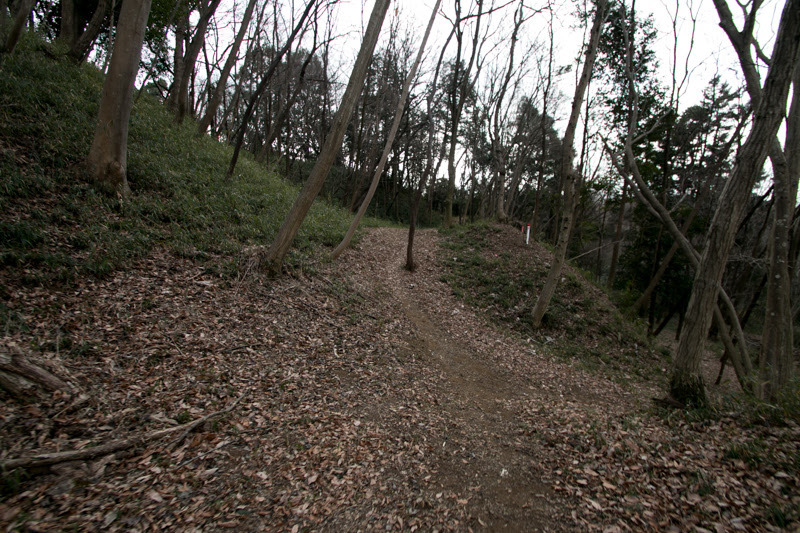 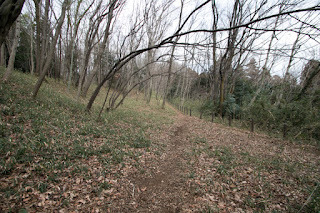 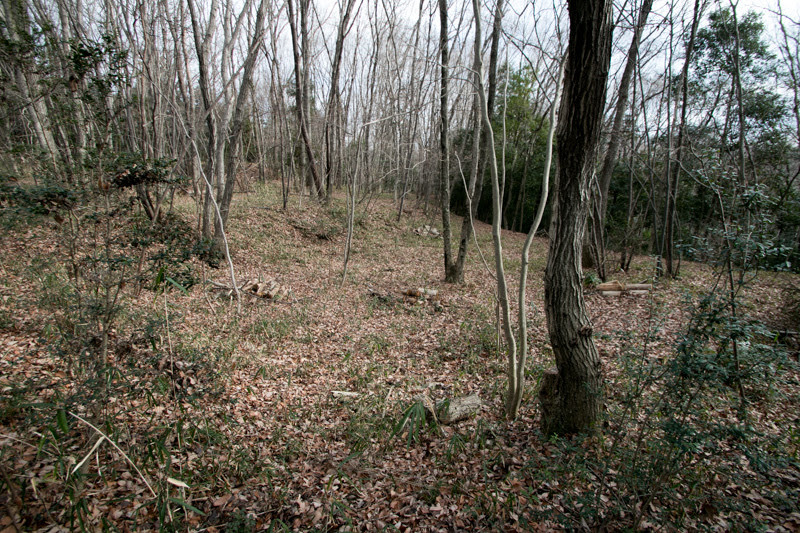 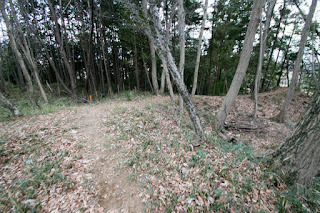 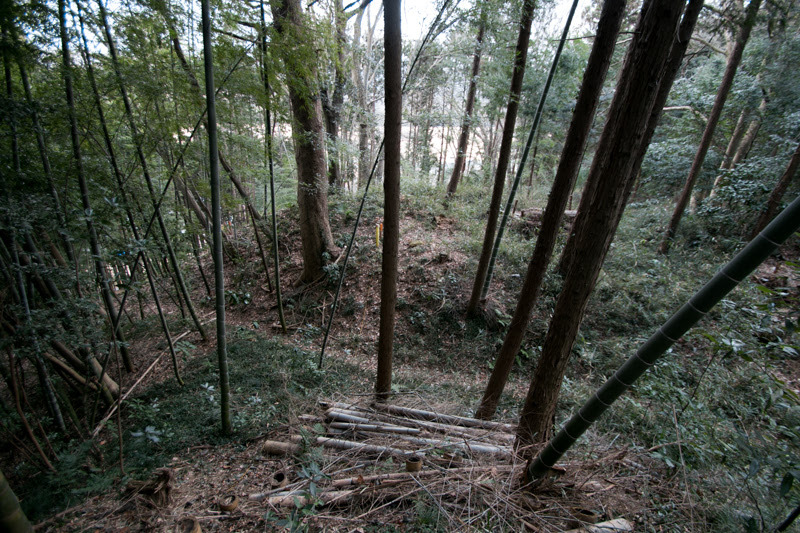 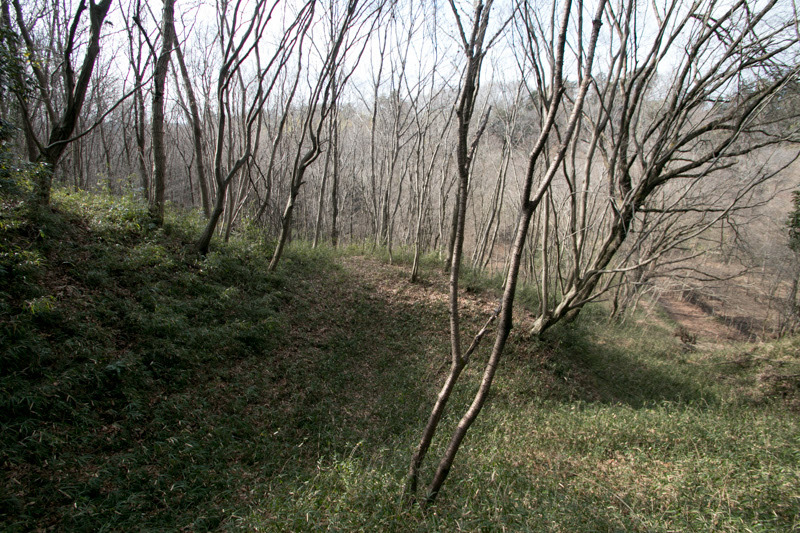 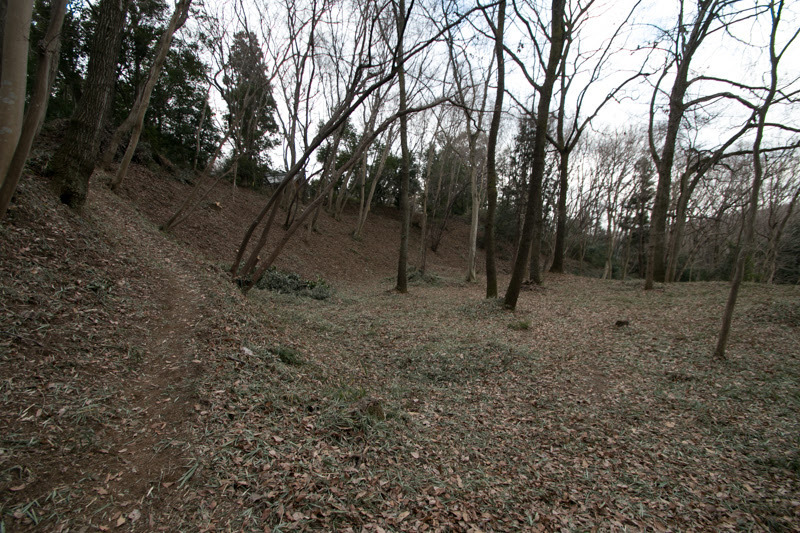 Gentle slope or the hill let enemies approach to the side of the castle easily, and narrow areas and paths divided by valleys and lakes made it difficult for organized counter attacks. 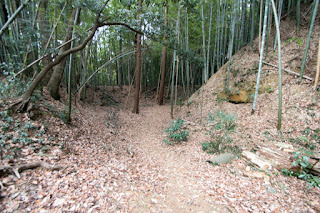 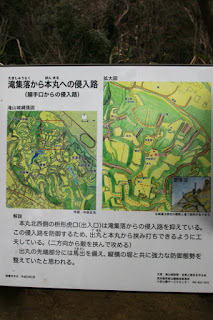 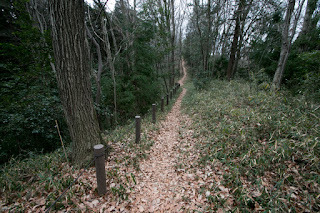 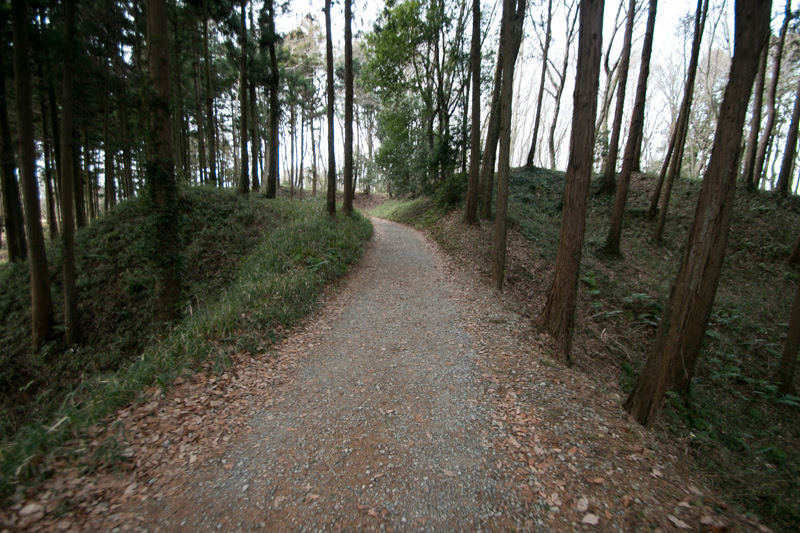 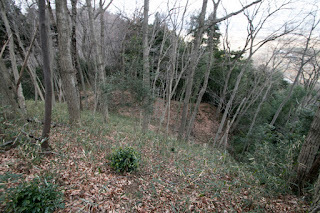 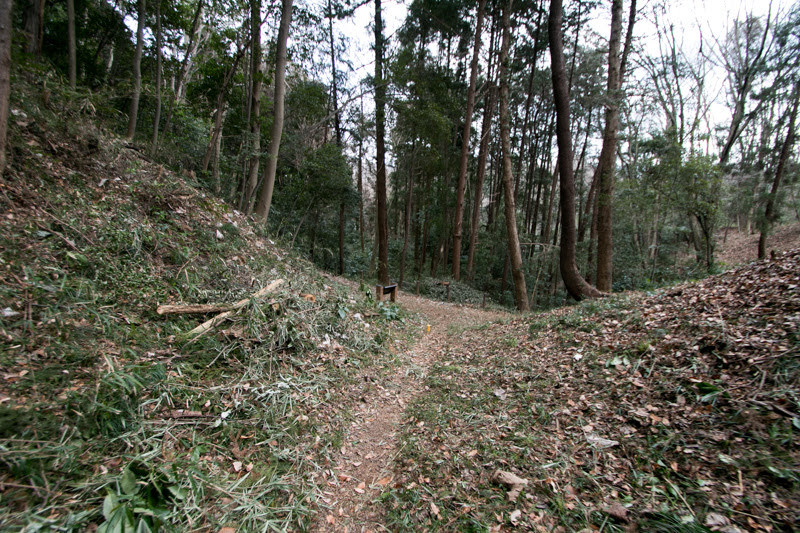 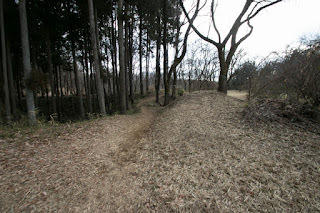 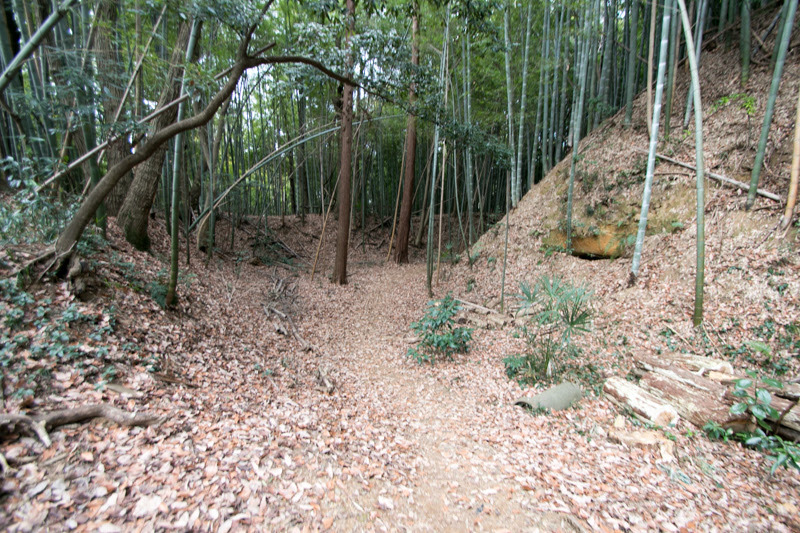 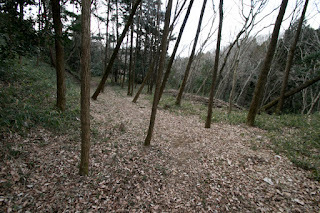 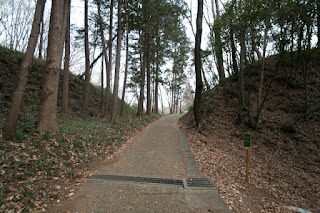 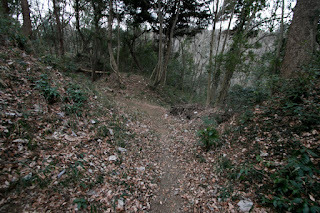 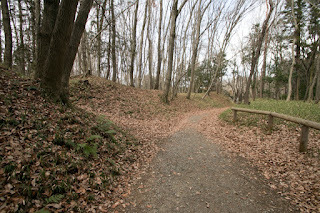 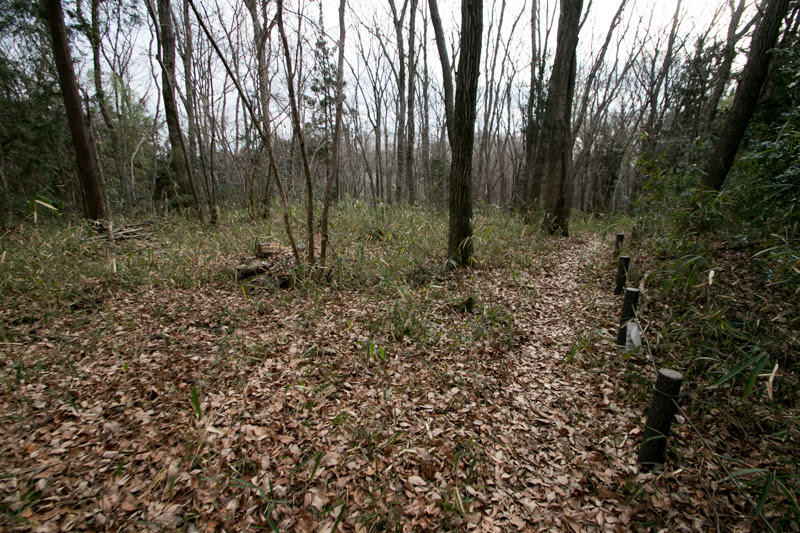 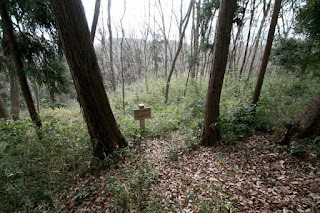 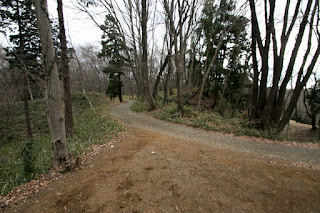 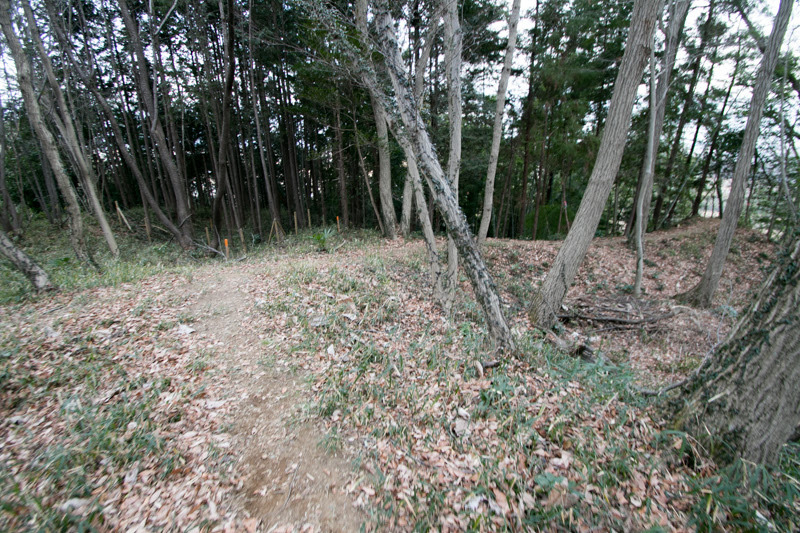 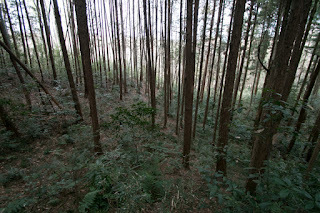 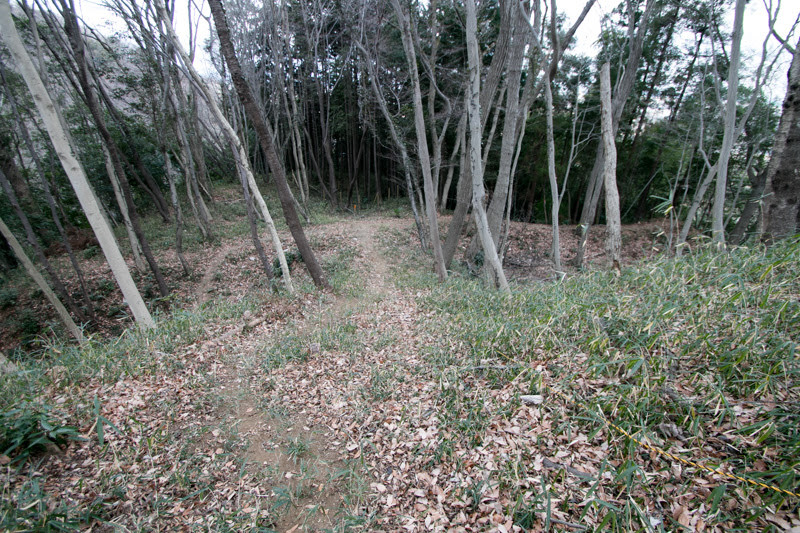 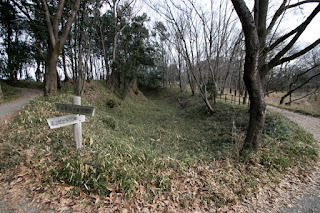 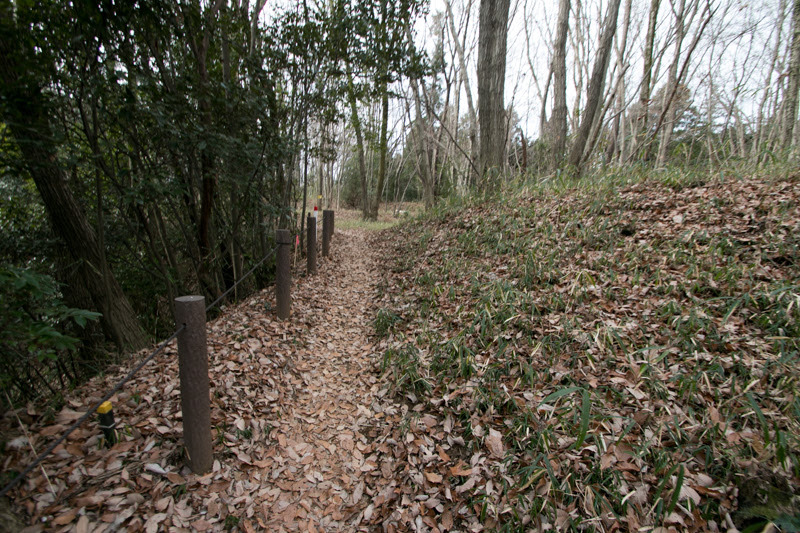 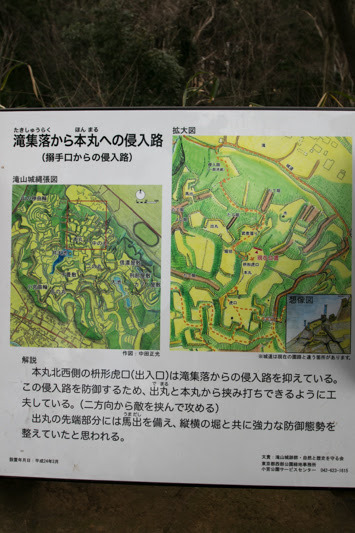 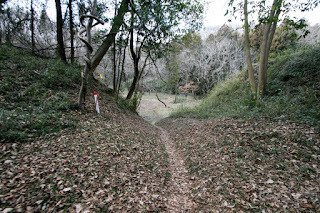 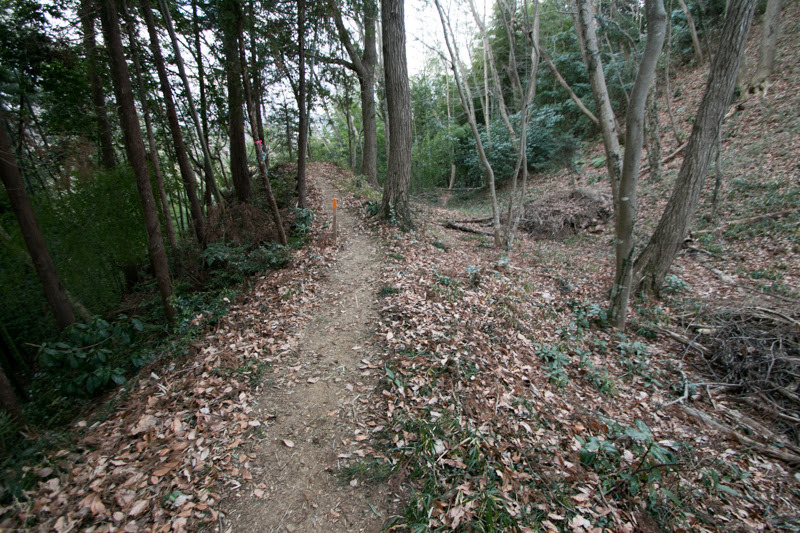 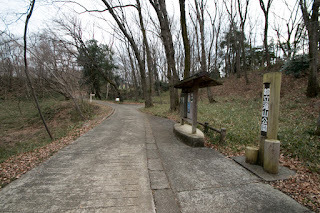 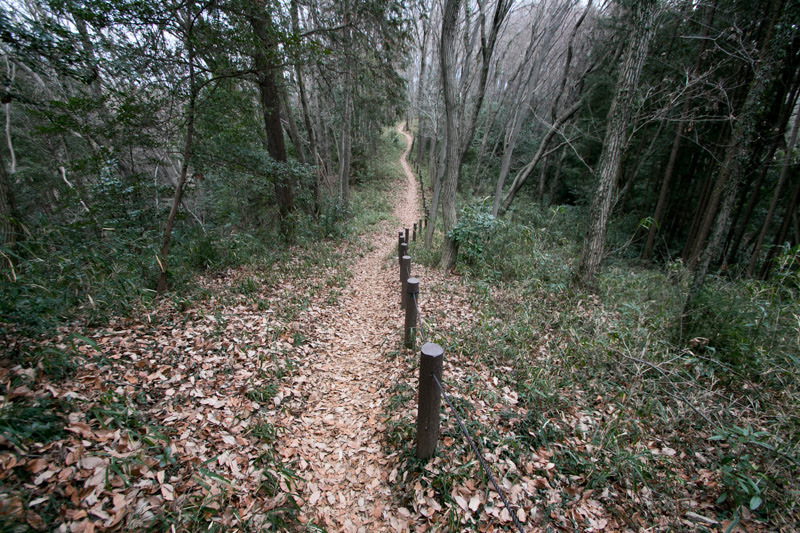 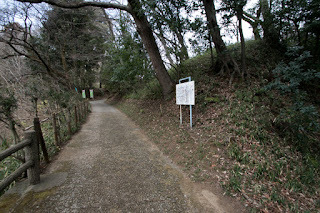 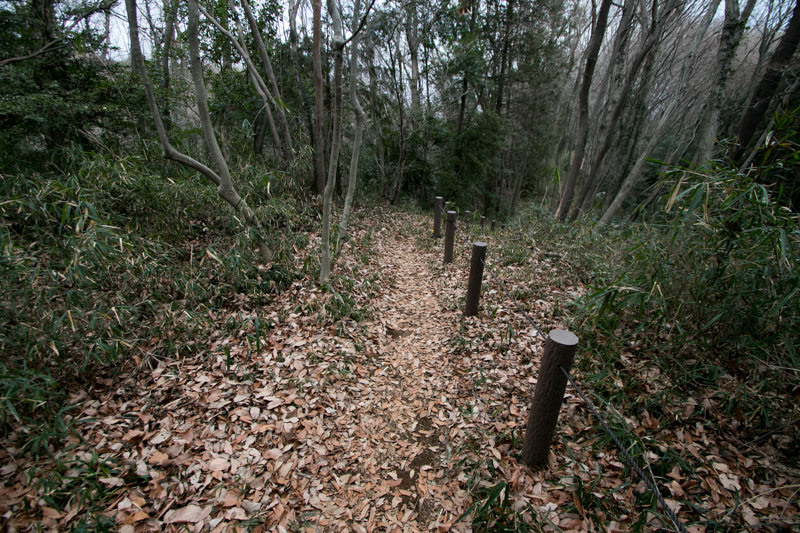 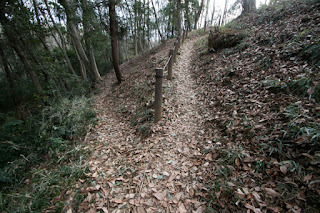 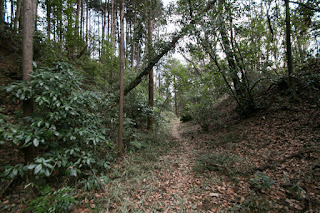 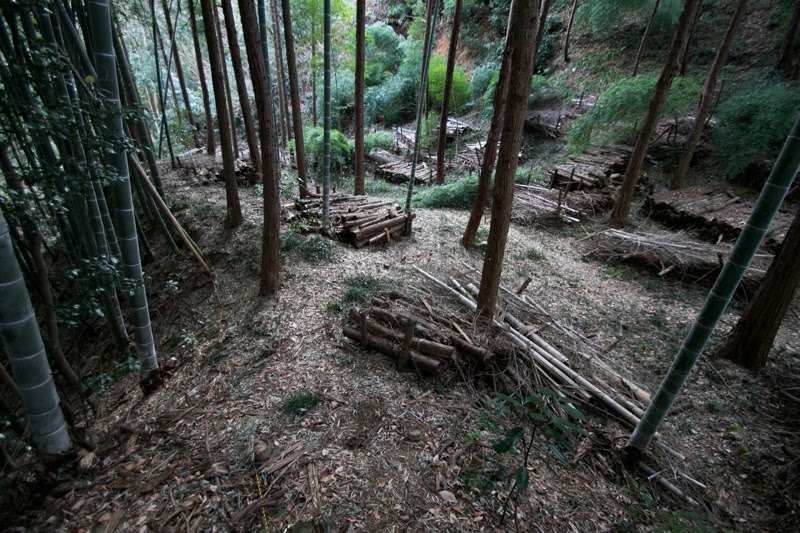 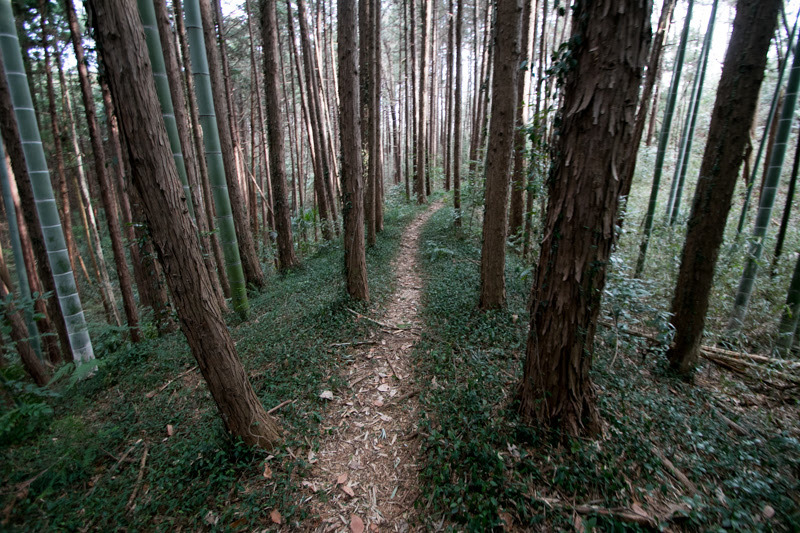 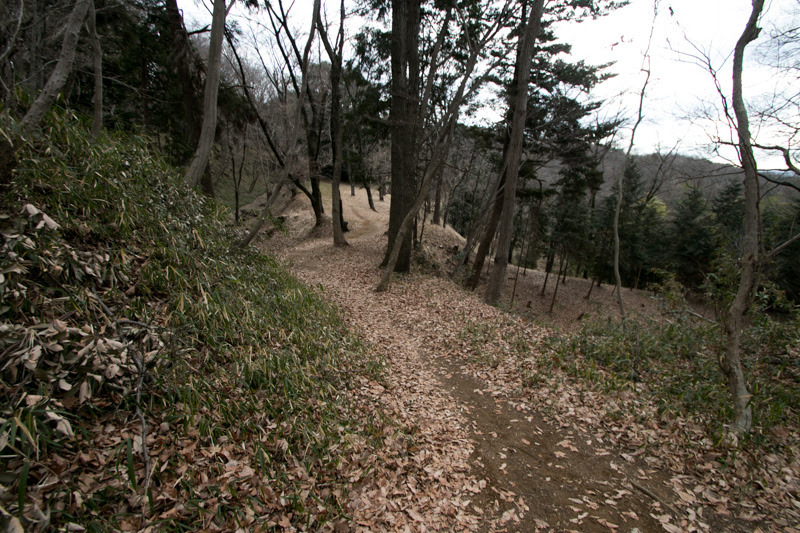 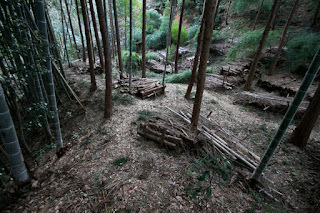 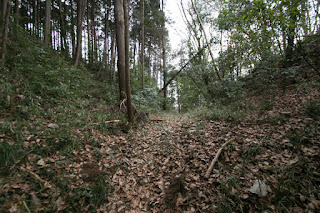 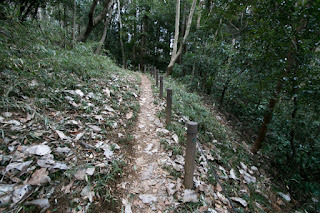 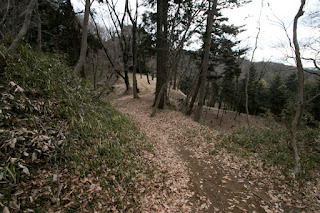 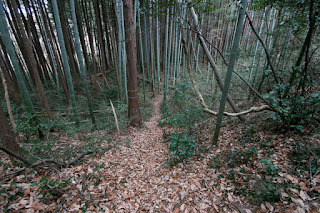 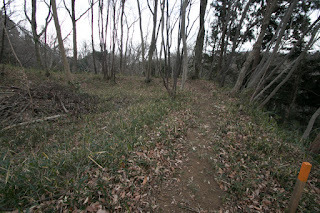 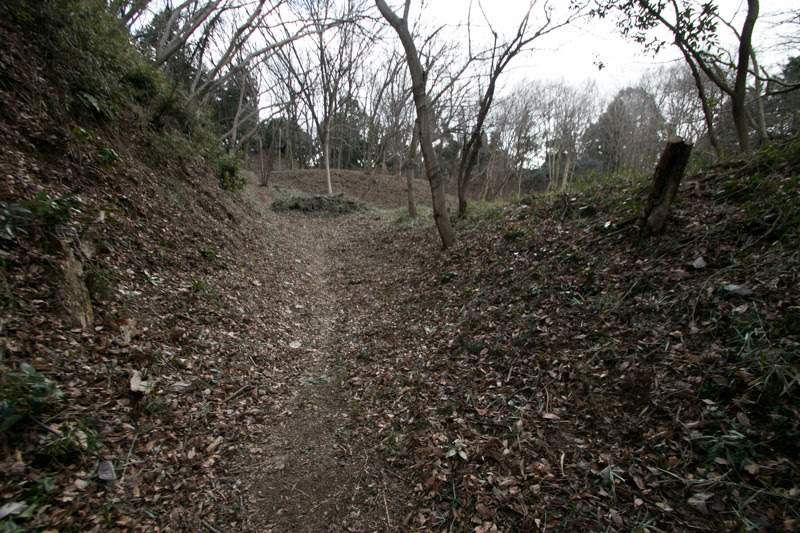 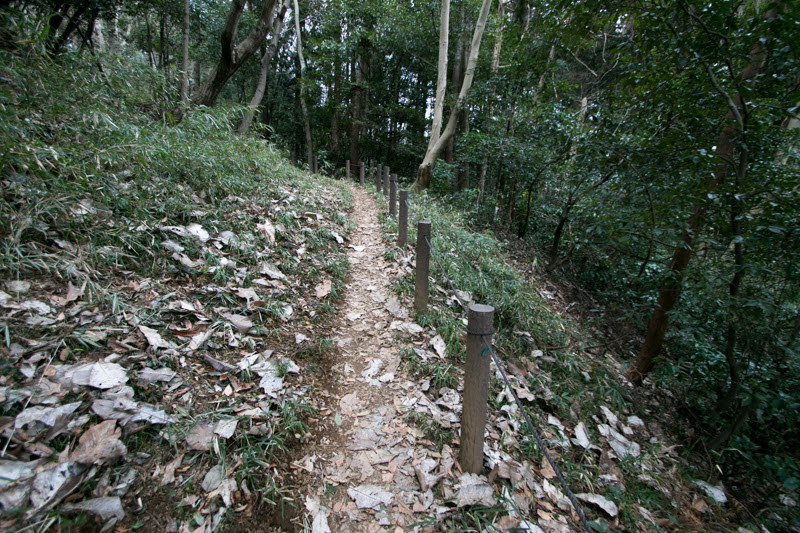 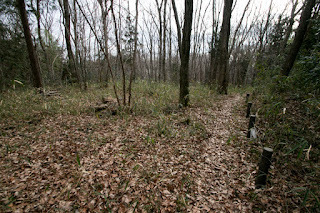 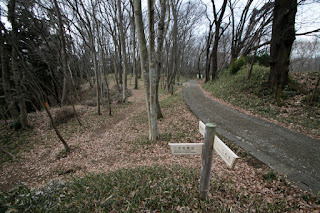 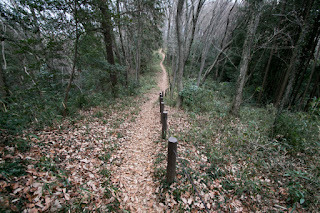 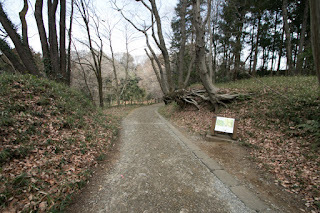 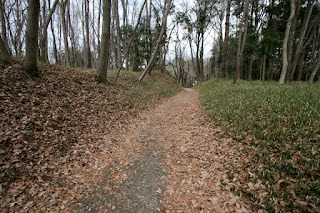 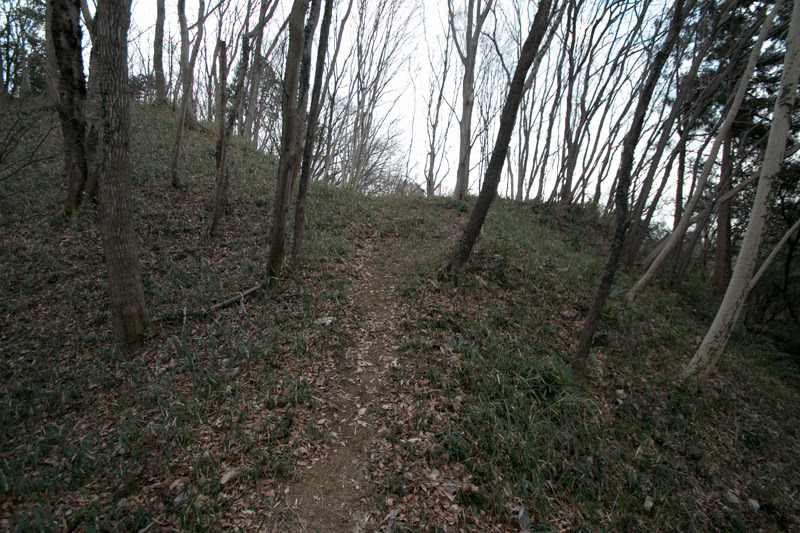 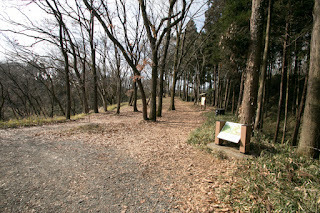 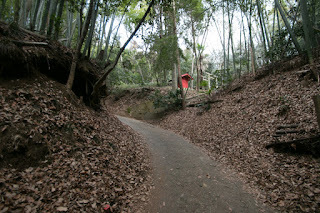 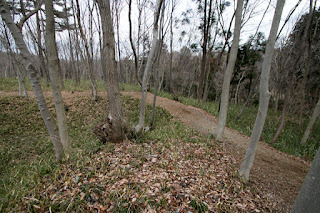 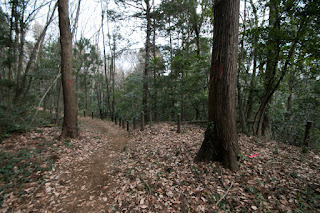 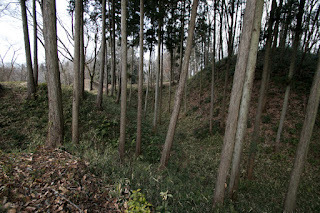 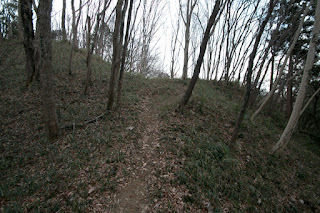 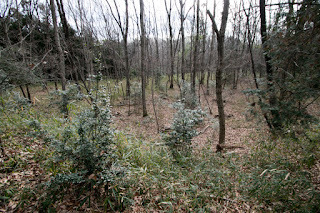 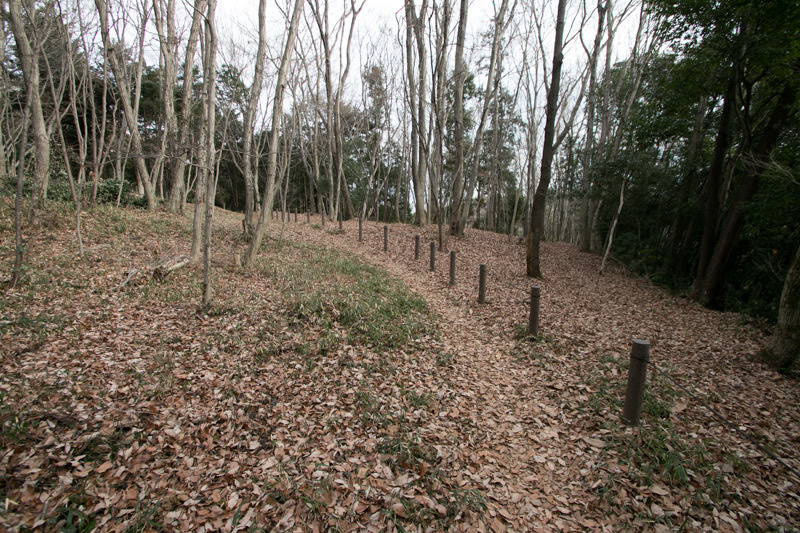 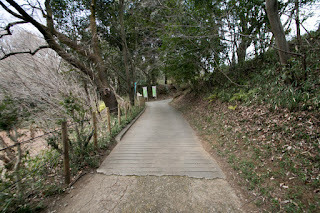 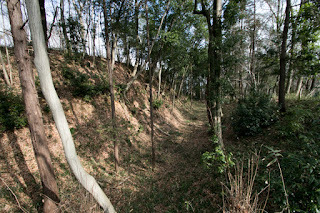 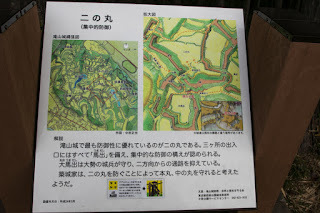 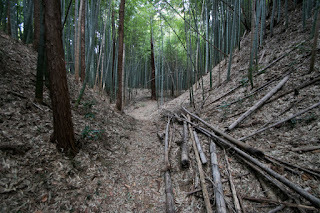 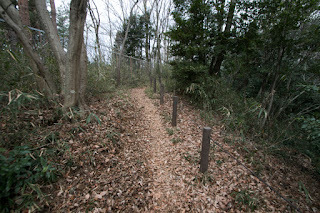 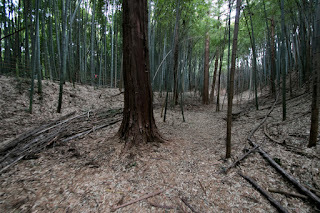 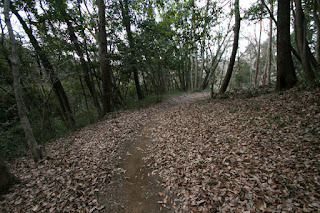 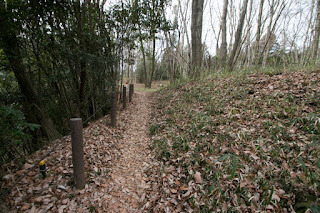 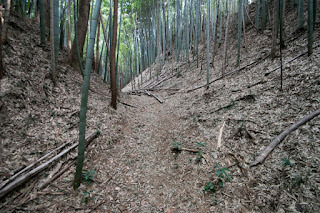 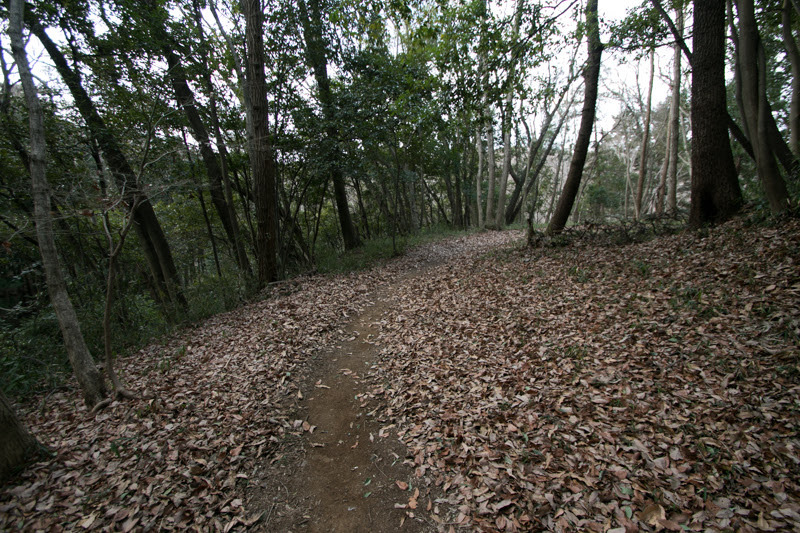 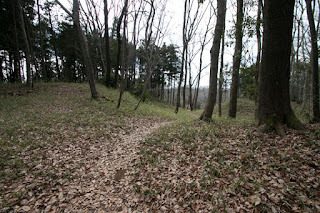 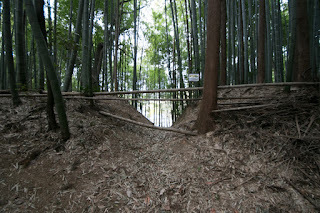 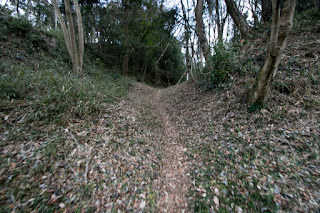 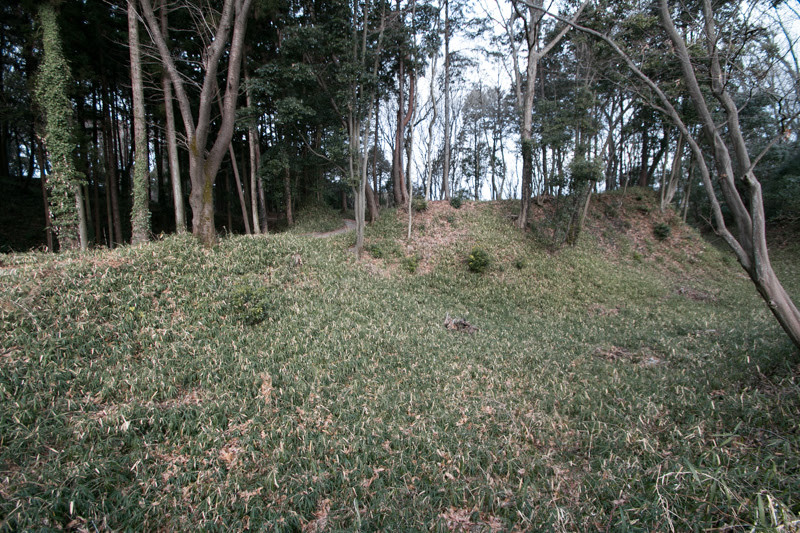 Further, as Takiyama castle was apart from border, and did not act as obstruction for Takeda army. 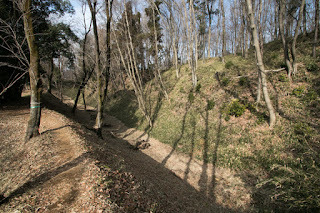 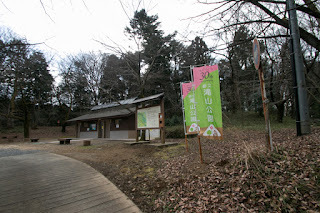 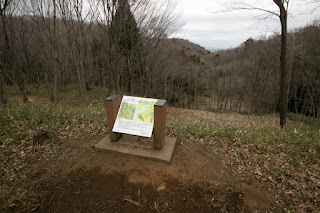 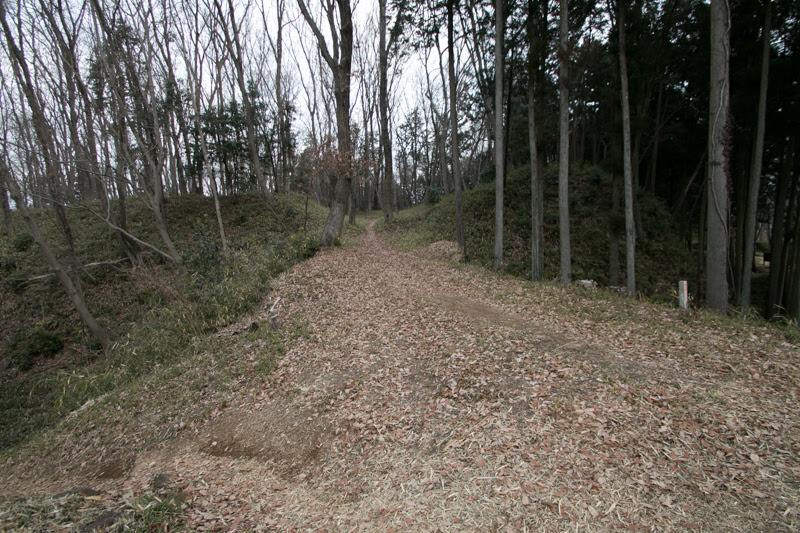 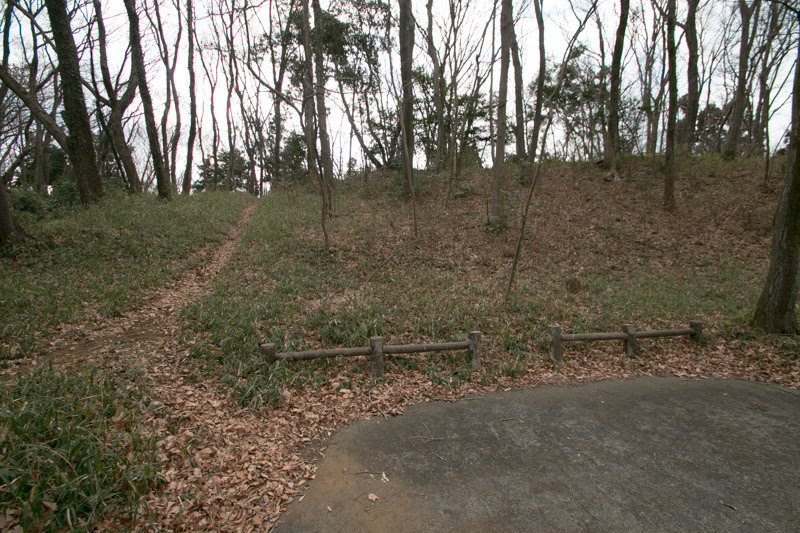 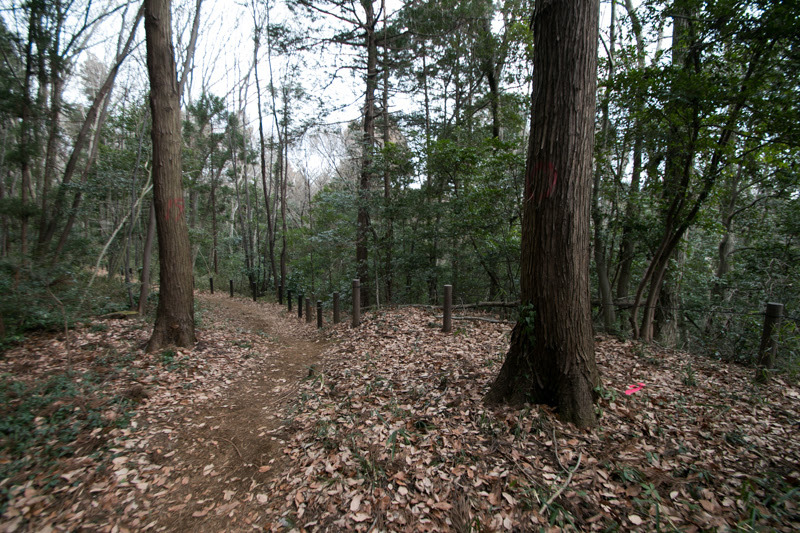 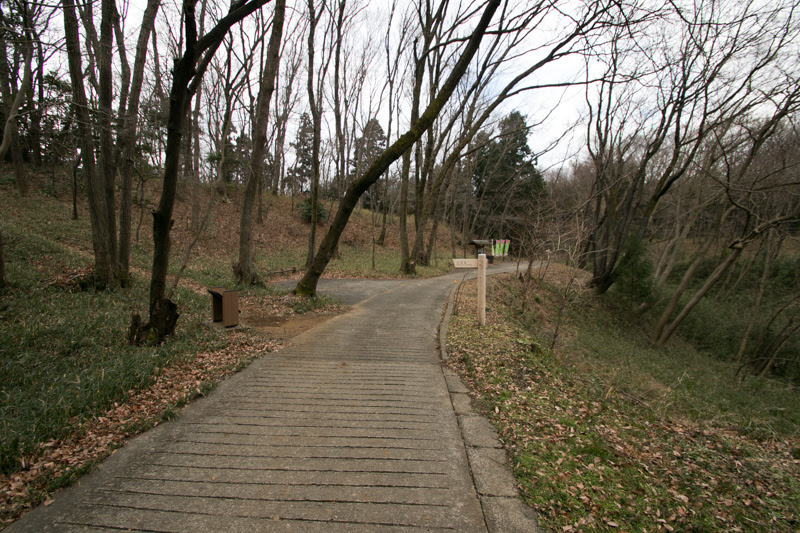 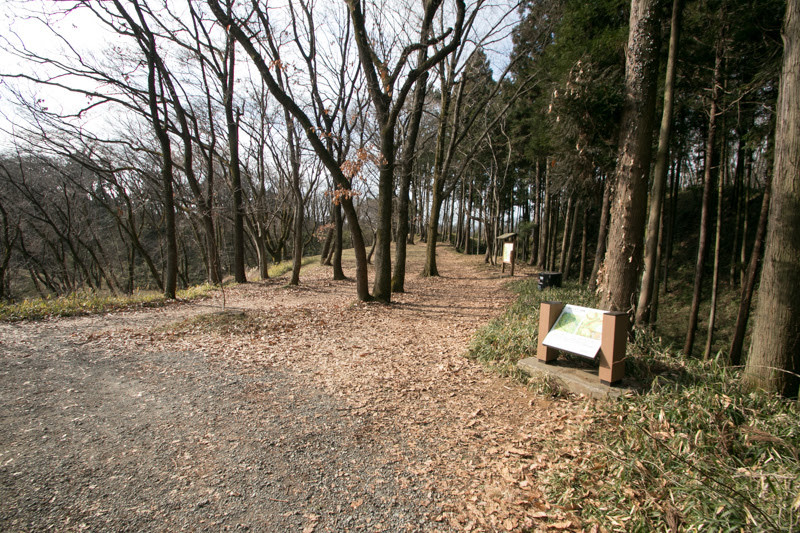 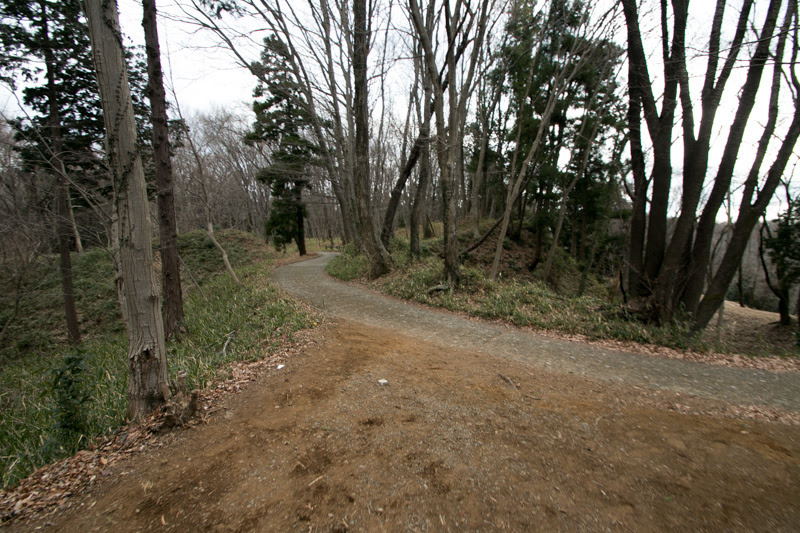 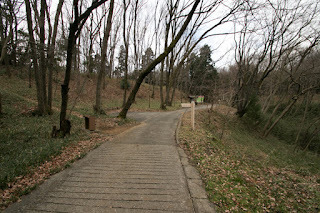 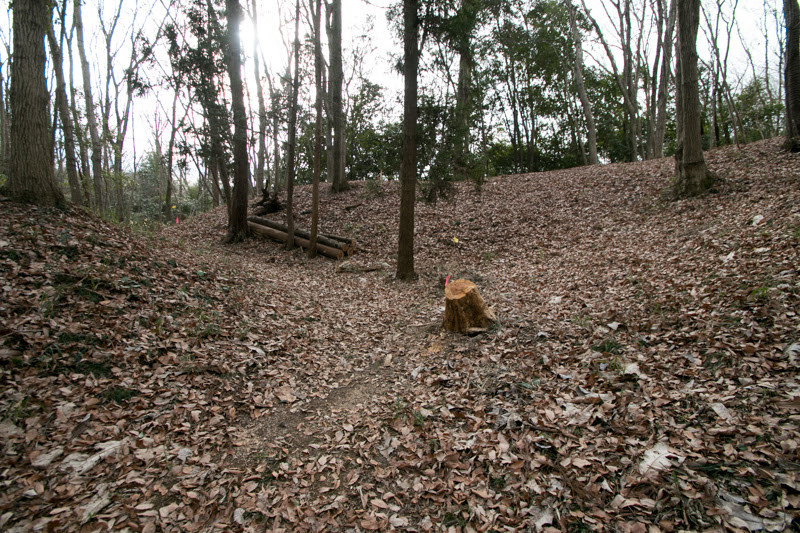 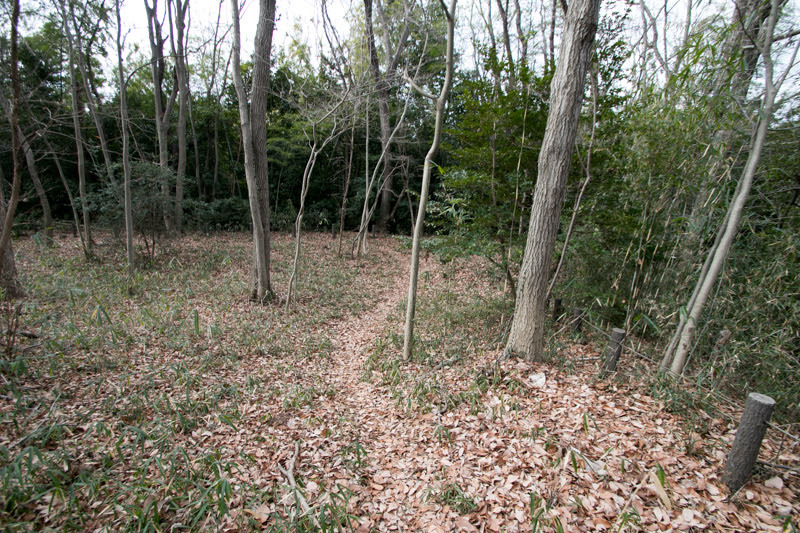 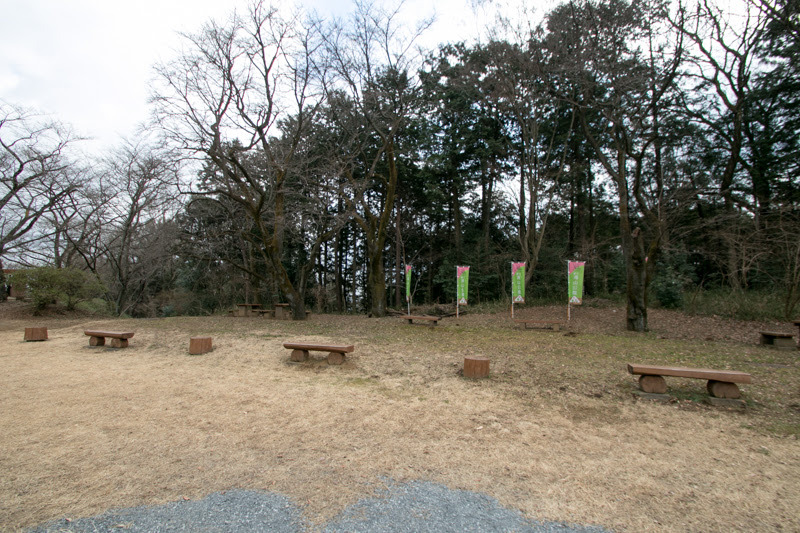 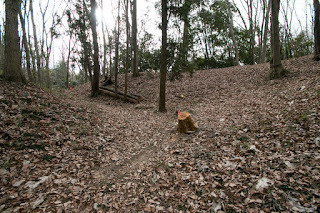 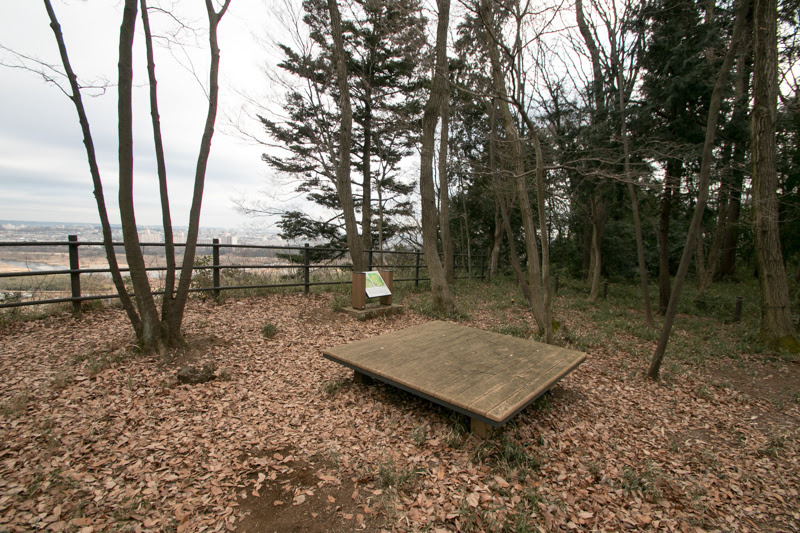 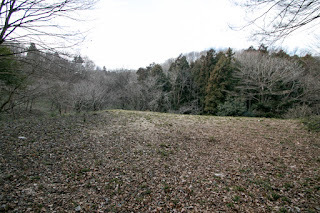 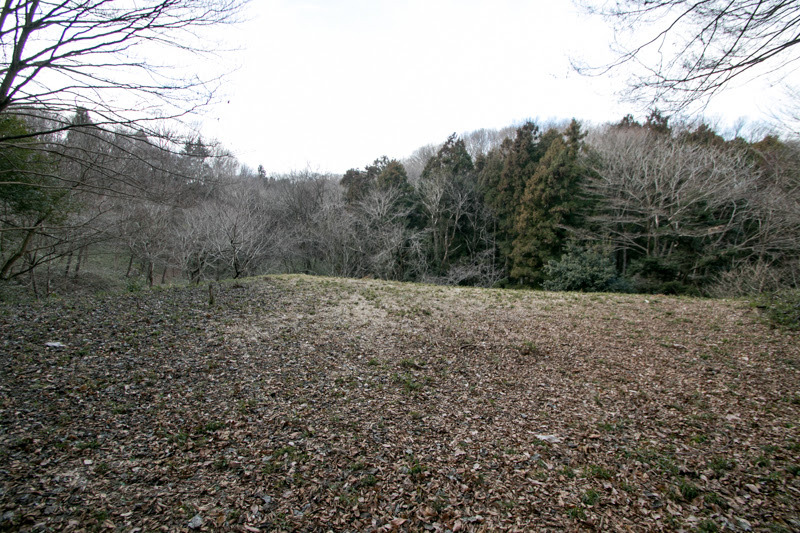 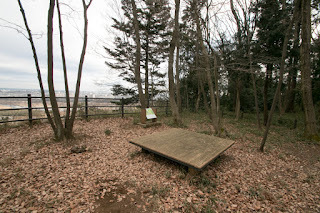 Due to above reasons, several years after the battle, Ujiteru Hojo started to build Hachioji castle at Fukasawa mountain at closer place to border. 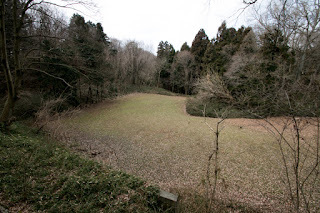 In 1582, during the construction, Takeda clan was extinguished by Oda clan, and Kai province was seized by Oda clan or Tokugawa clan, central powers and substantial enemies of Hojo clan. 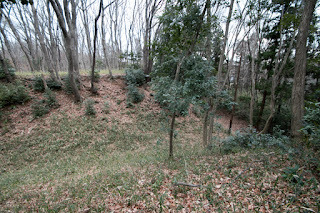 Ujiteru pushed the construction and minimum part of Hachioji castle completed around 1584, then Ujiteru moved to there and abolished Takiyama castle. 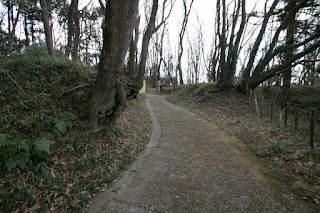 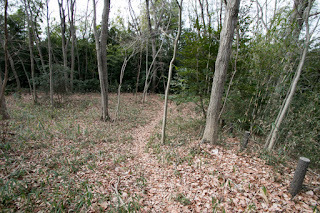 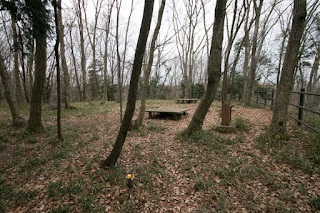 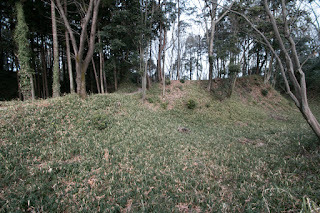 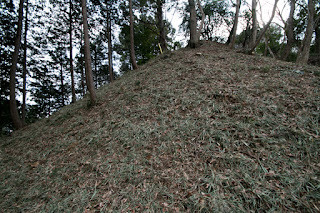 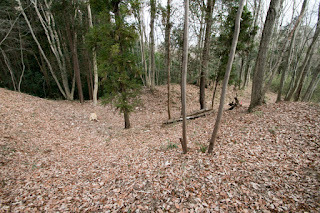 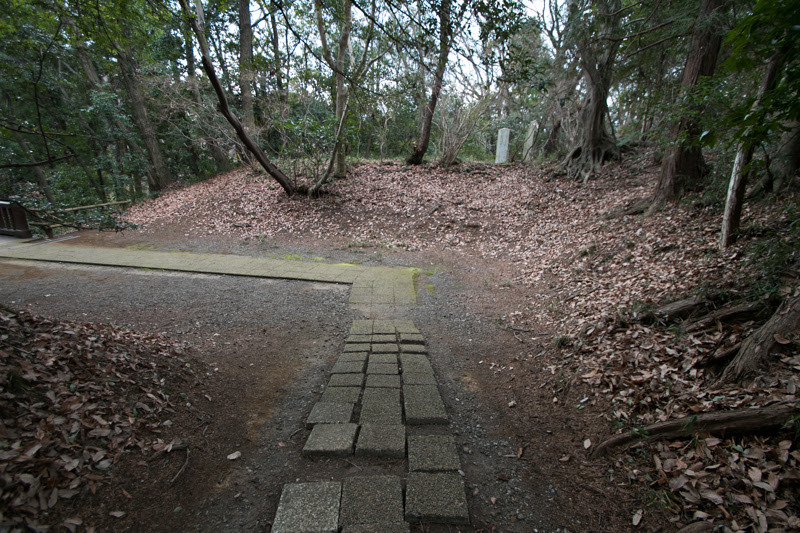 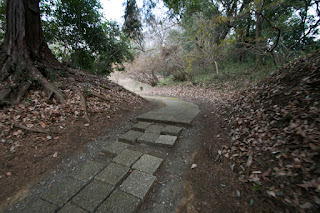 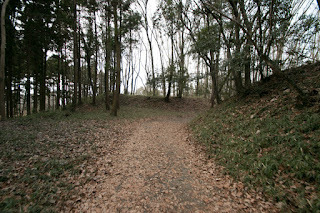 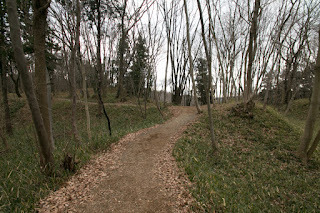 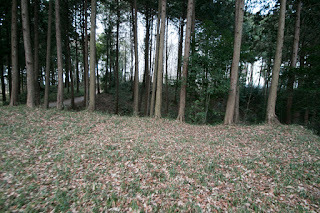 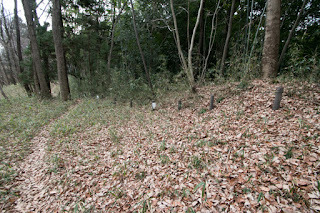 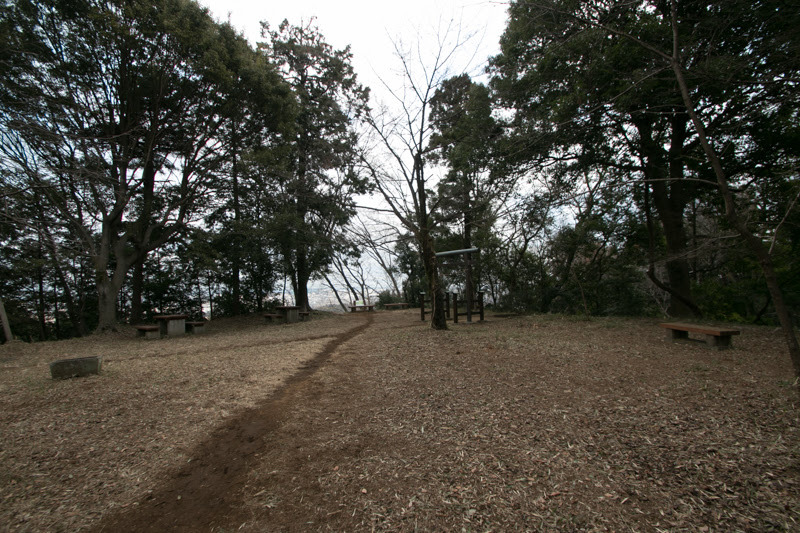 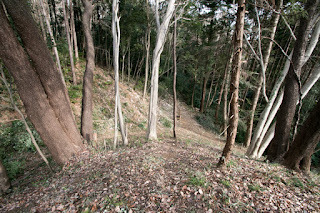 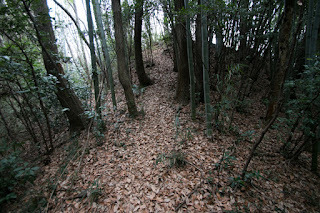 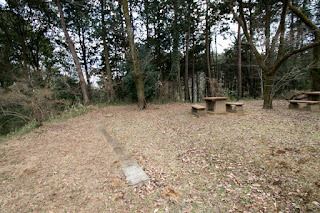 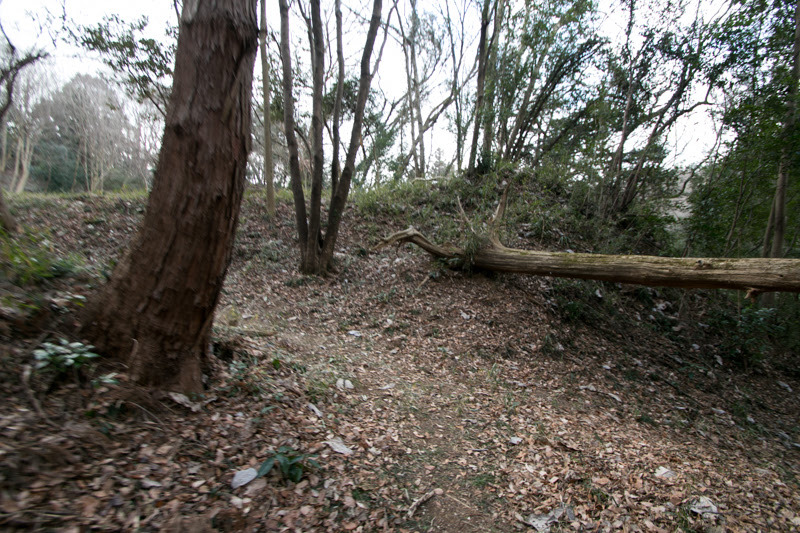 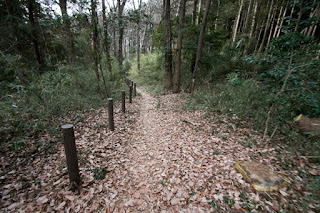 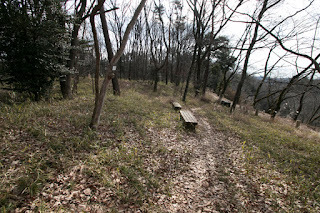 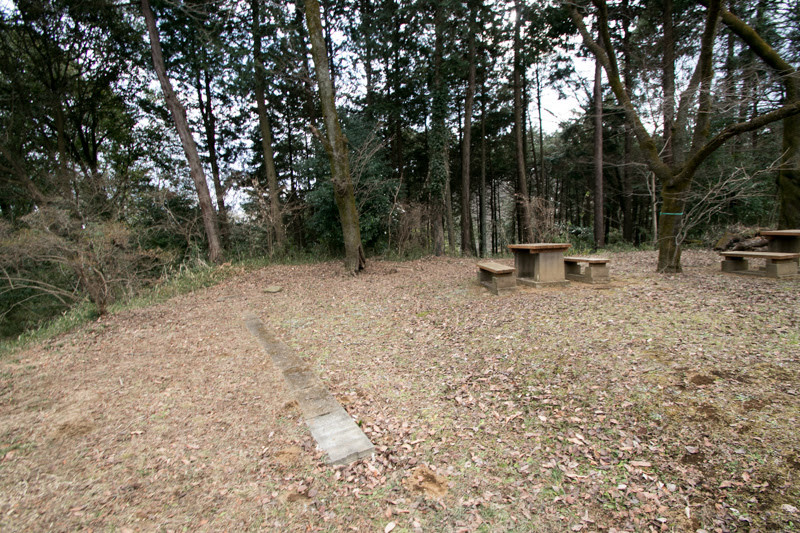 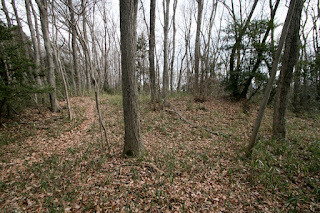 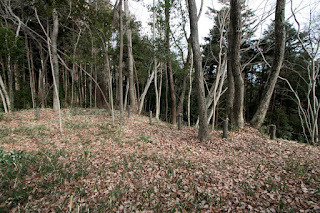 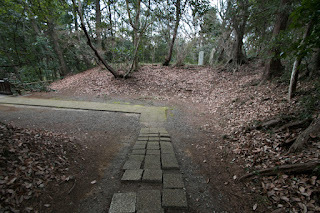 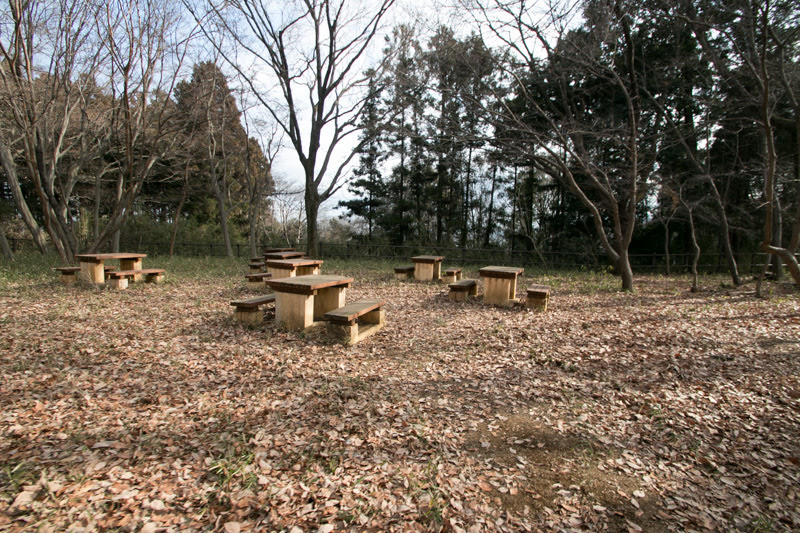 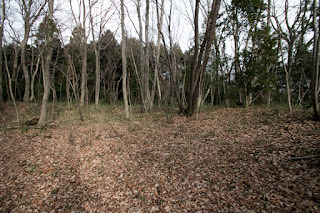 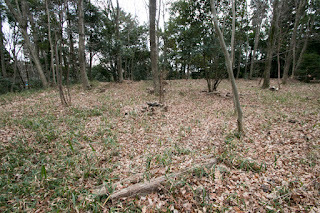 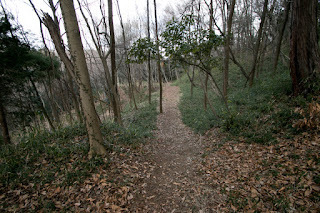 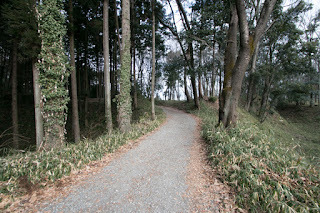 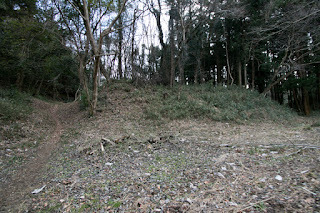 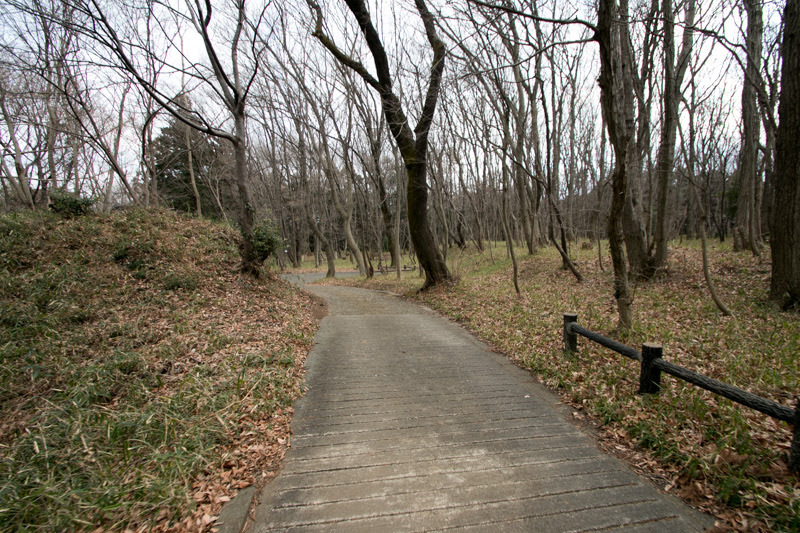 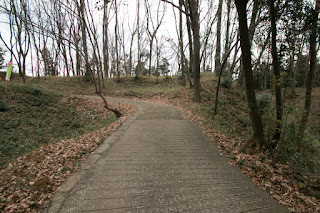 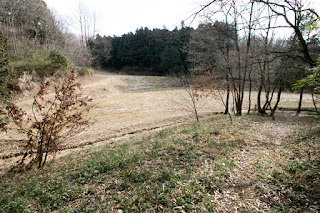 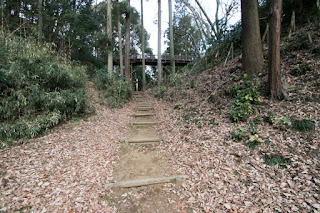 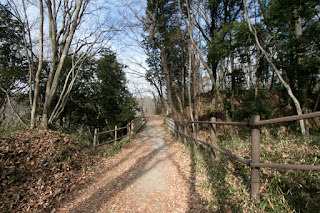 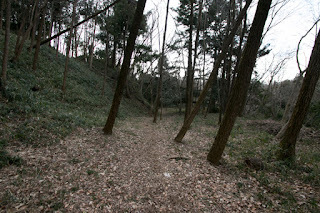 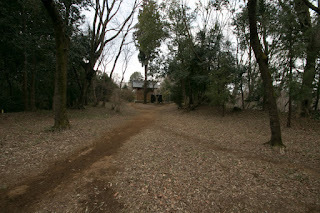 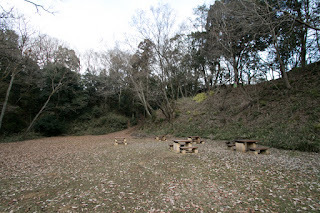 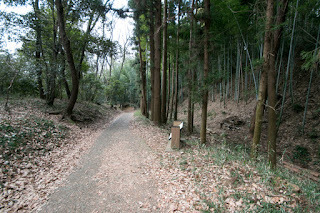 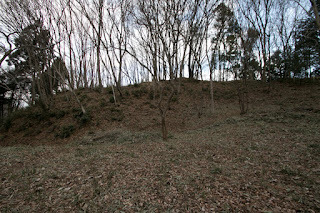 After the abolish Takiyama castle had not used as a castle any more. 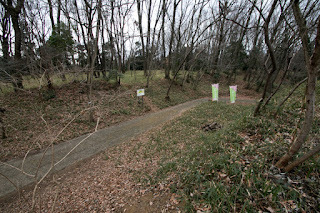 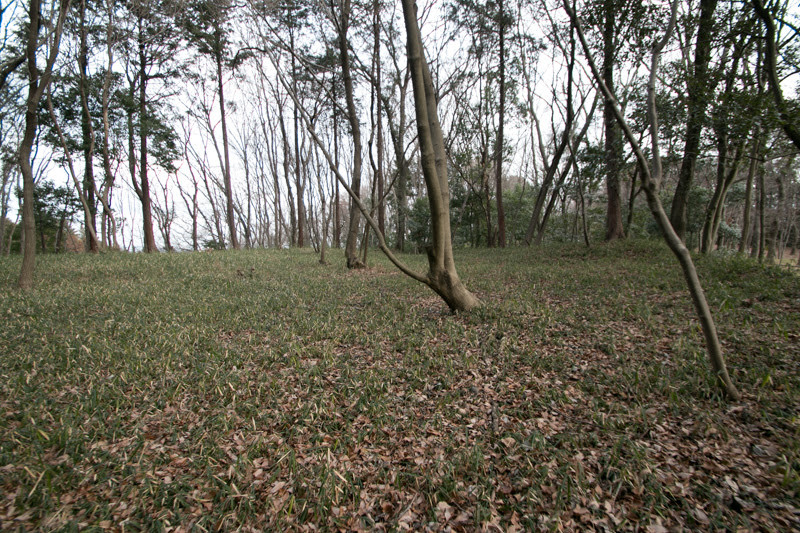 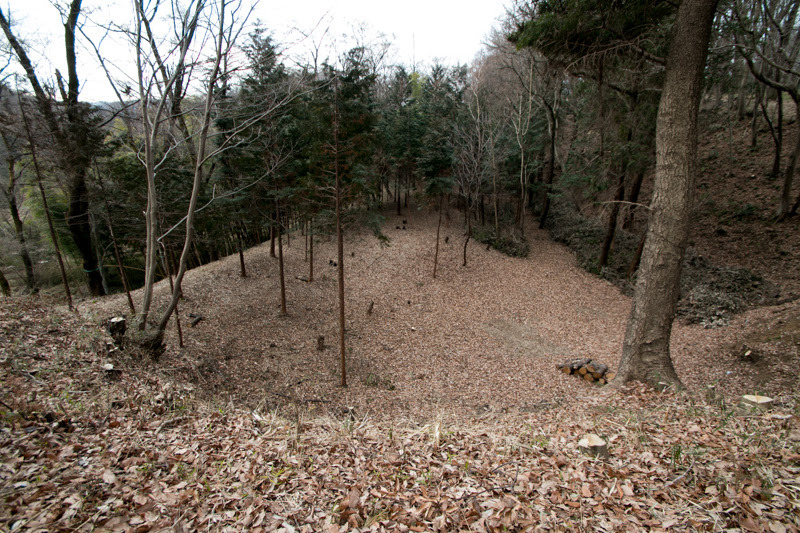 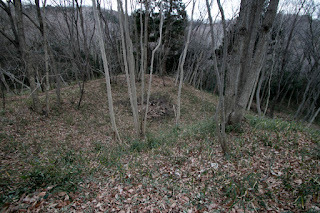 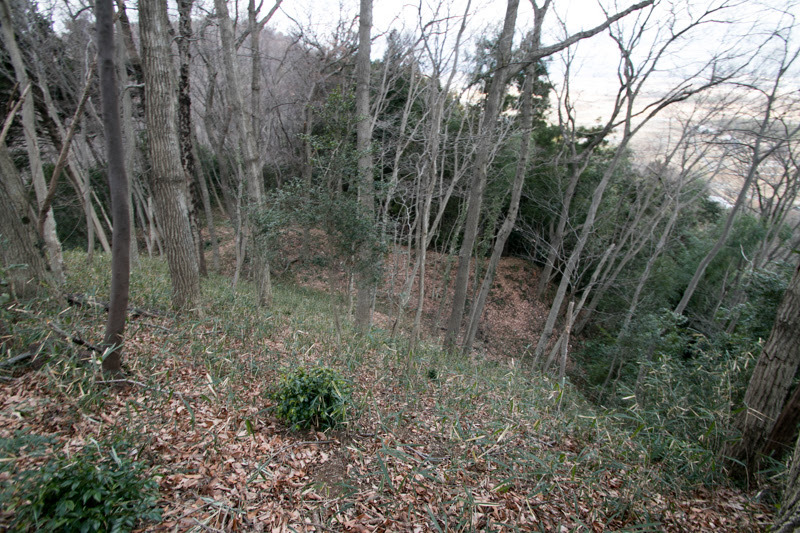 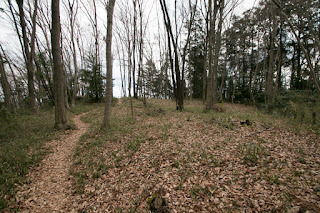 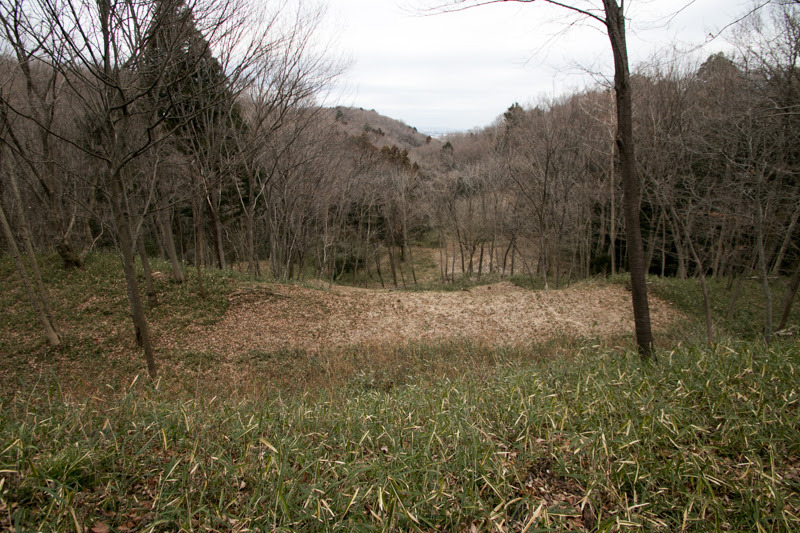 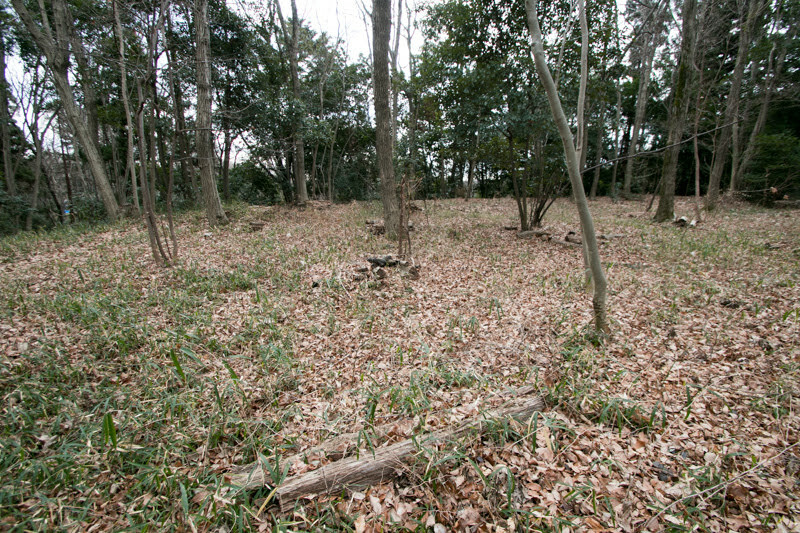 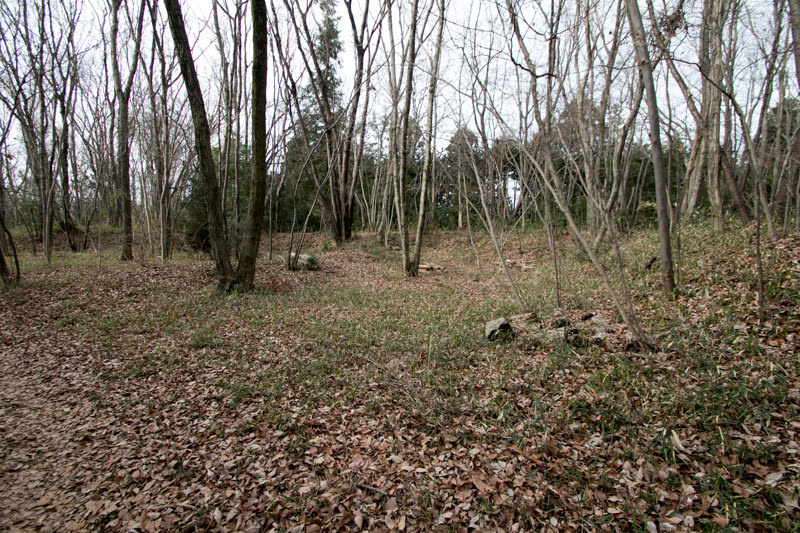 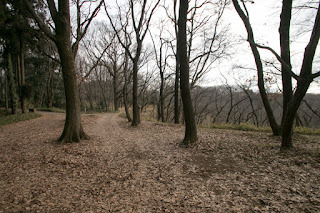 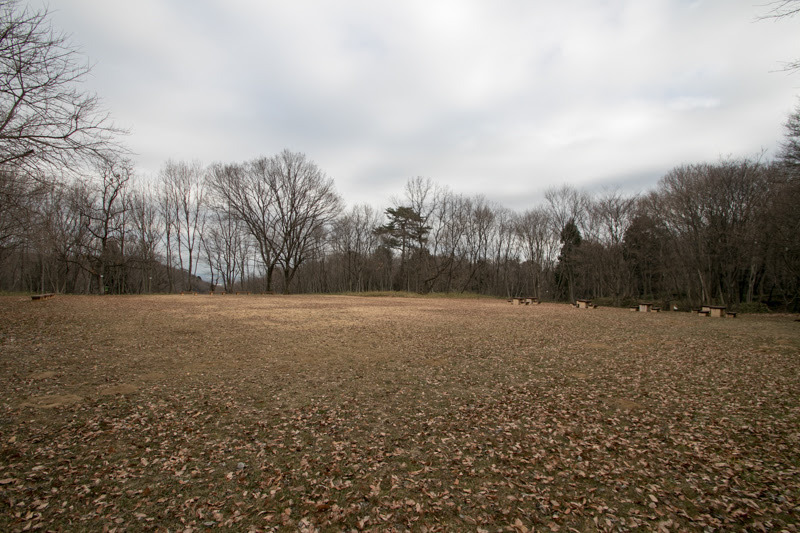 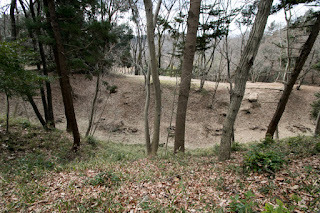 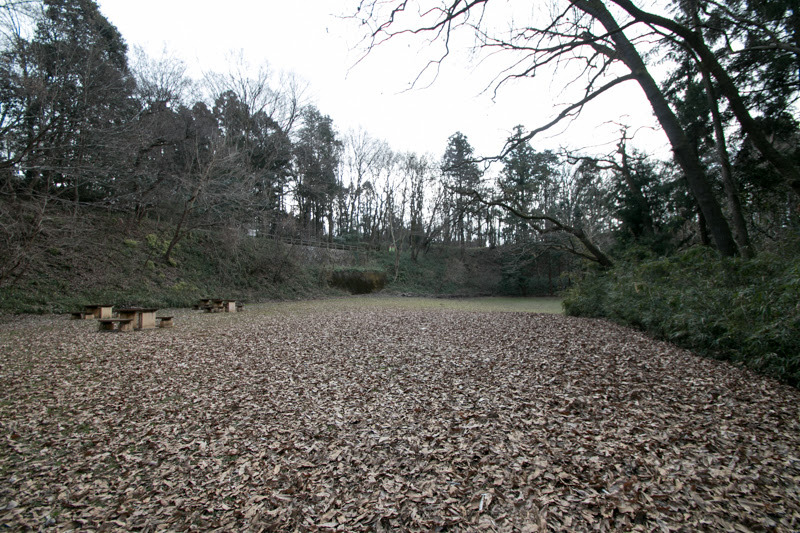 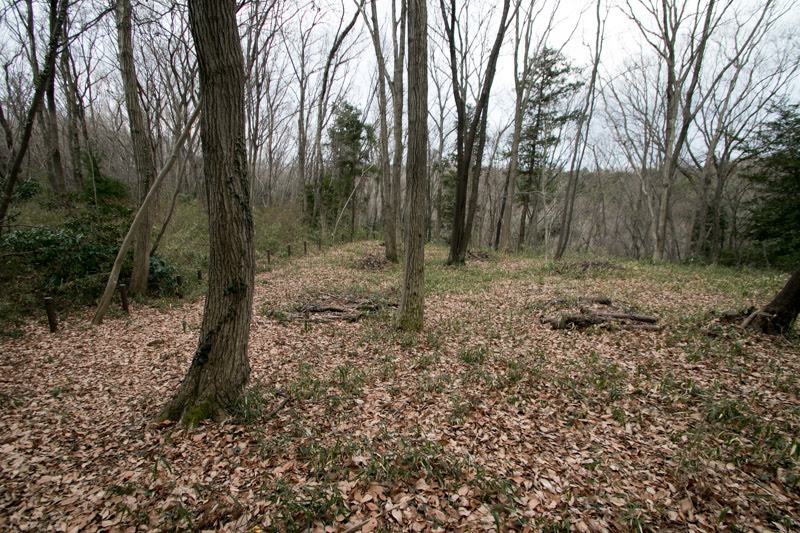 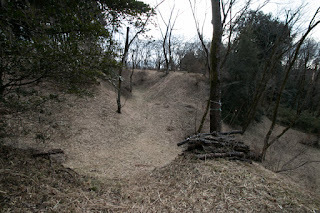 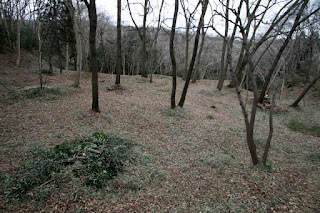 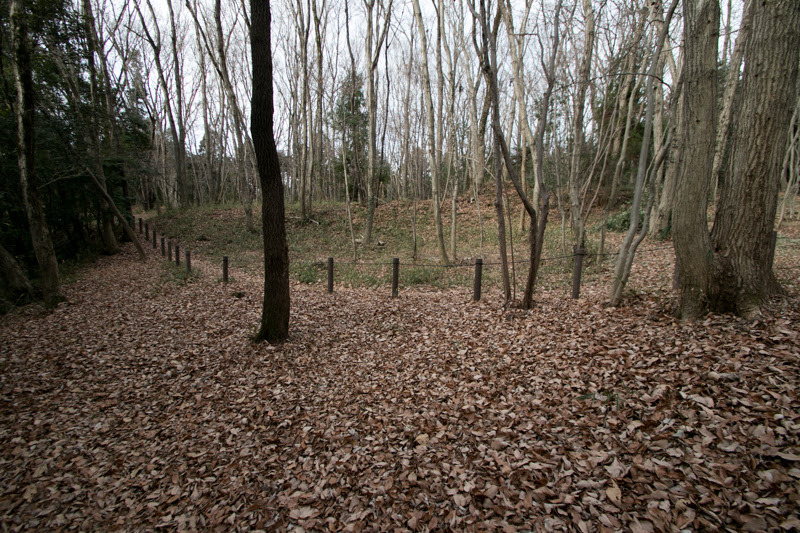 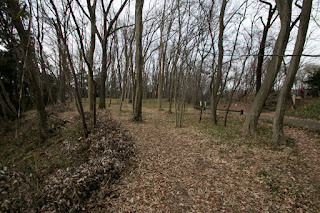 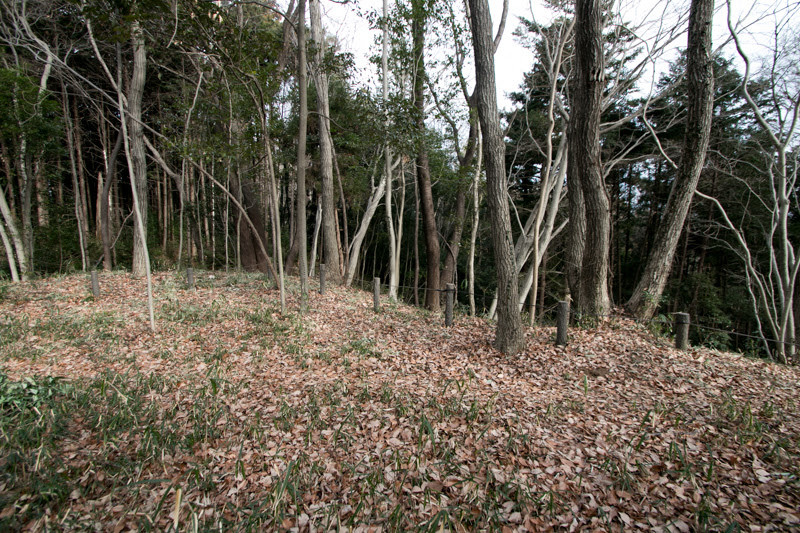 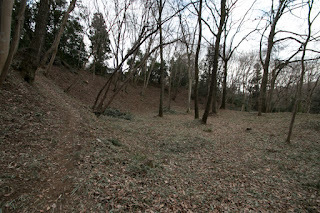 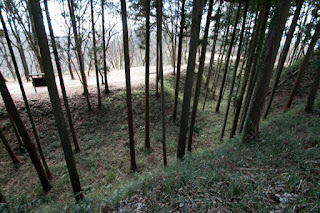 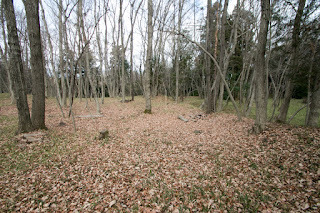 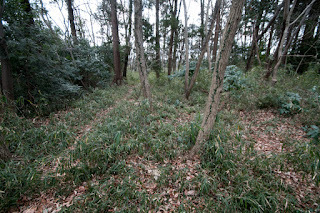 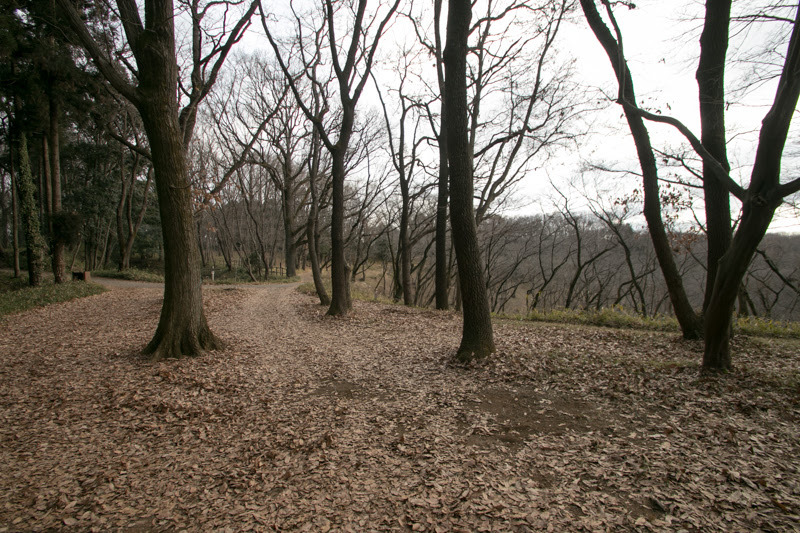 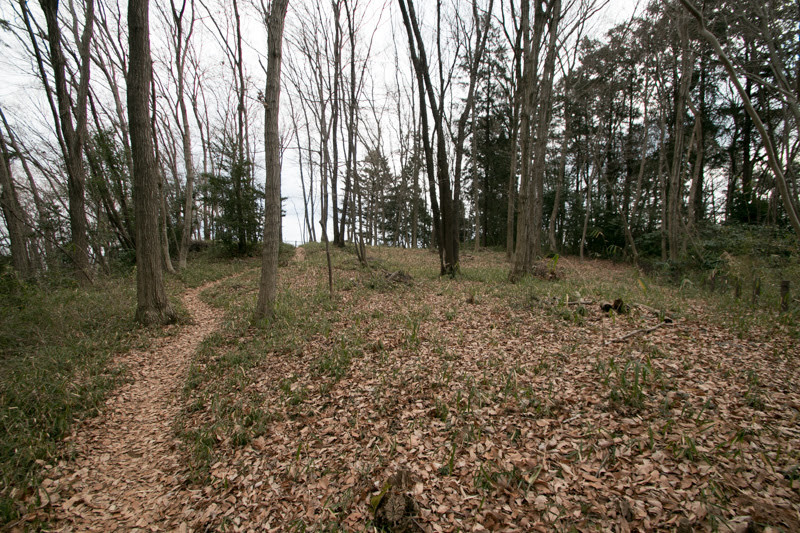 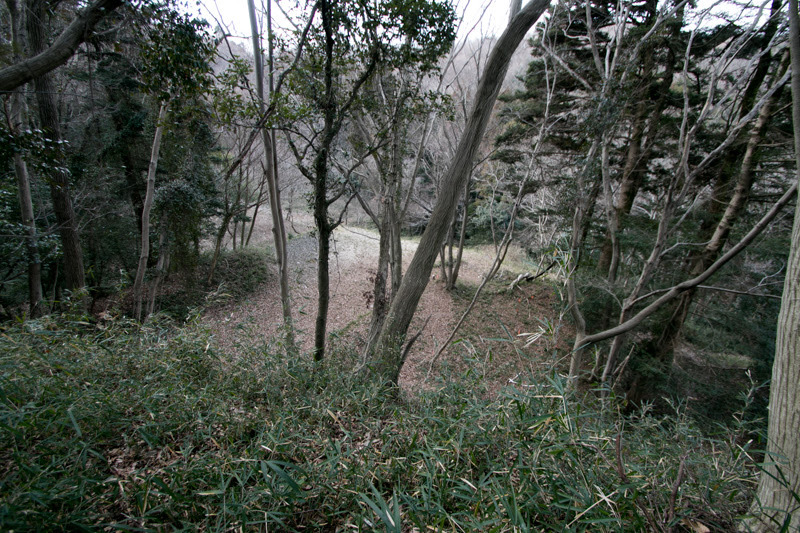 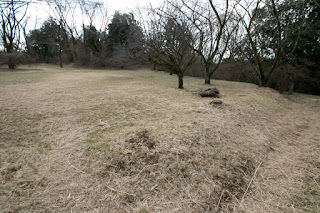 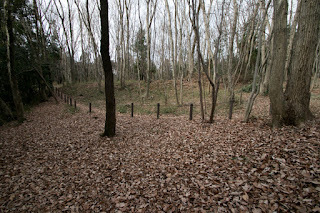 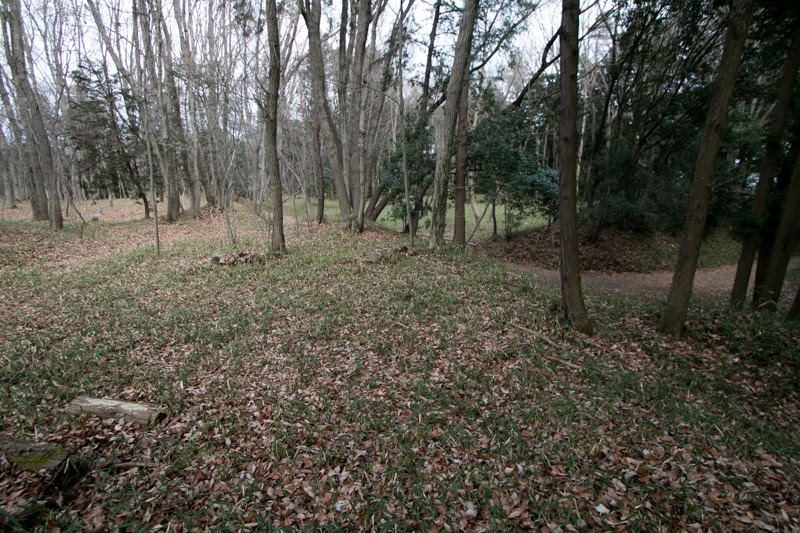 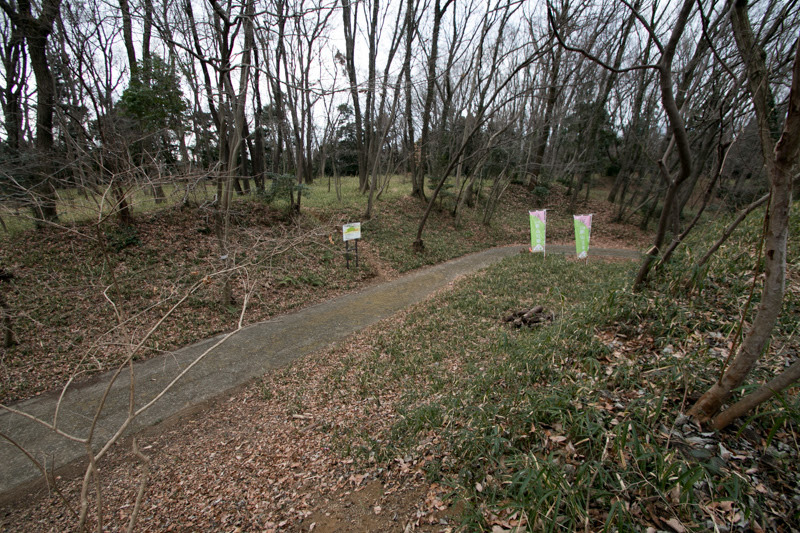 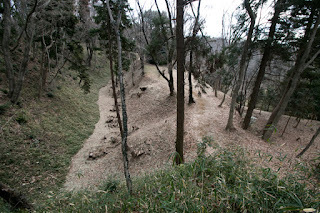 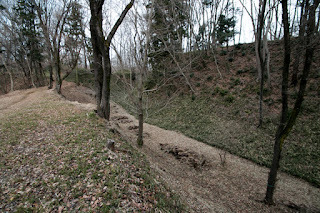 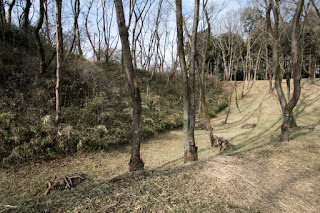 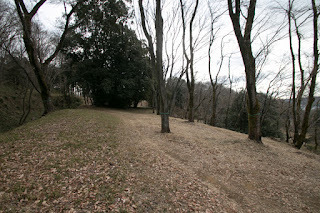 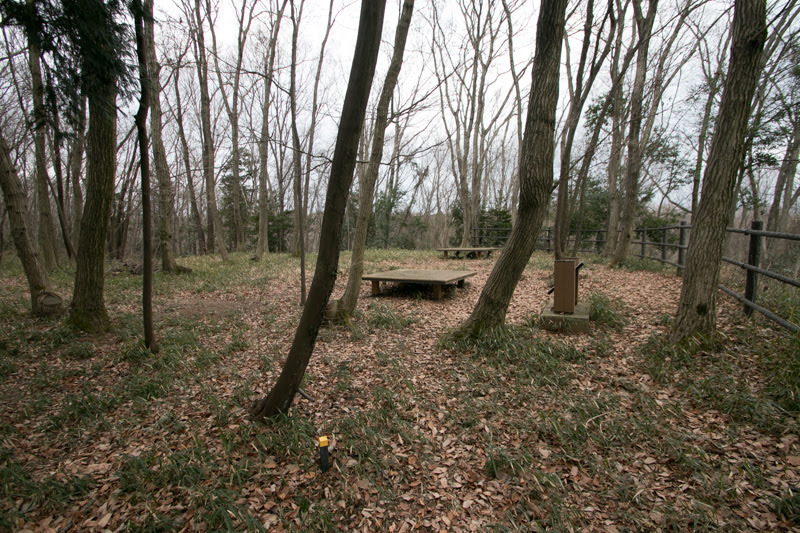 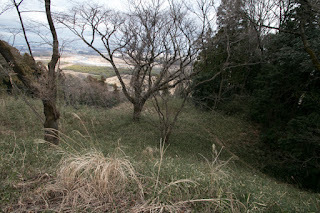 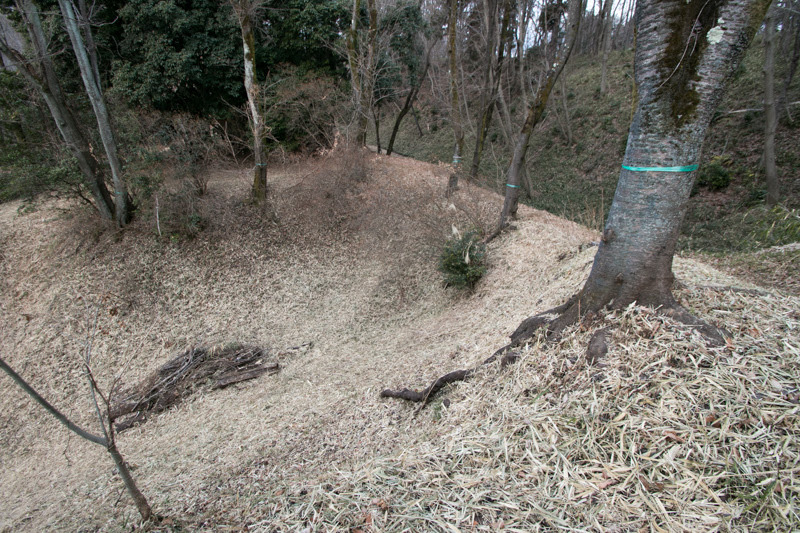 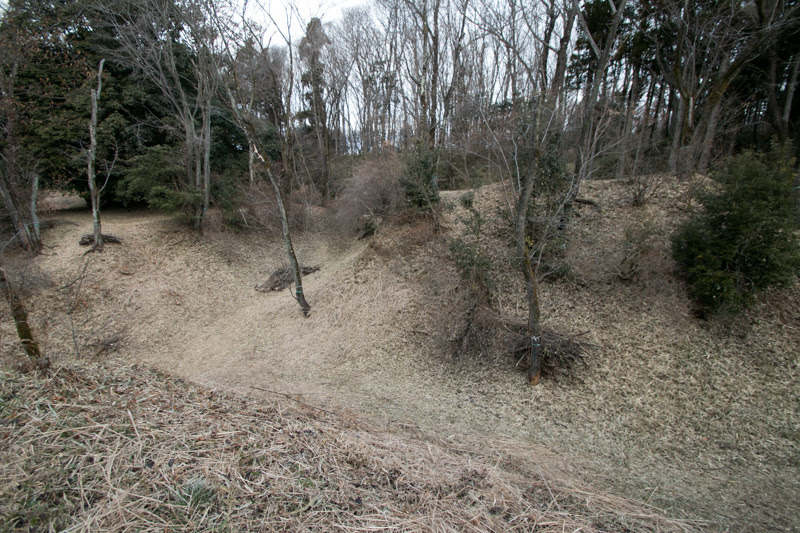 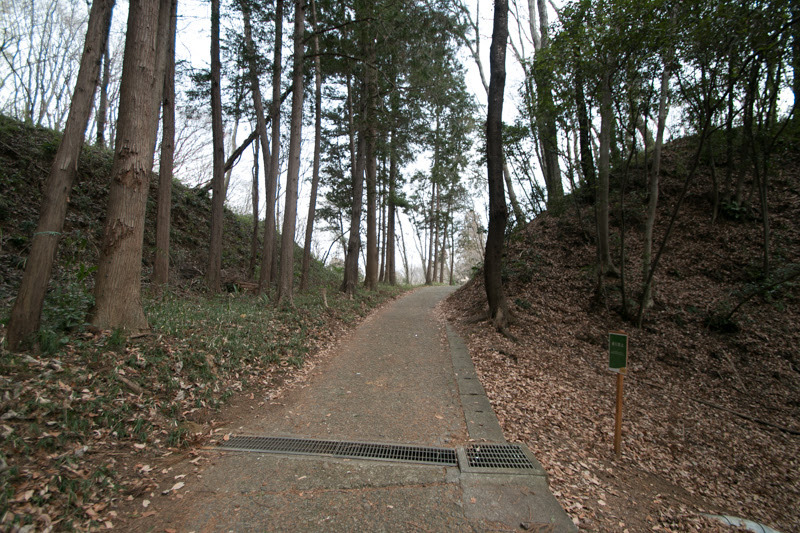 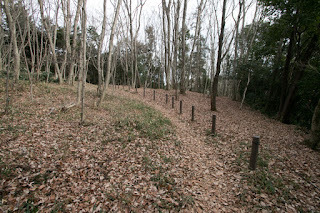 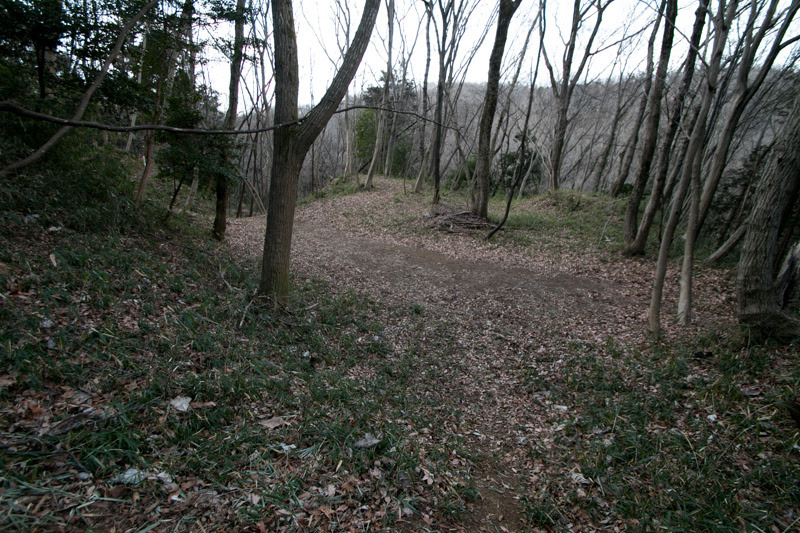 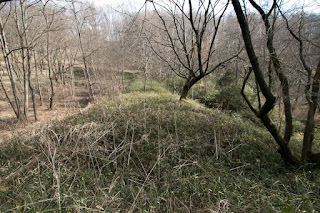 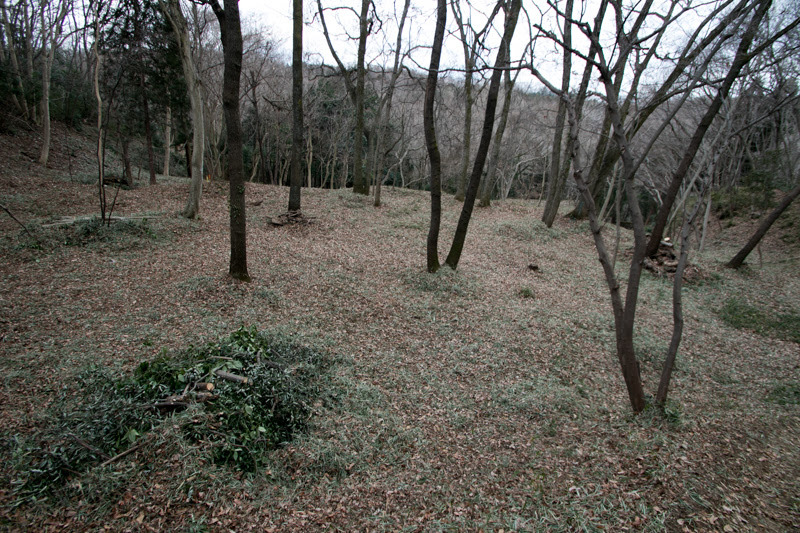 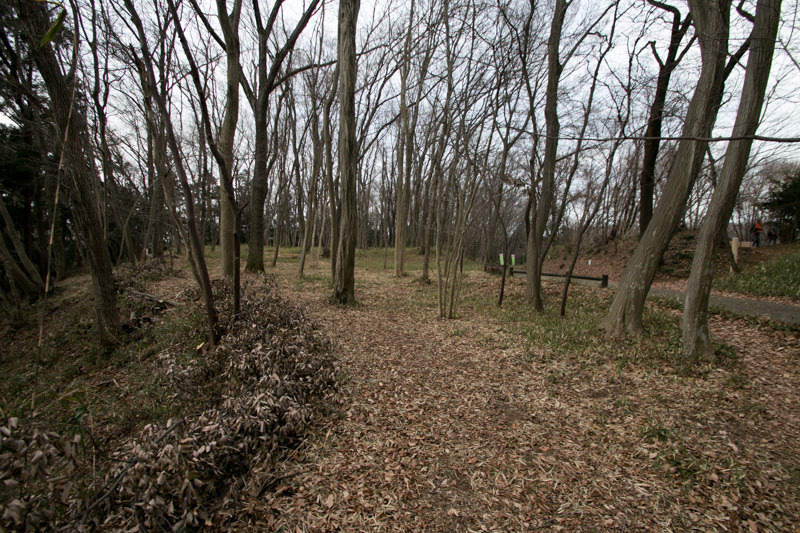 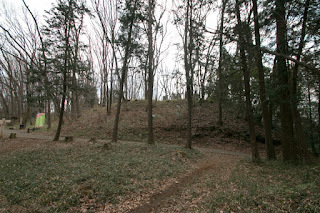 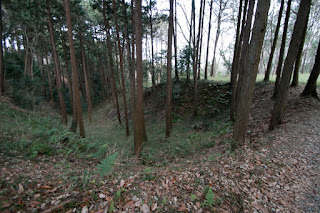 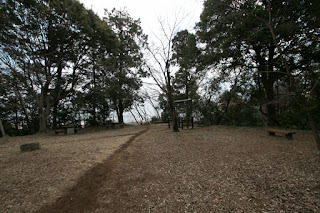 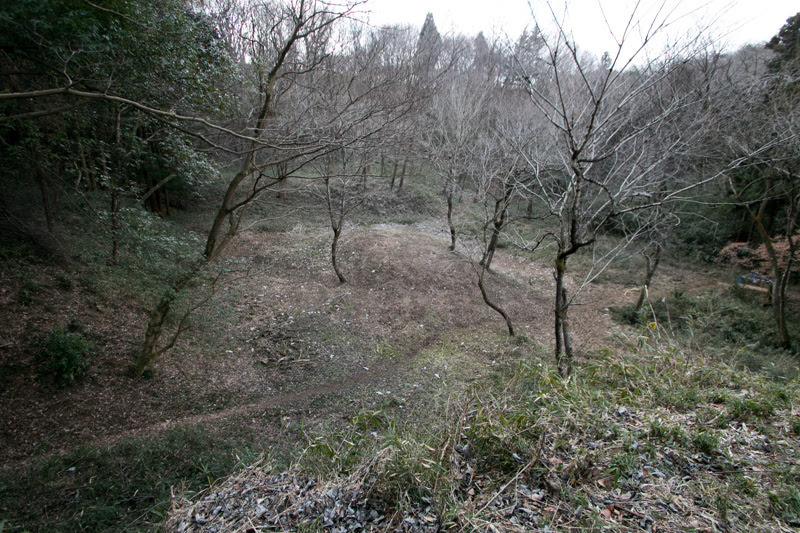 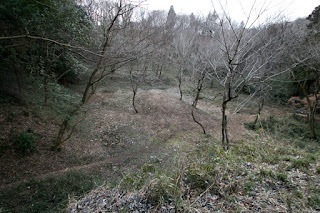 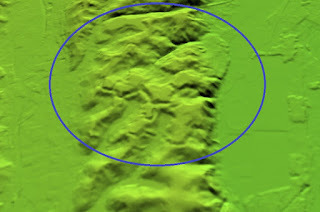 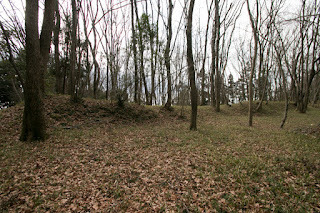 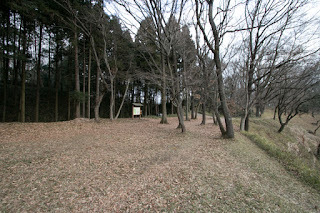 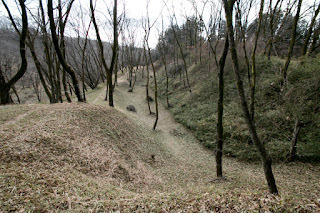 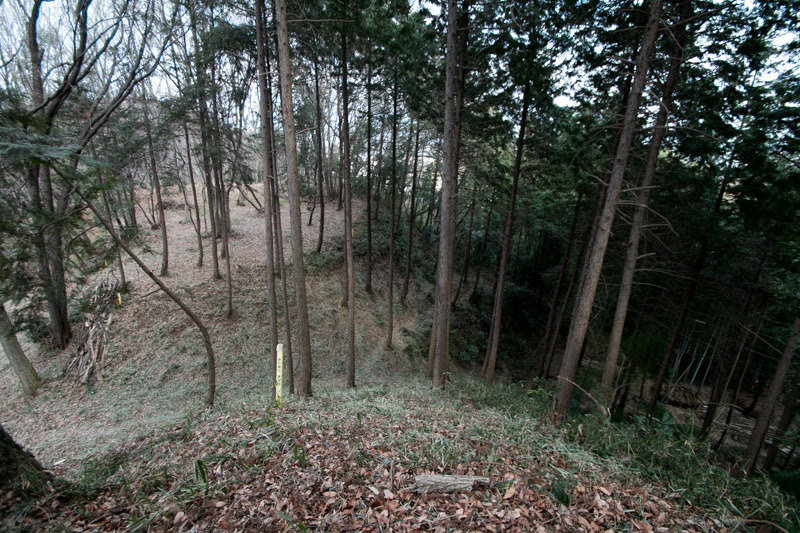 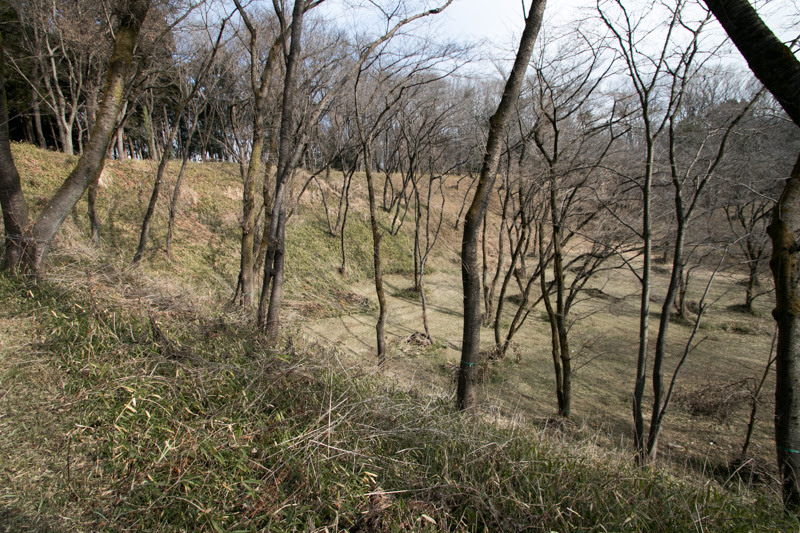 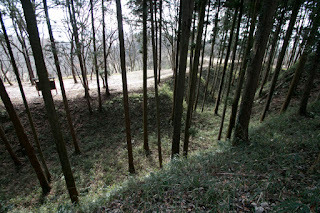 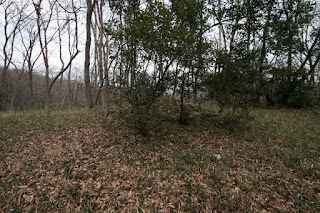 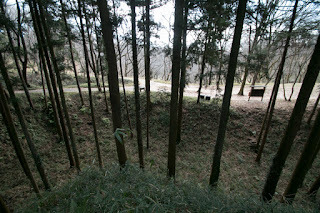 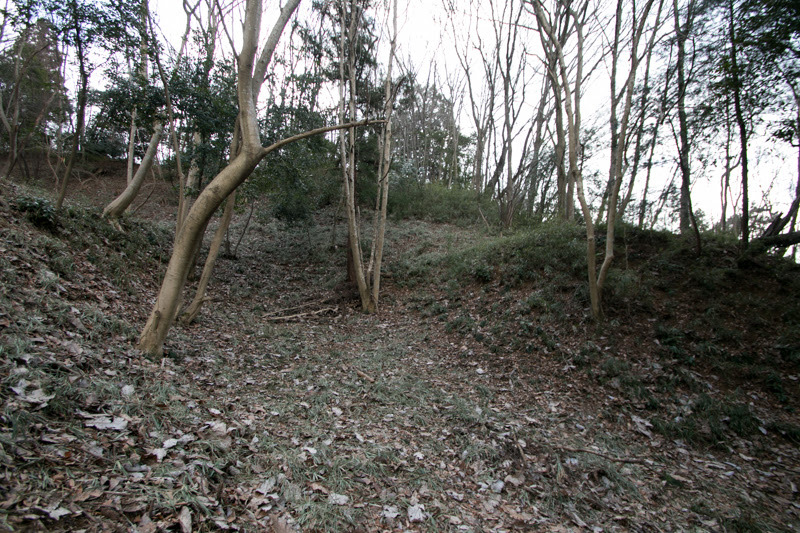 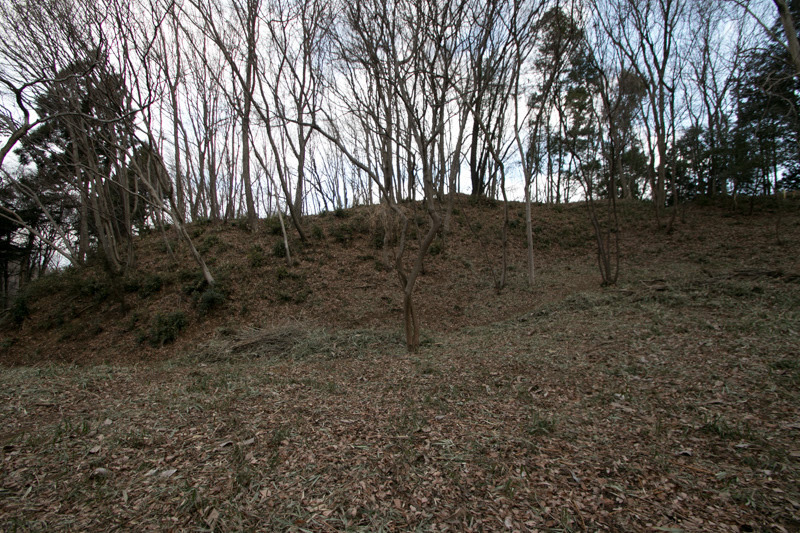 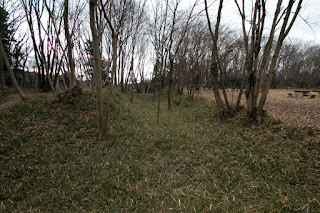 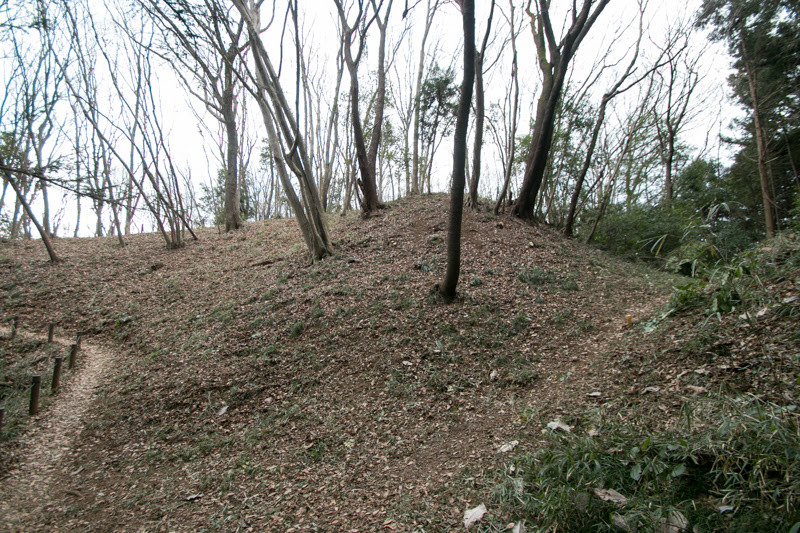 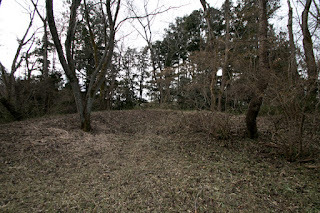 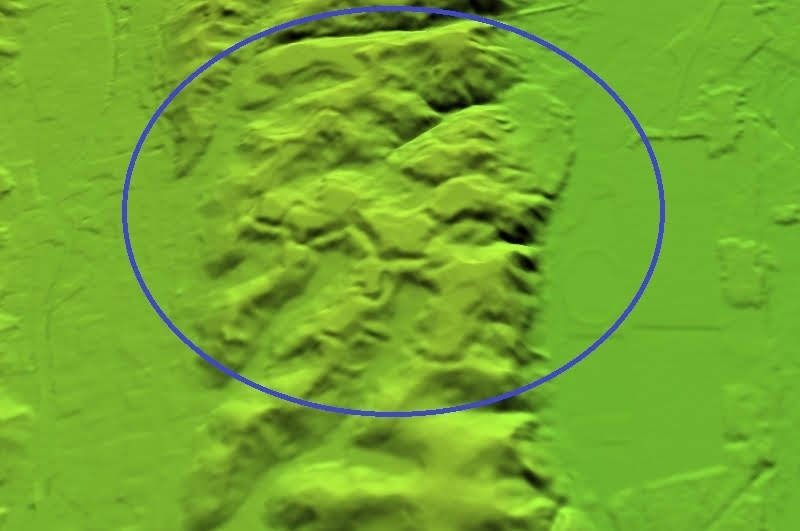 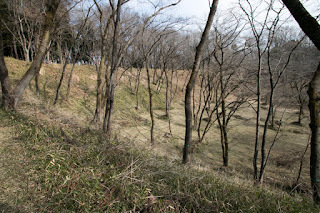 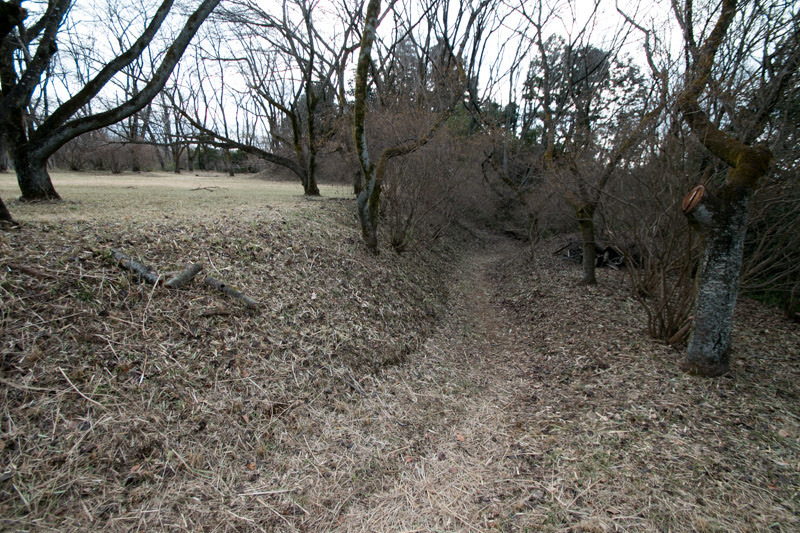 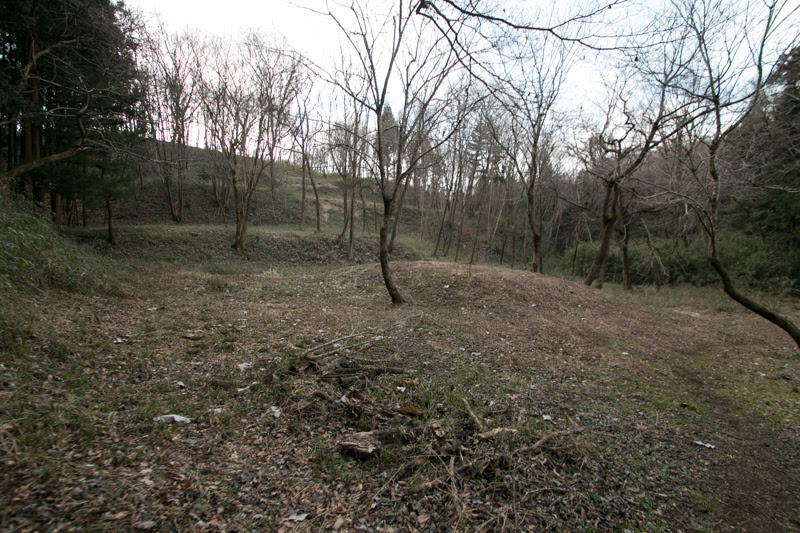 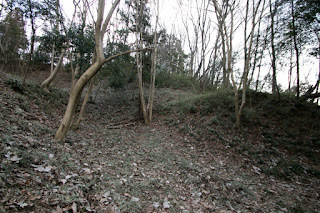 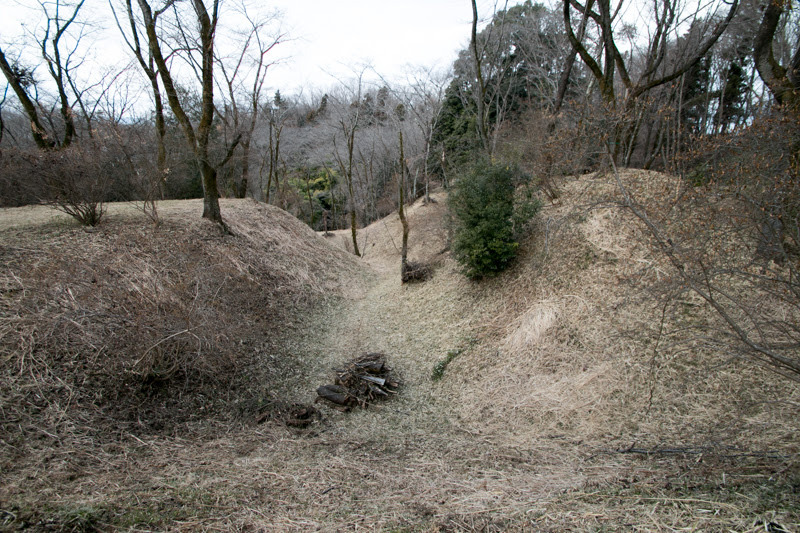 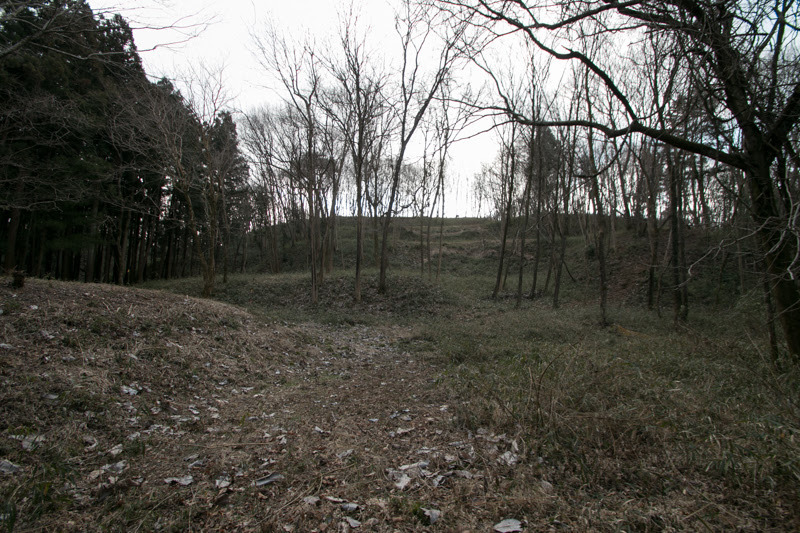 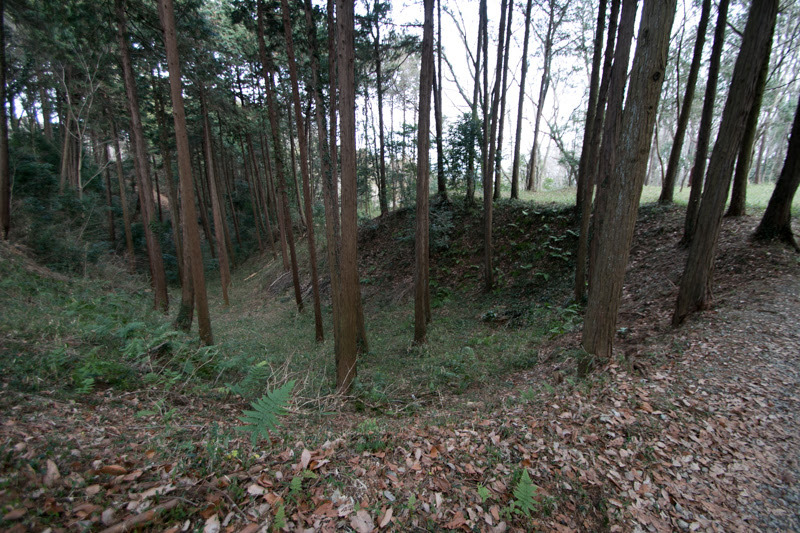 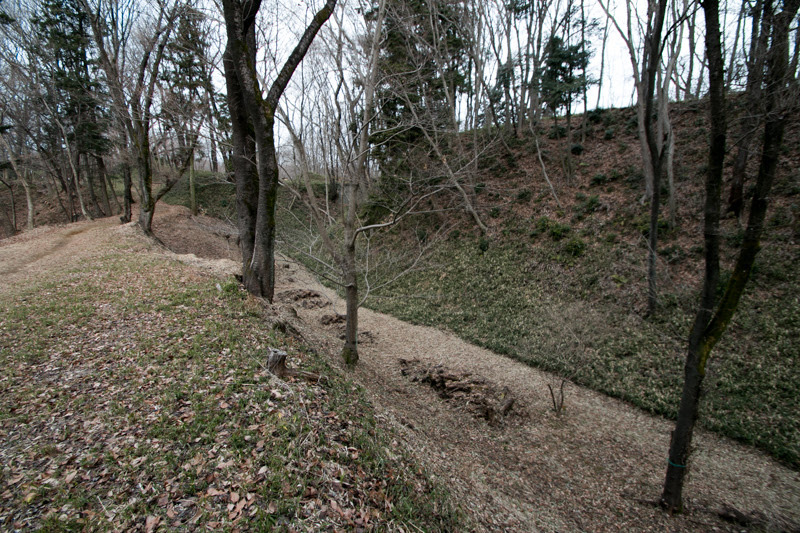 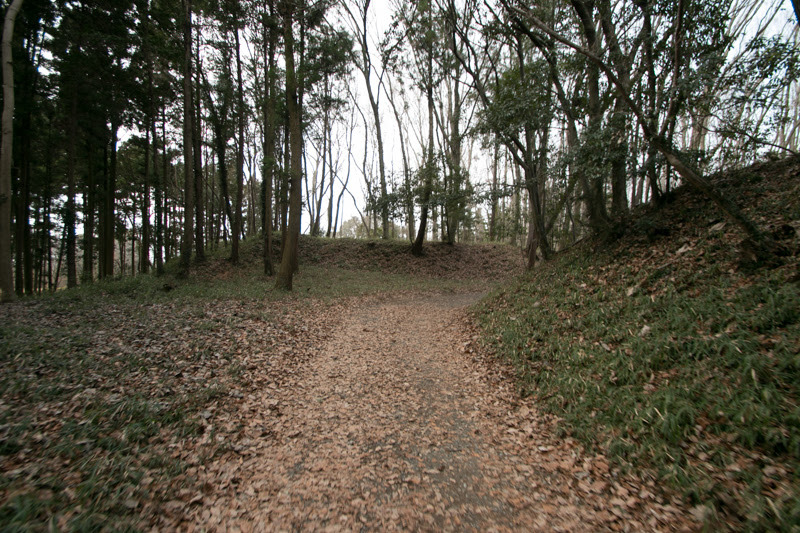 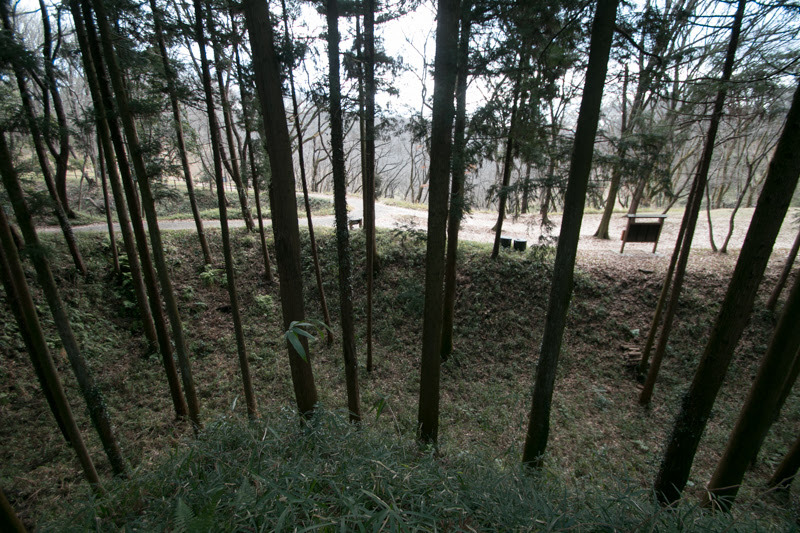 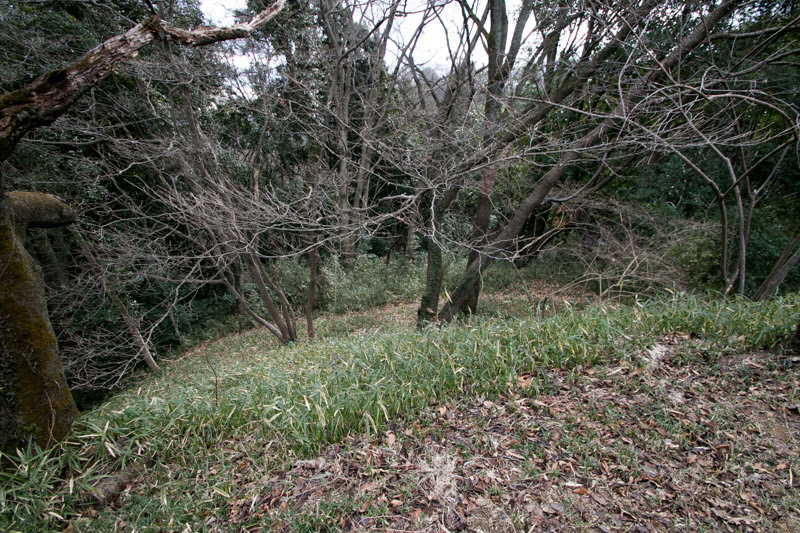 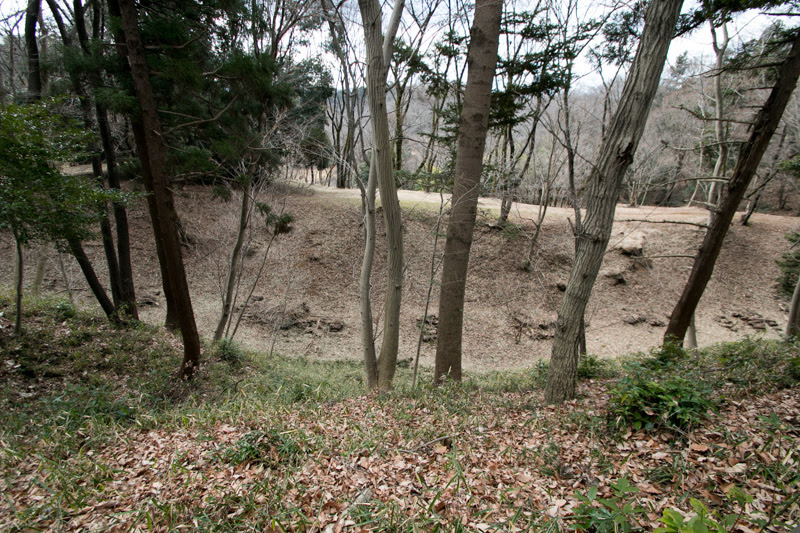 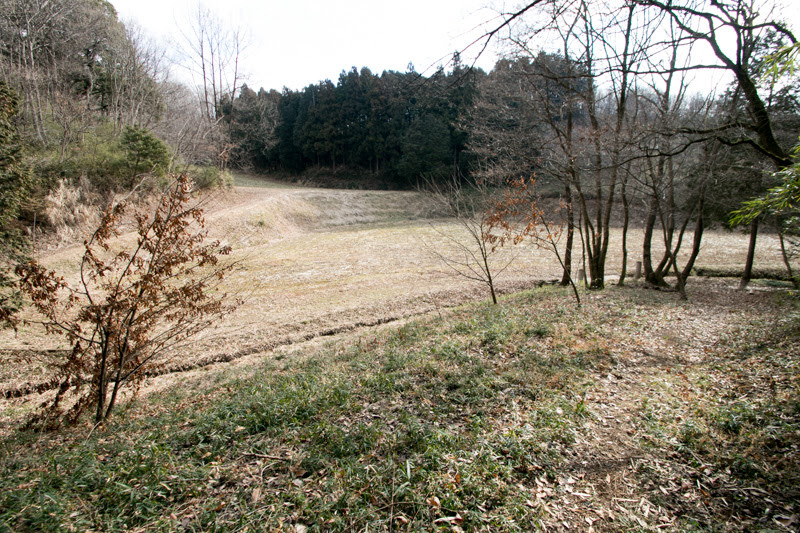 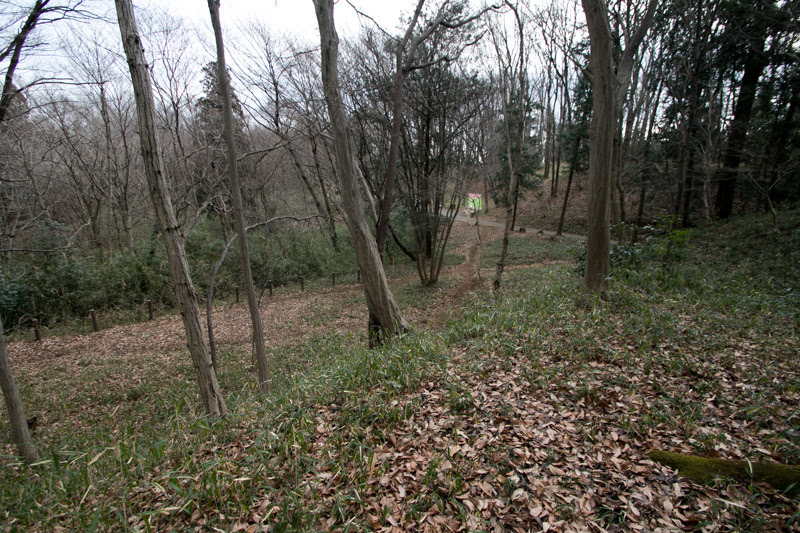 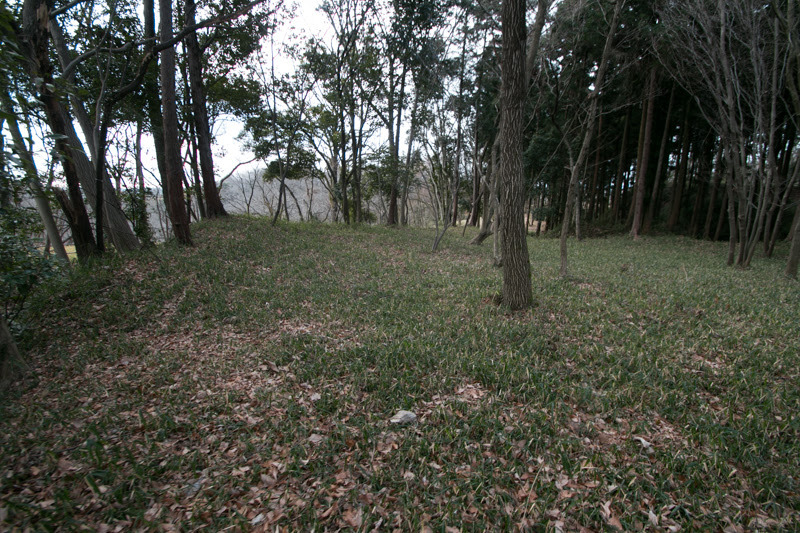 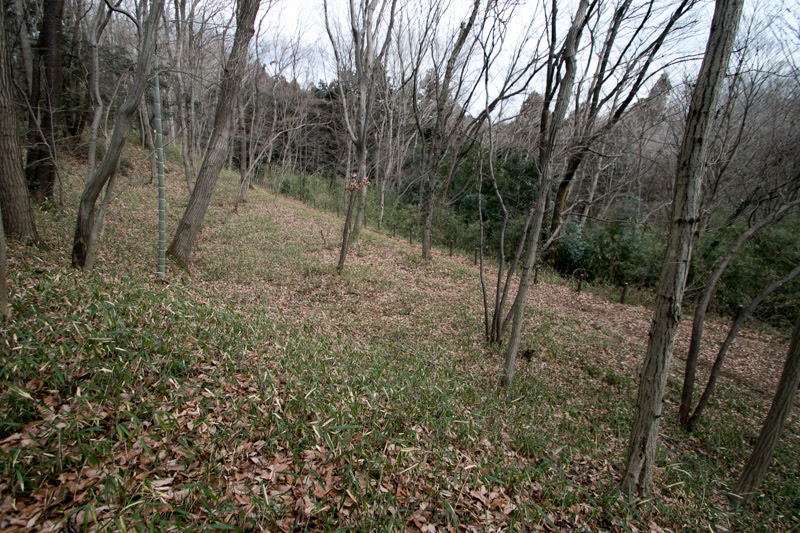 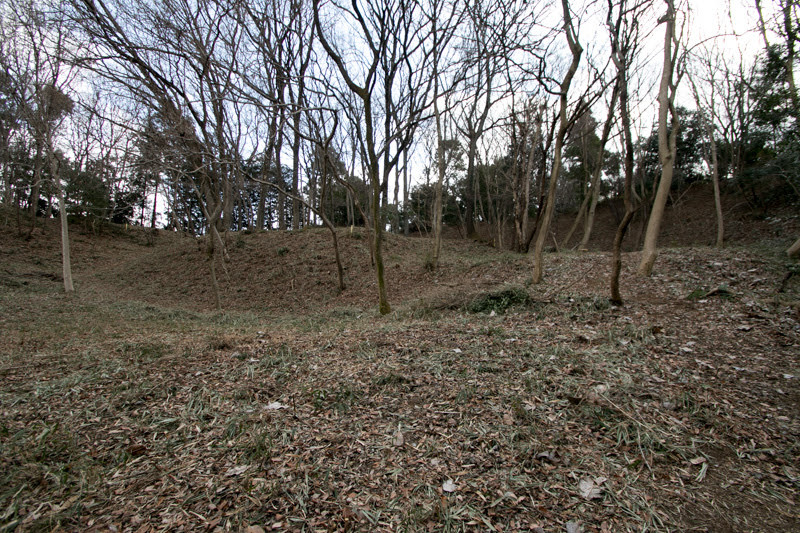 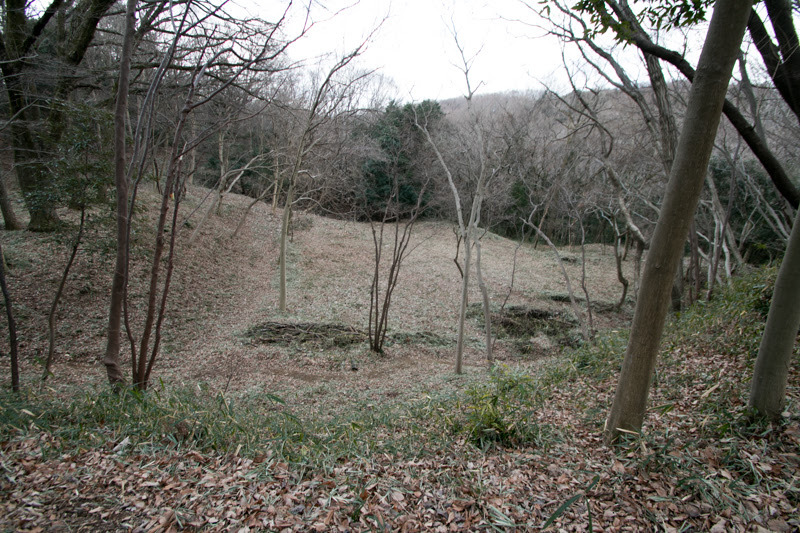 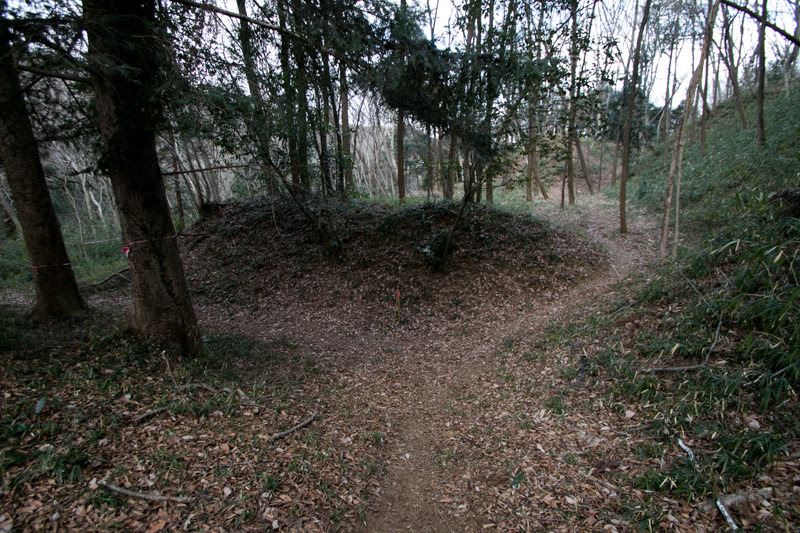 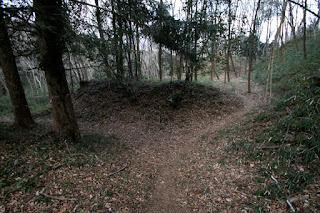 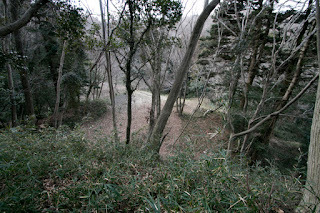 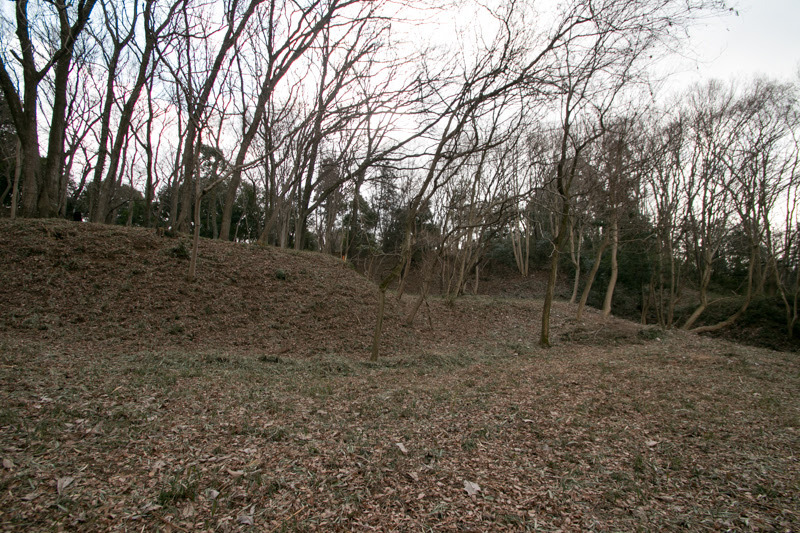 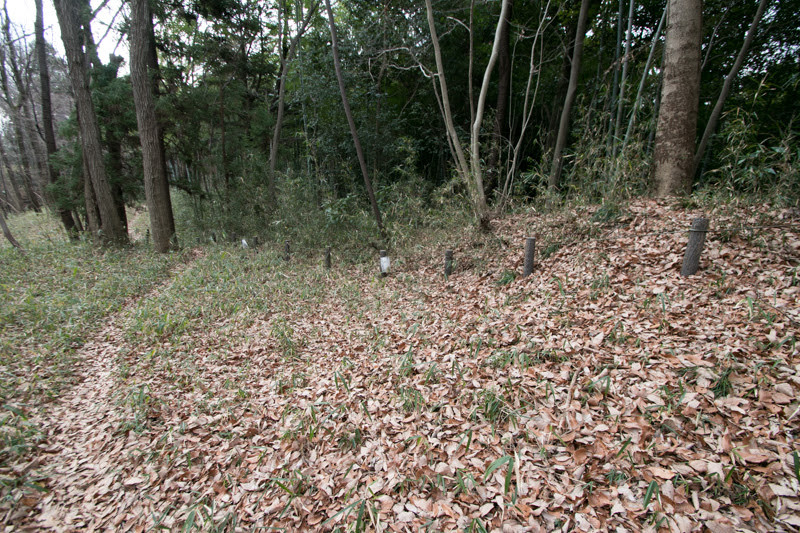 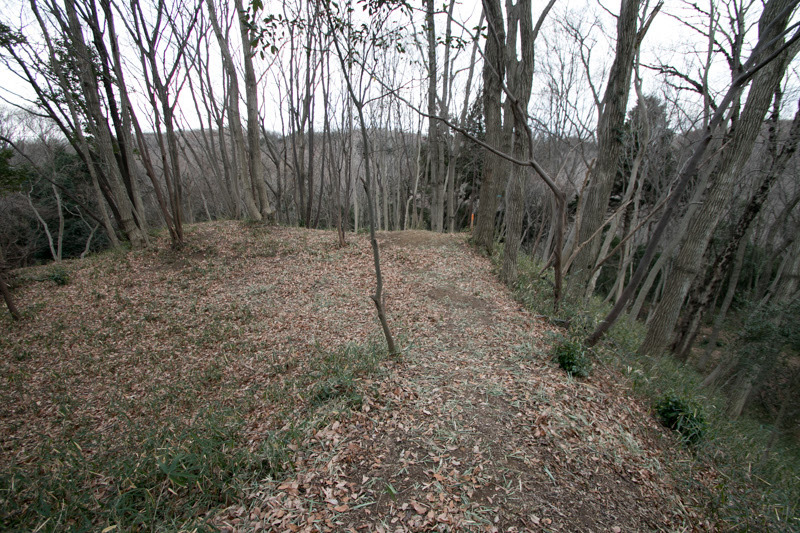 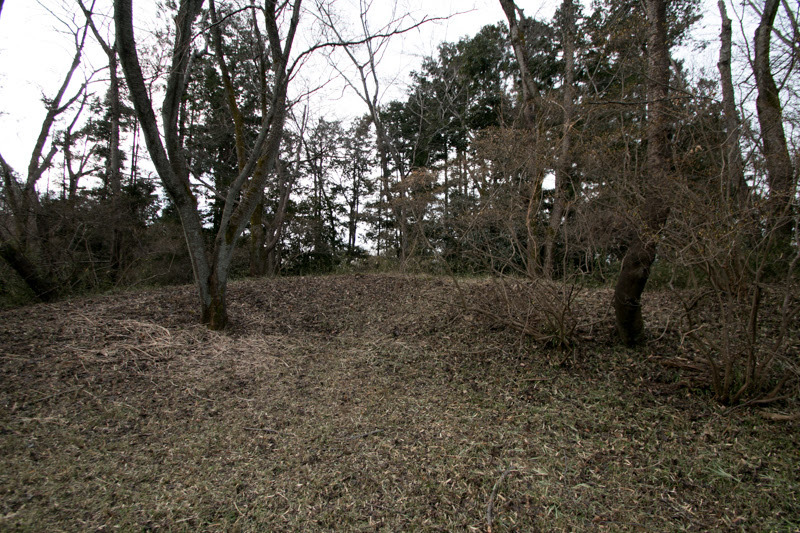 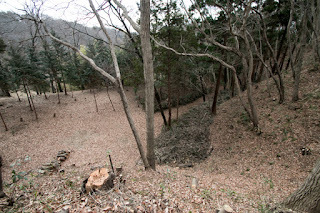 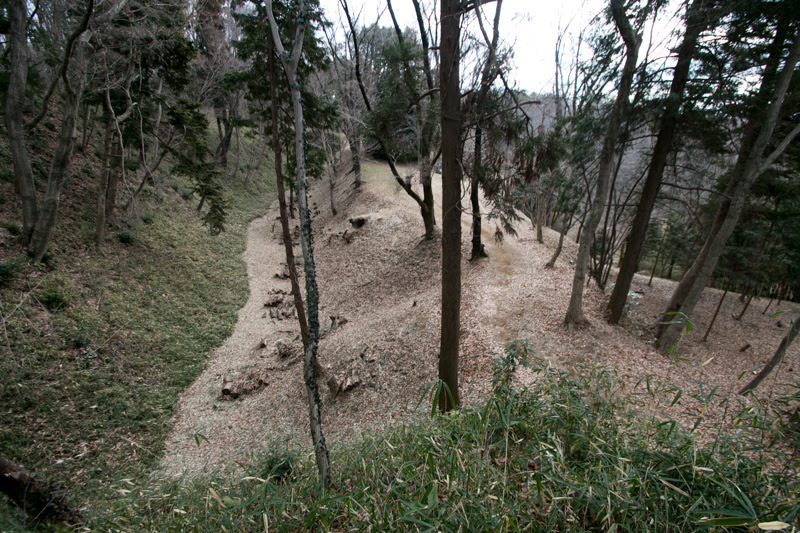 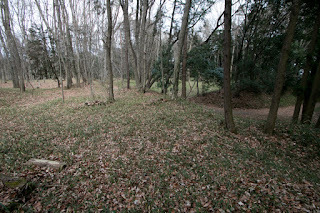 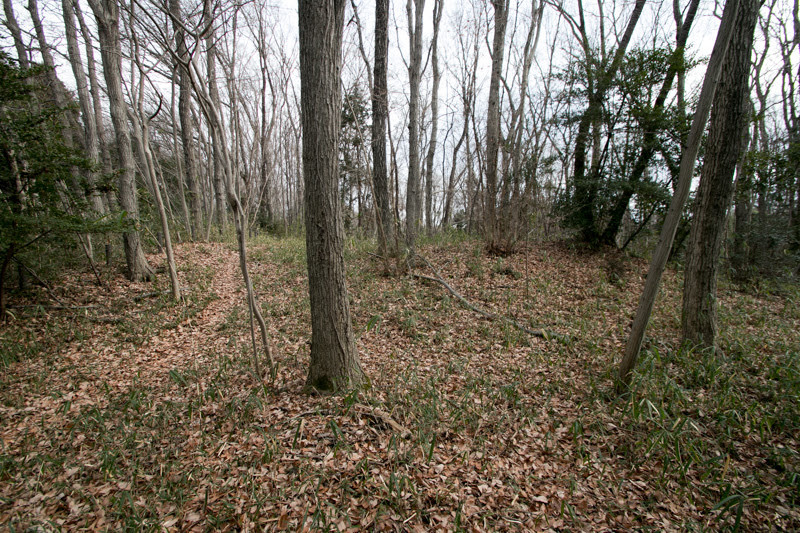 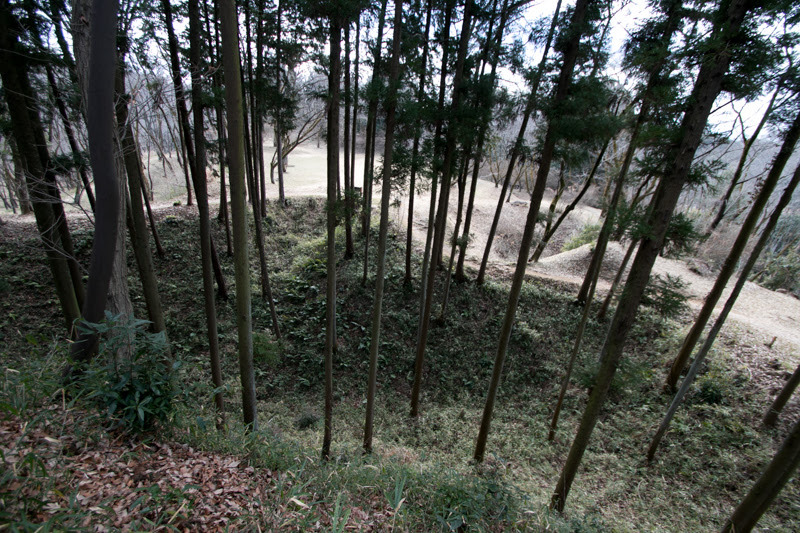 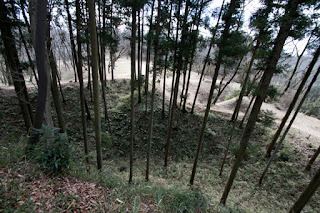 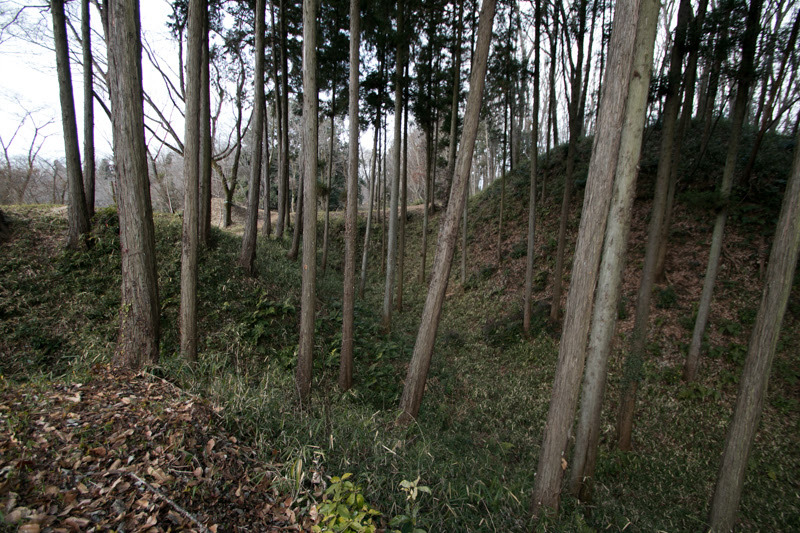 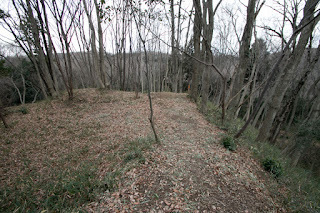 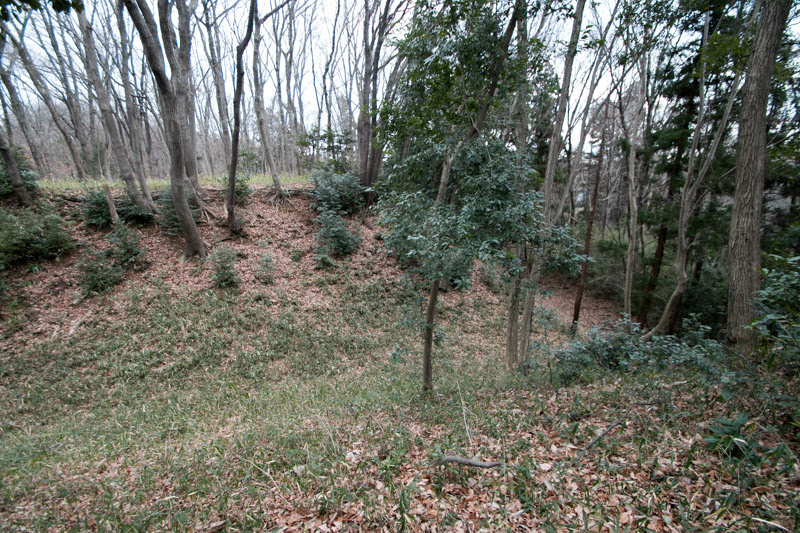 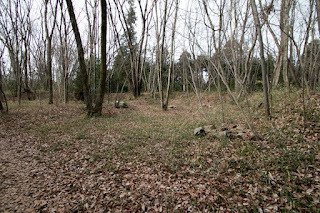 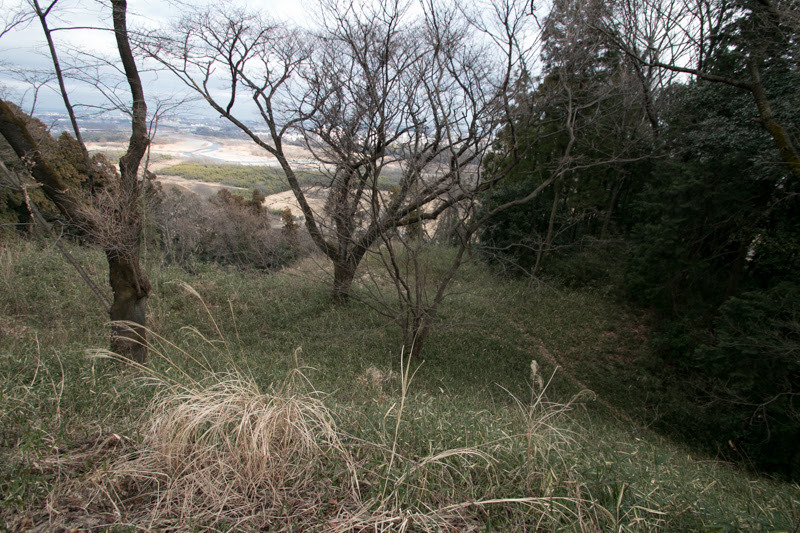 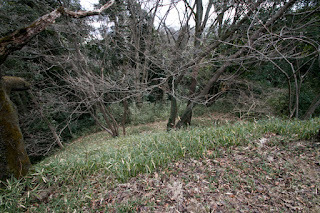 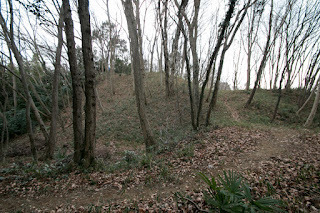 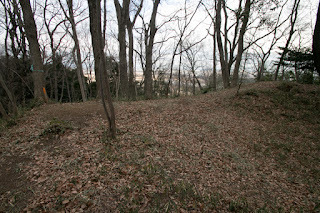 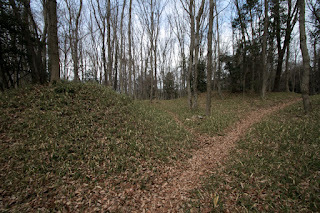 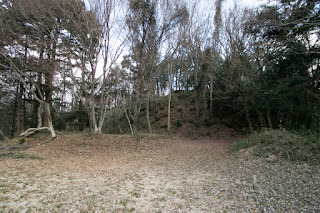 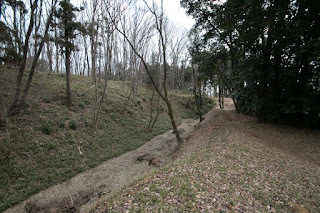 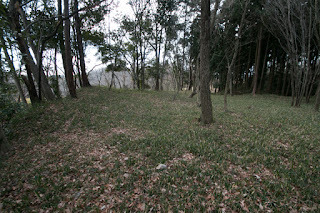 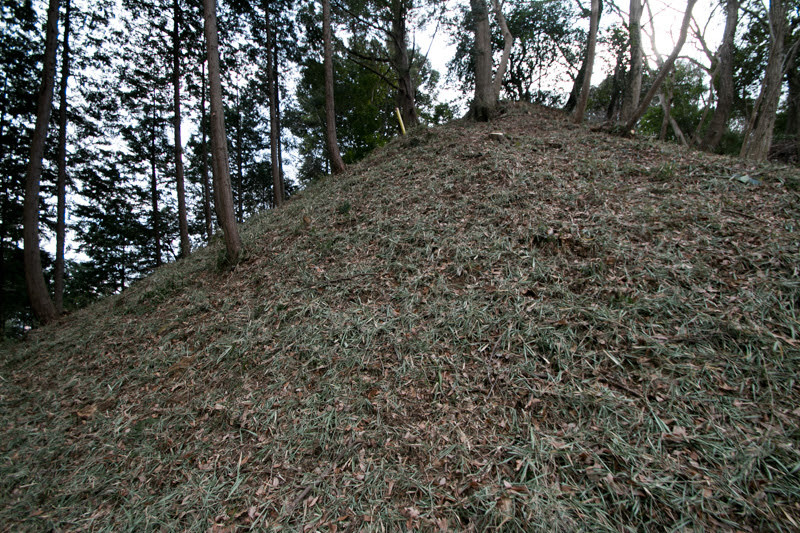 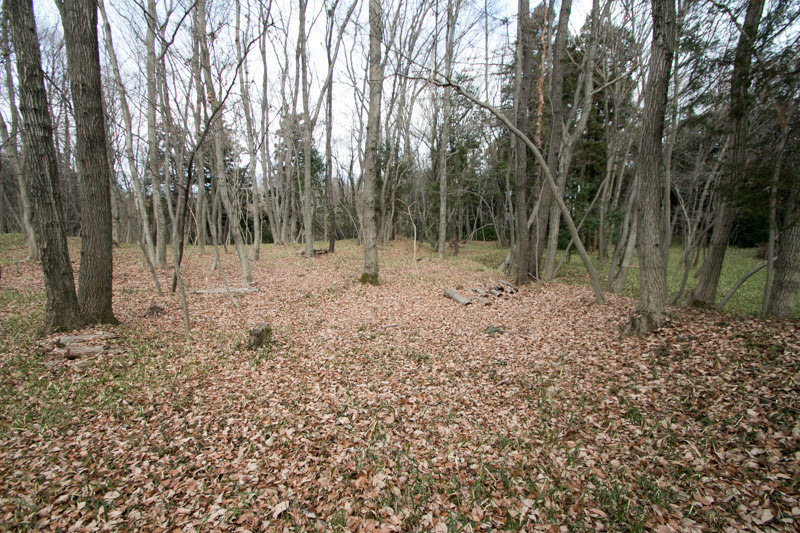 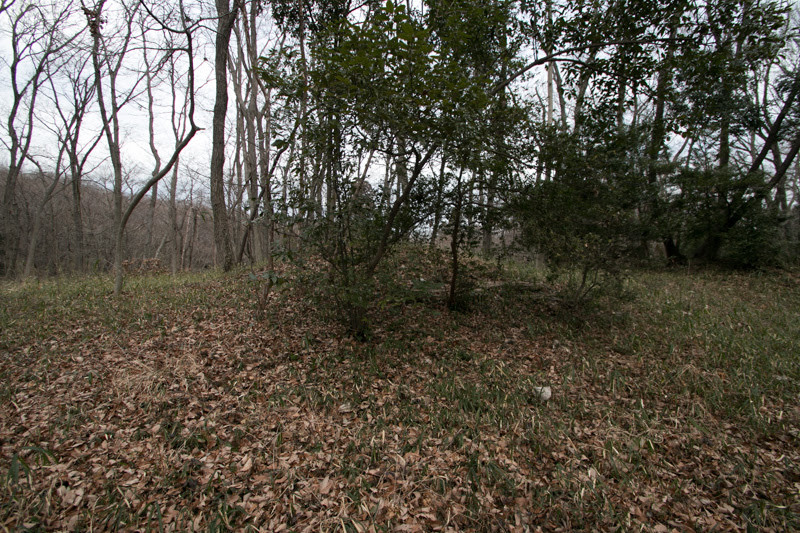 Now the site of the castle became a park, and technically built defense facilities of the castle well remains in the nature of the hill, which is clearly seen in winter without bushes. 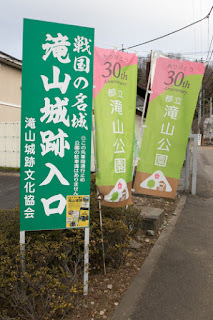 10 minutes from Takiyama Jyoshi Shita bus stop of Nishi-Tokyo bus starts JR East Hachioji station. There is no parking around the castle.